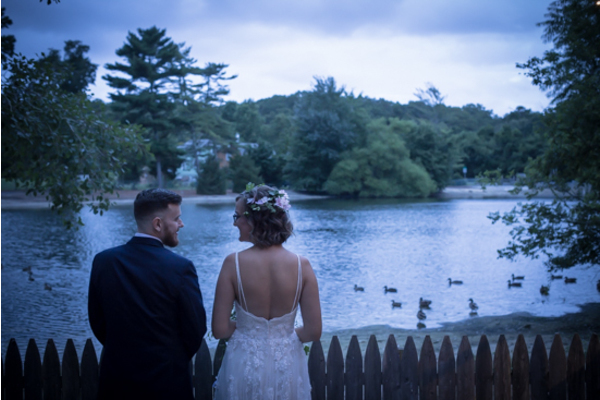 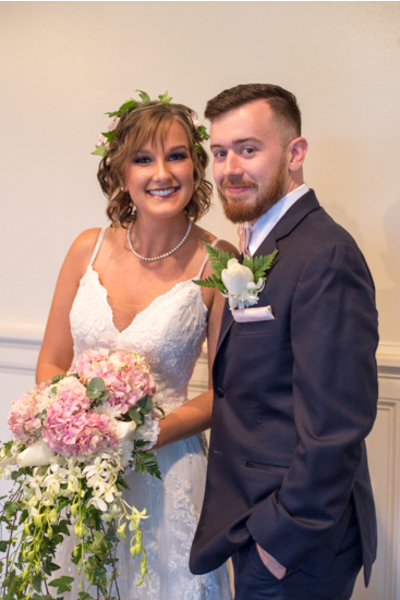 Congratulations to the happily newly married couple, Danielle and Josh, on their dream wedding! 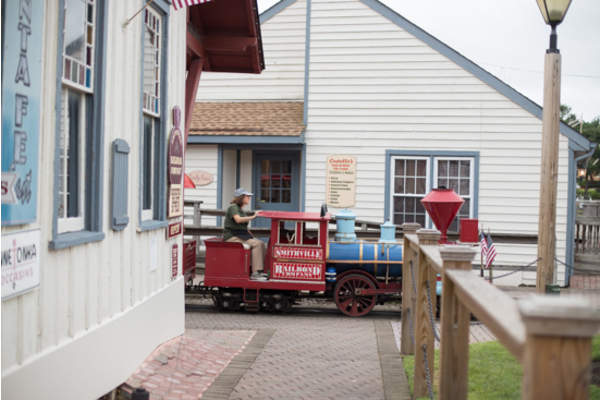 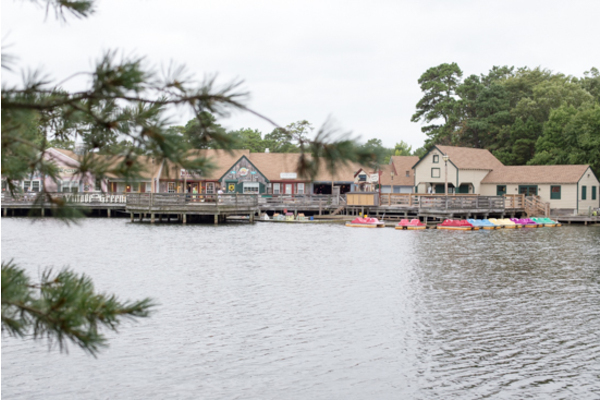 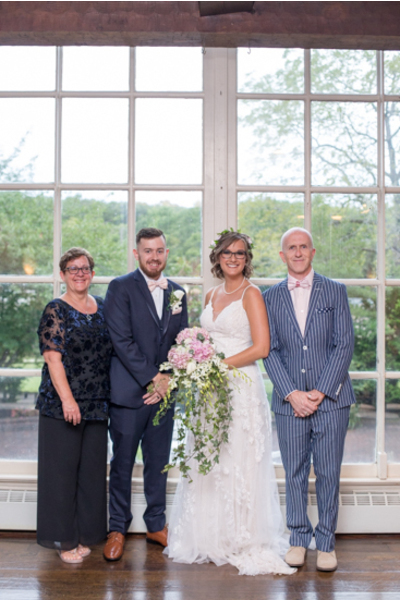 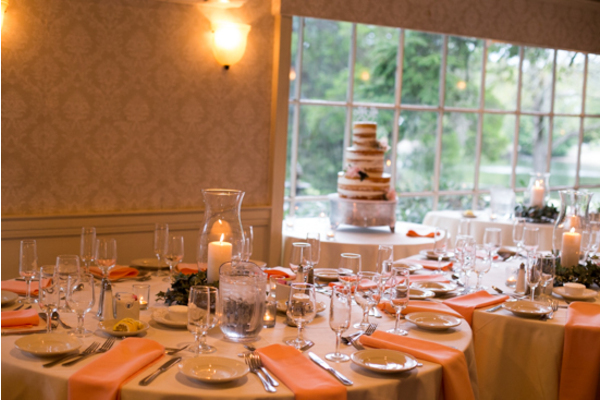 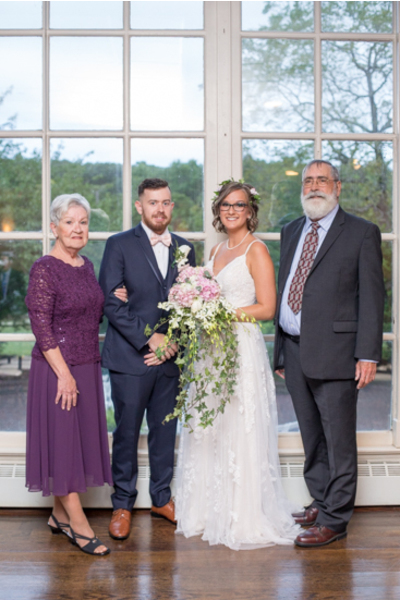 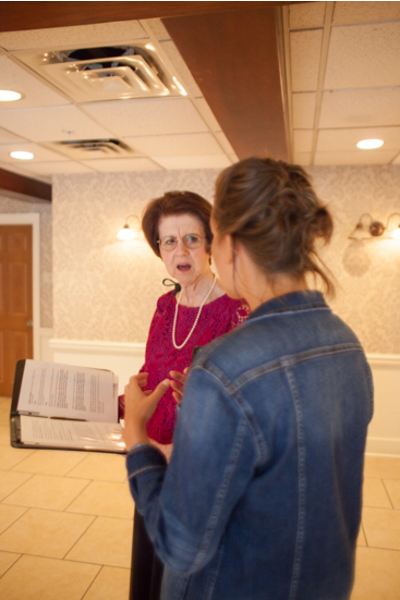 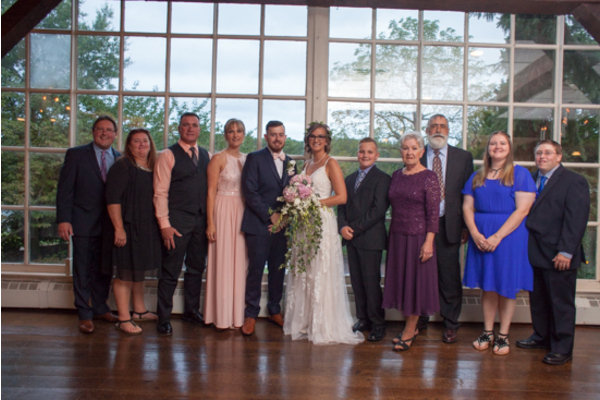 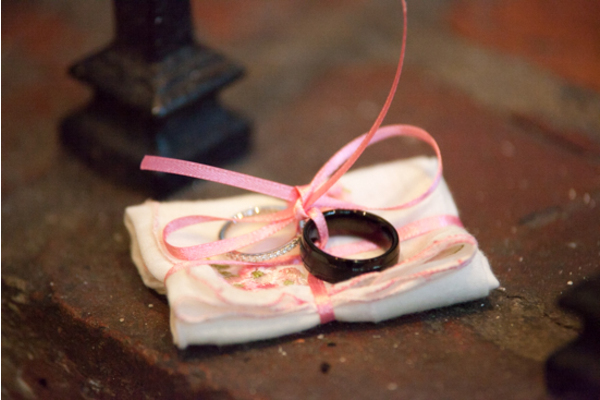 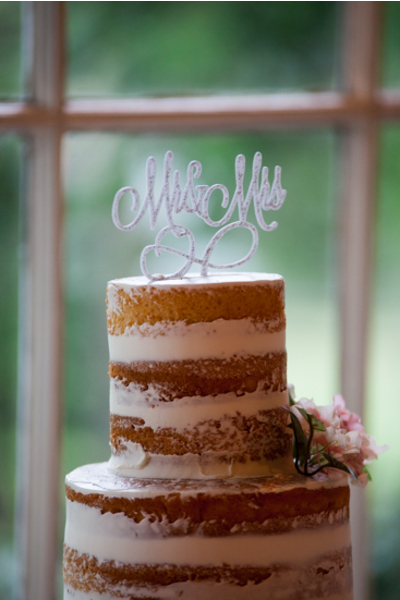 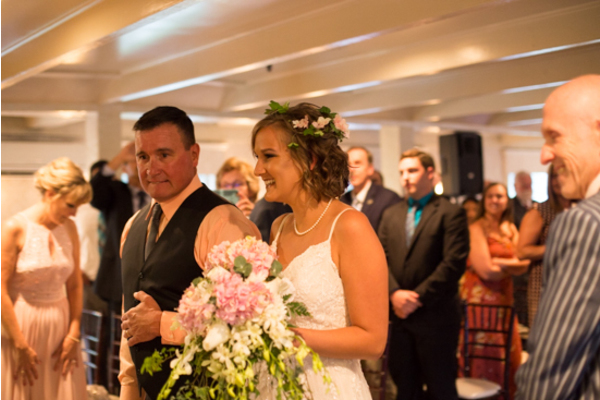 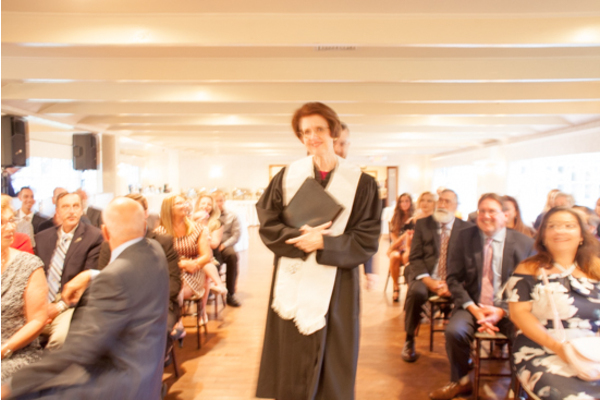 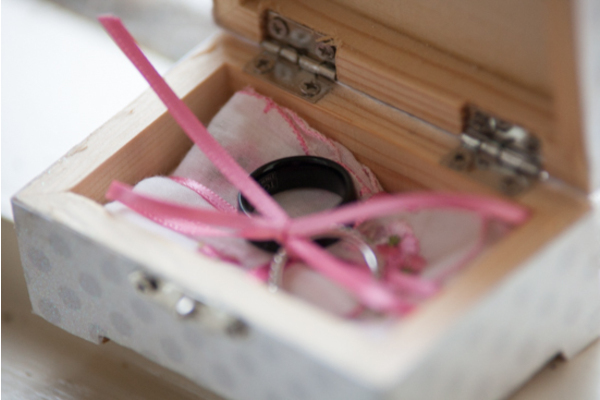 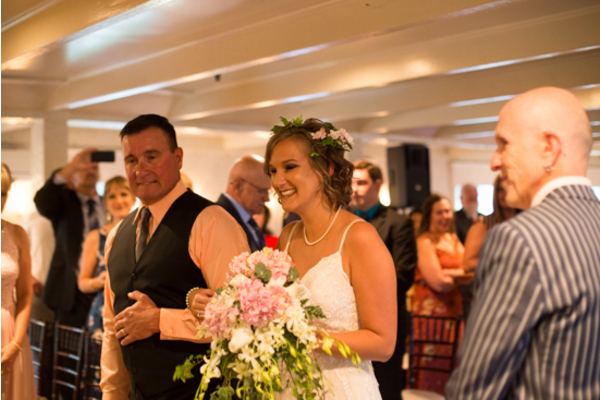 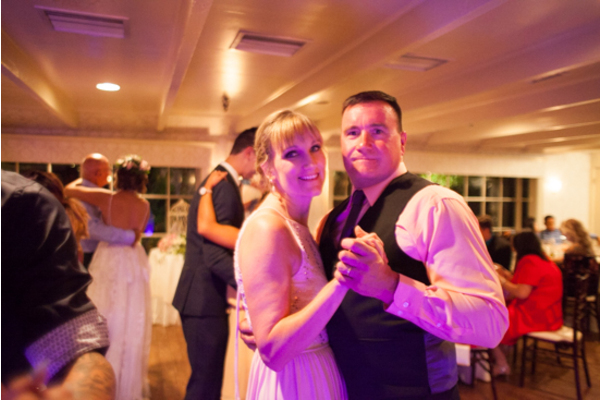 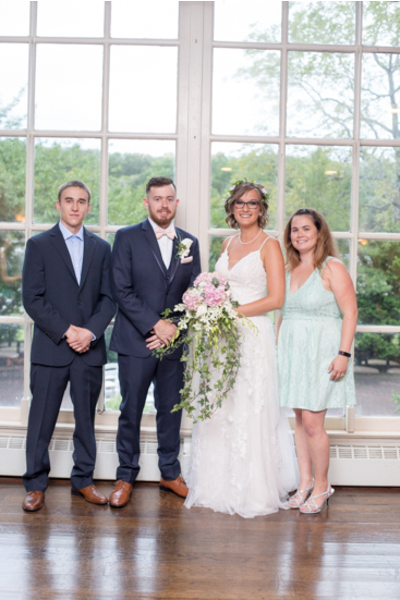 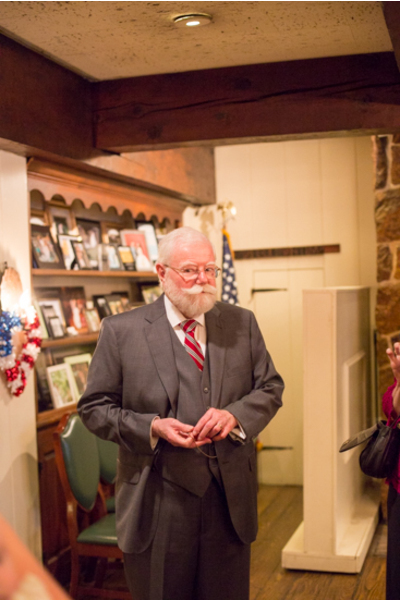 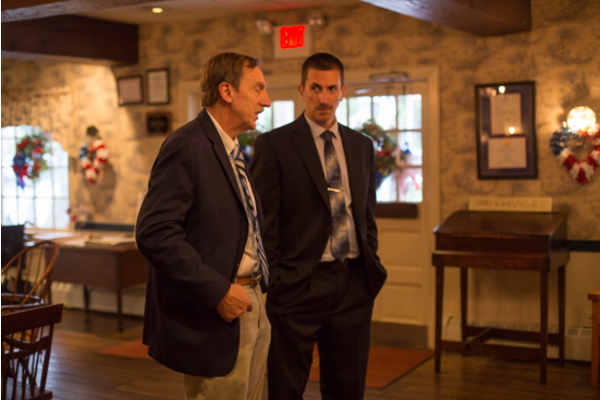 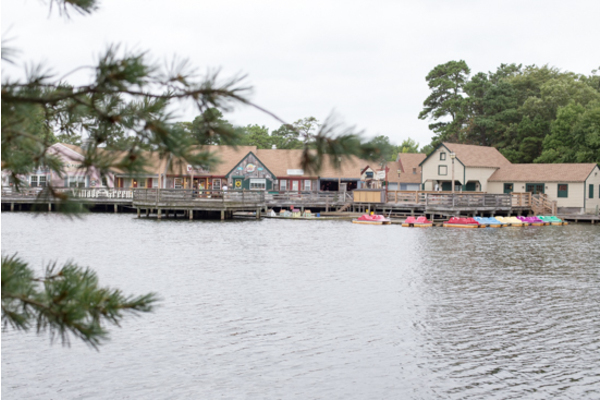 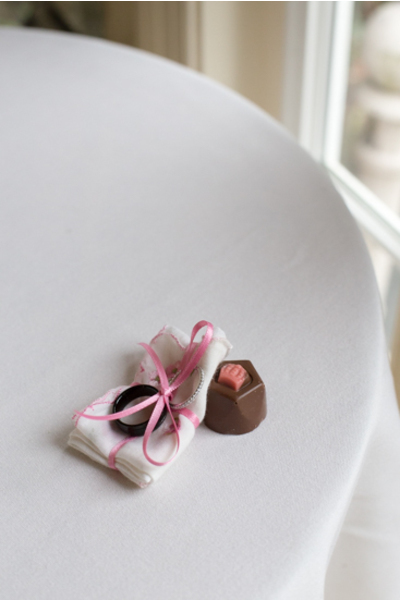 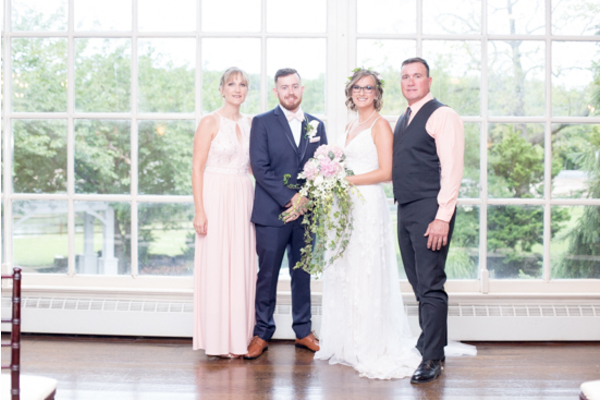 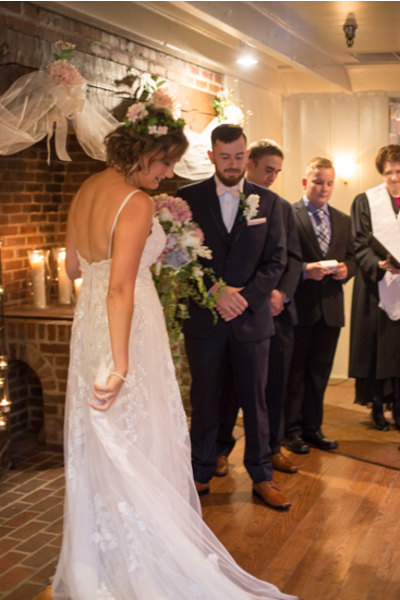 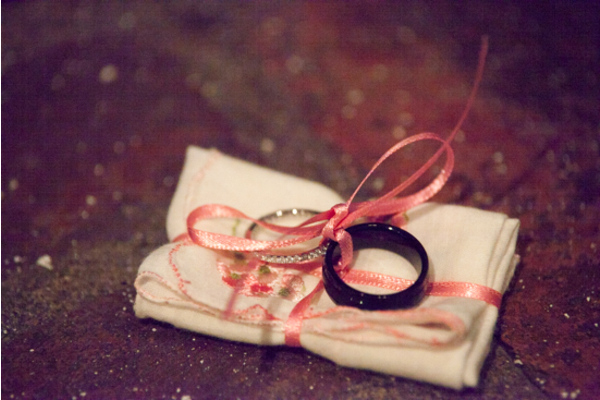 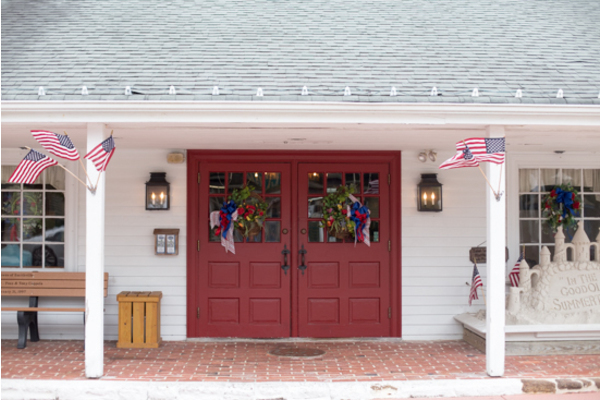 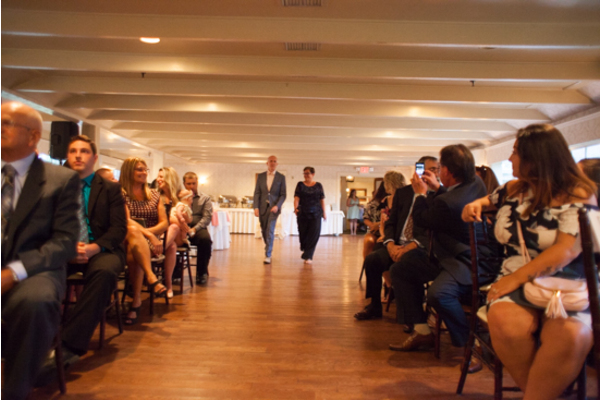 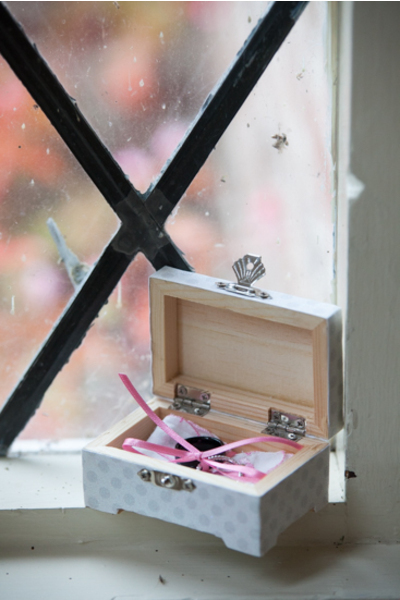 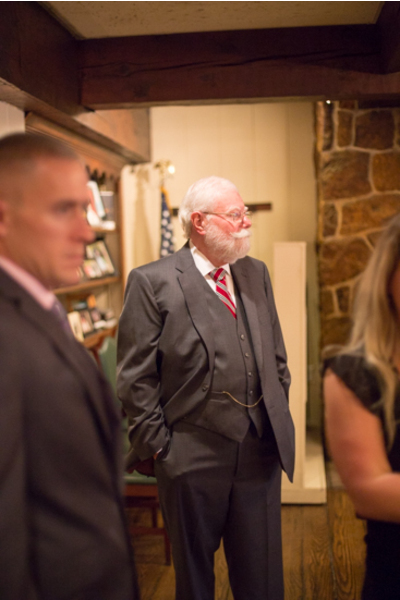 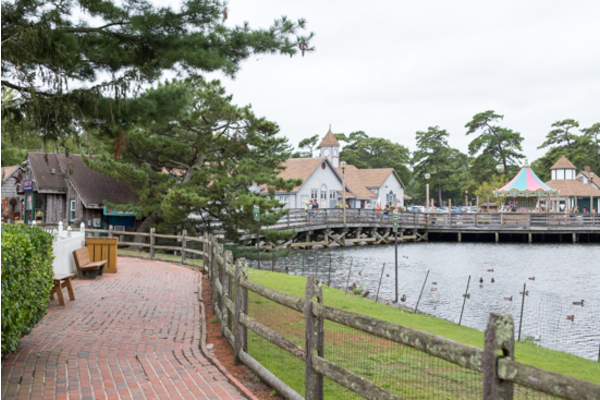 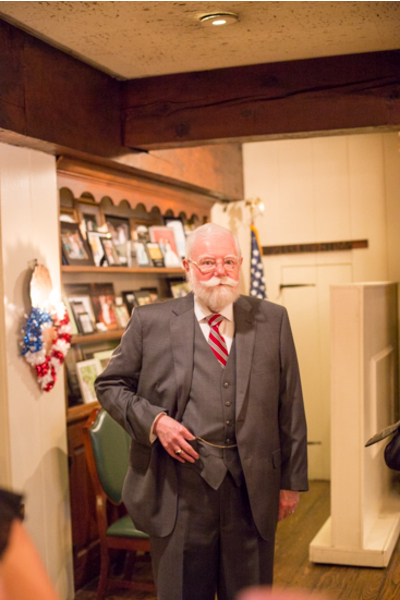 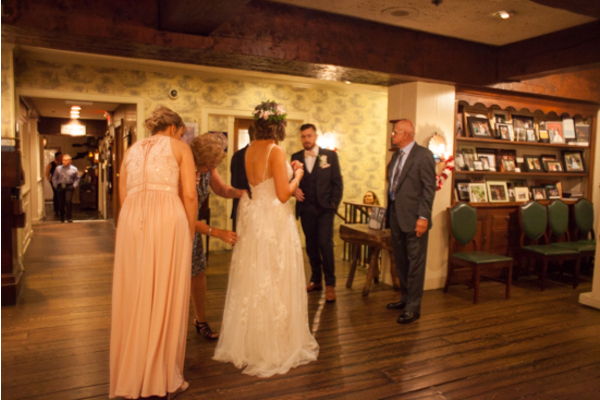 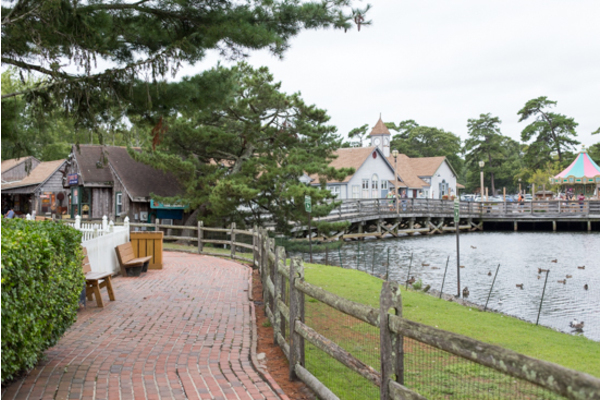 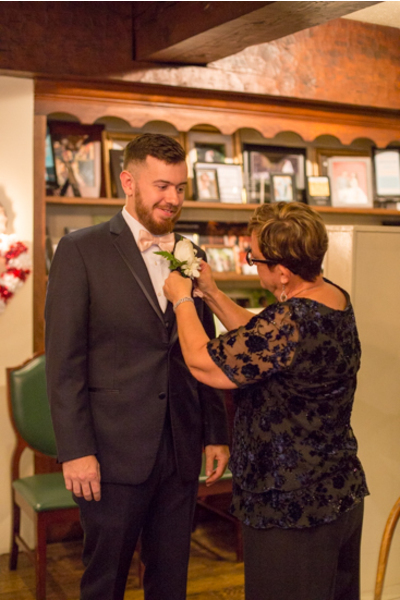 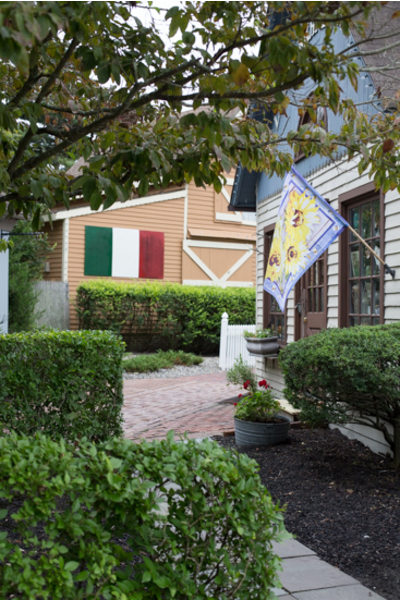 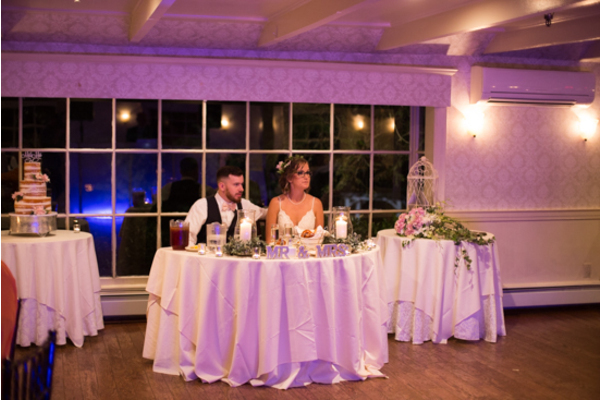 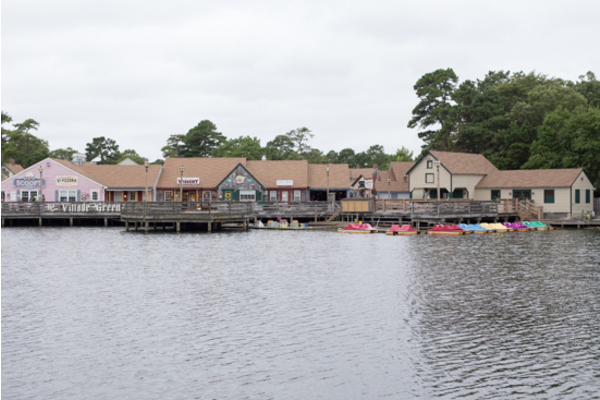 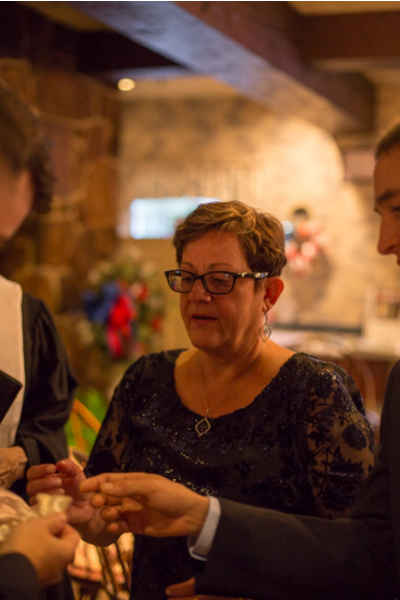 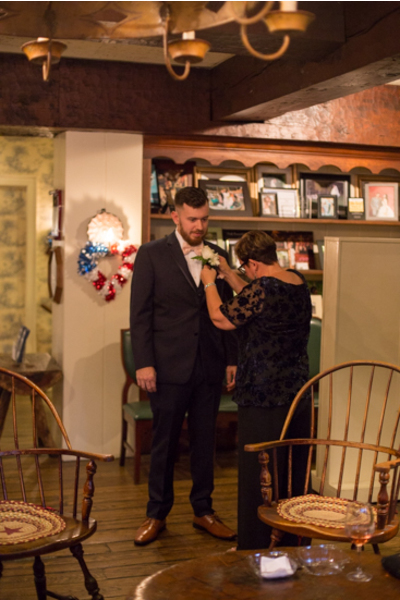 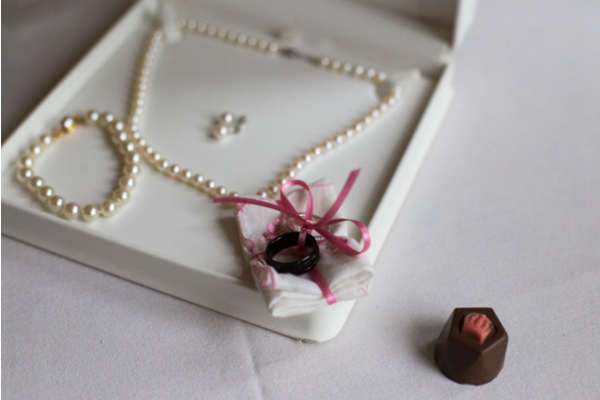 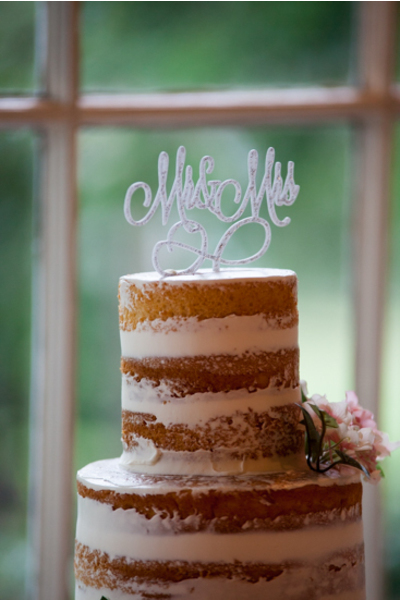 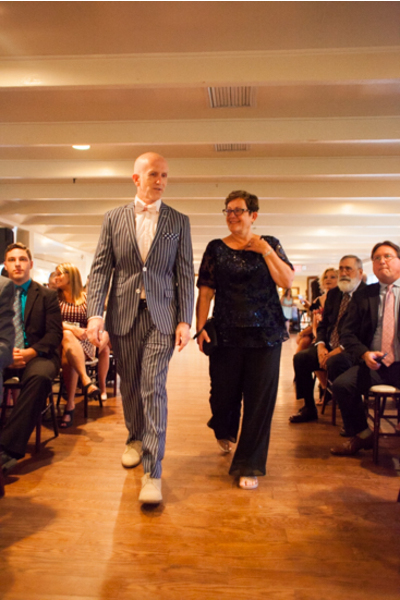 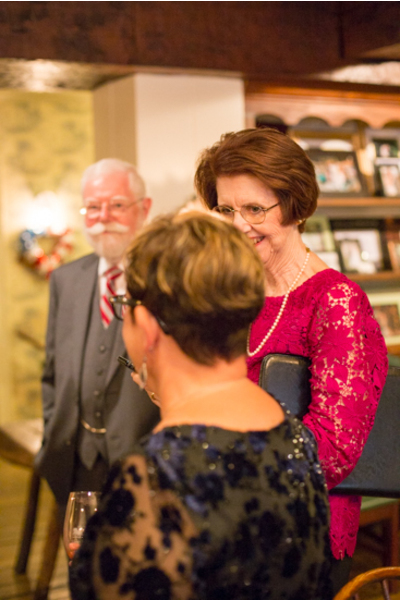 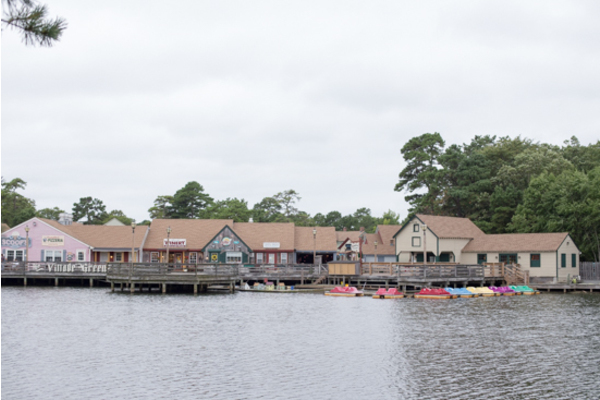 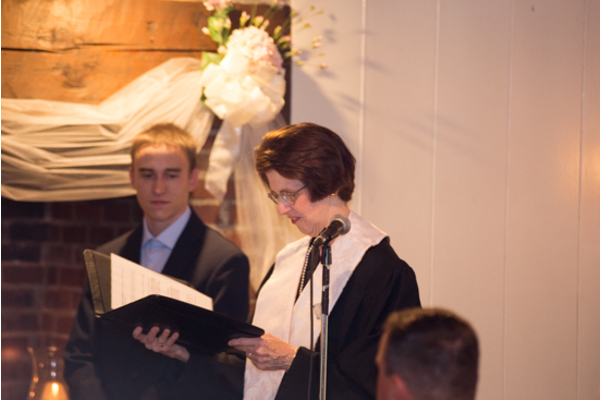 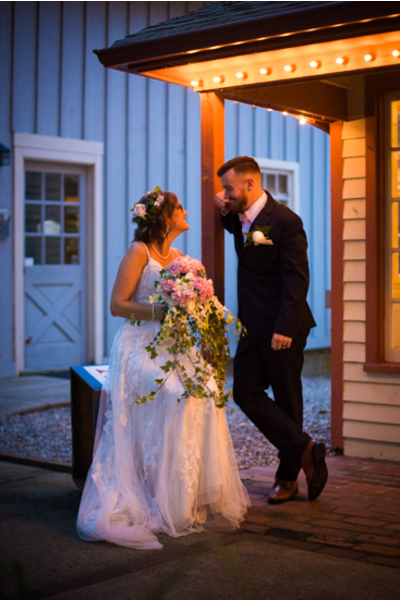 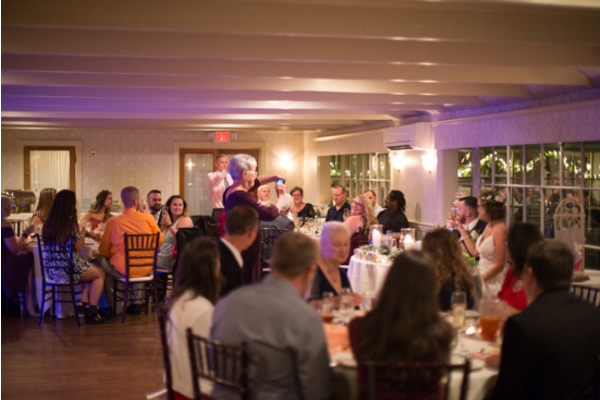 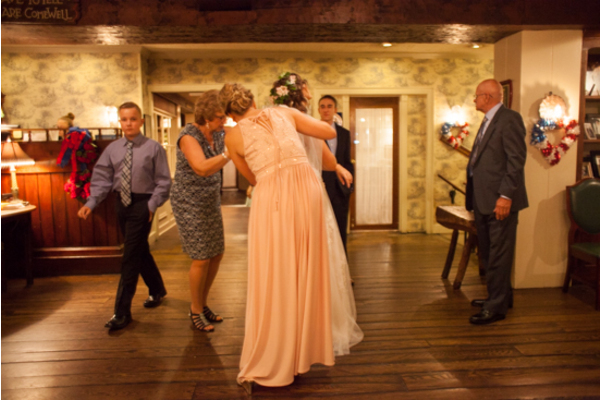 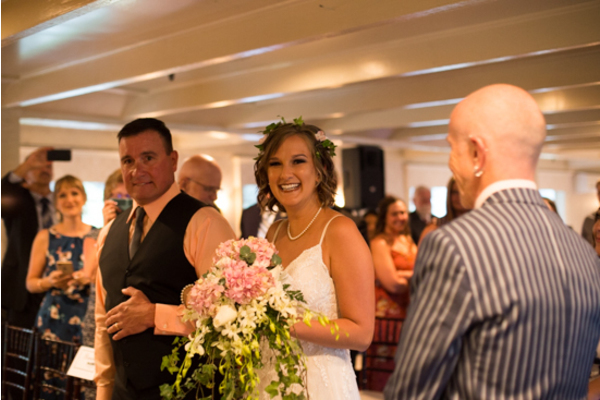 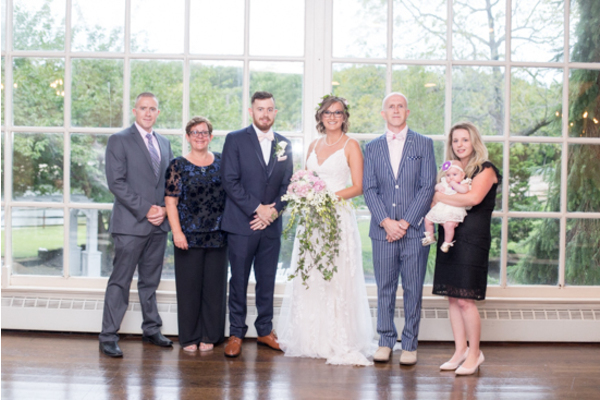 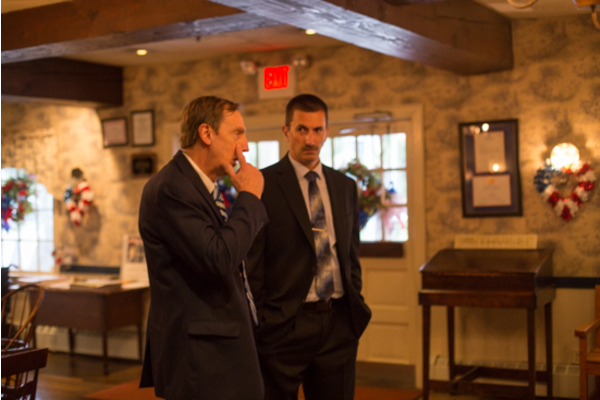 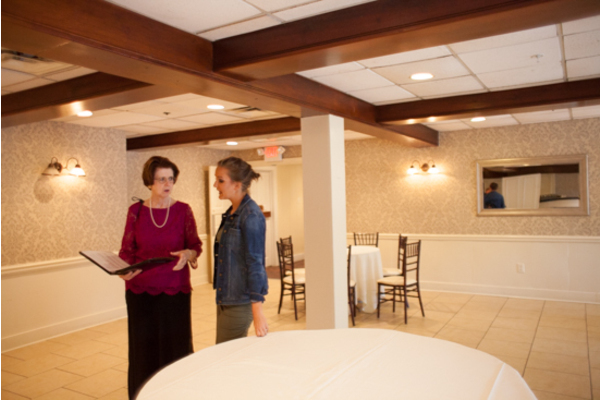 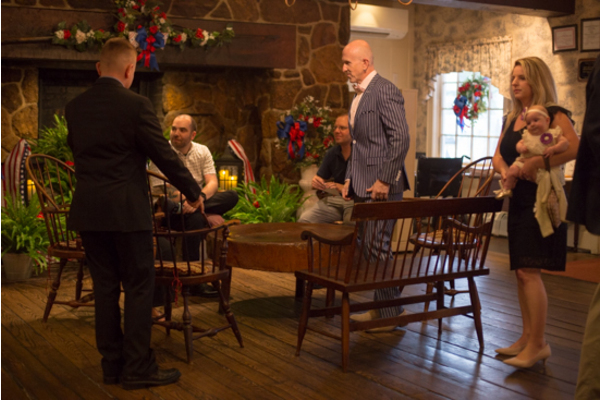 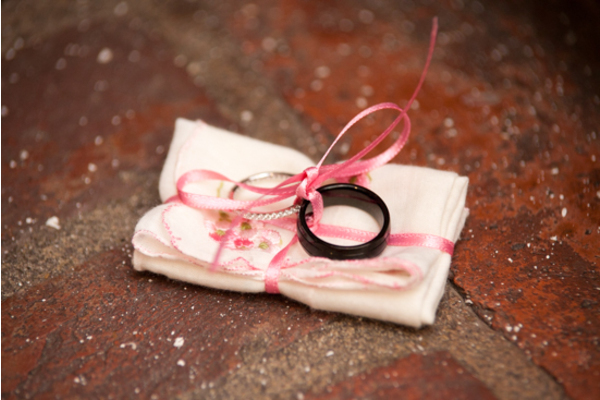 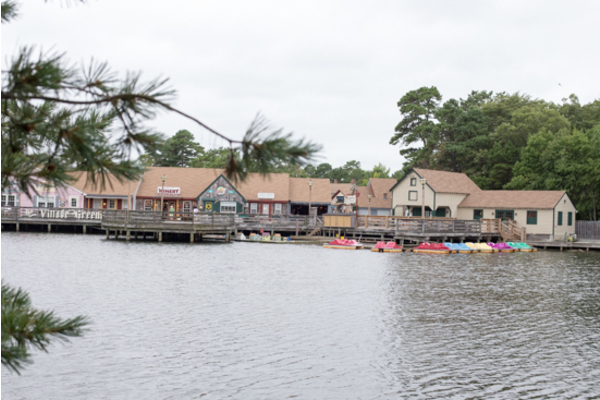 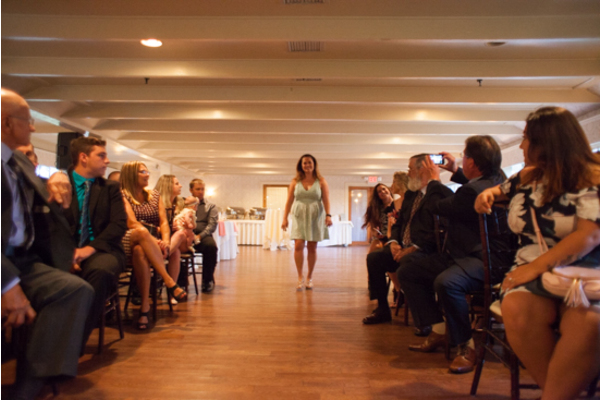 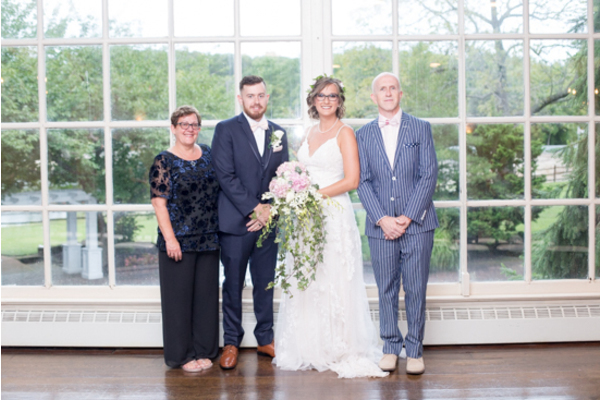 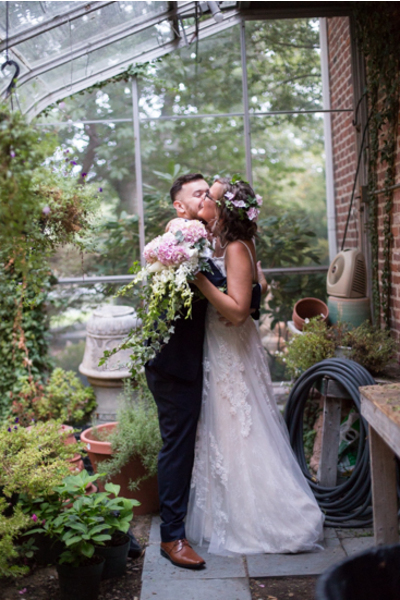 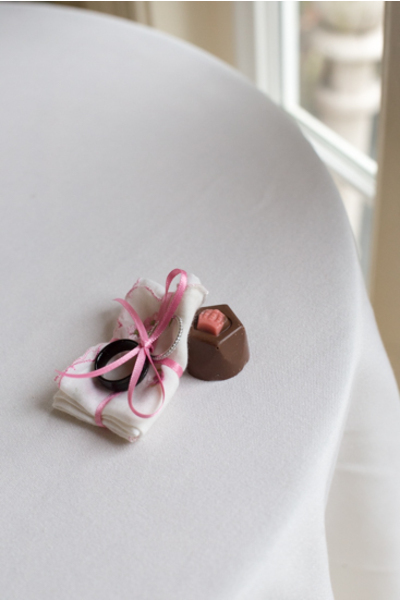 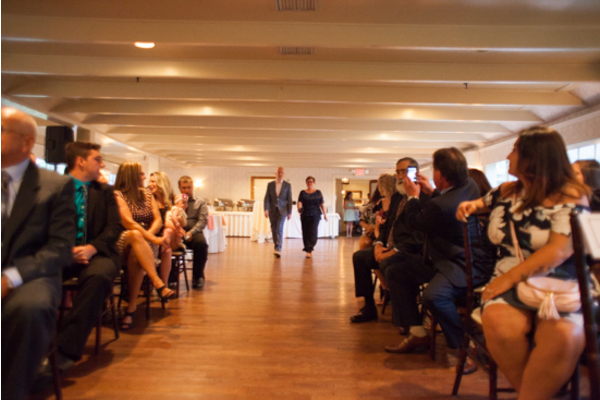 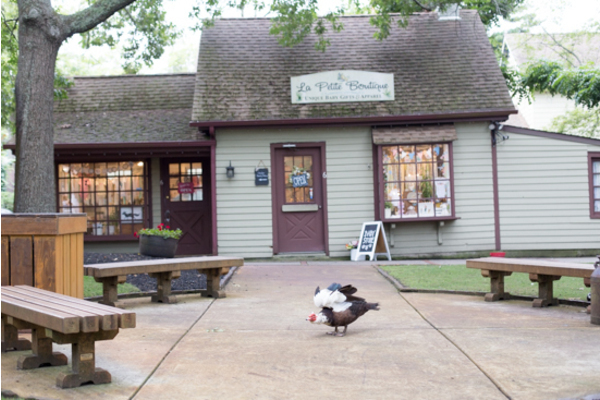 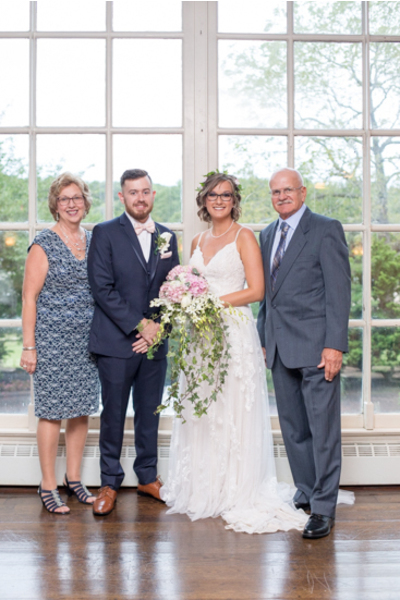 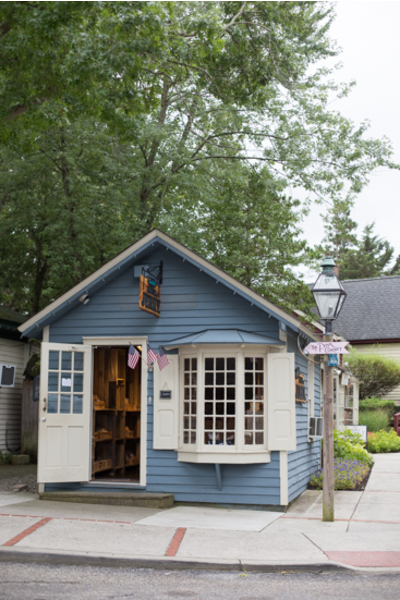 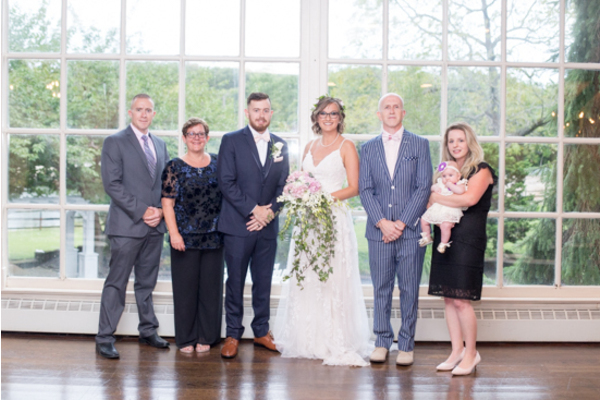 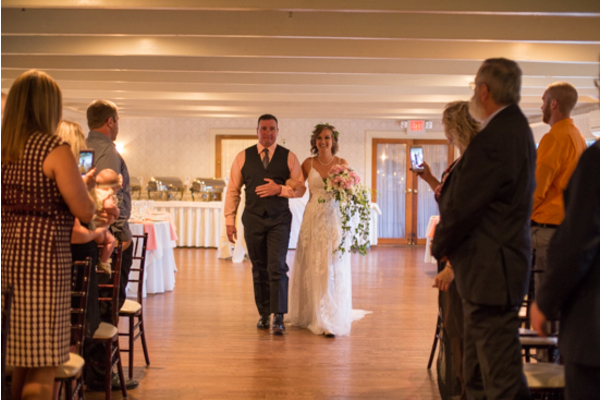 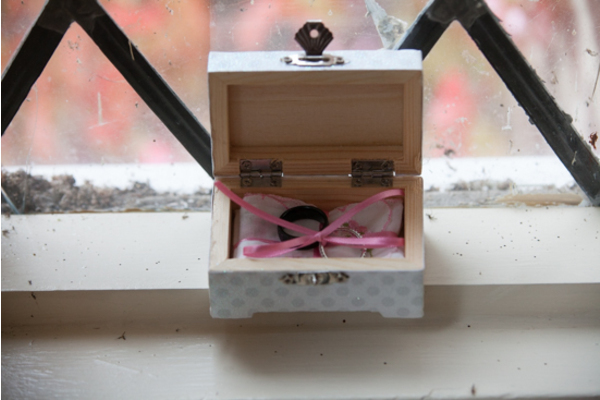 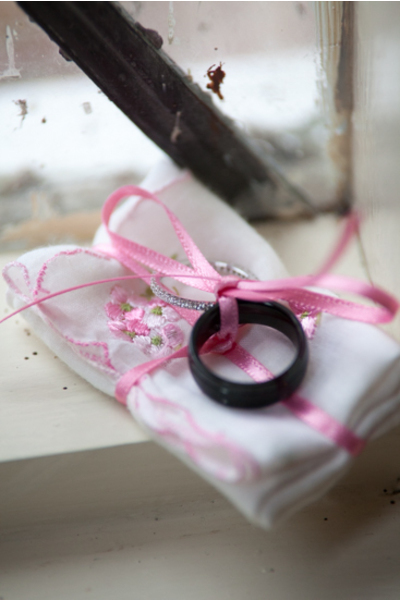 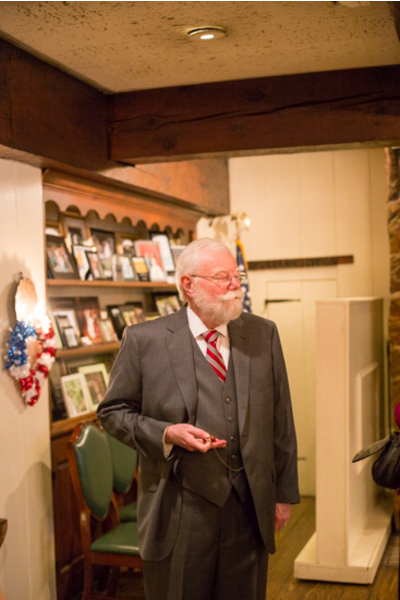 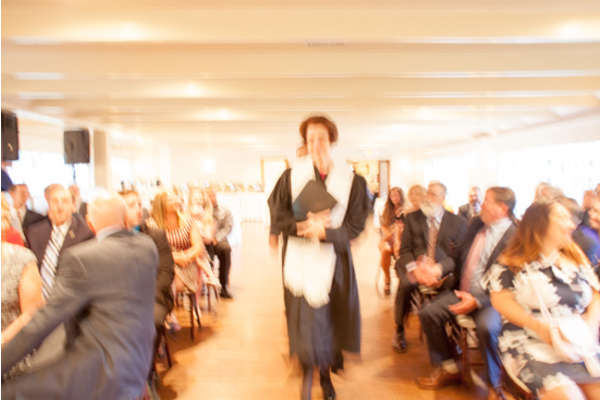 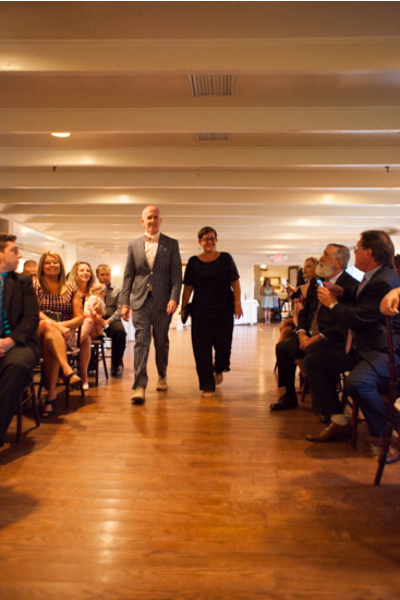 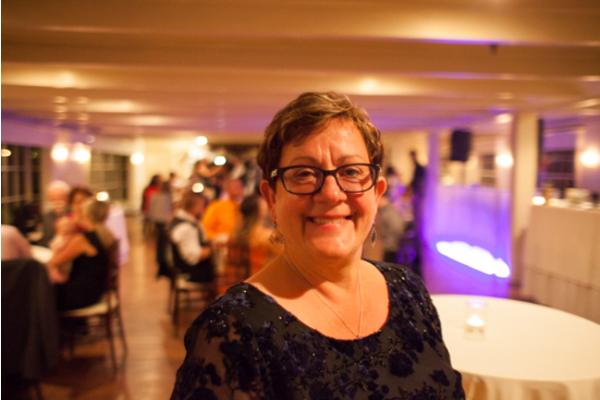 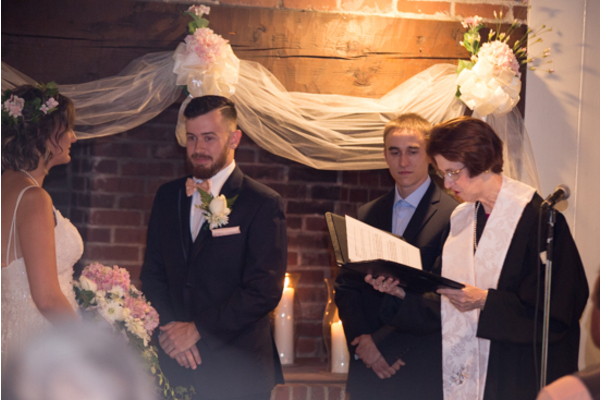 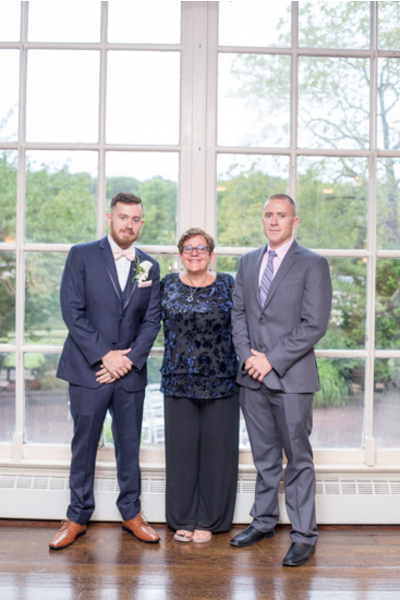 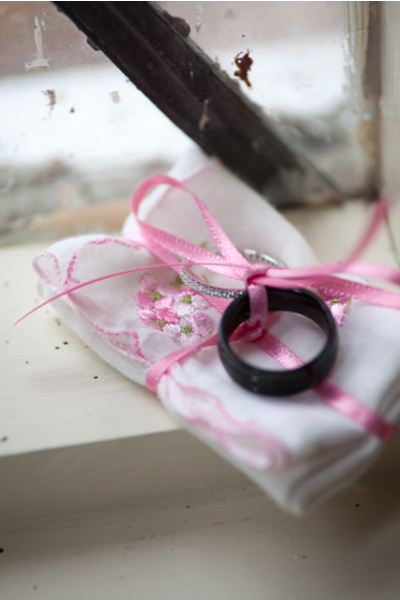 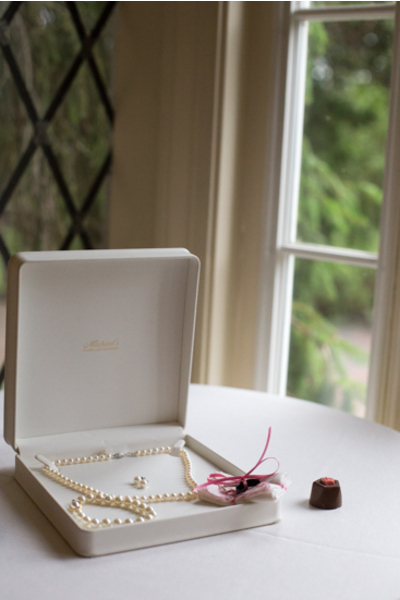 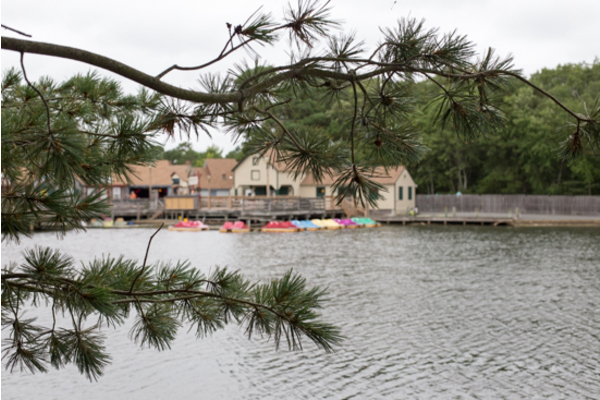 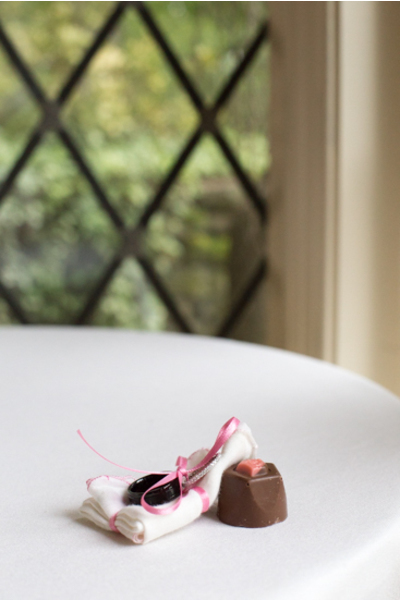 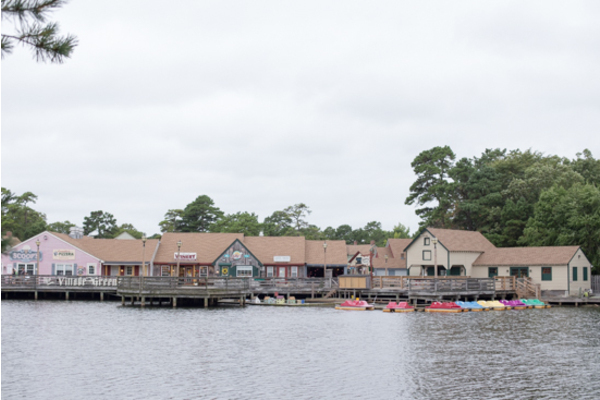 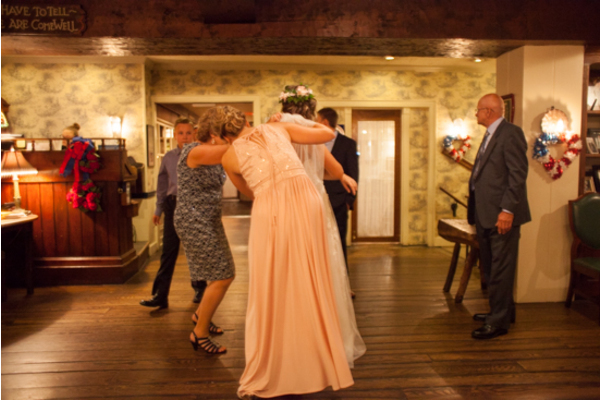 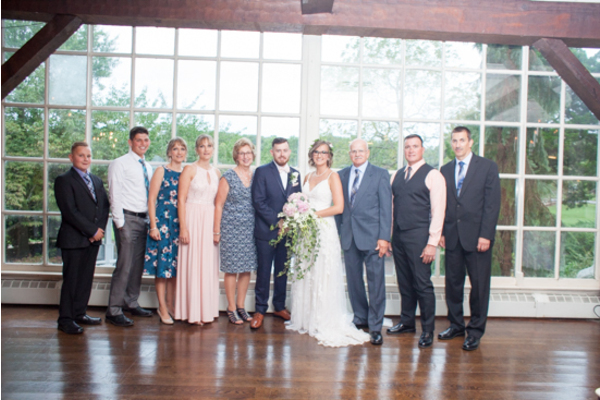 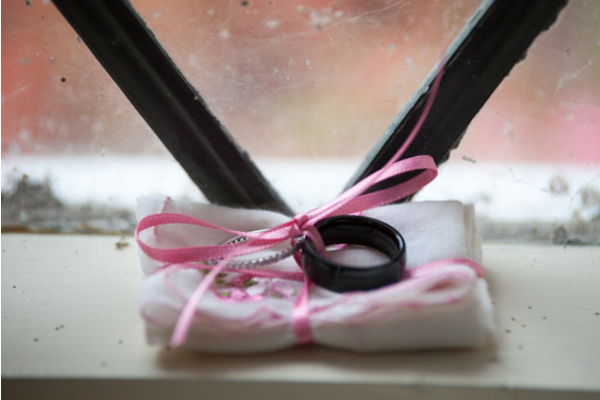 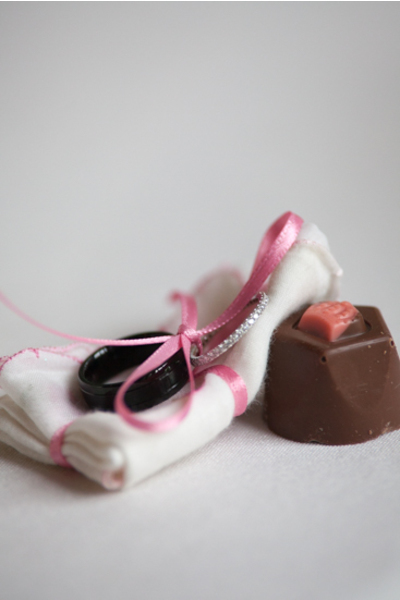 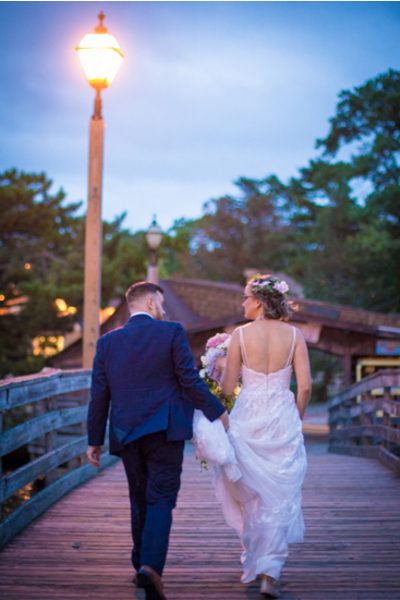 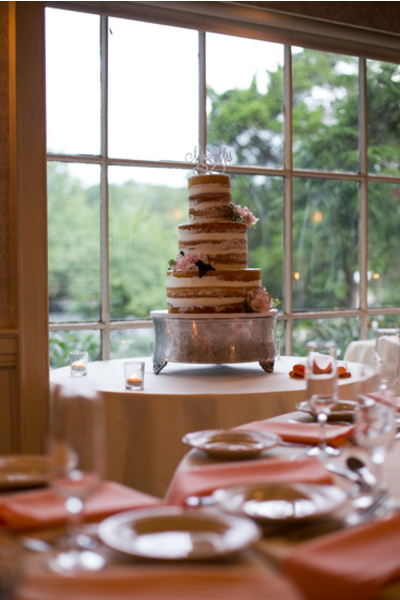 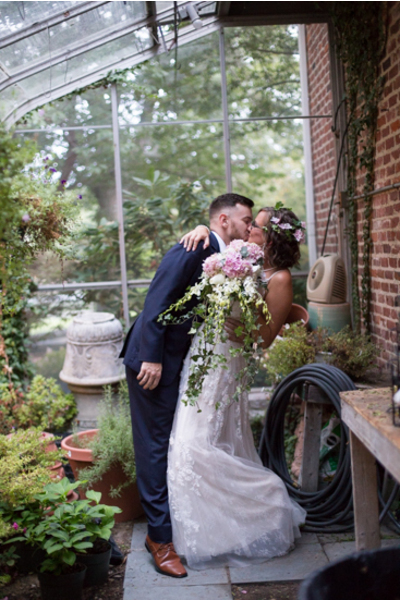 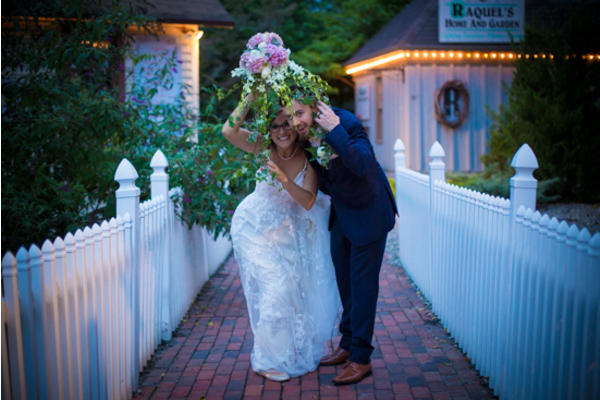 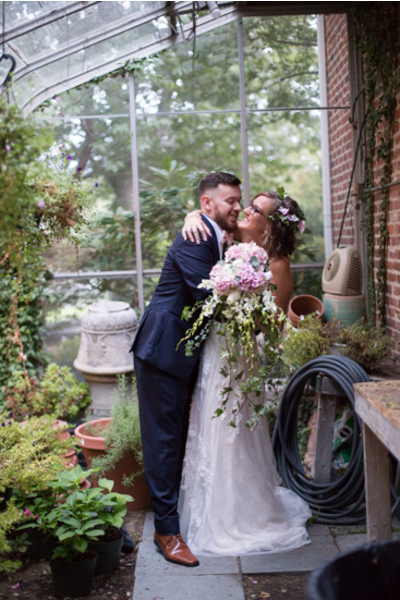 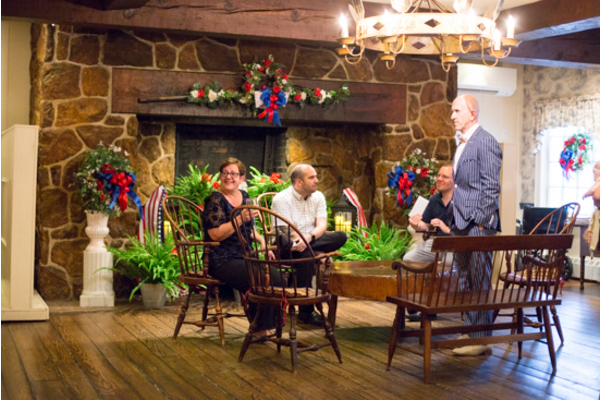 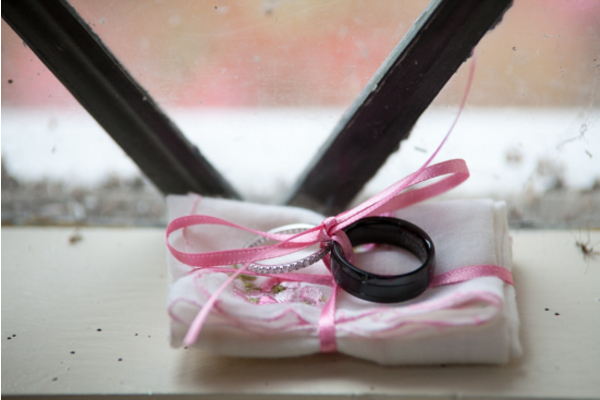 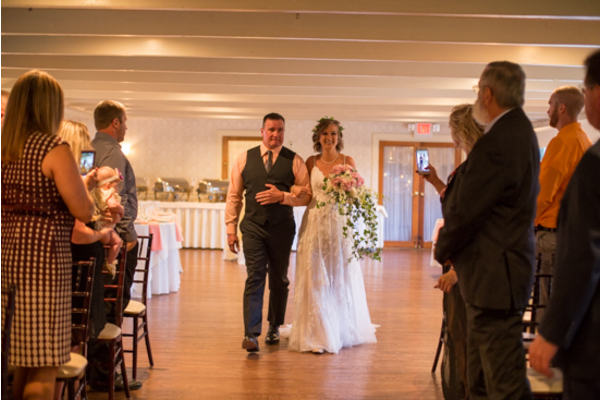 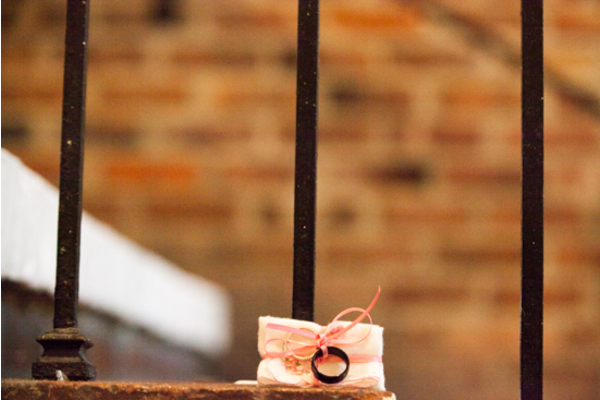 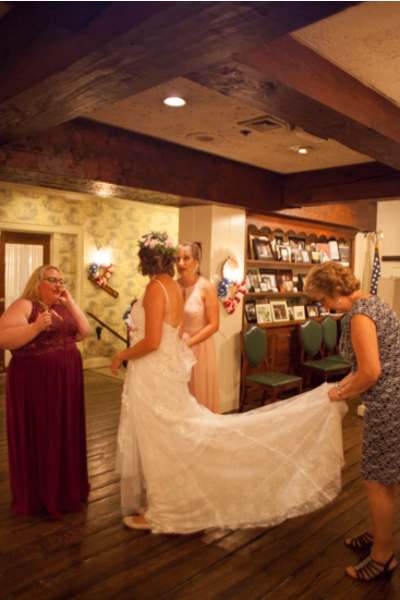 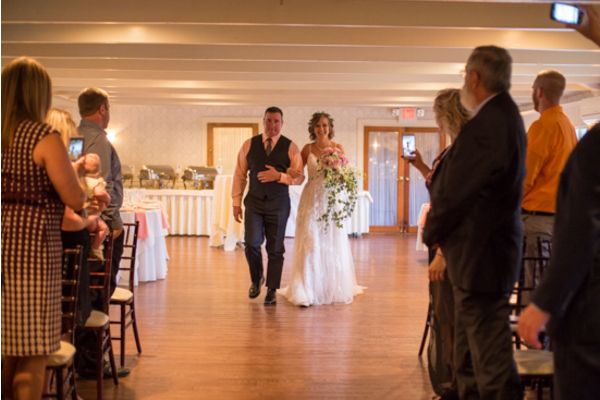 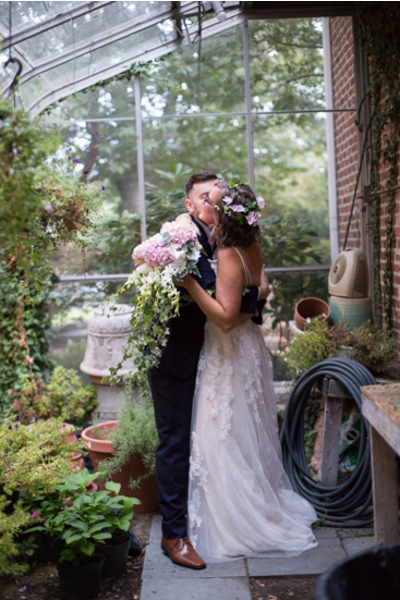 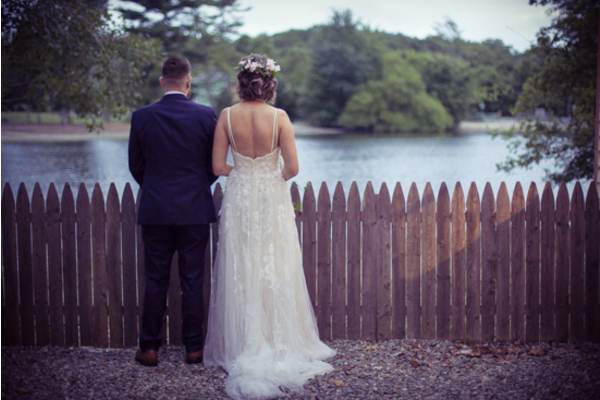 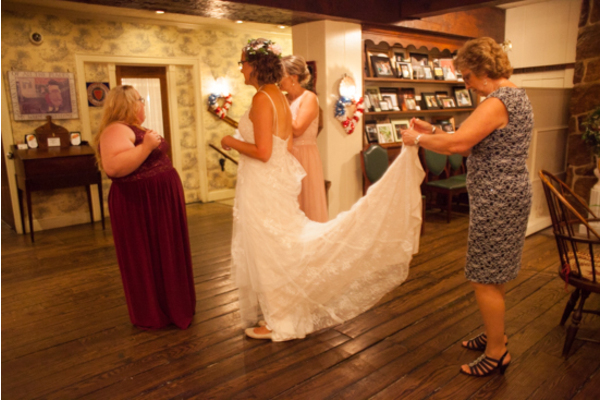 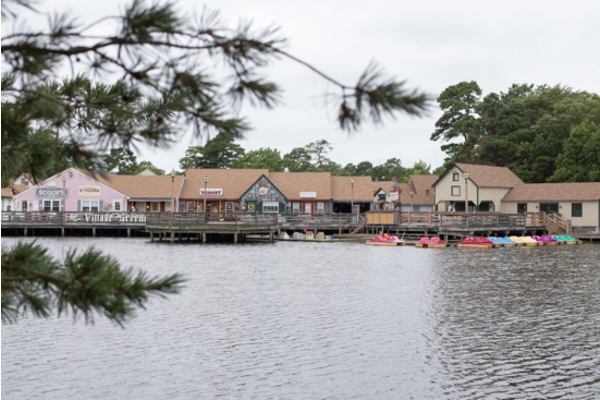 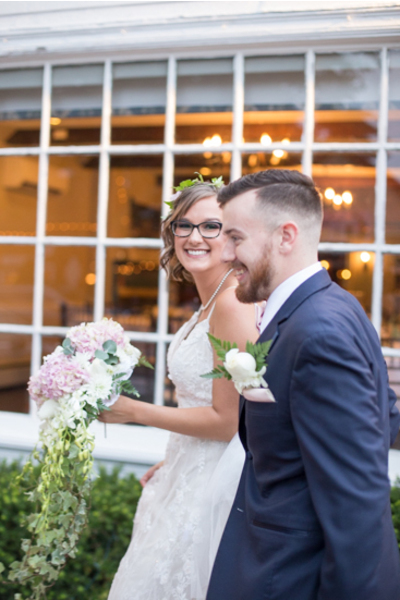 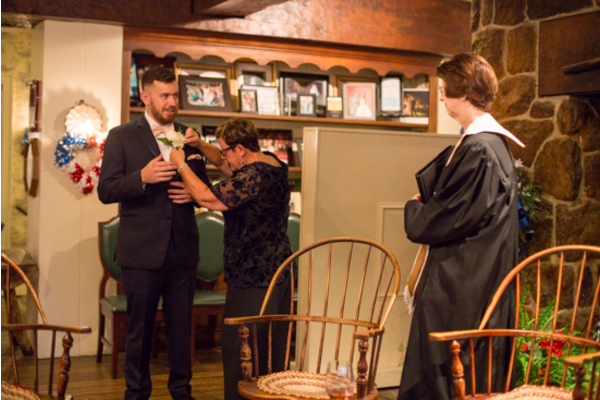 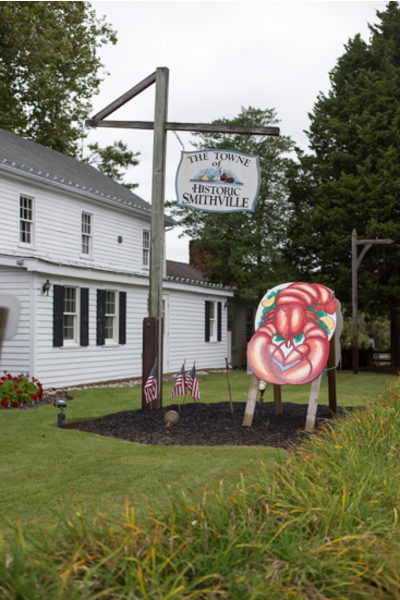 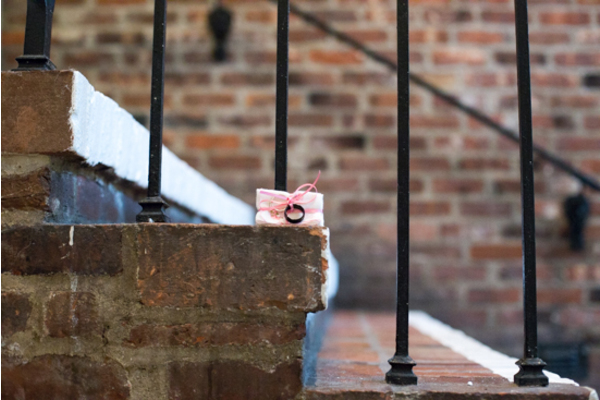 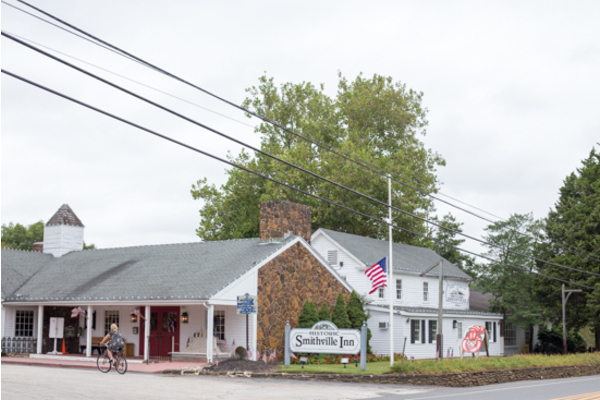 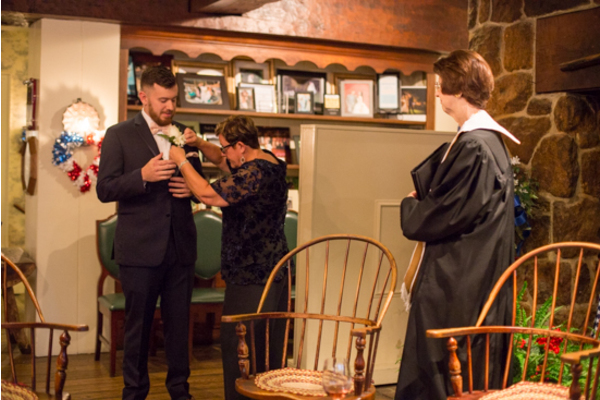 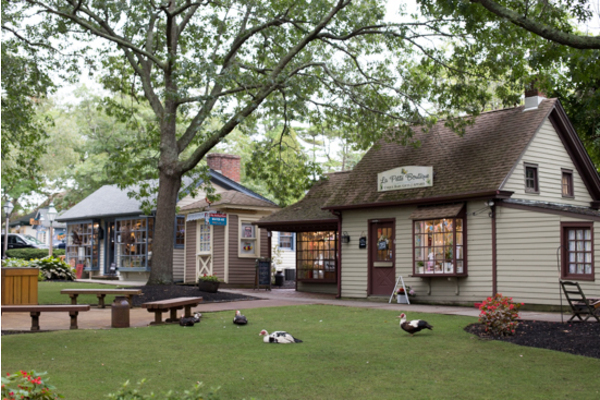 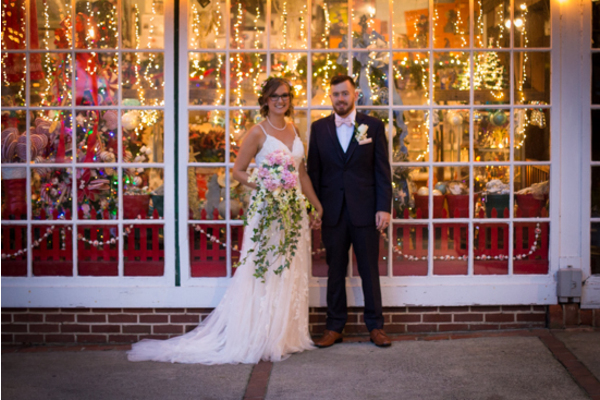 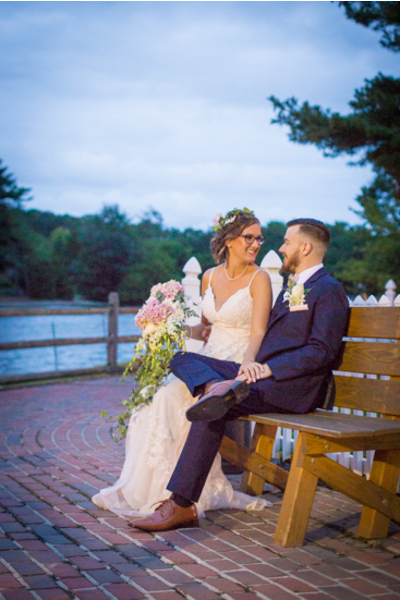 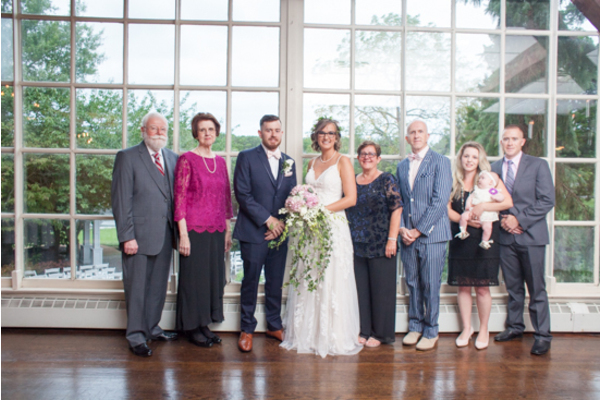 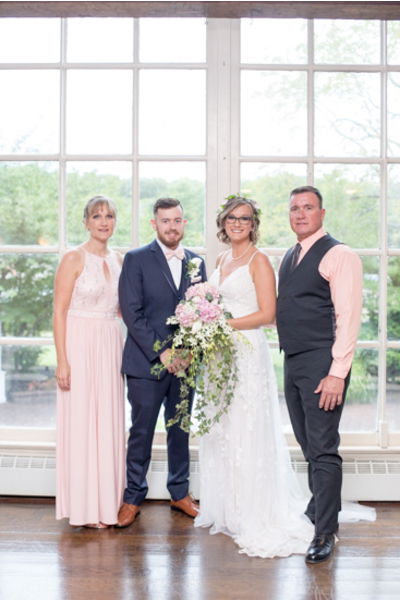 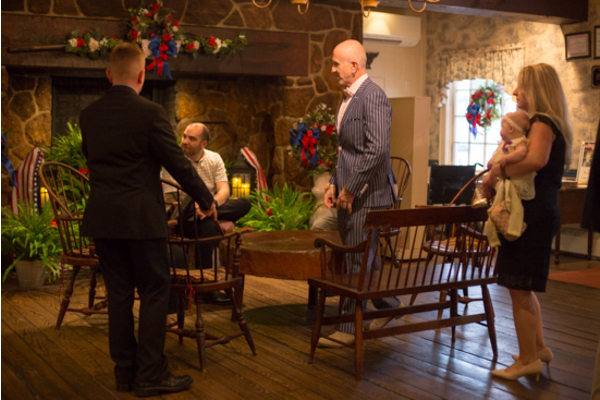 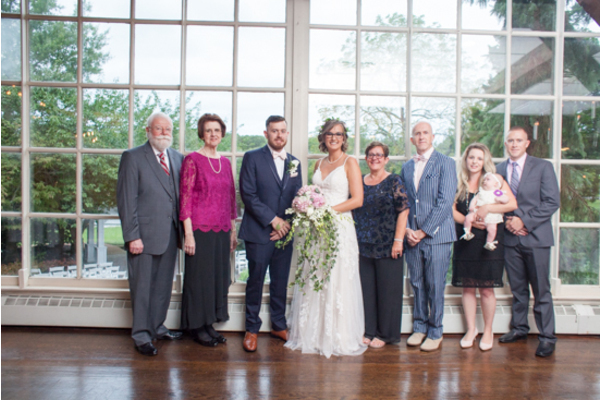 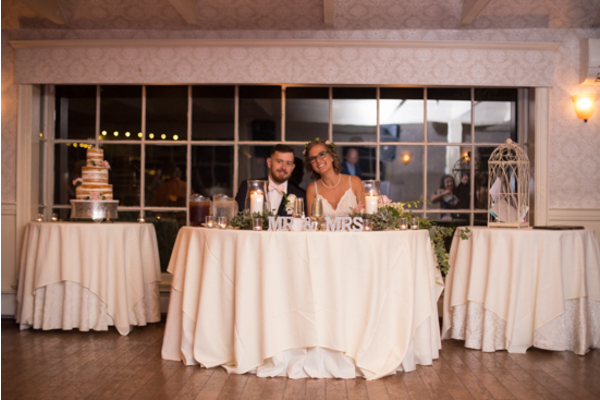 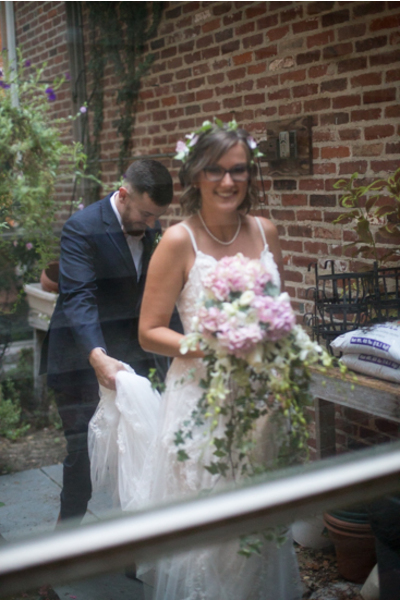 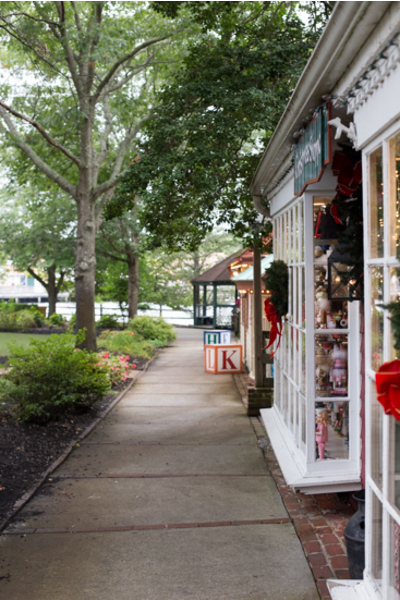 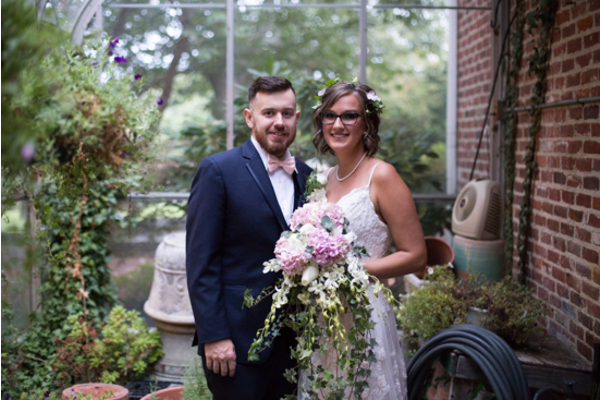 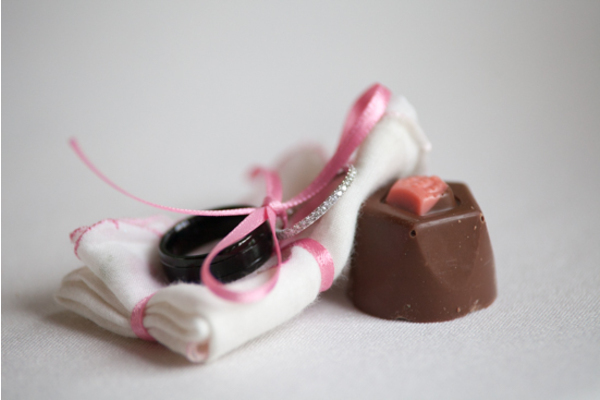 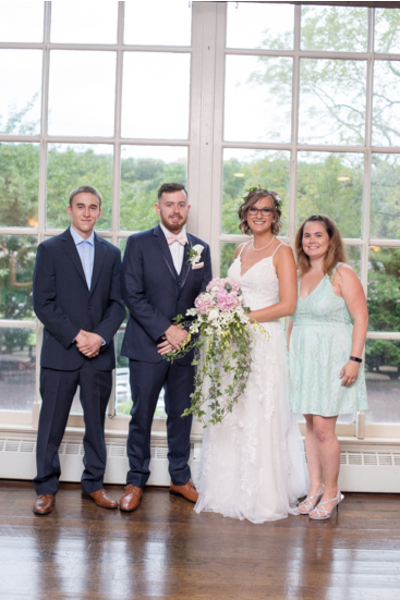 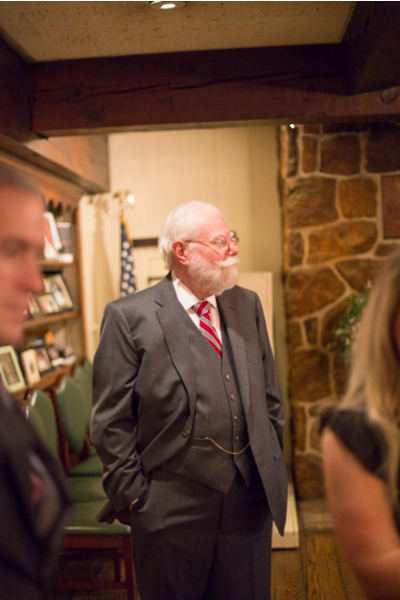 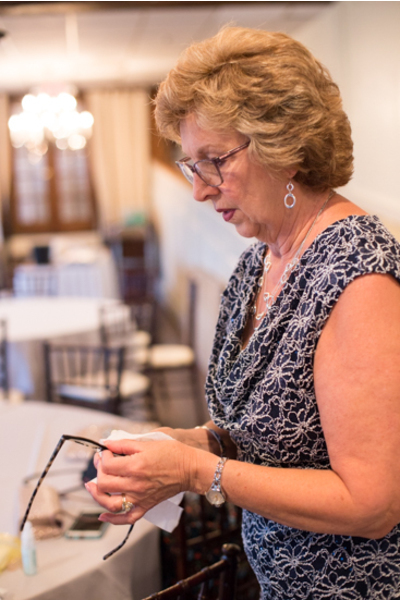 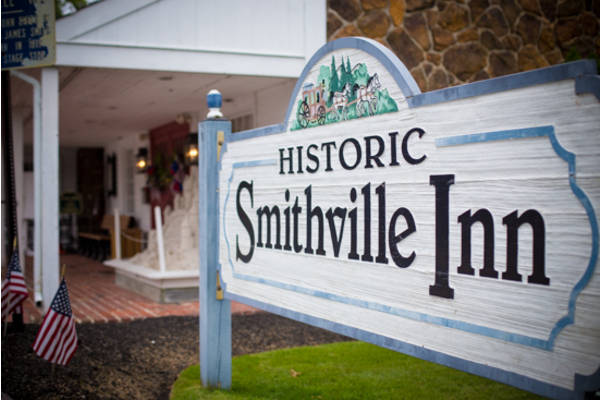 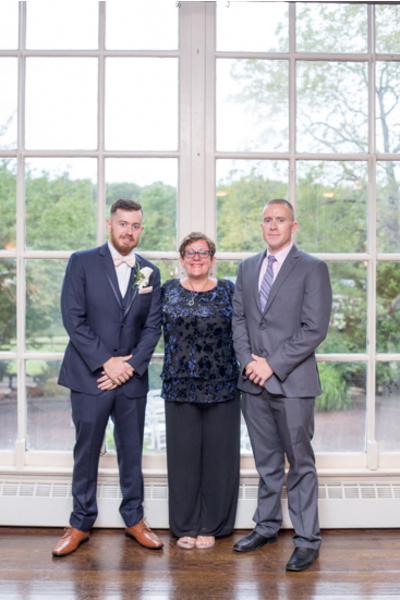 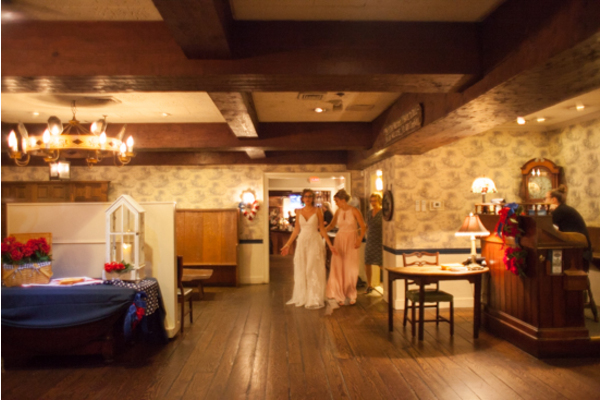 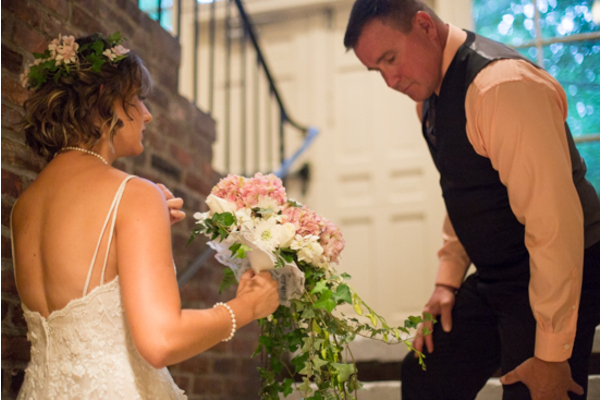 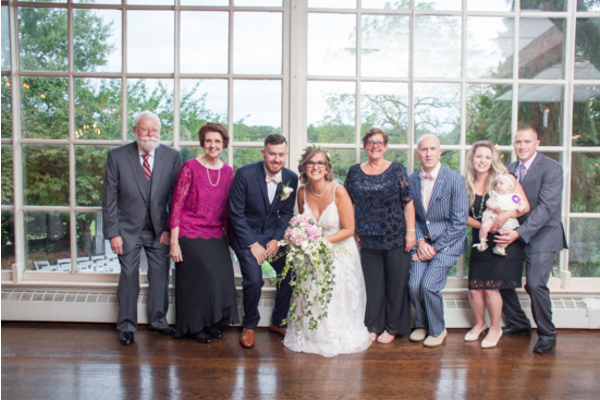 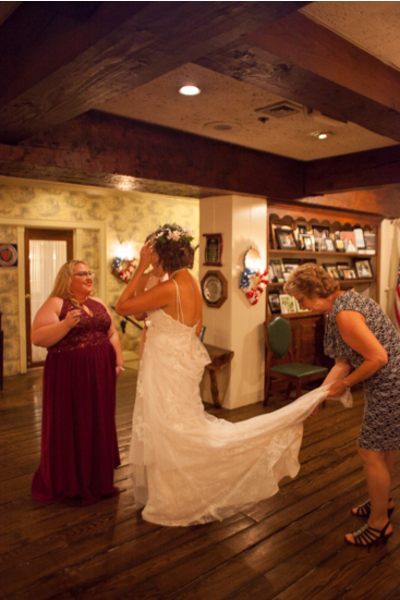 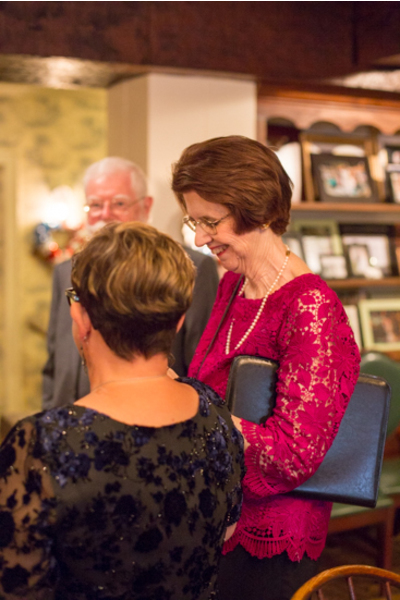 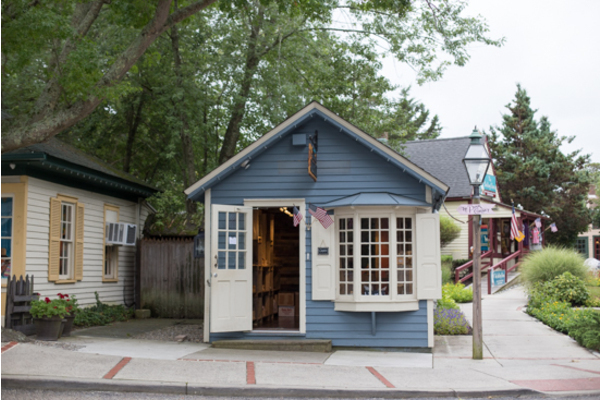 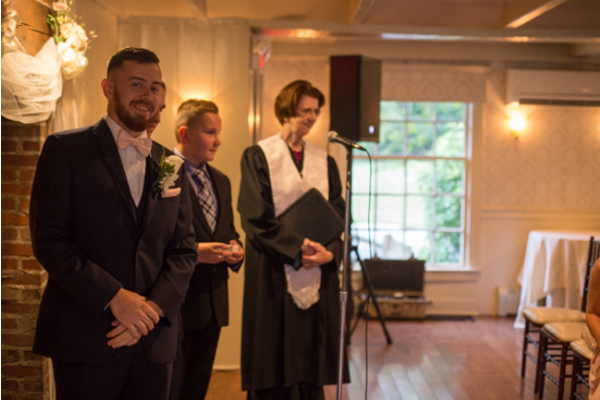 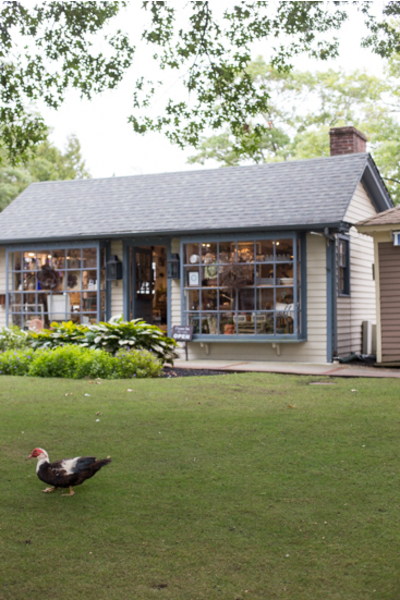 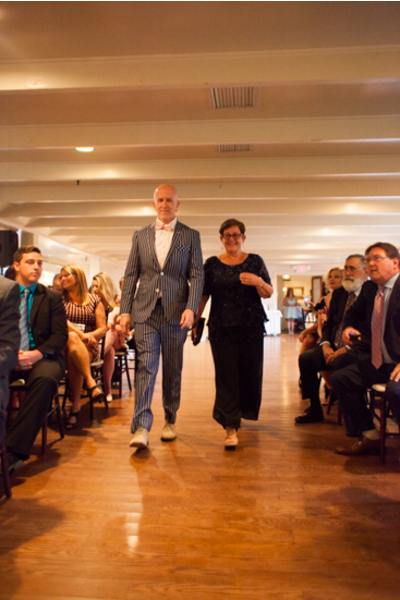 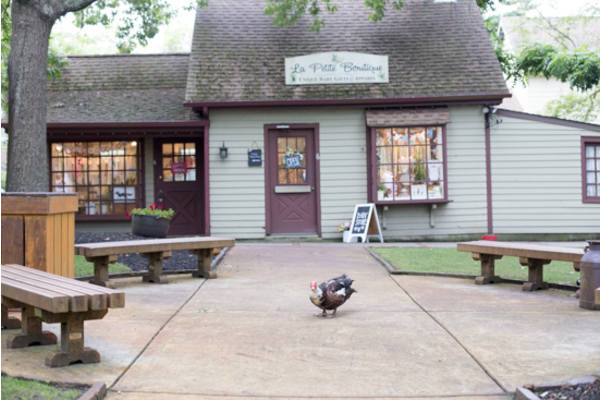 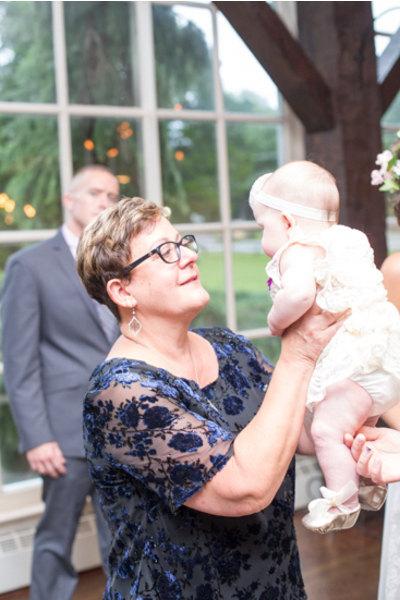 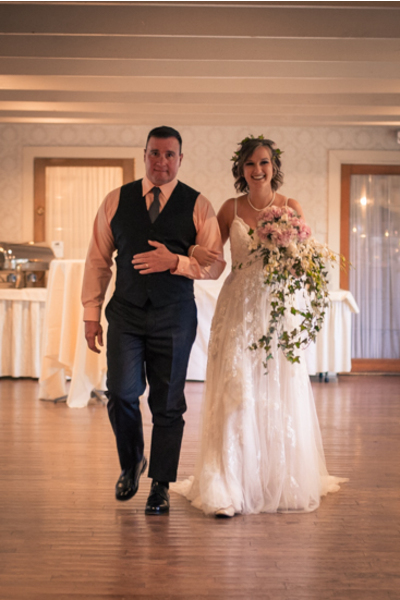 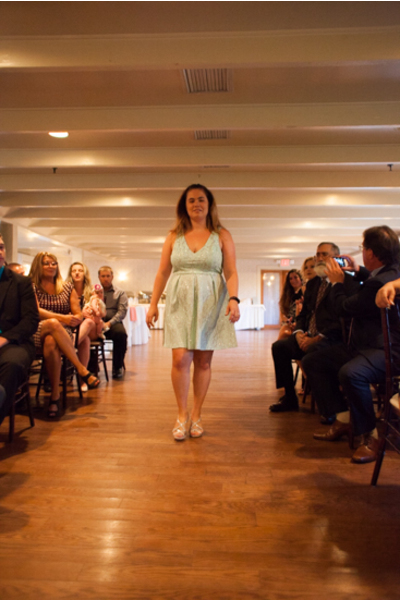 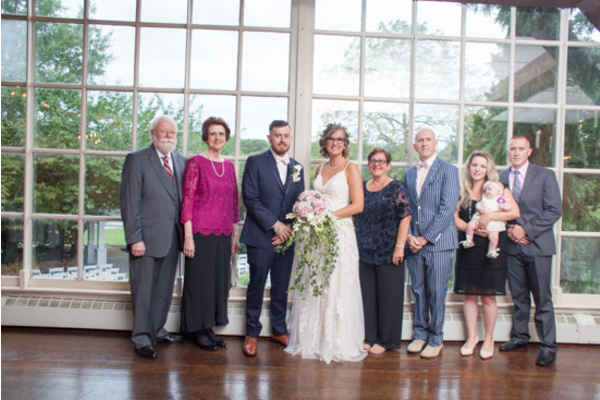 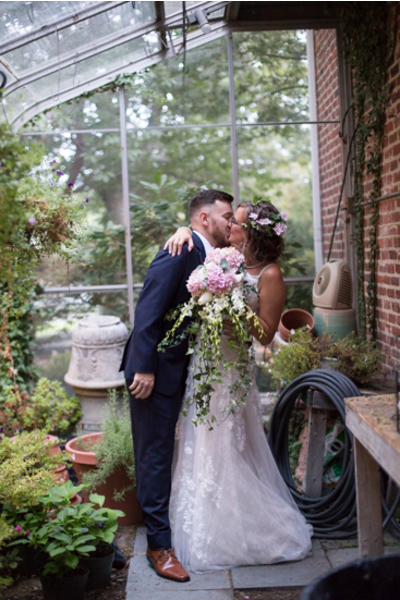 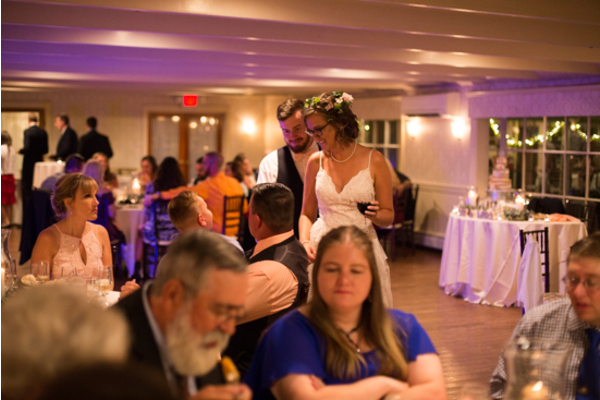 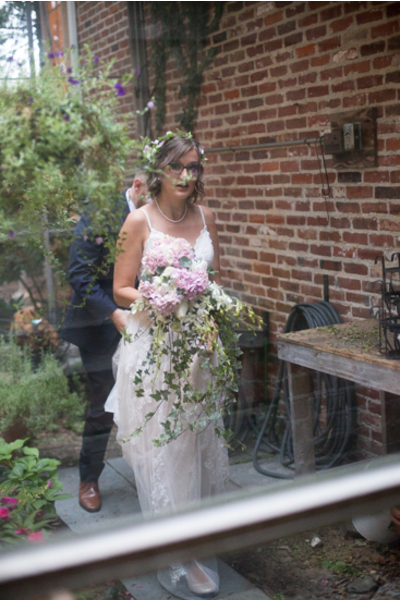 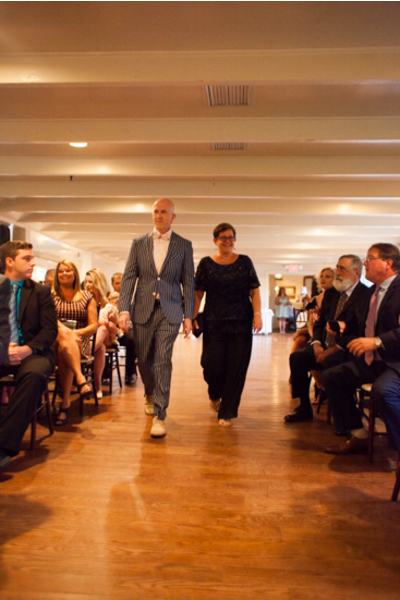 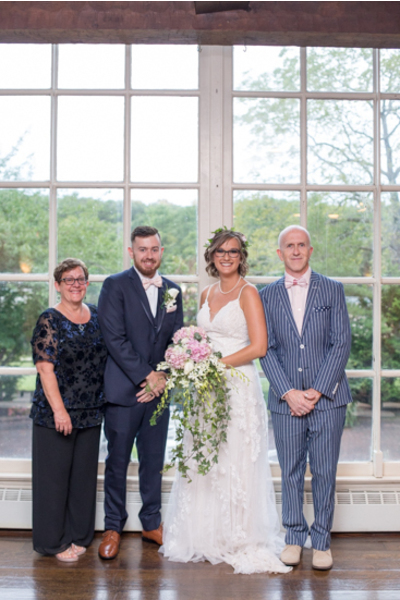 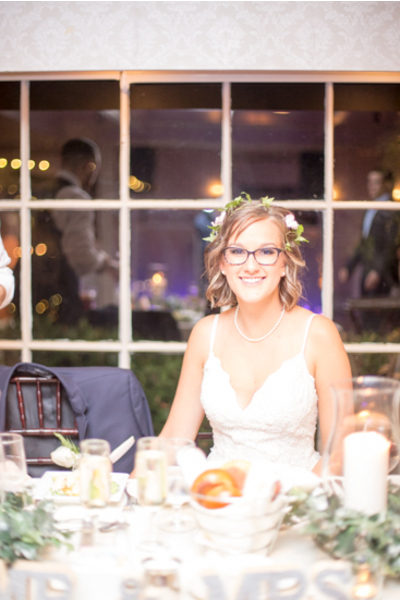 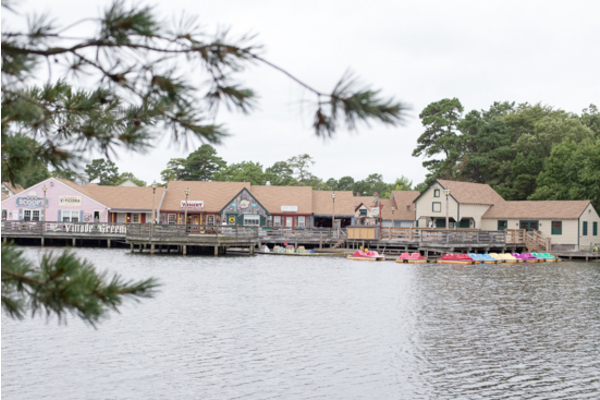 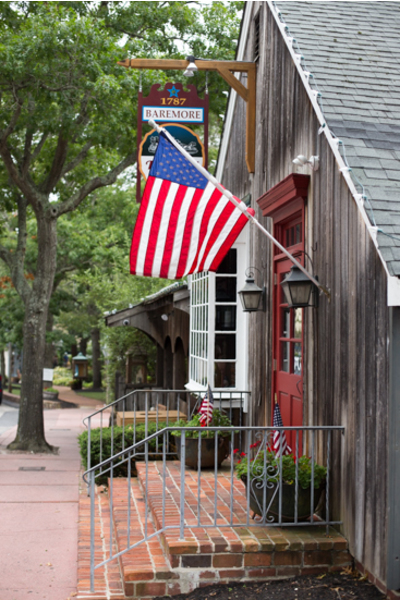 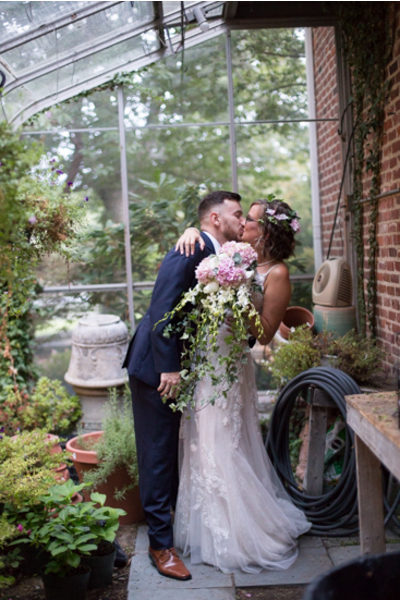 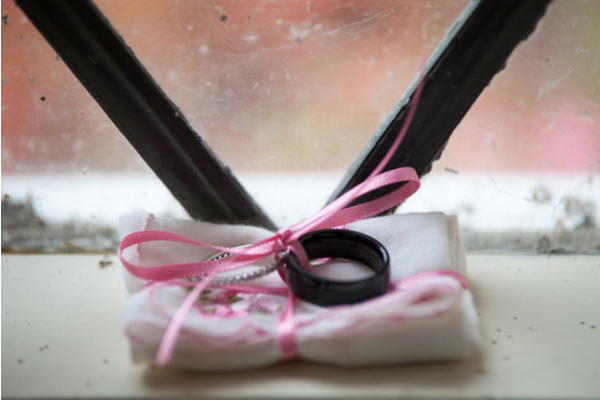 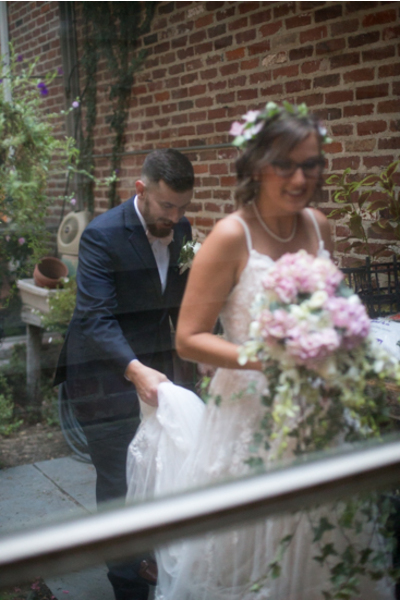 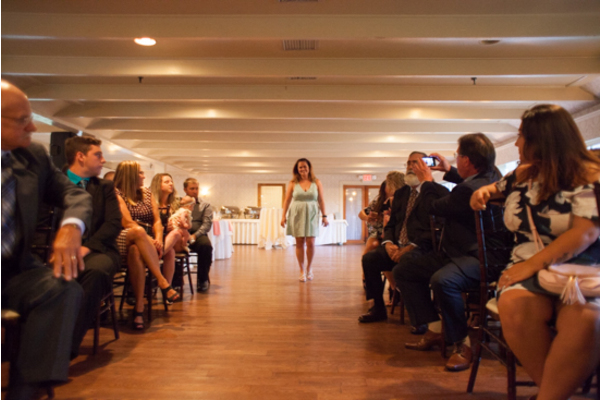 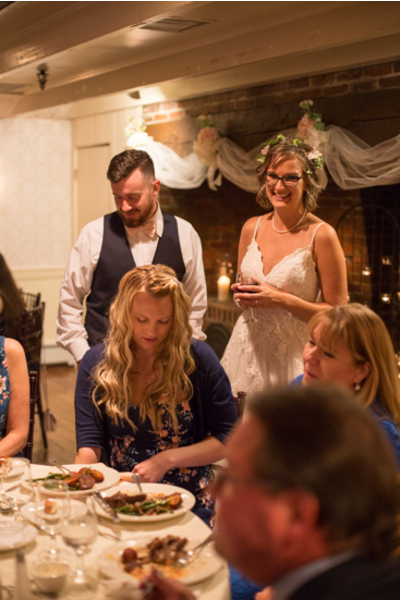 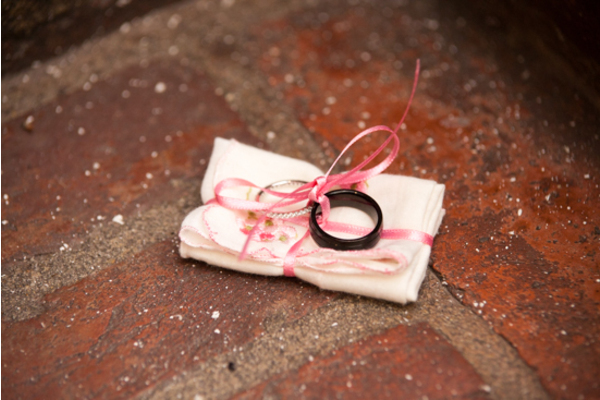 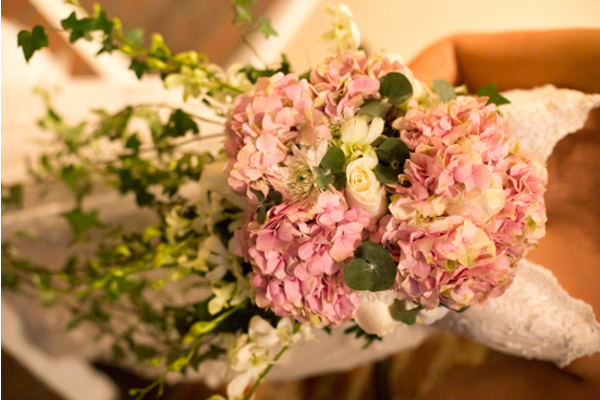 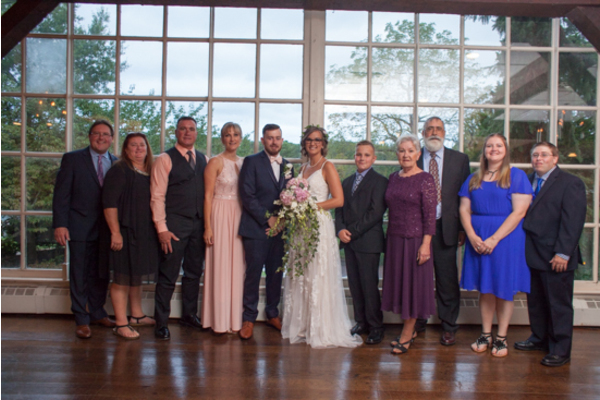 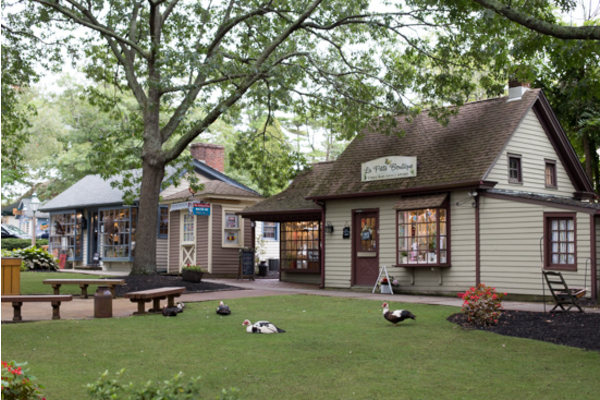 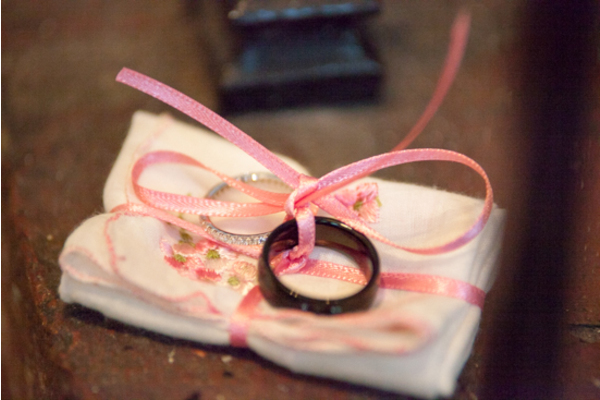 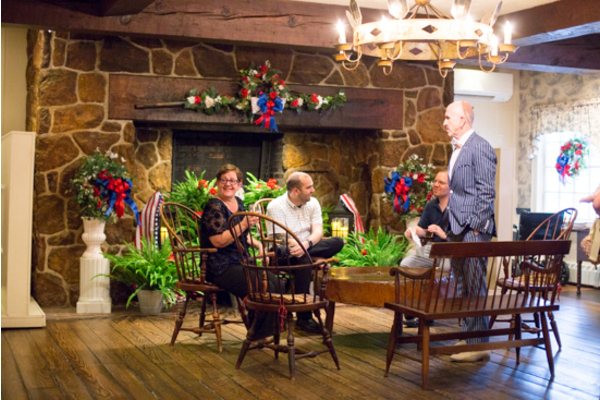 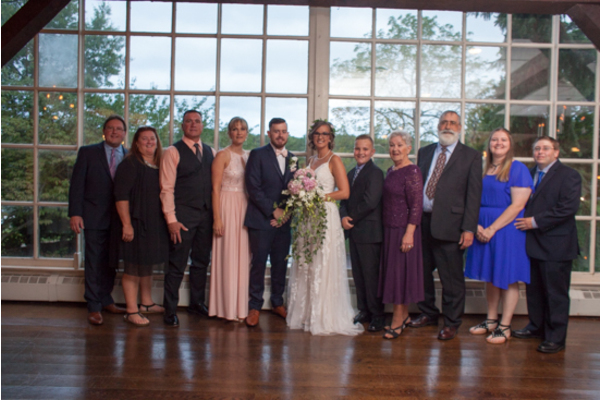 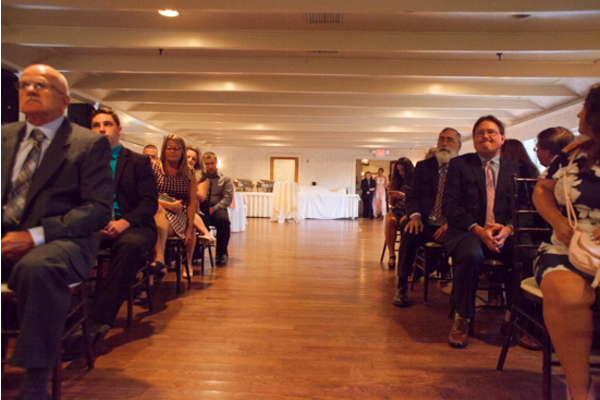 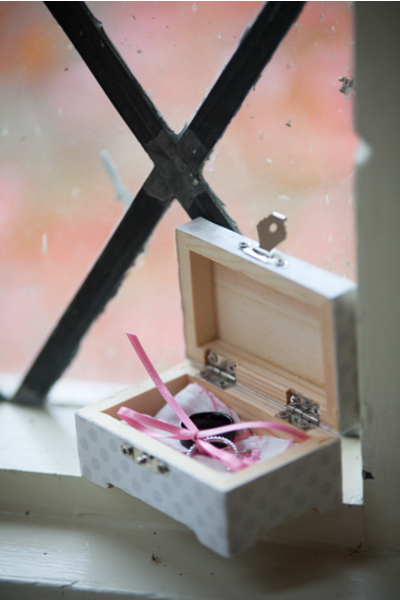 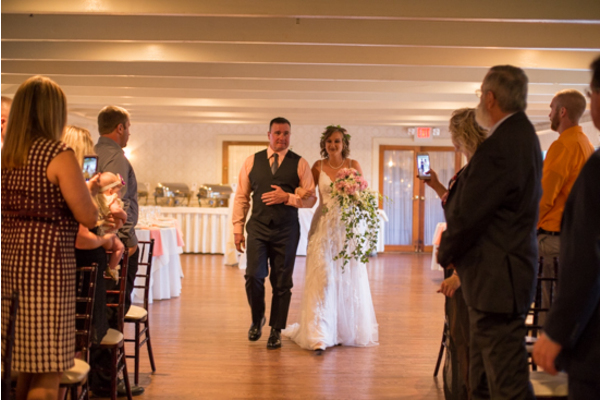 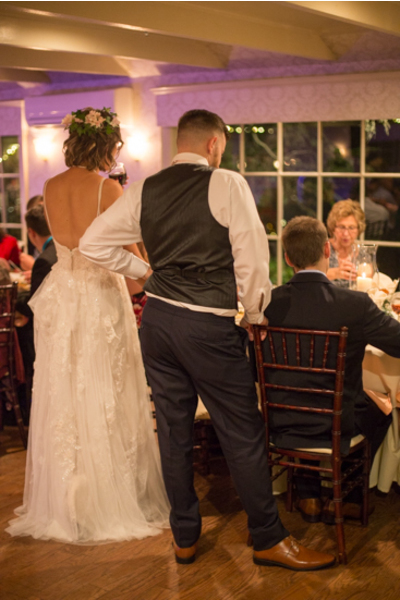 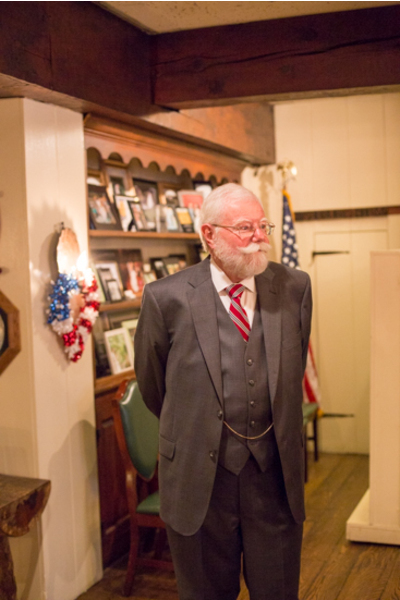 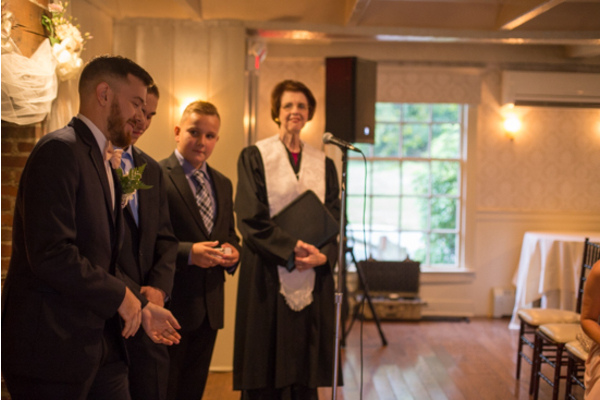 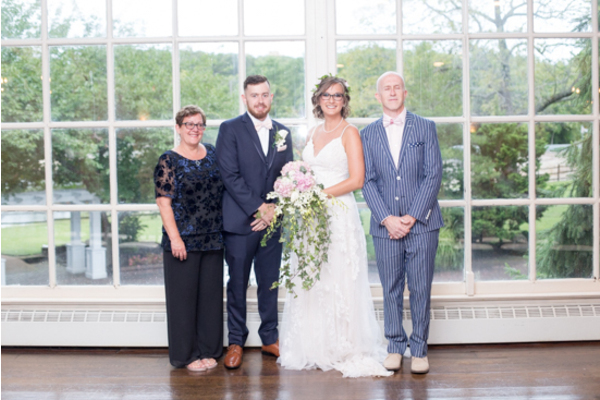 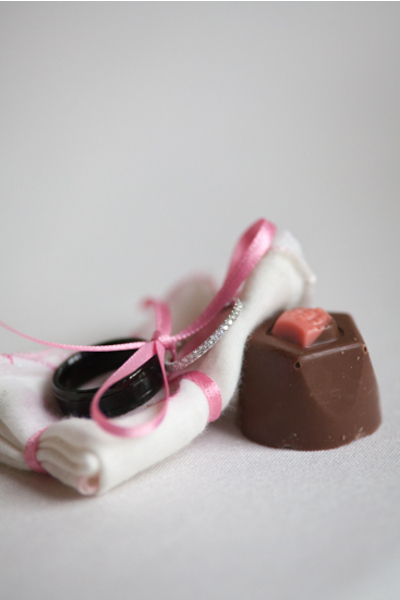 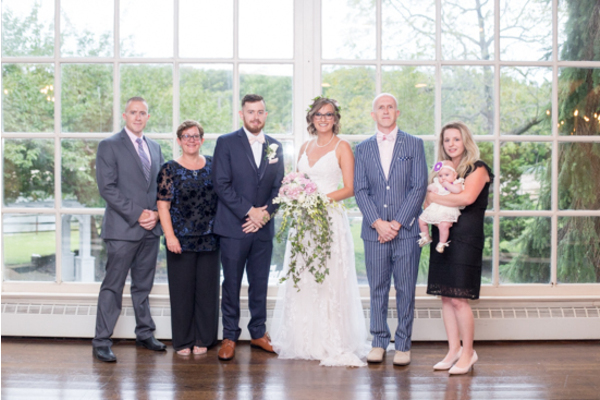 They tied the knot at The Historic Smithville Inn located in Galloway NJ. 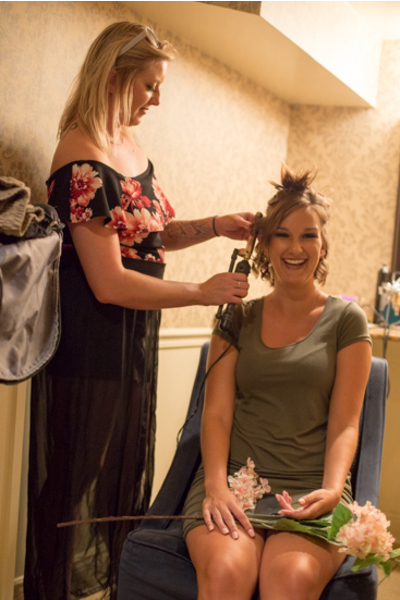 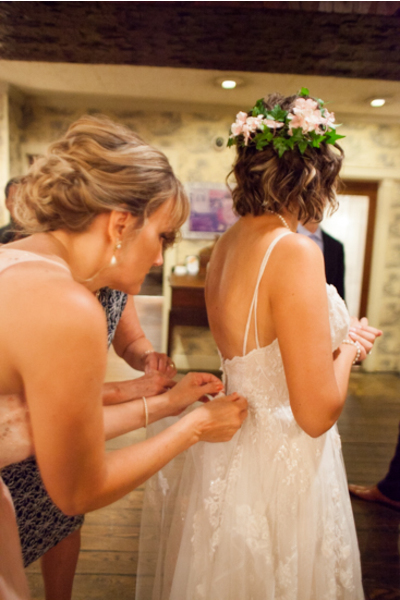 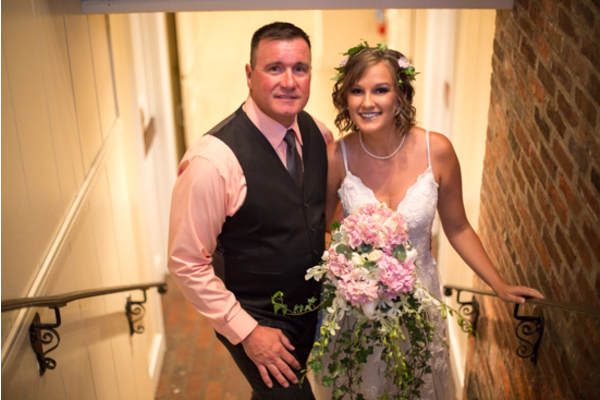 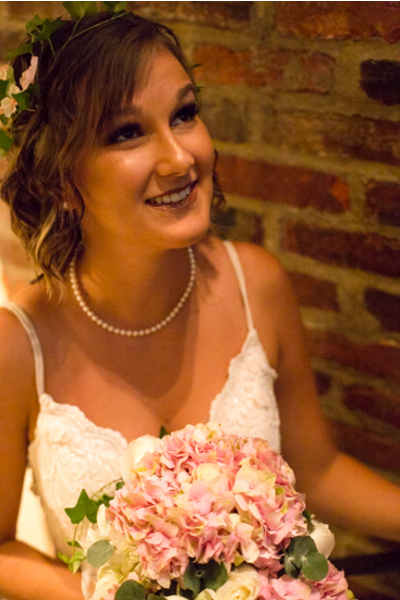 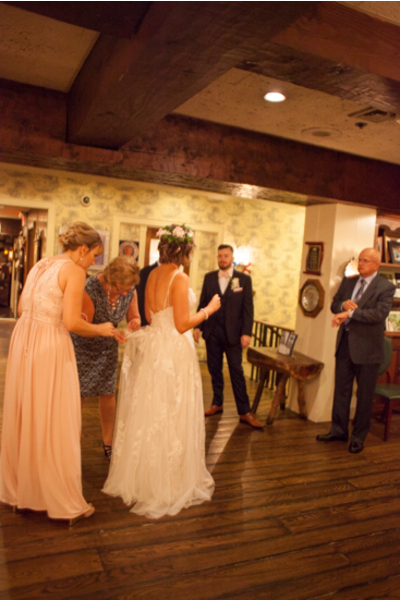 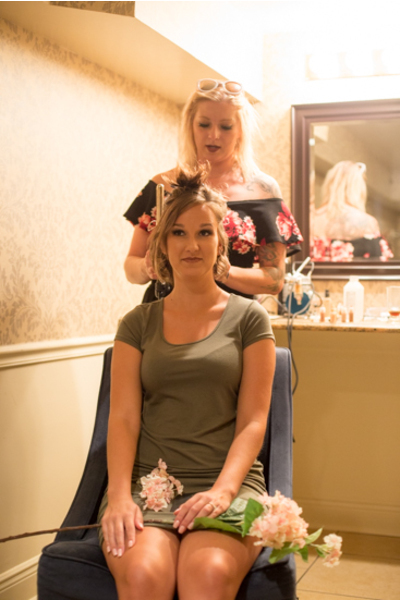 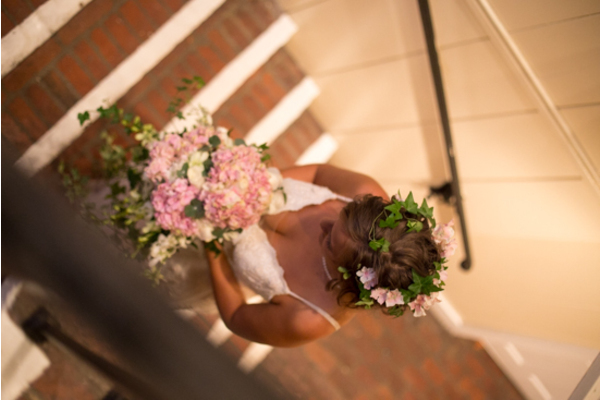 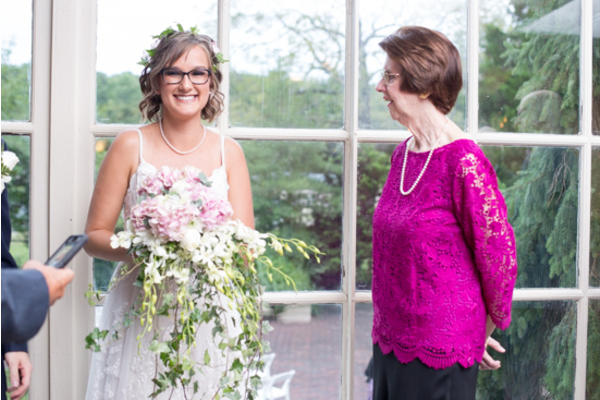 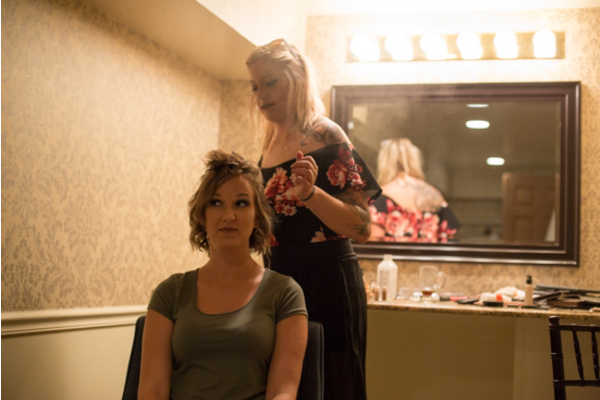 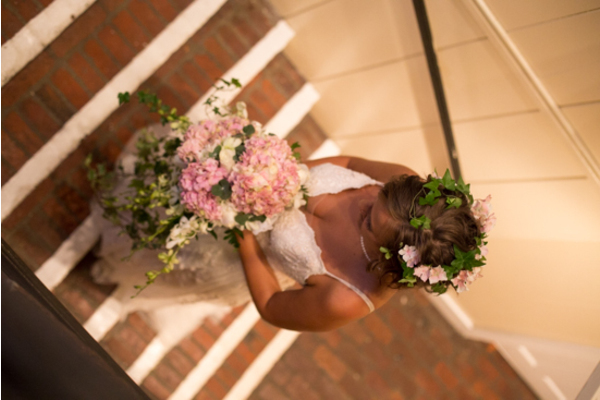 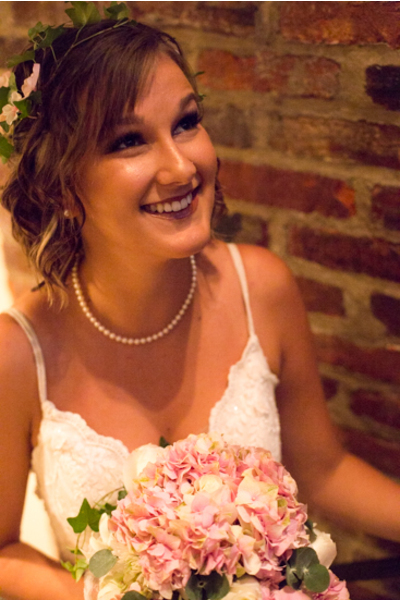 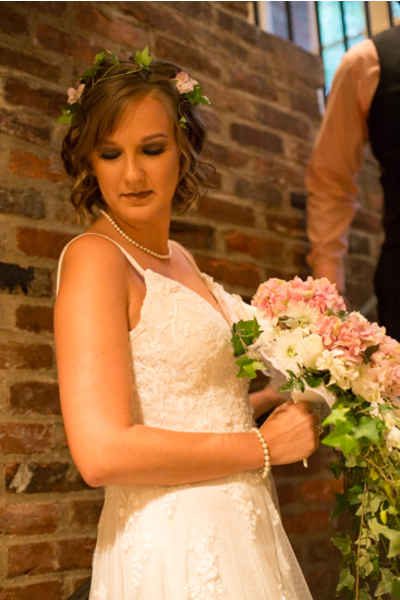 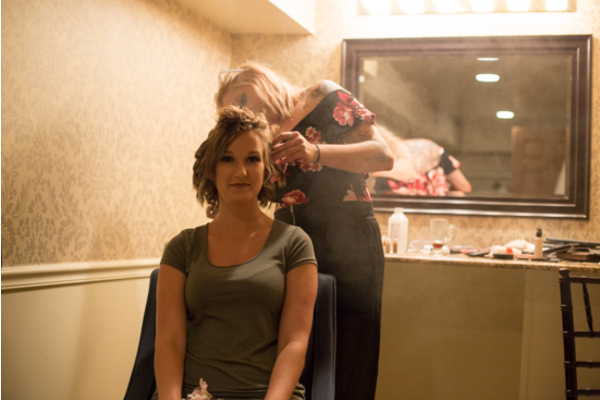 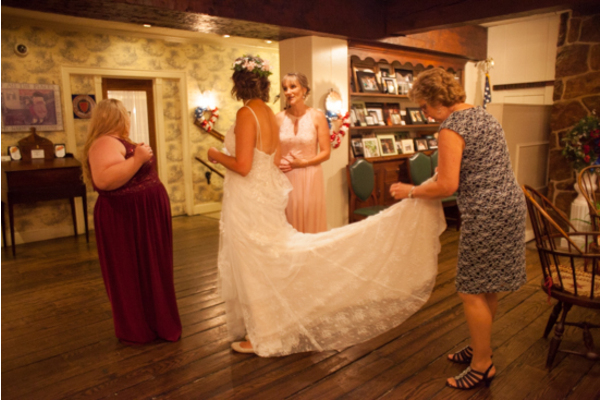 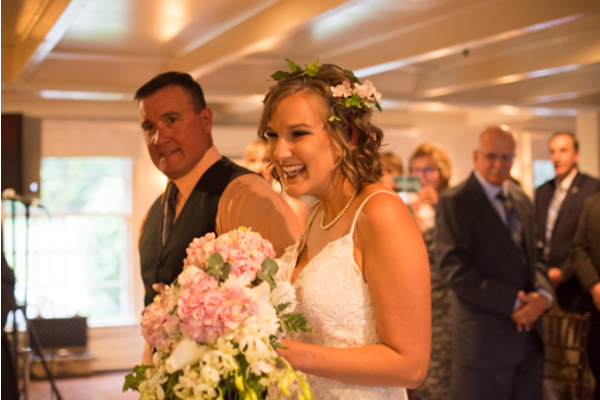 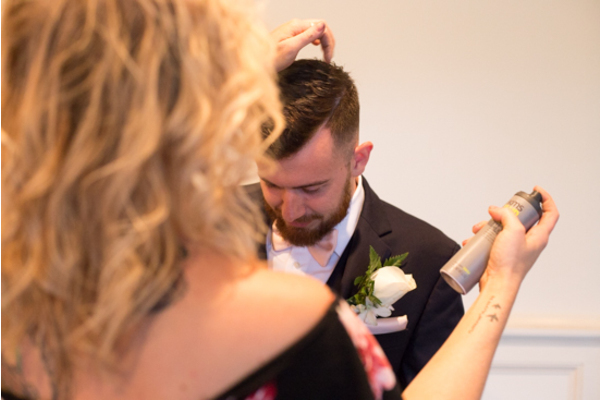 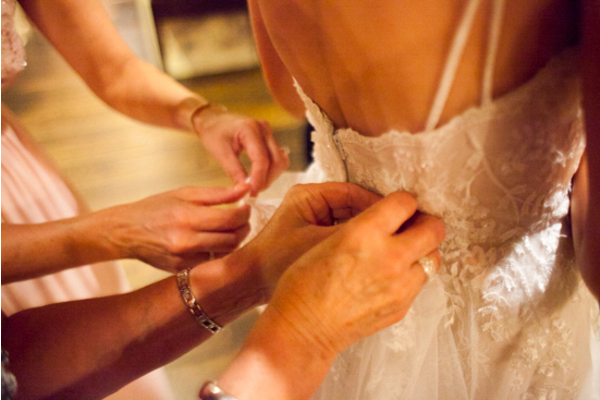 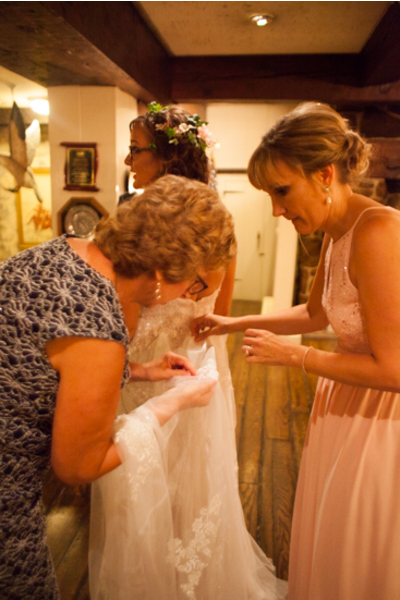 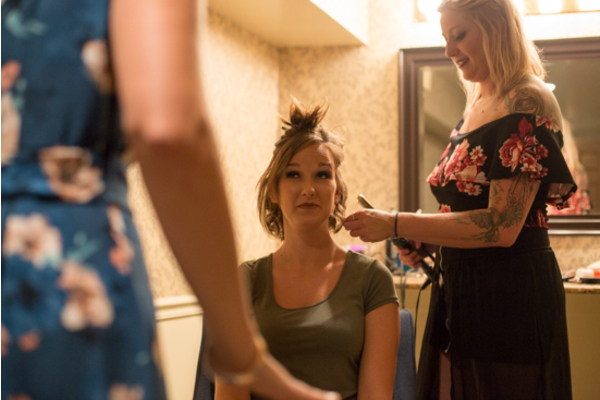 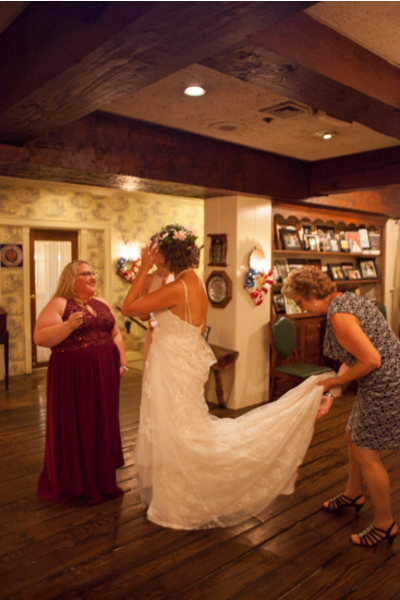 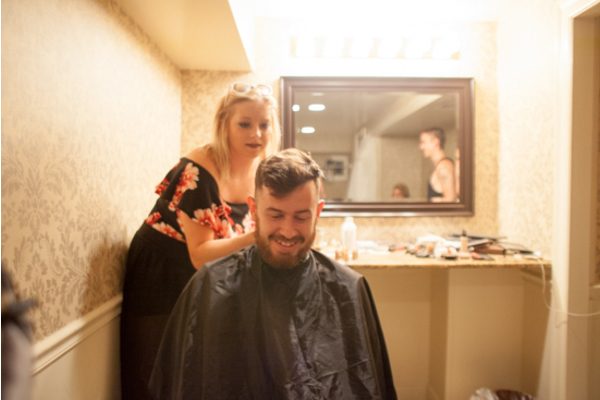 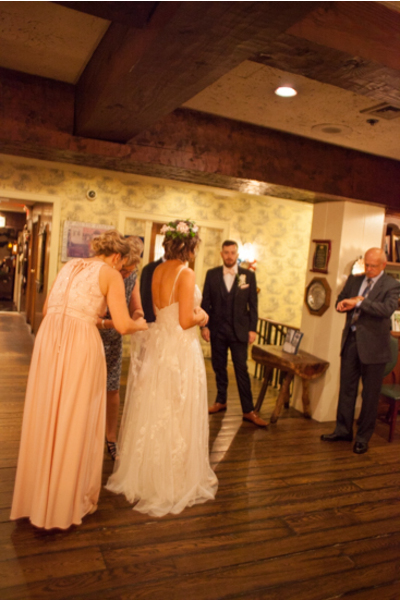 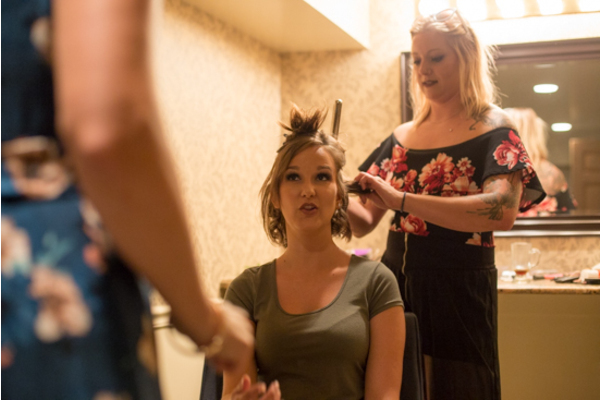 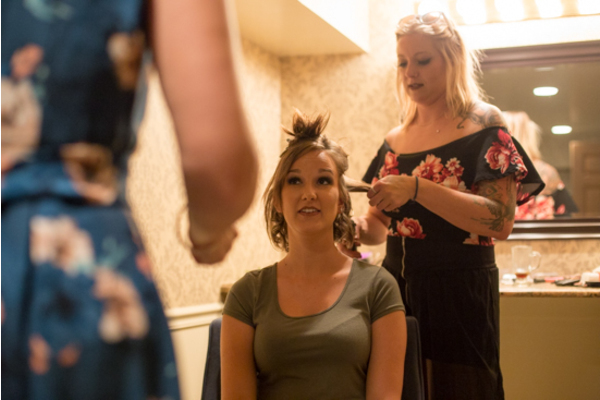 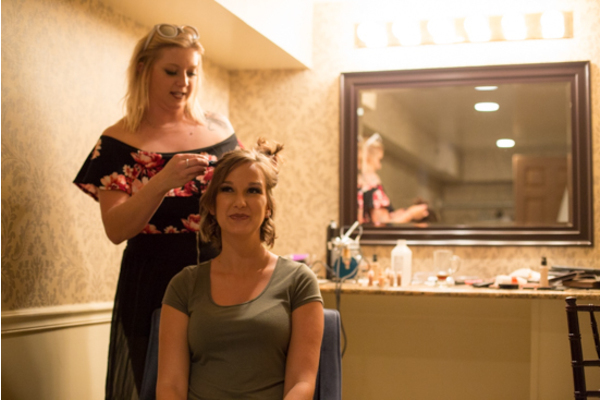 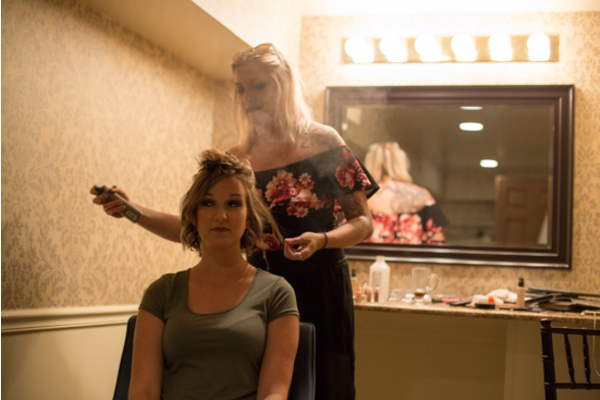 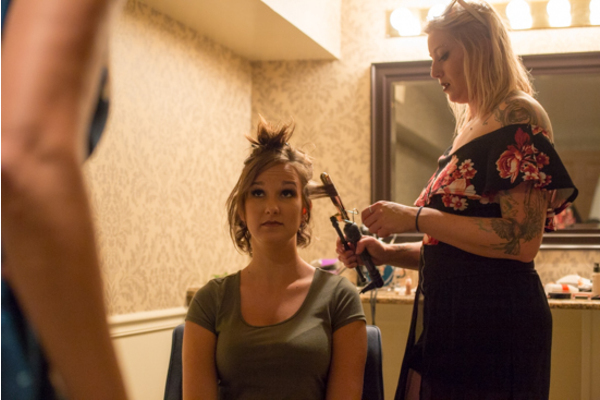 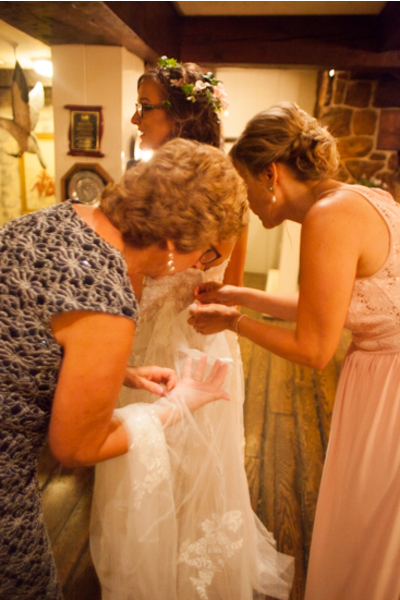 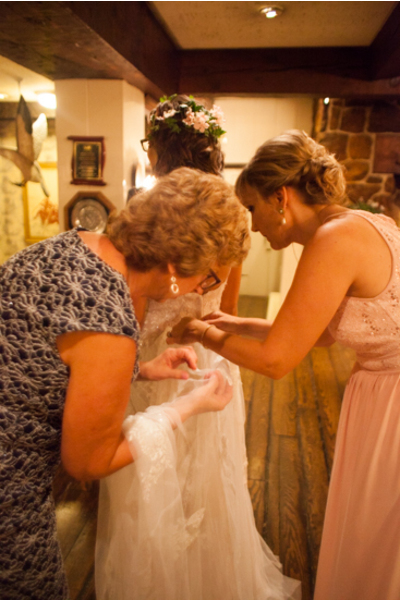 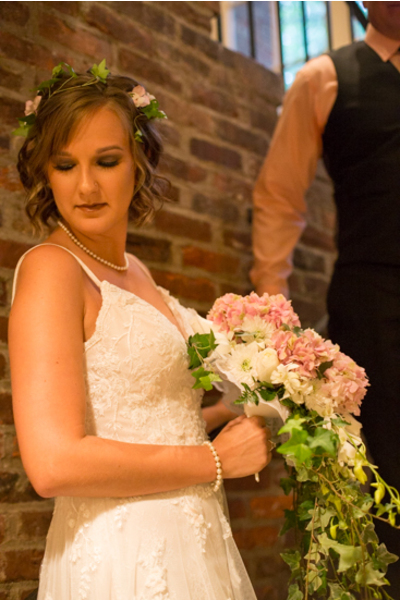 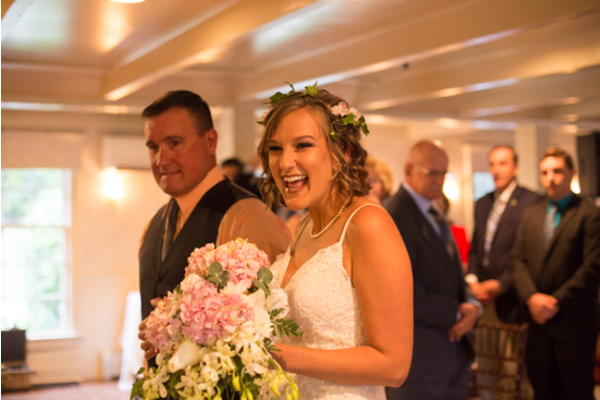 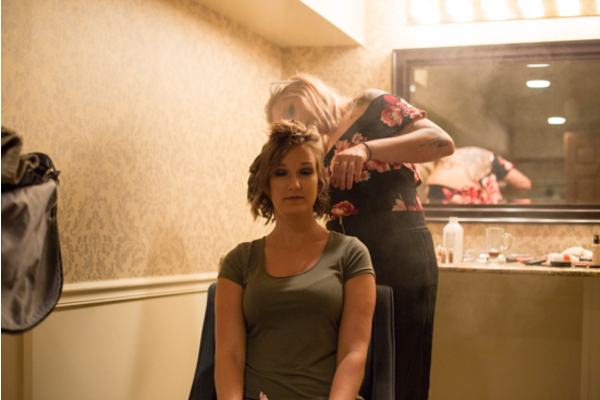 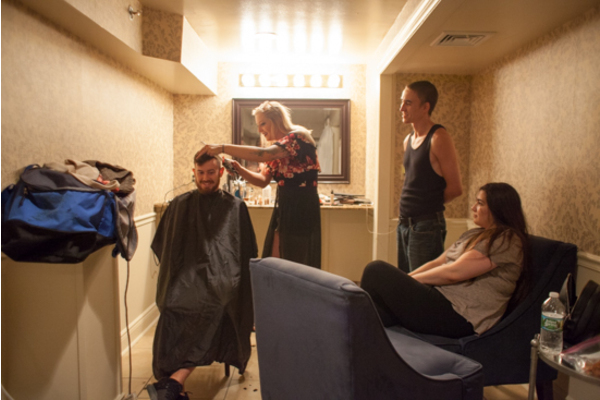 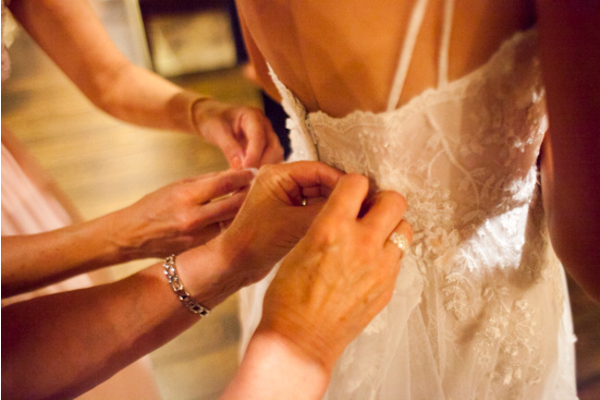 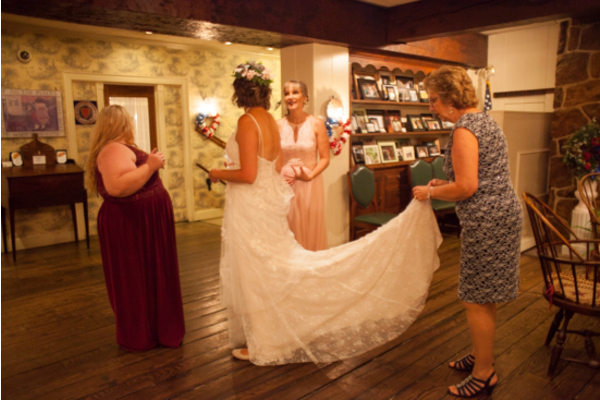 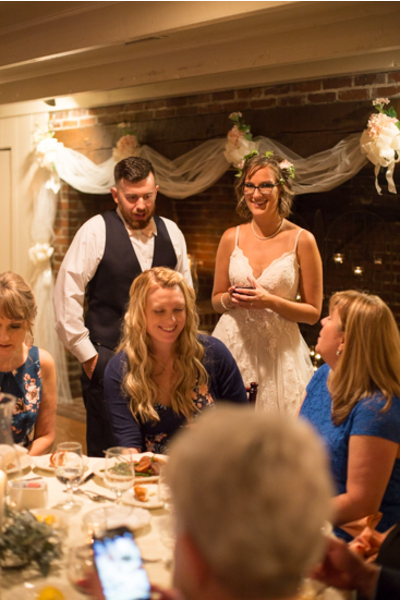 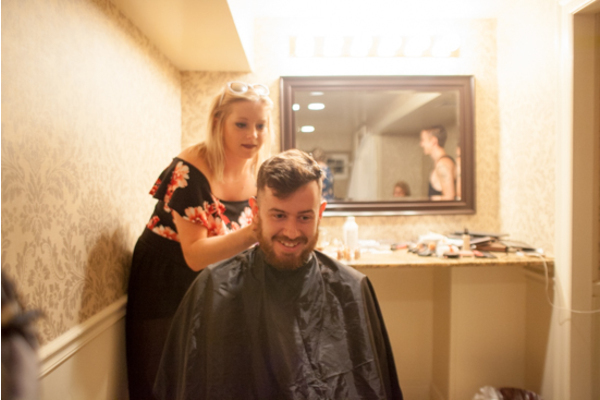 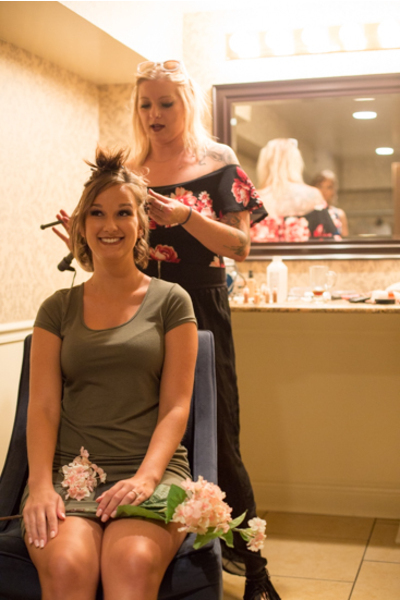 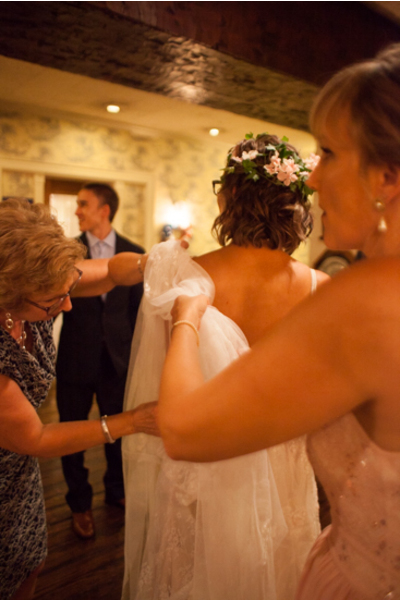 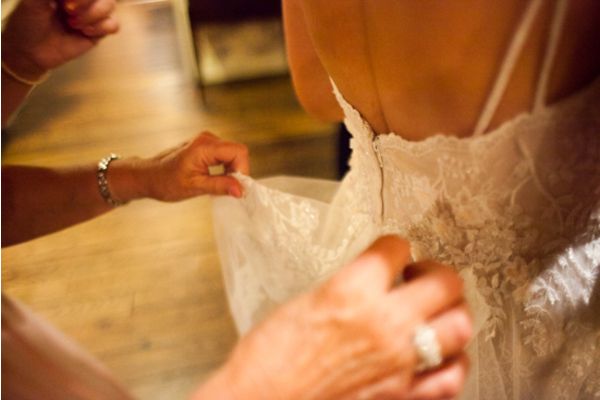 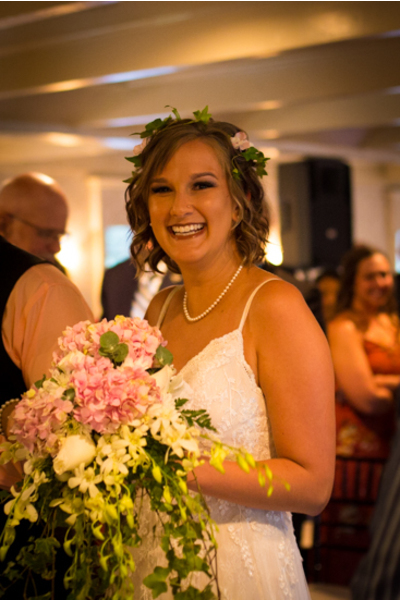 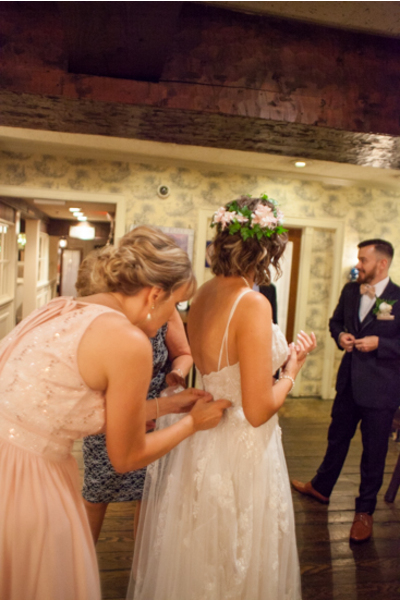 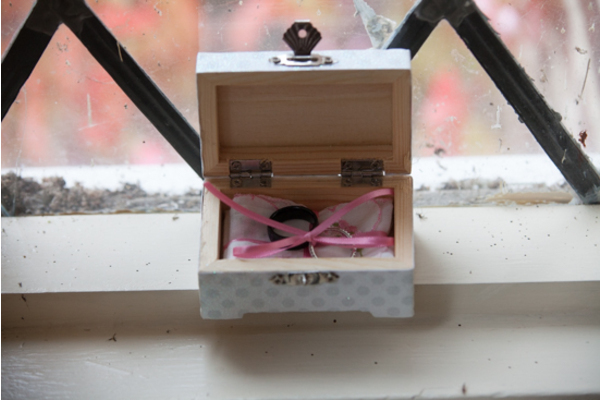 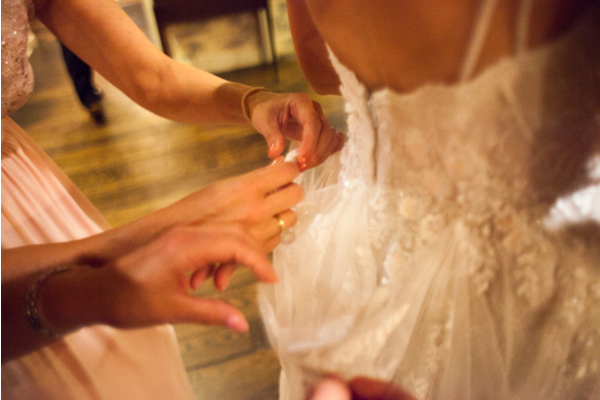 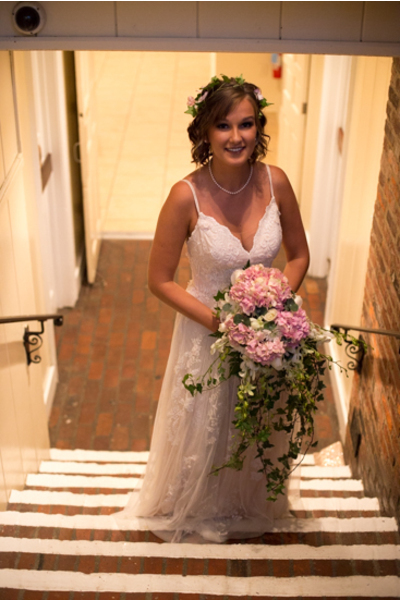 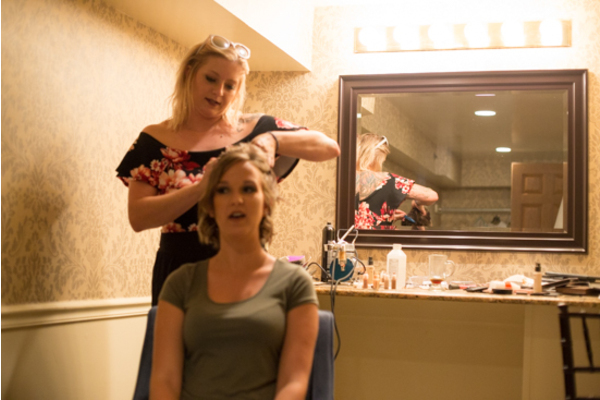 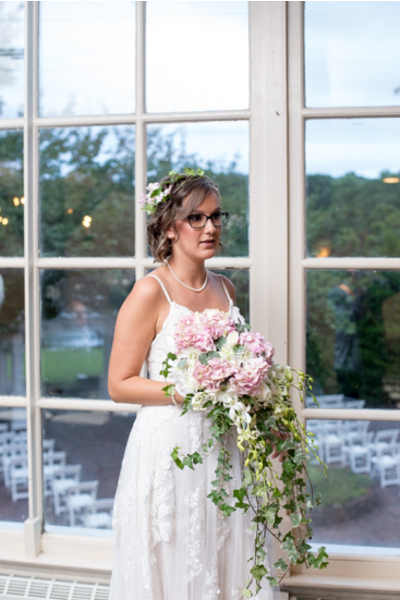 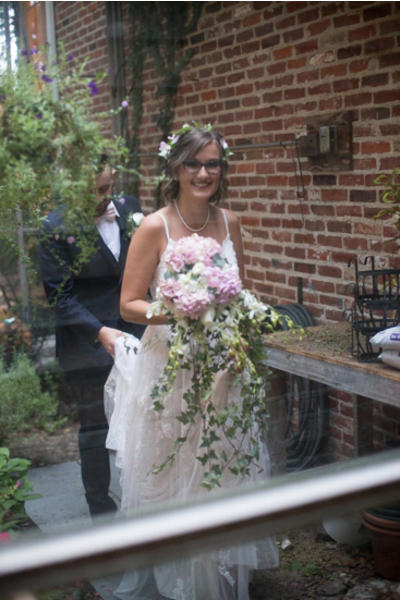 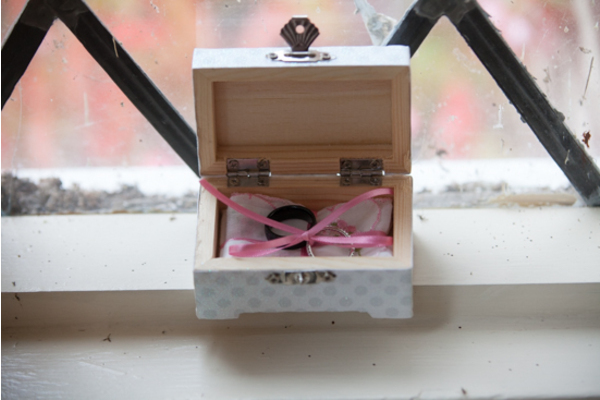 Danielle began her fairy tale wedding day getting primped to perfection by her hair stylist. 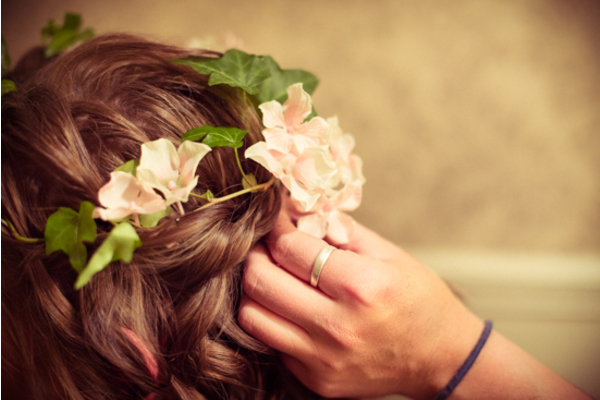 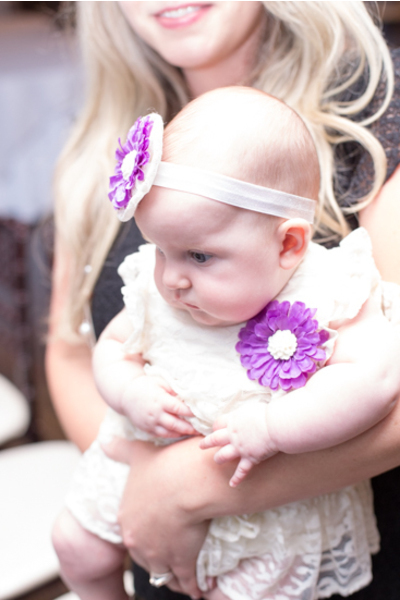 In addition, she finished her look with a beautiful floral headpiece! 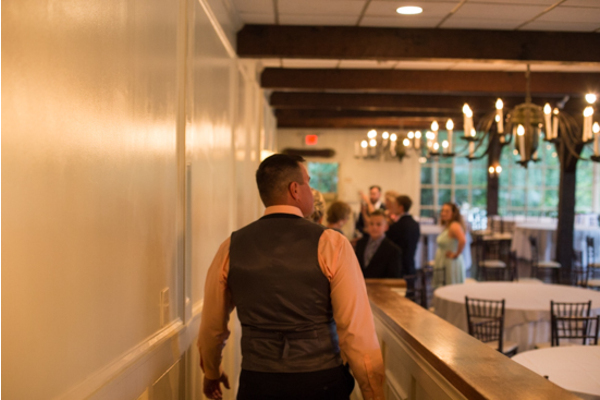 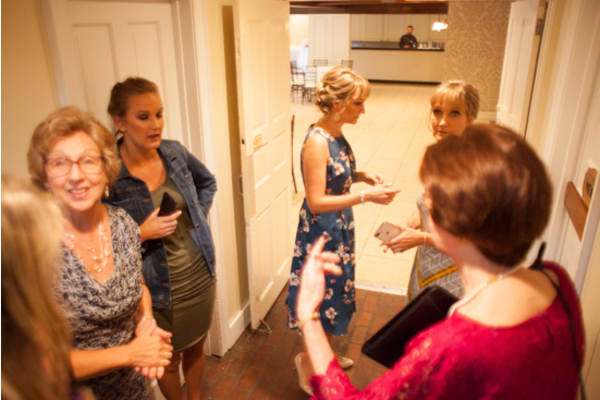 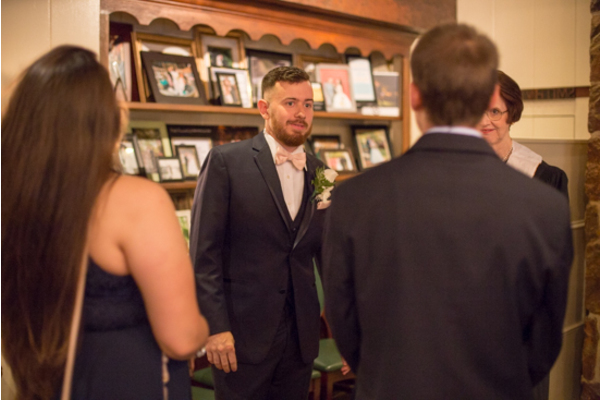 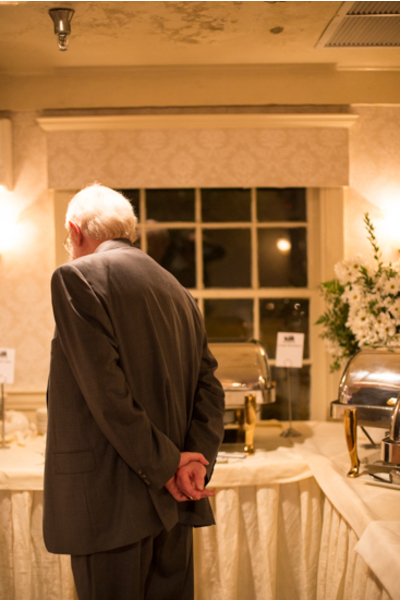 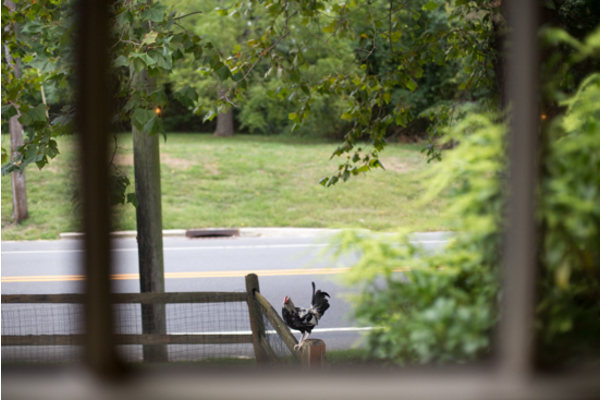 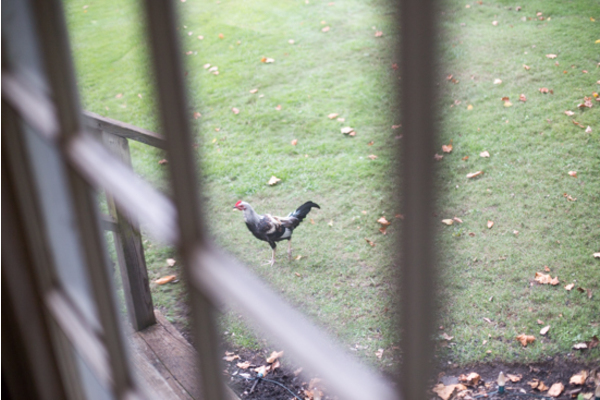 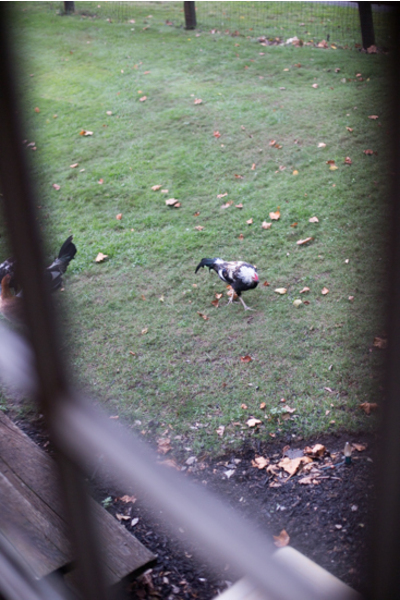 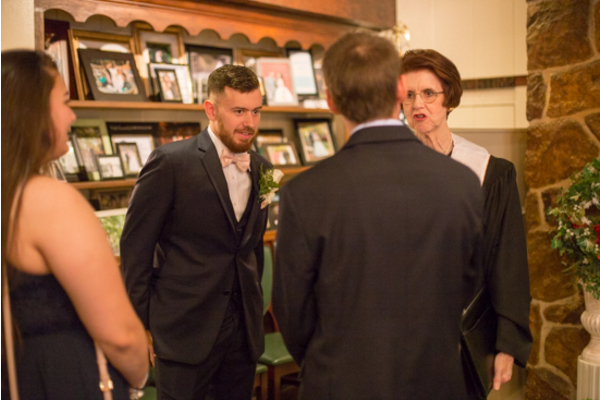 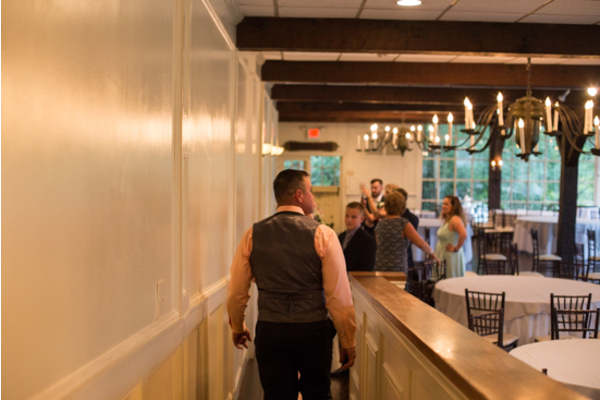 Meanwhile, Josh was upstairs with his loved ones greeting guests as they arrived. 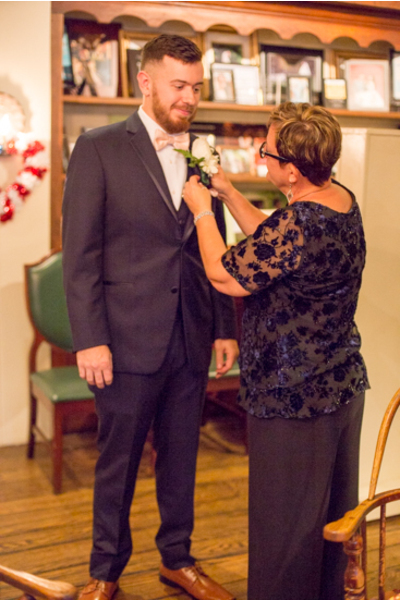 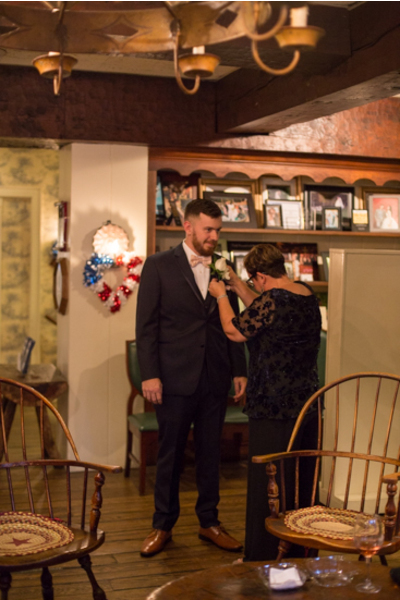 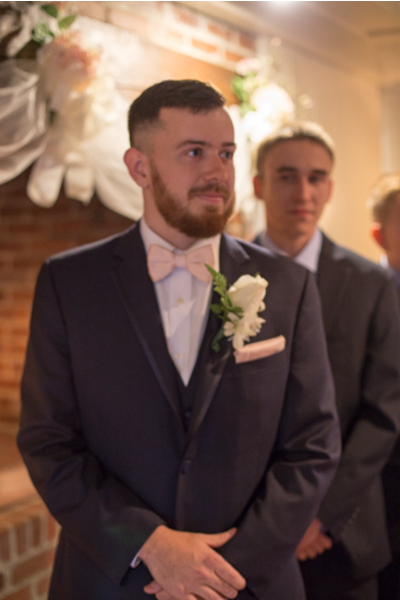 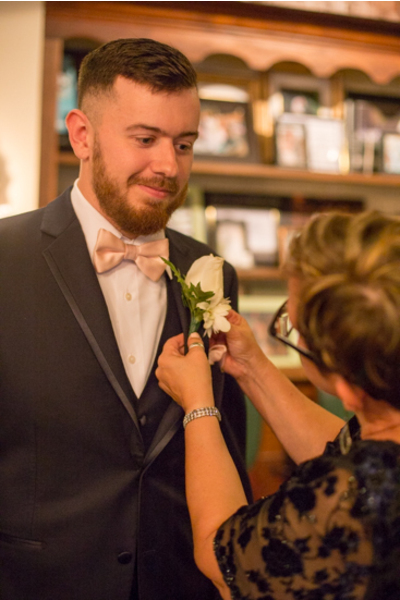 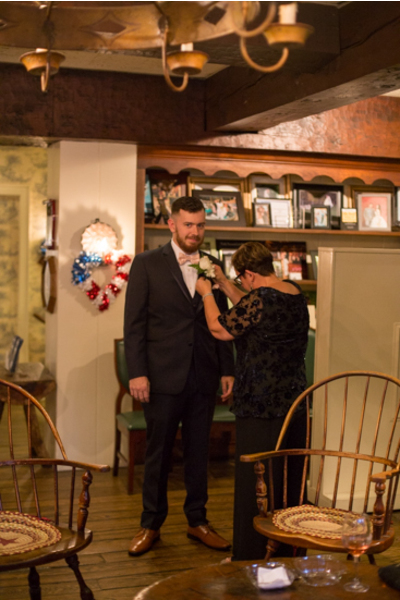 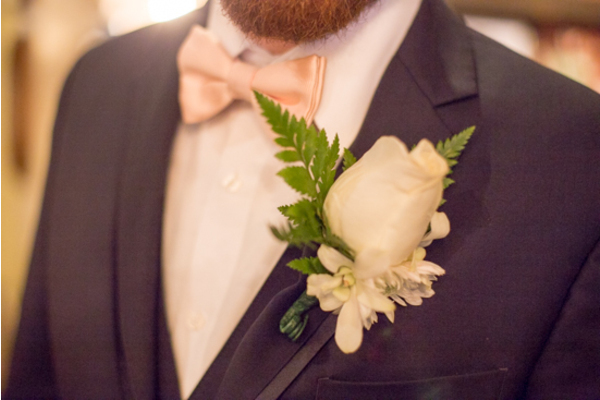 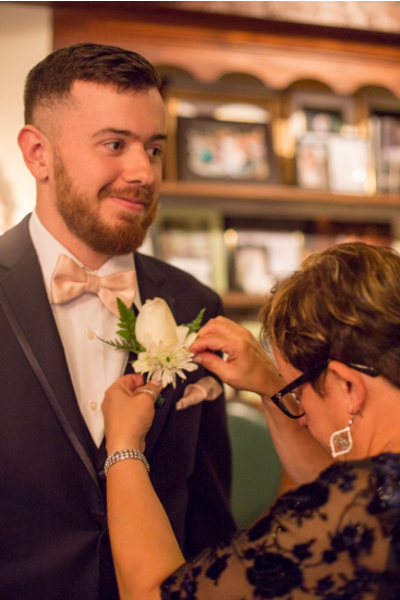 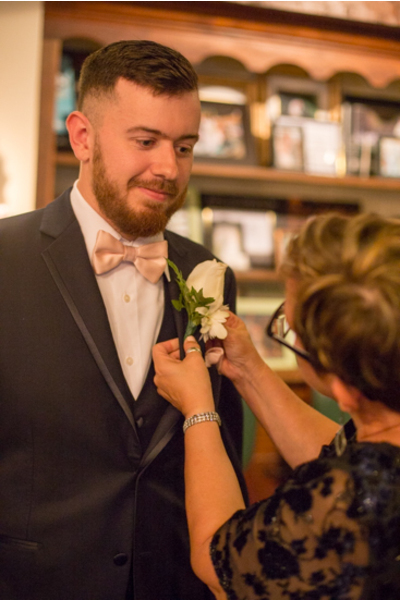 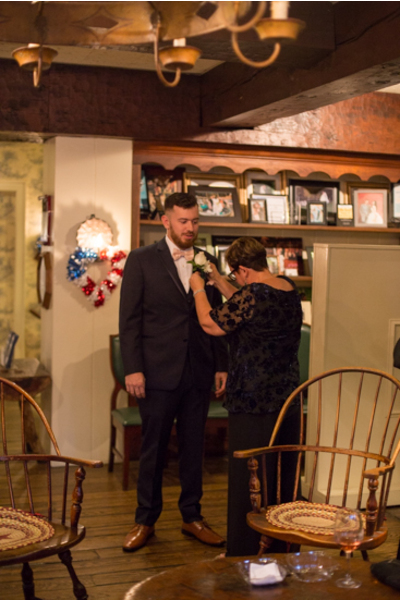 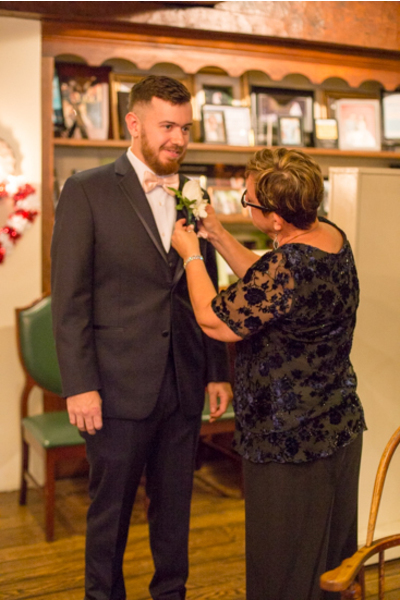 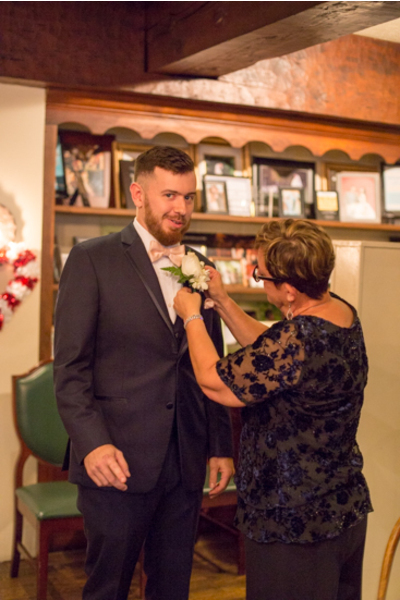 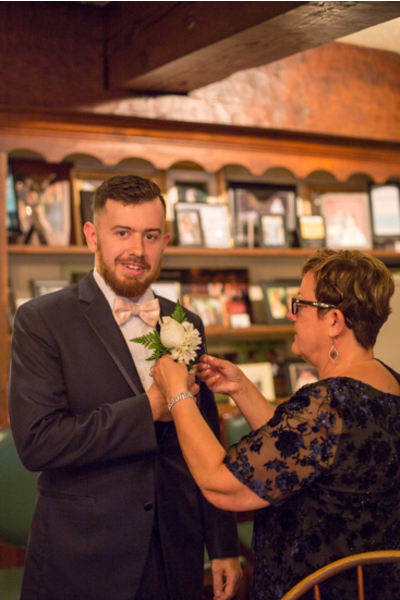 Once the bow tie was centered, he was ready to head into the main event! 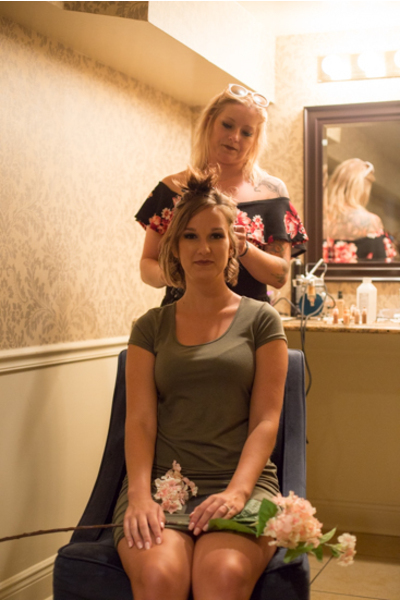 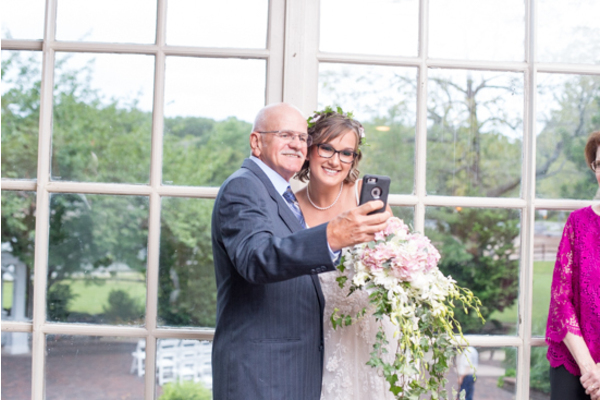 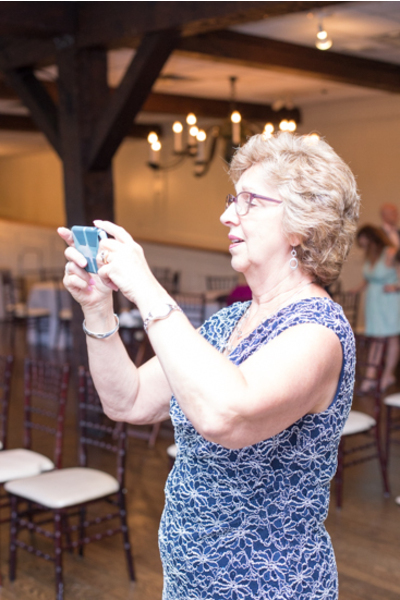 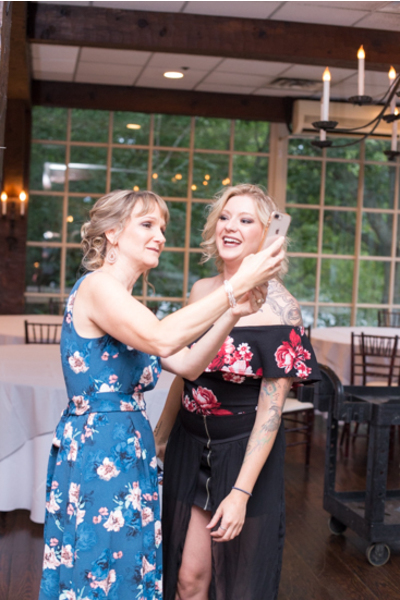 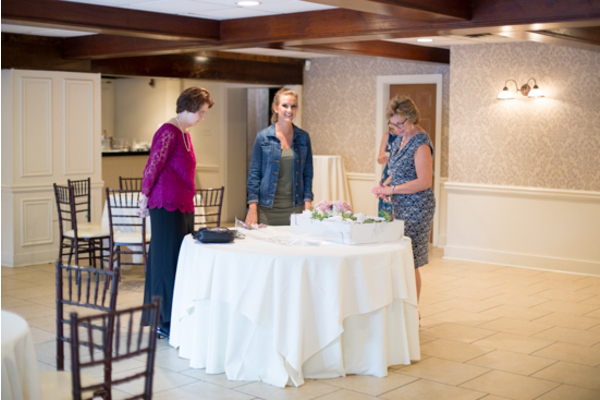 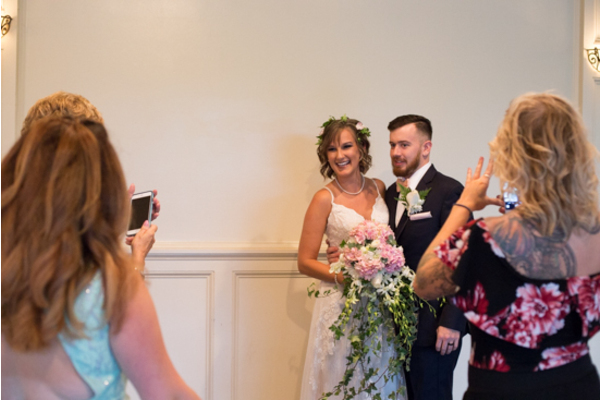 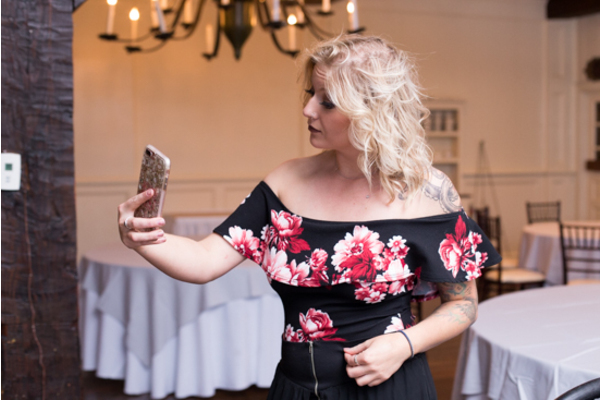 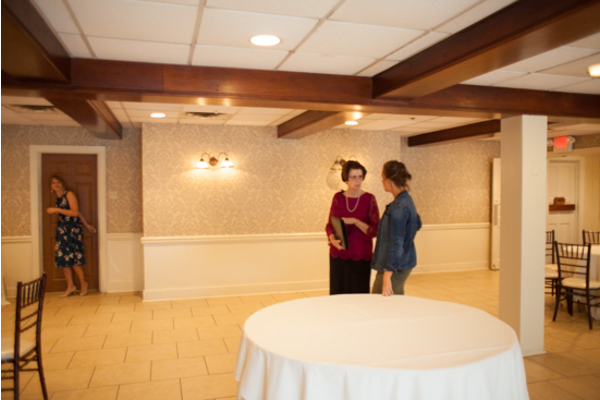 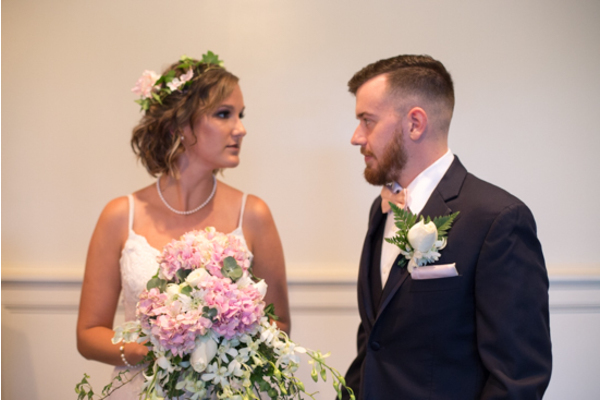 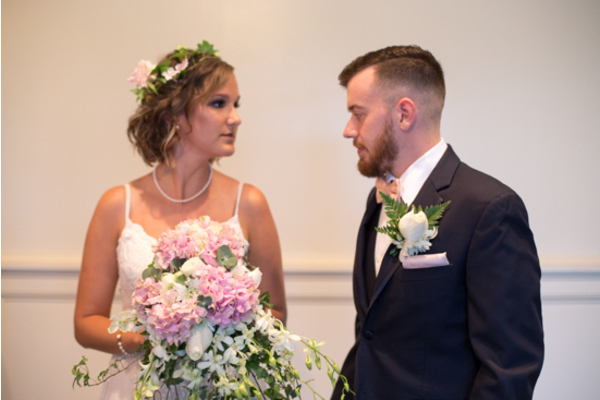 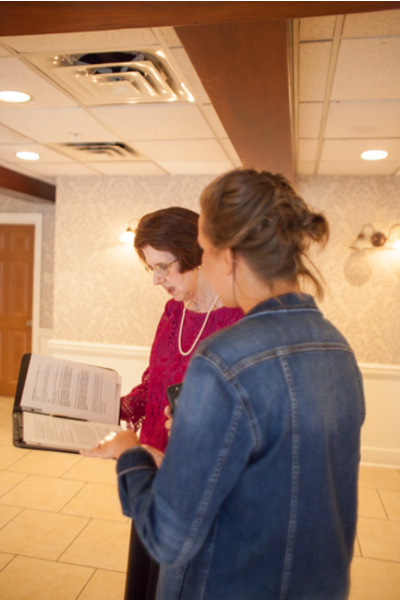 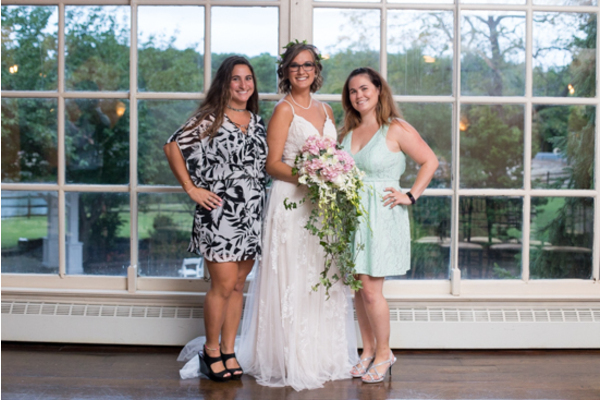 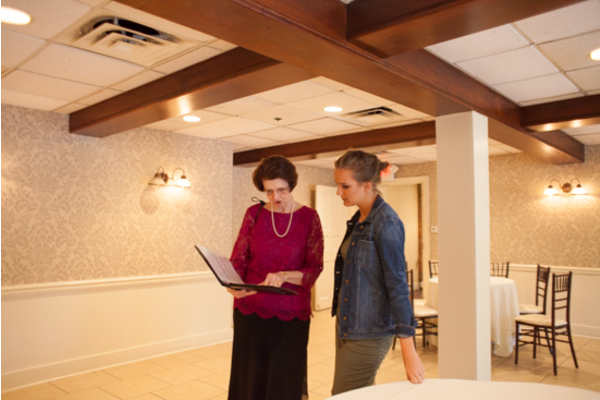 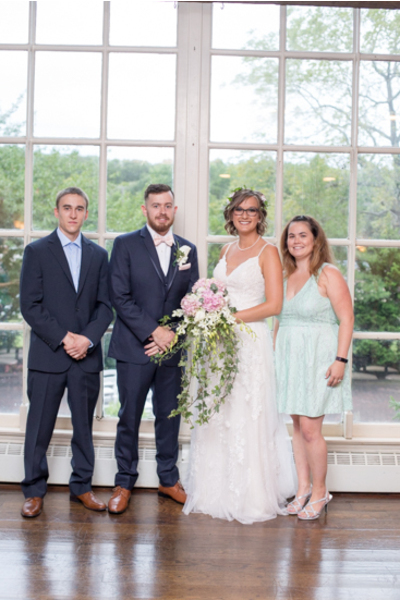 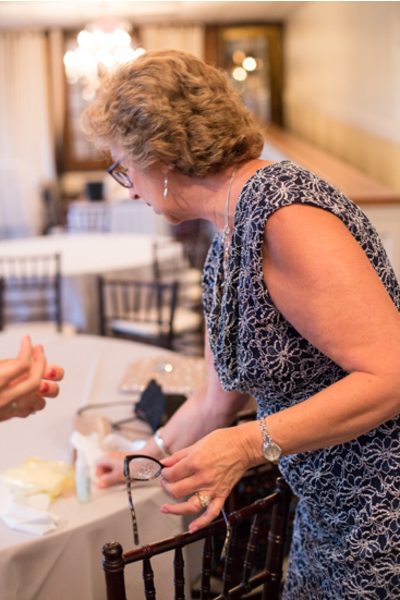 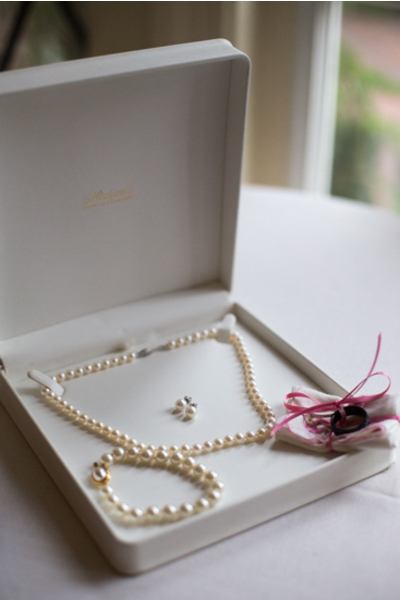 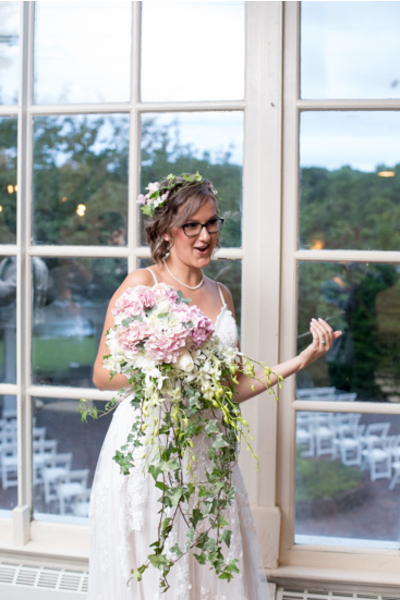 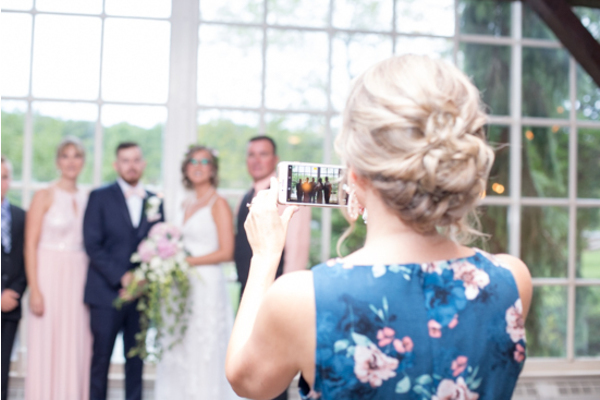 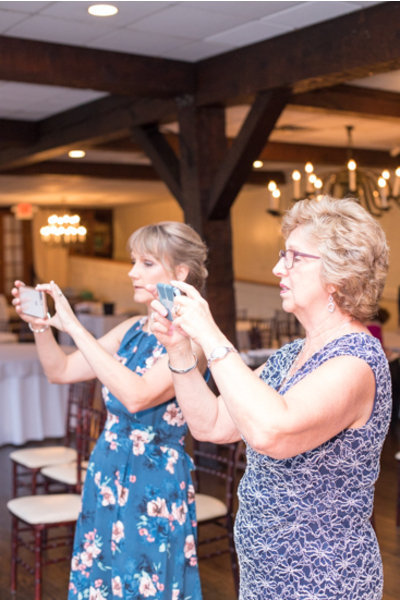 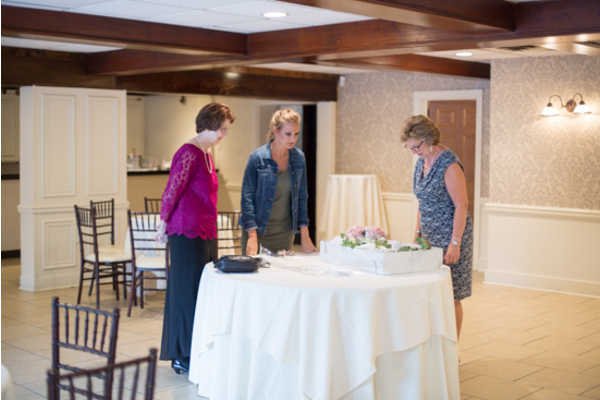 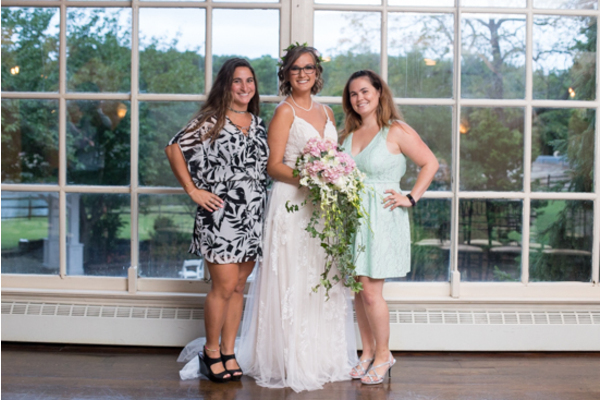 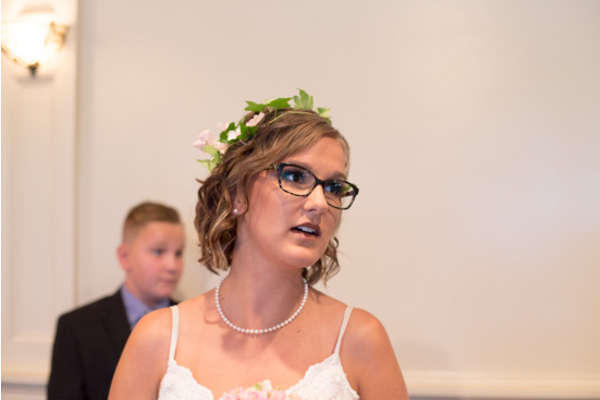 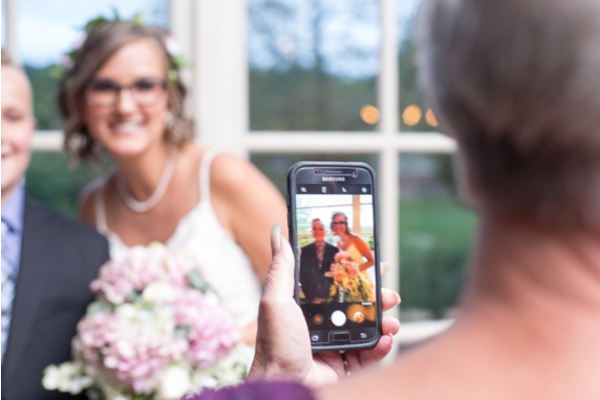 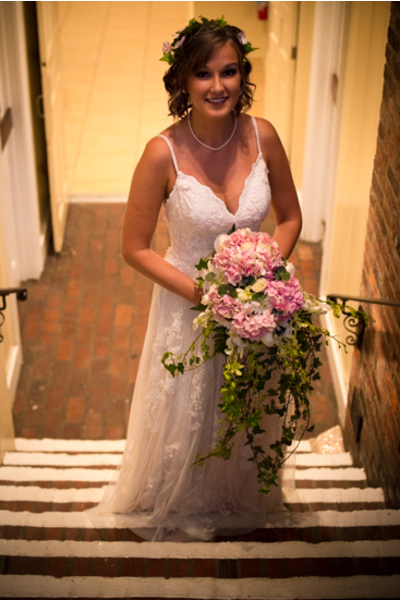 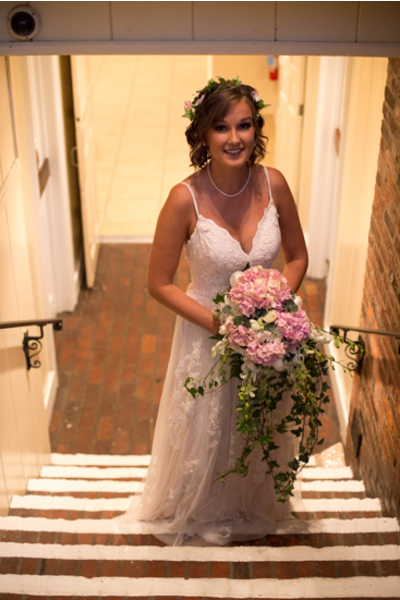 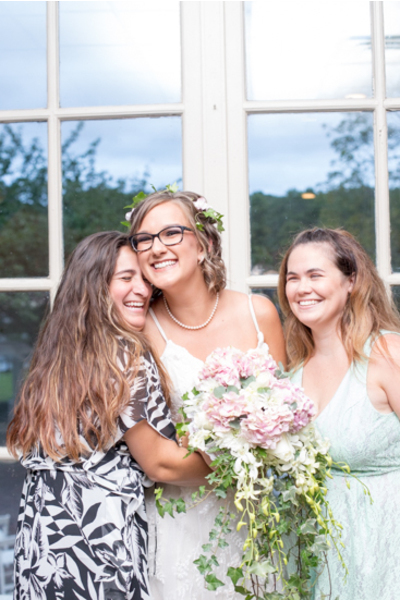 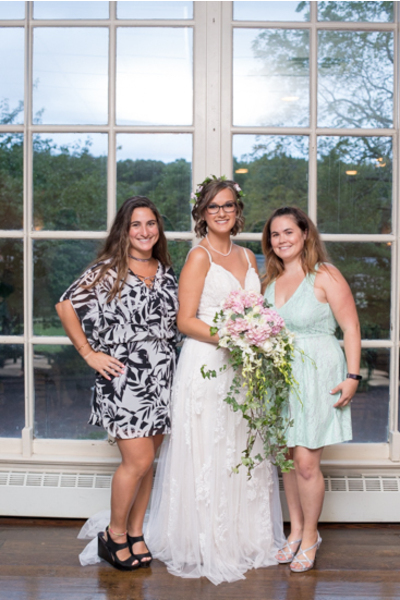 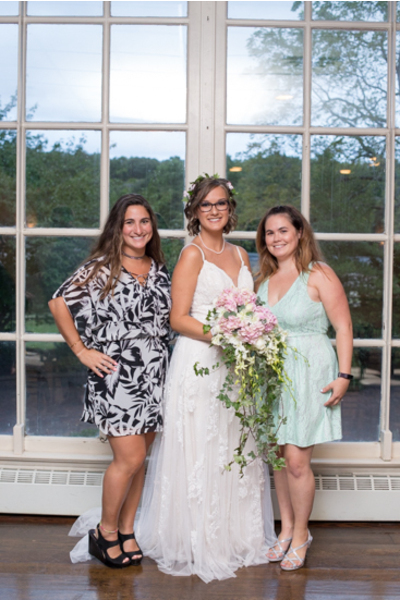 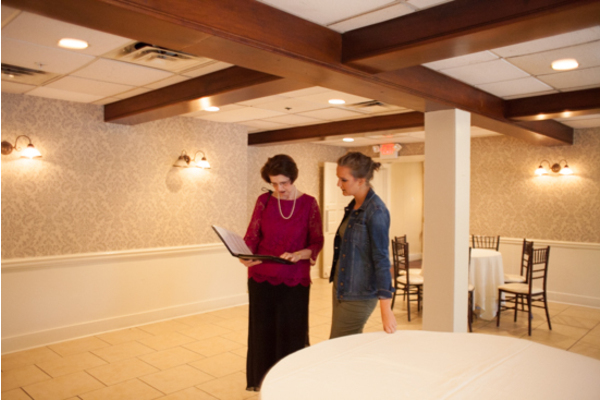 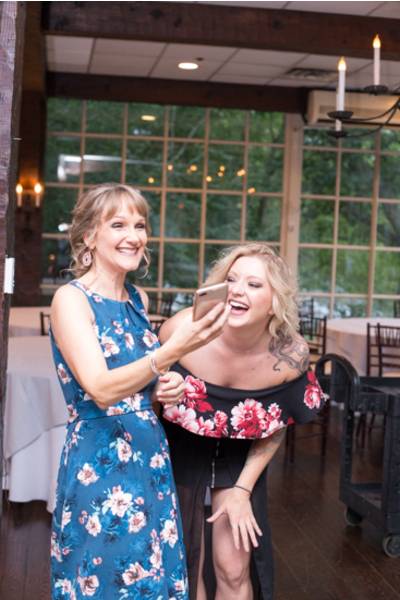 Before the ceremony, our NJ Wedding Photographer was with the bride in the bridal suite as she was in her stunning all white wedding dress for the first time that day. 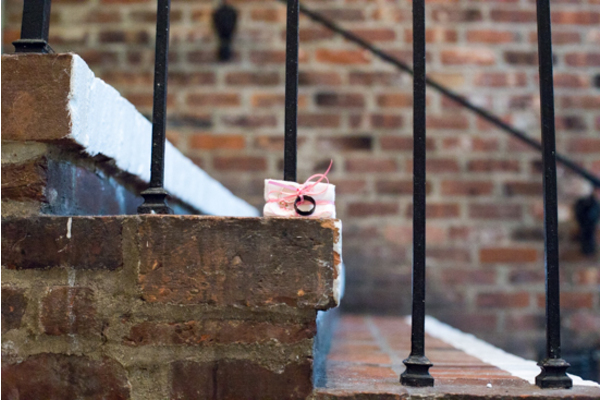 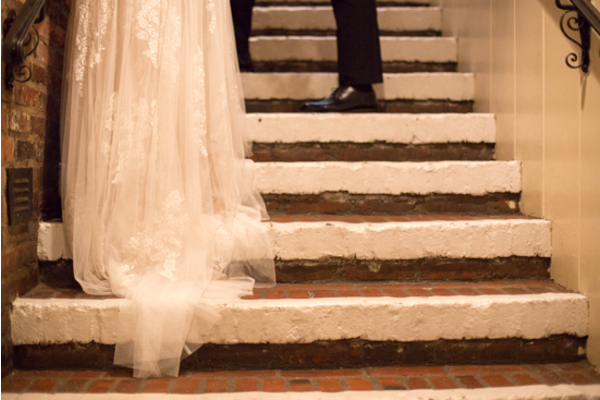 She ascended up the staircase and made her way to see the man of her dreams. 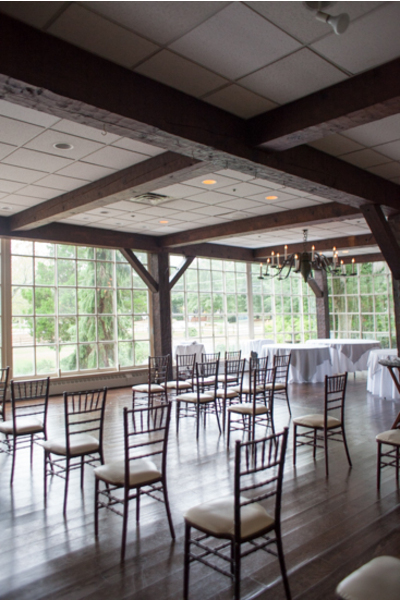 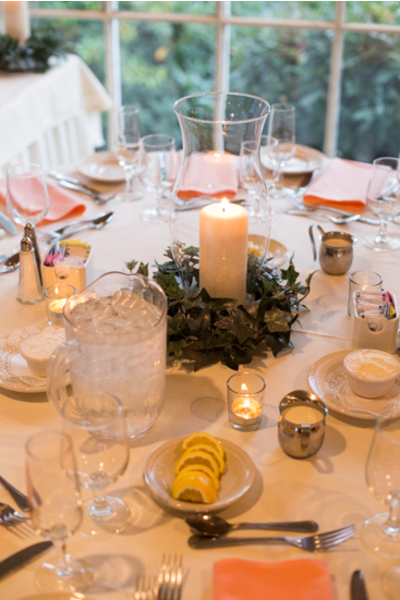 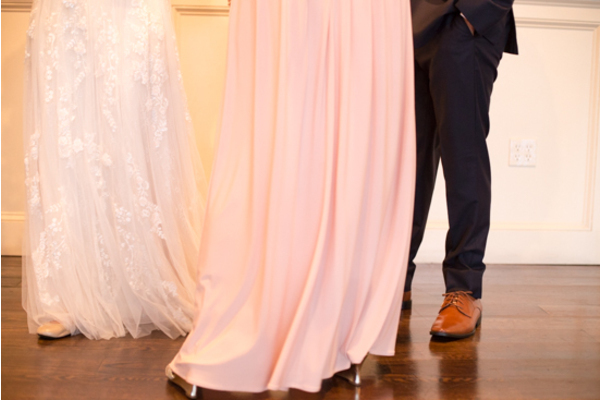 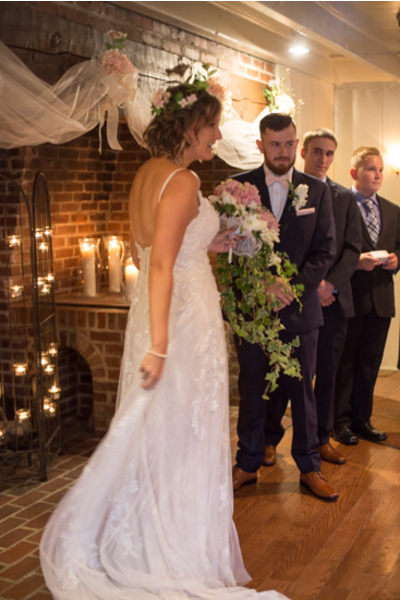 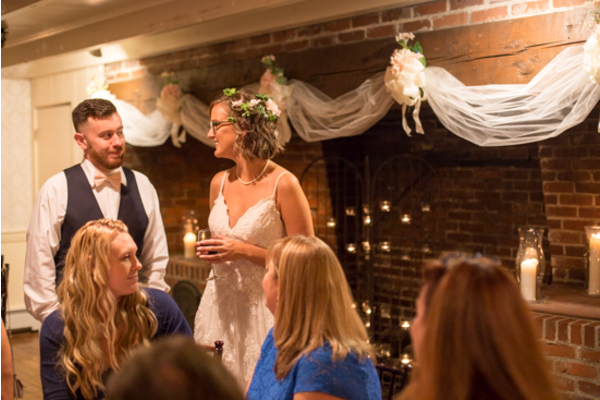 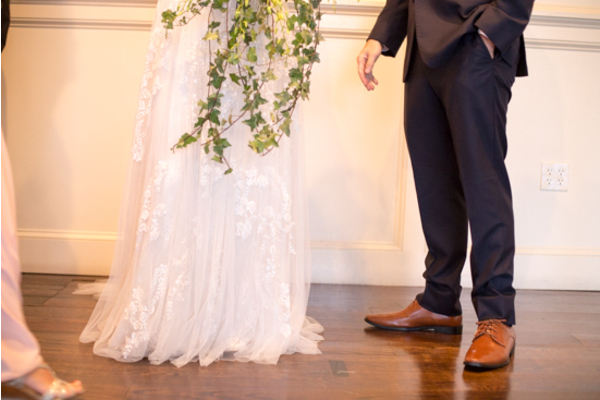 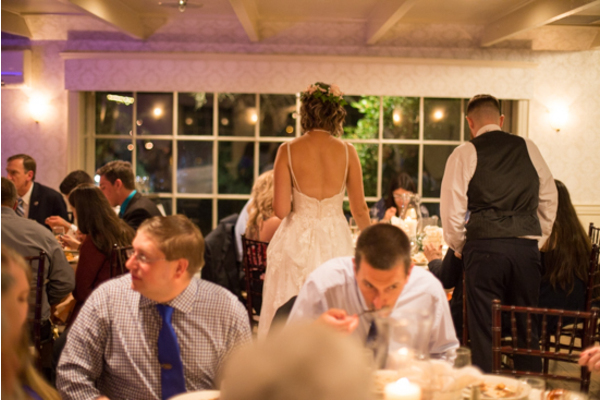 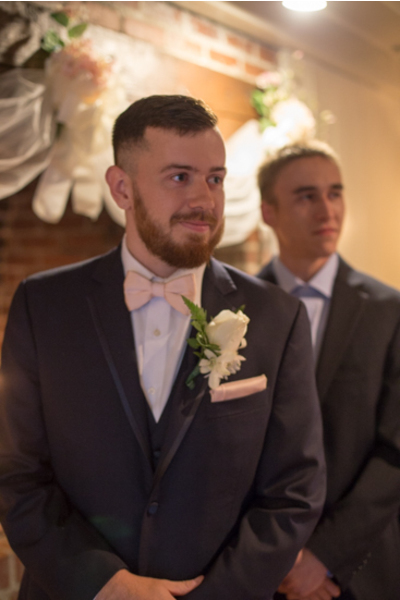 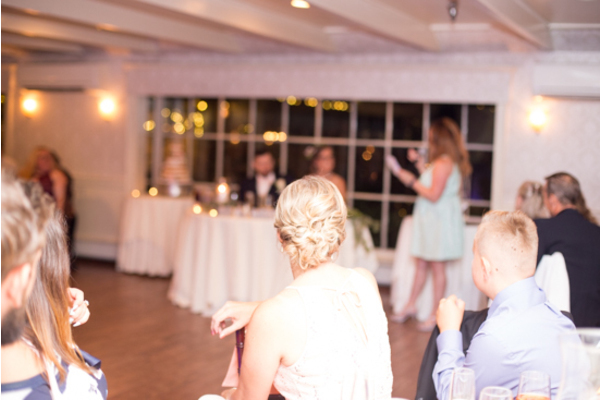 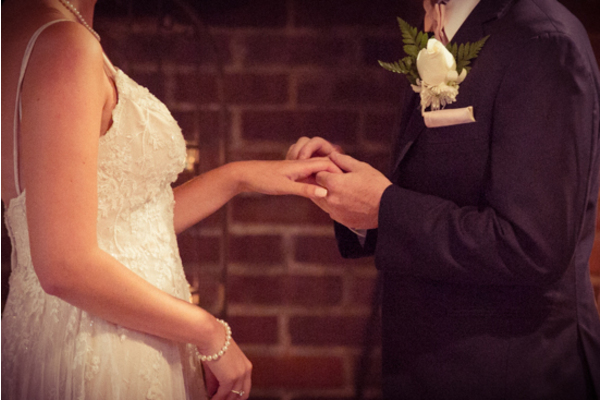 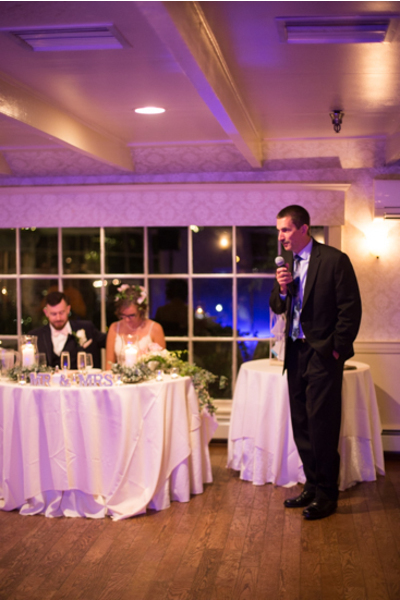 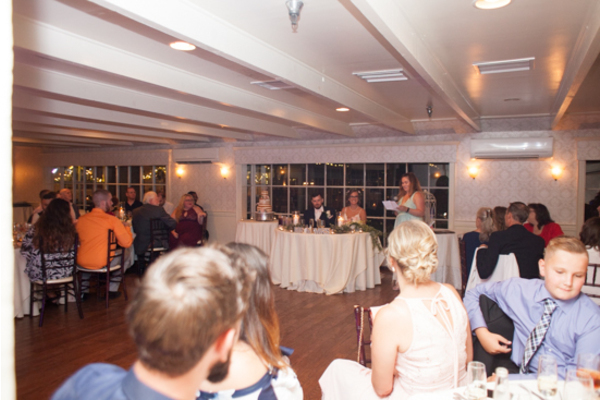 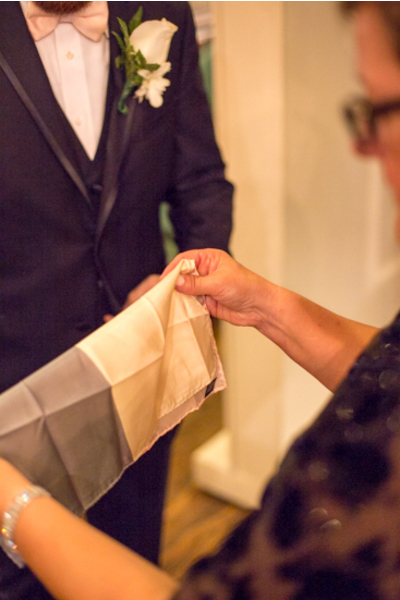 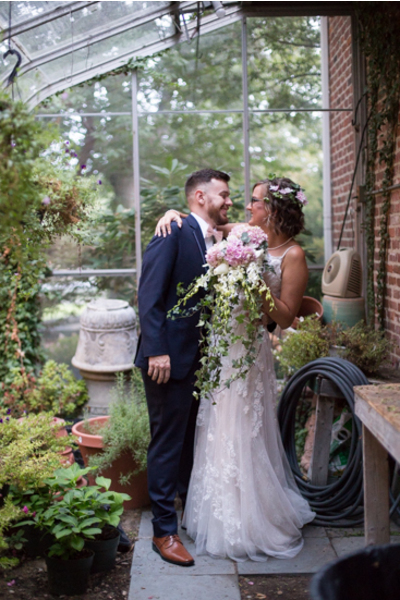 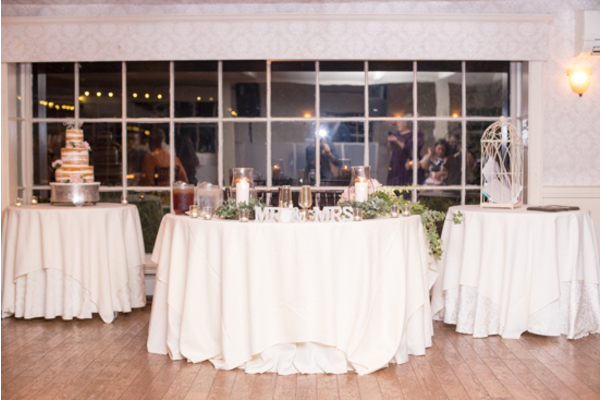 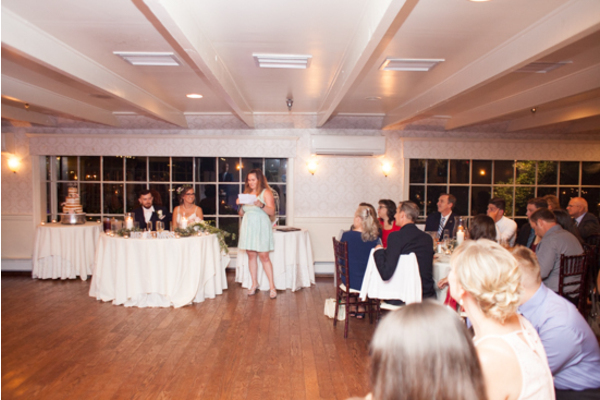 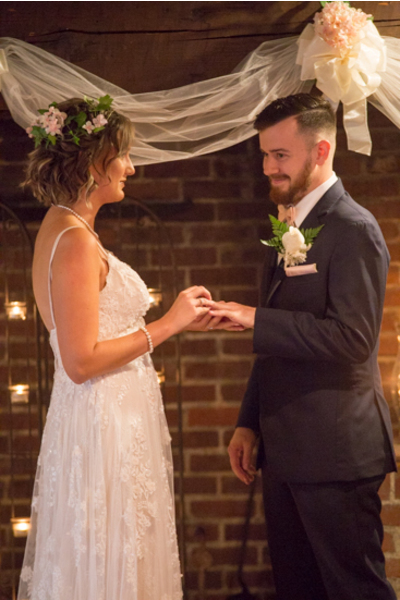 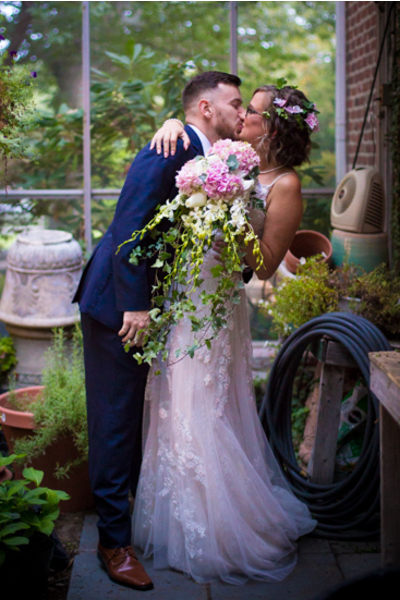 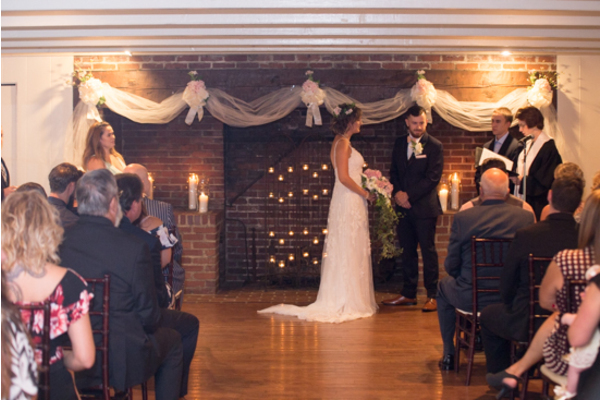 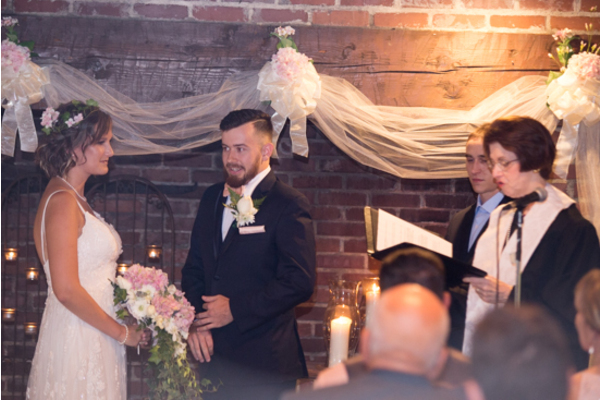 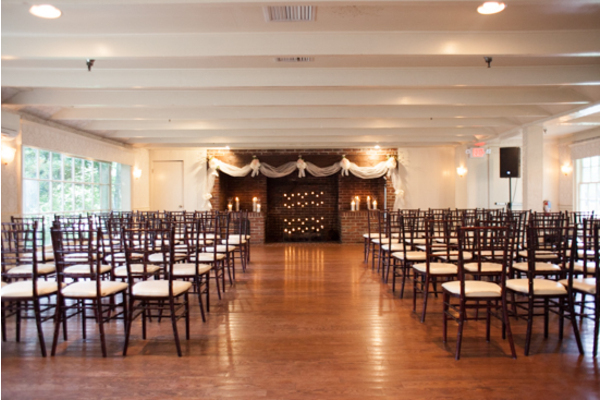 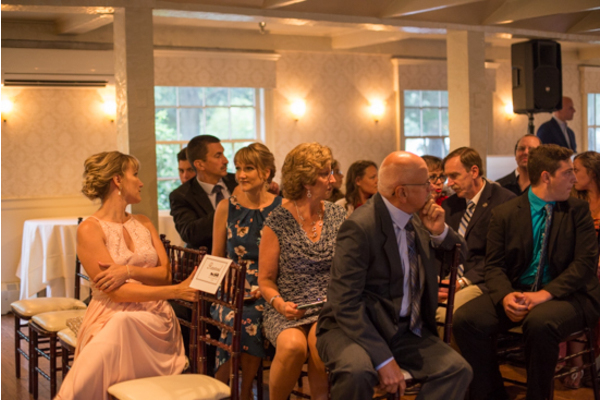 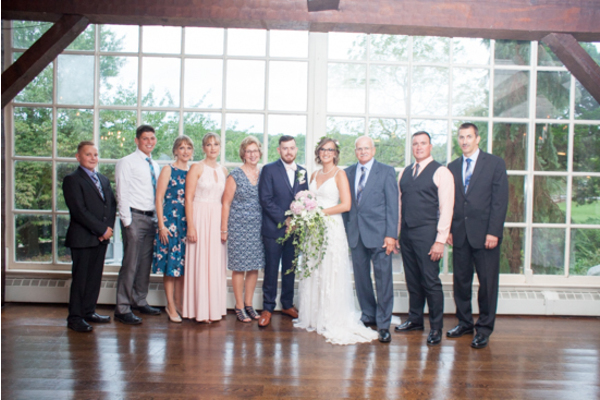 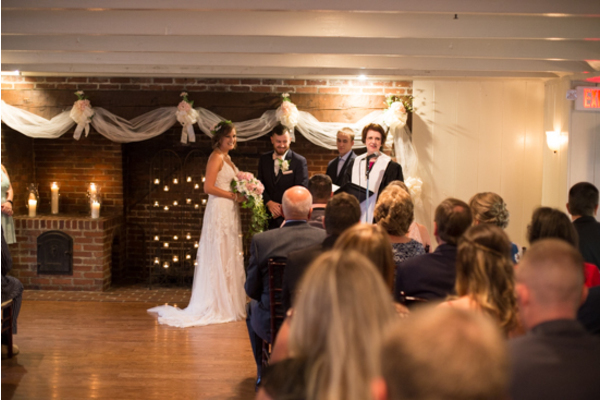 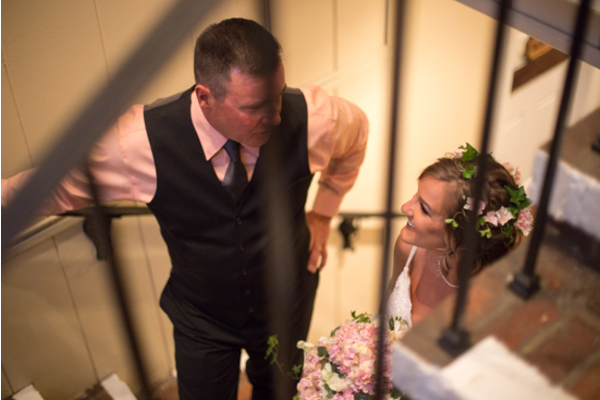 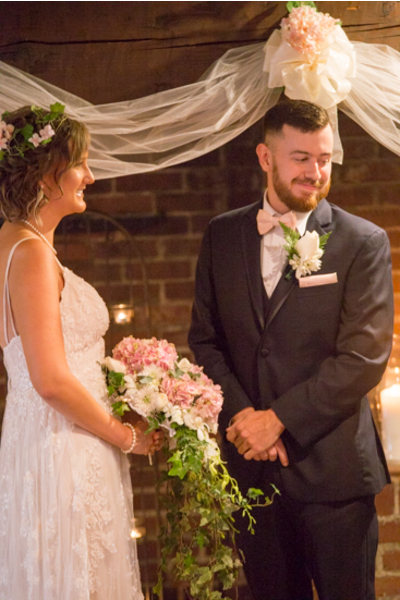 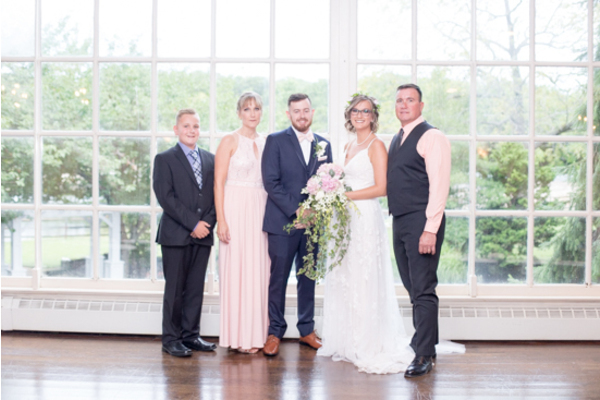 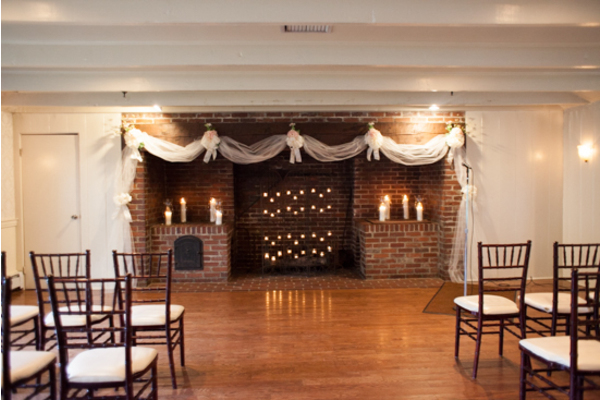 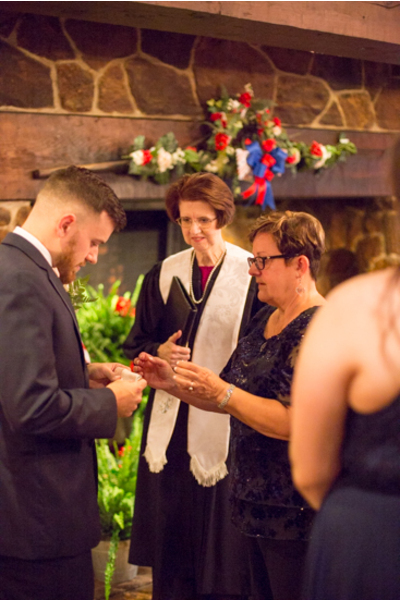 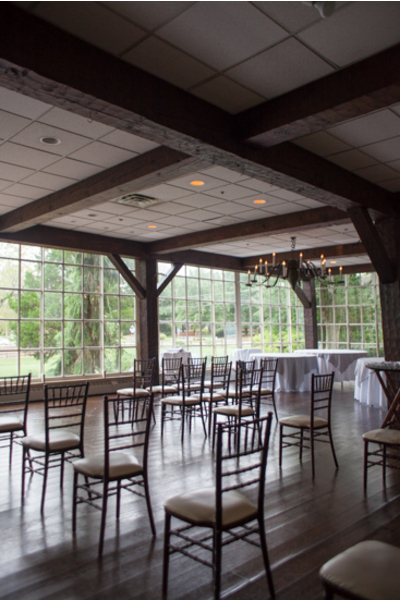 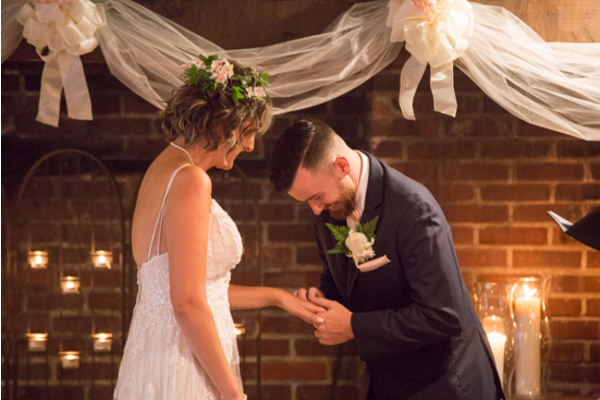 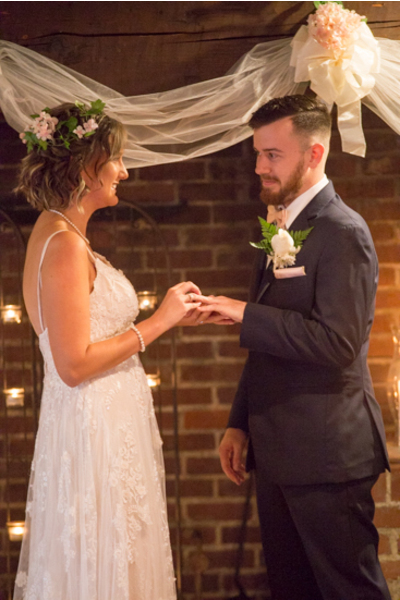 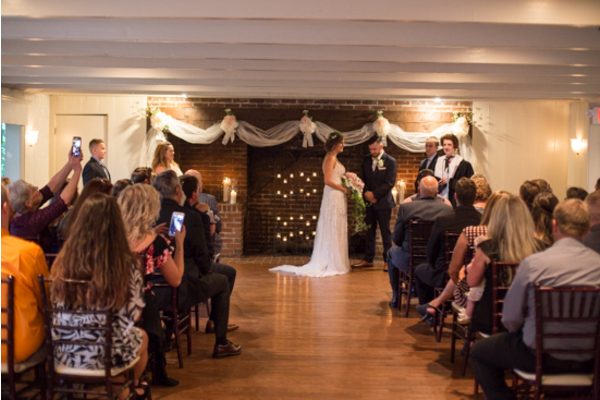 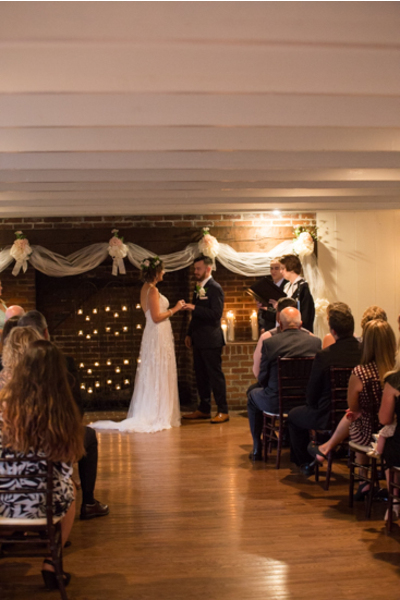 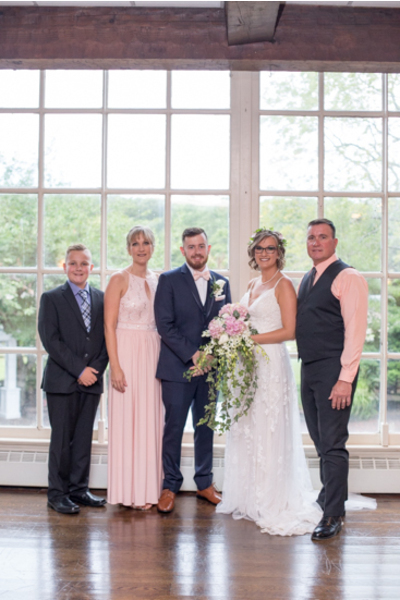 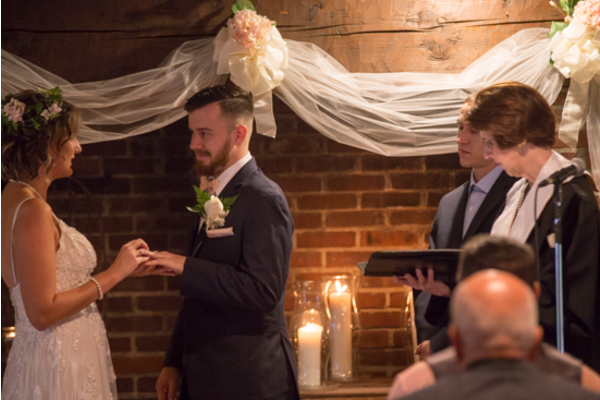 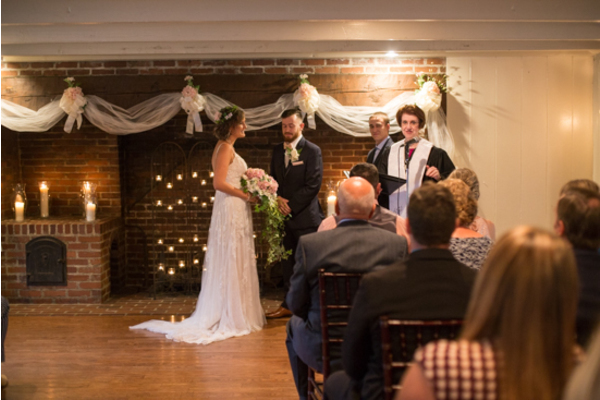 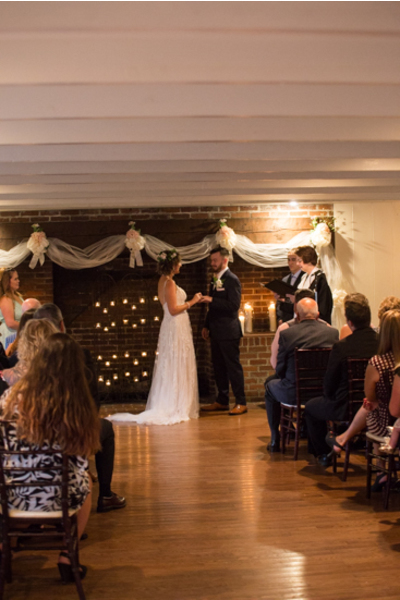 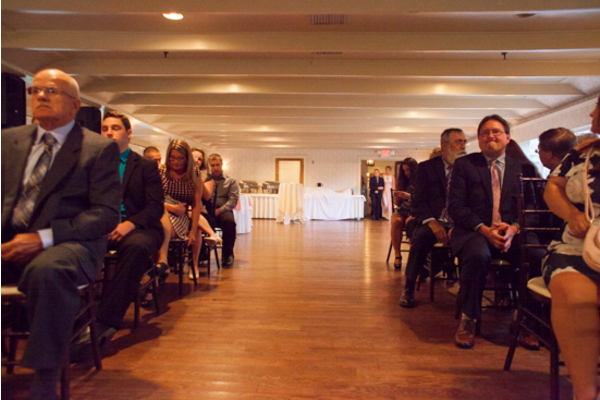 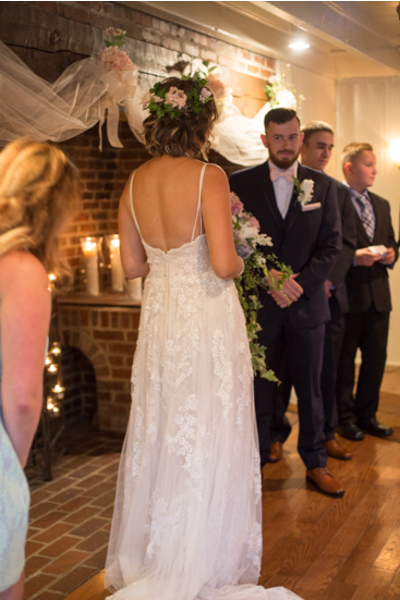 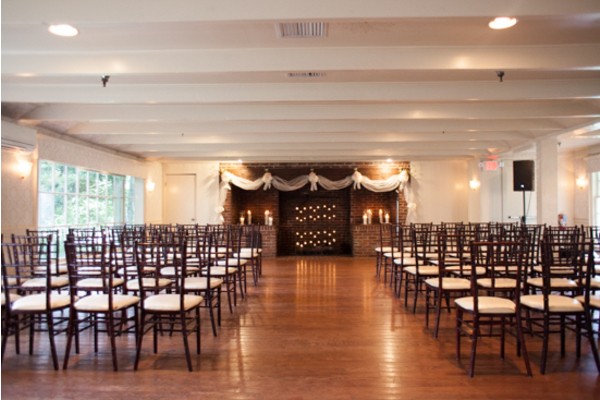 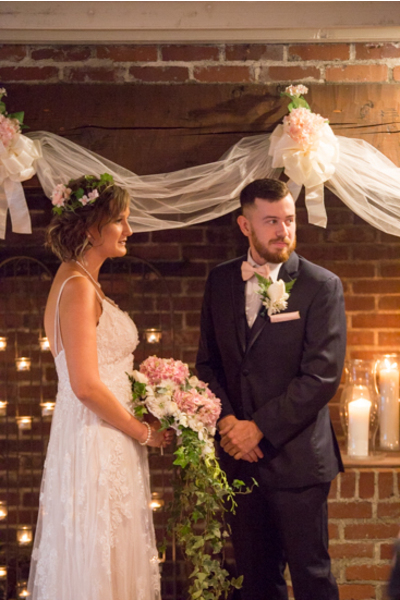 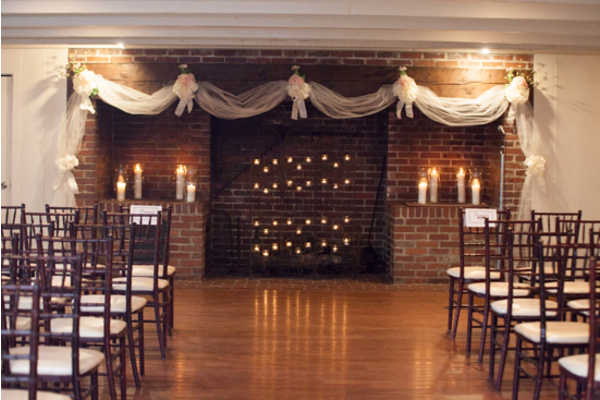 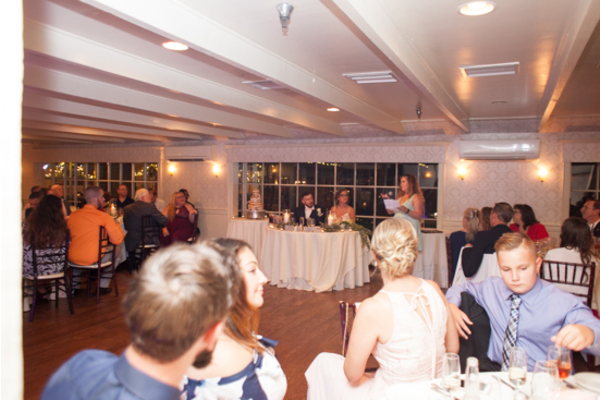 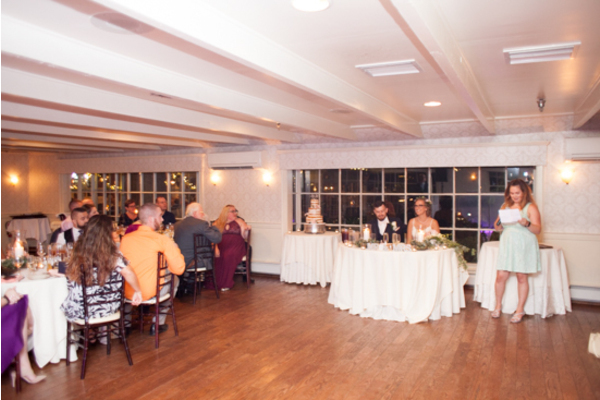 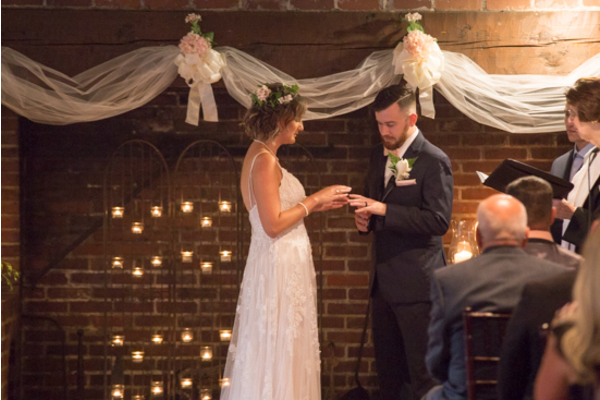 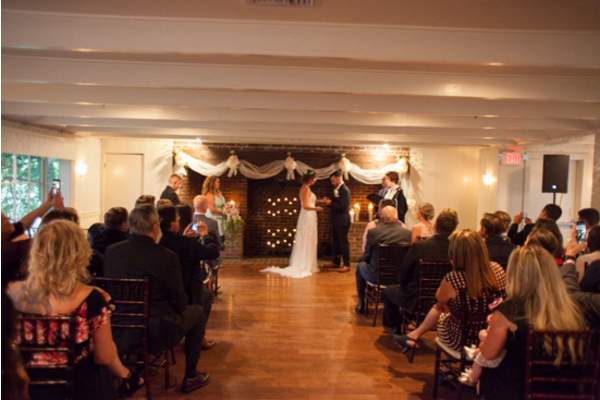 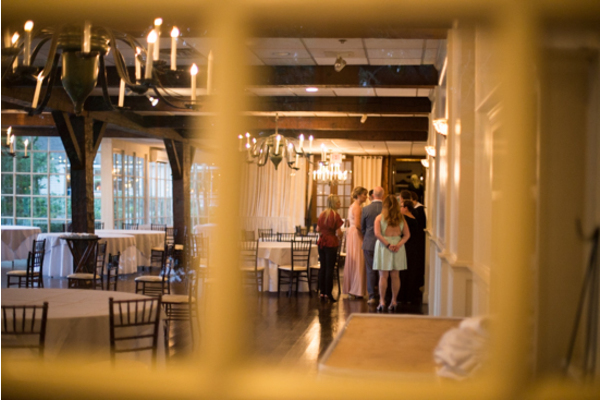 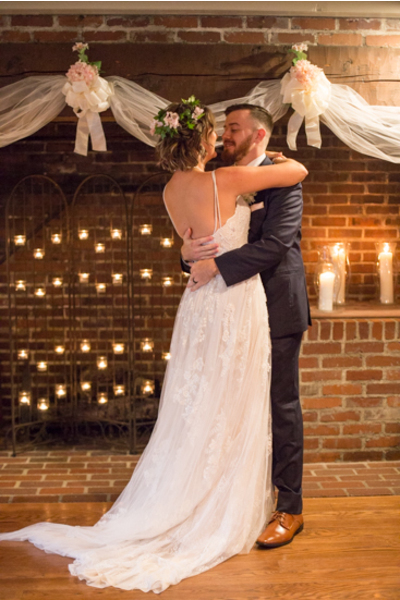 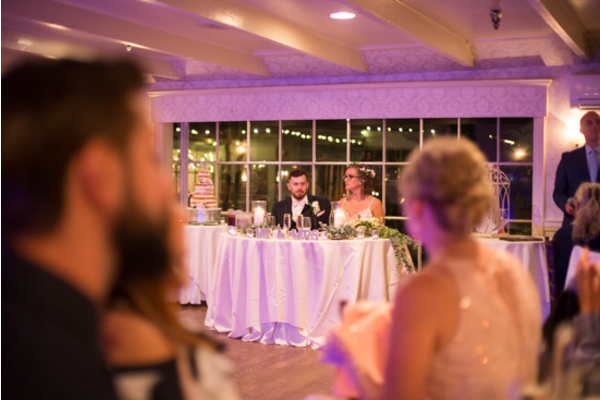 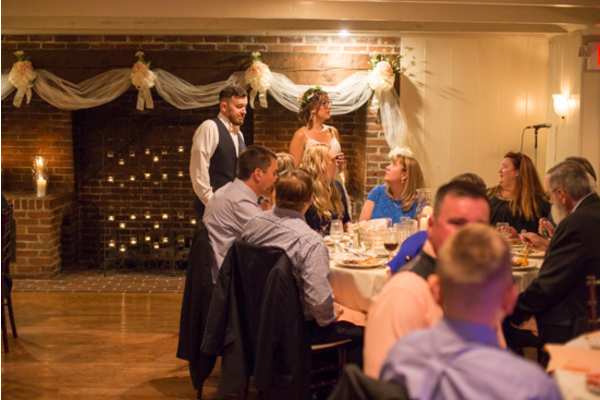 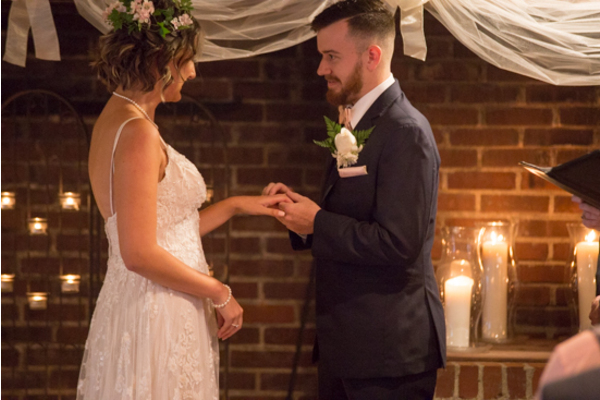 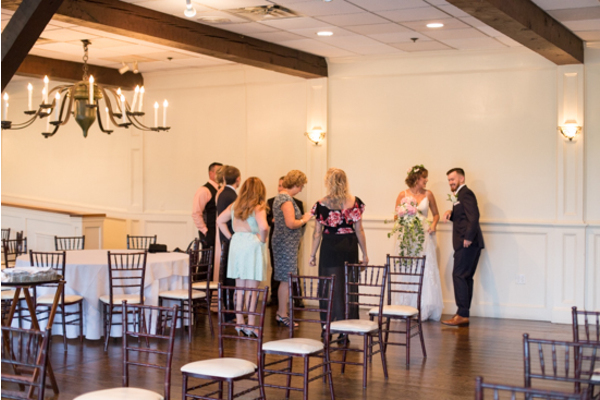 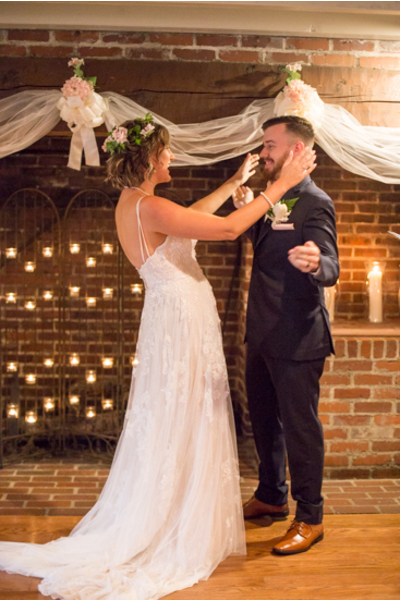 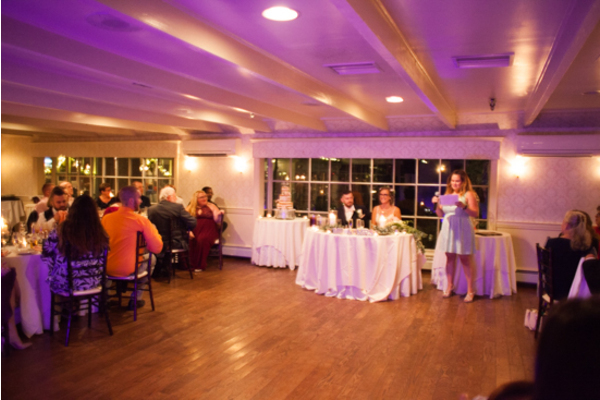 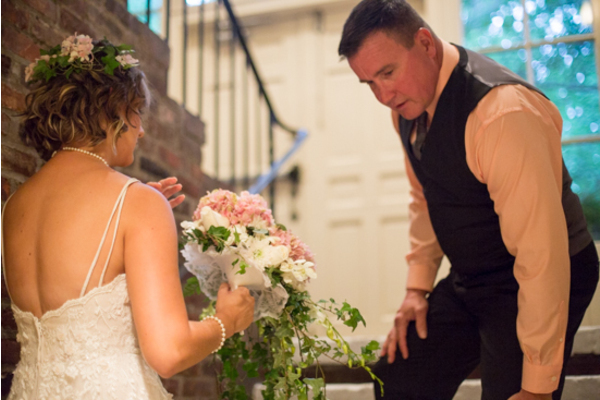 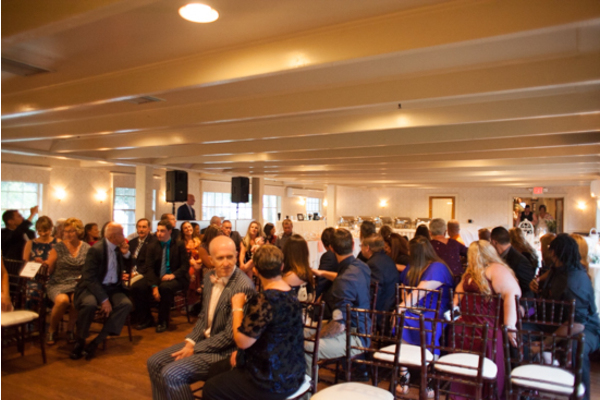 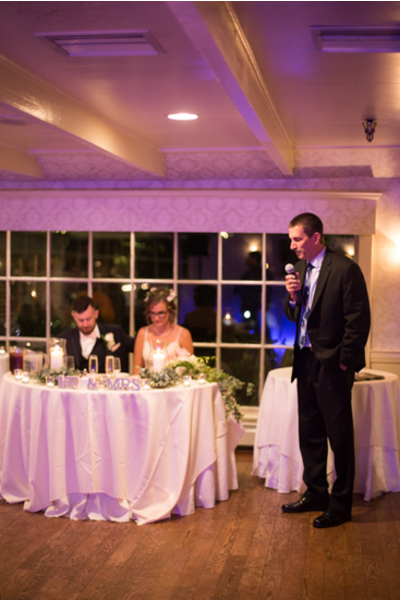 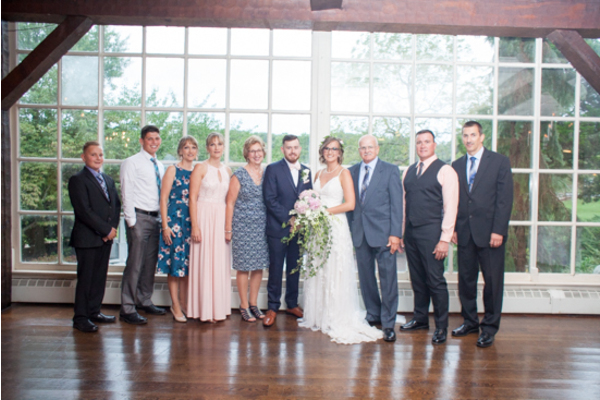 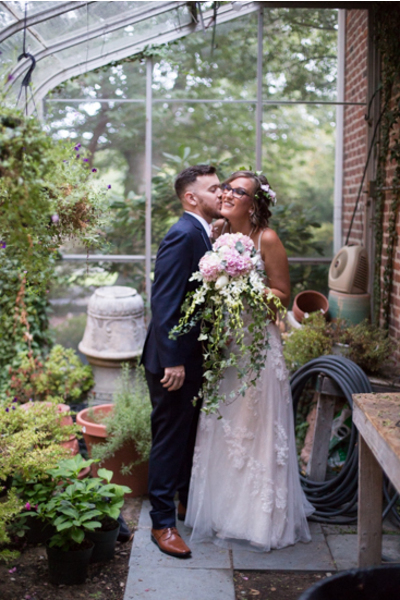 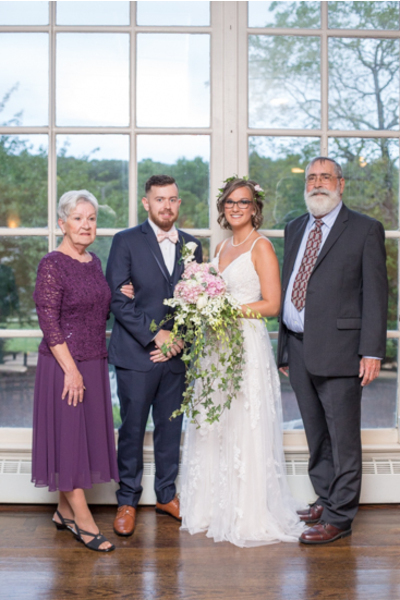 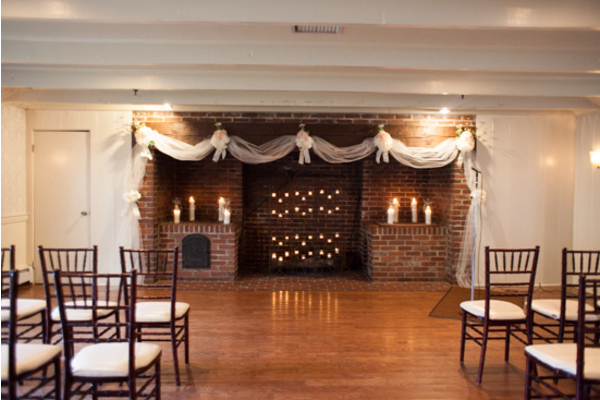 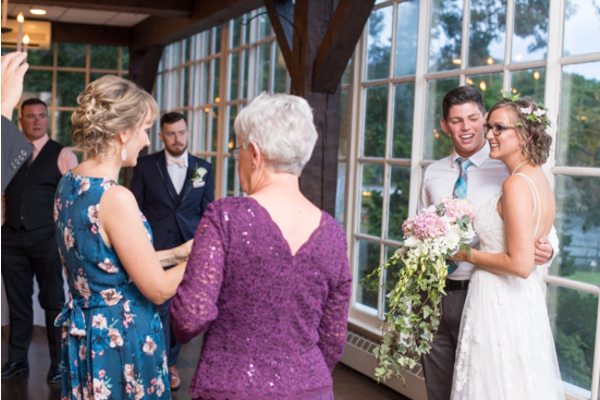 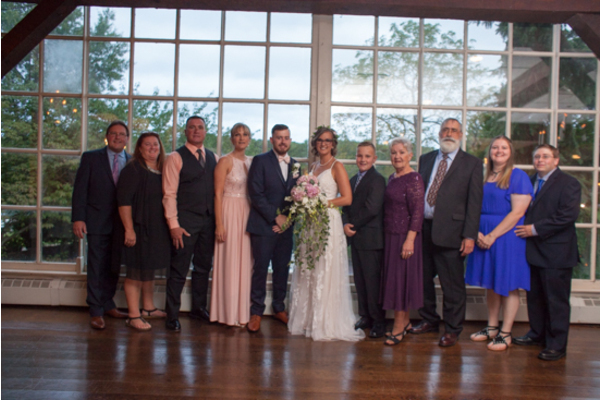 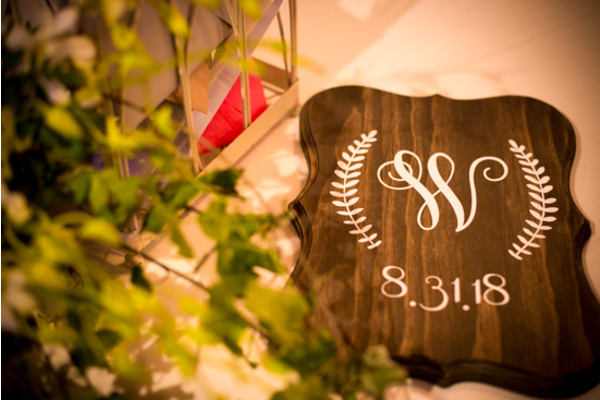 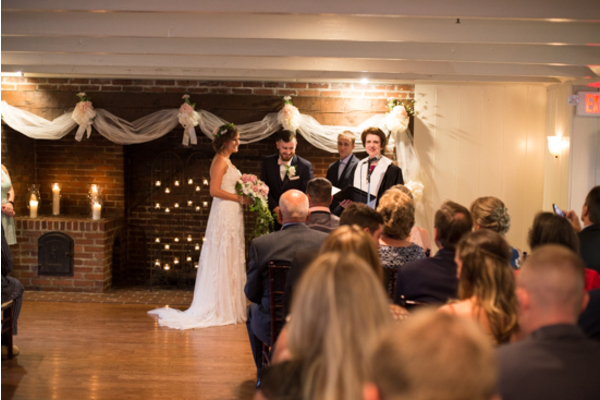 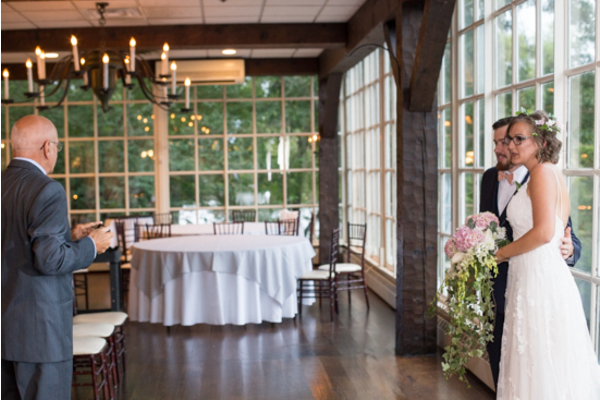 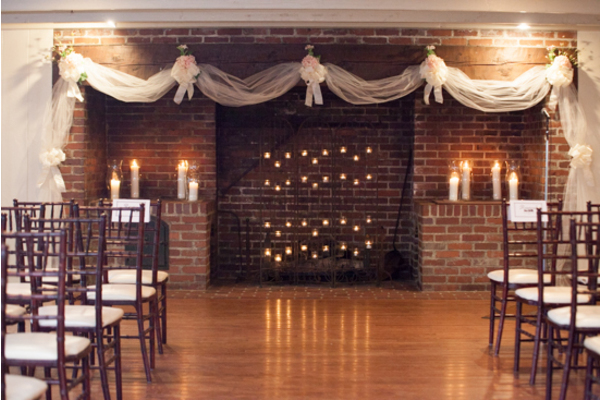 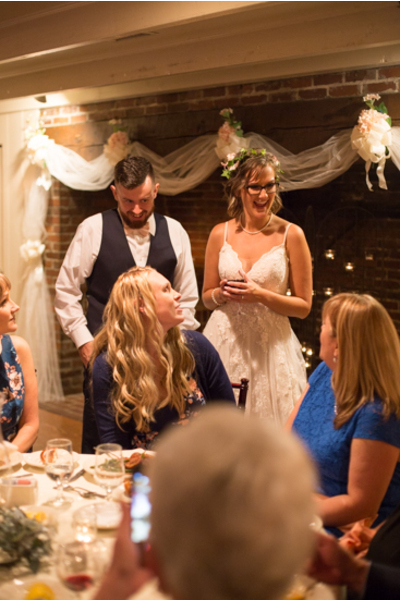 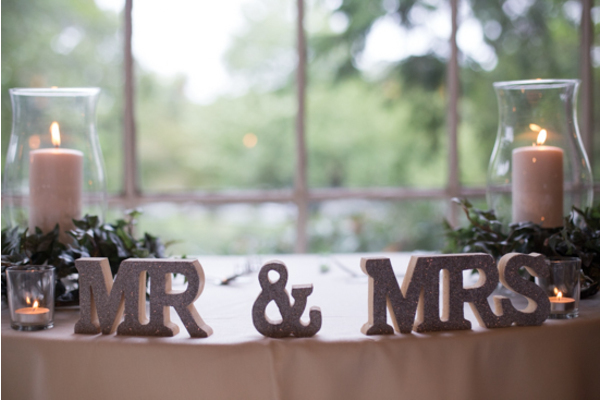 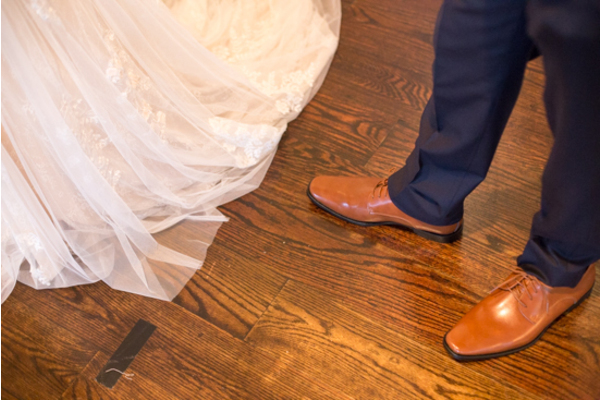 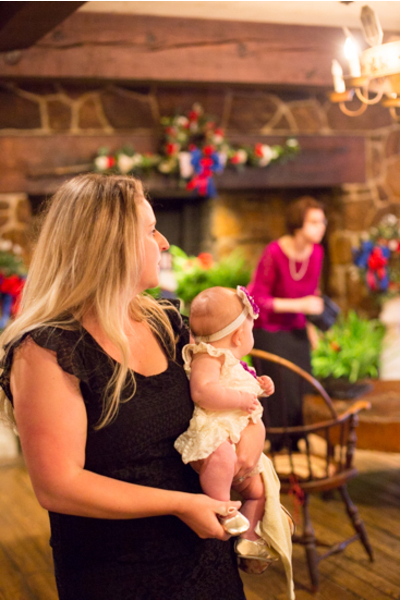 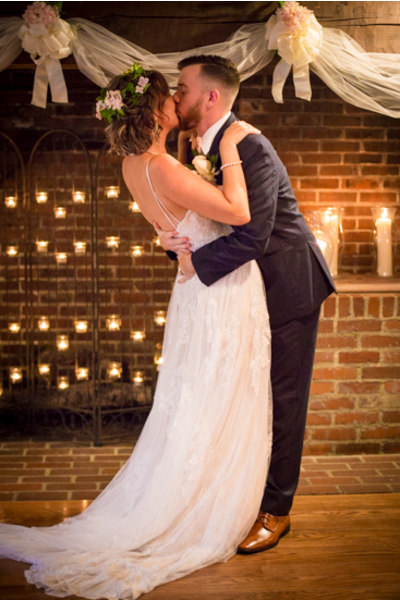 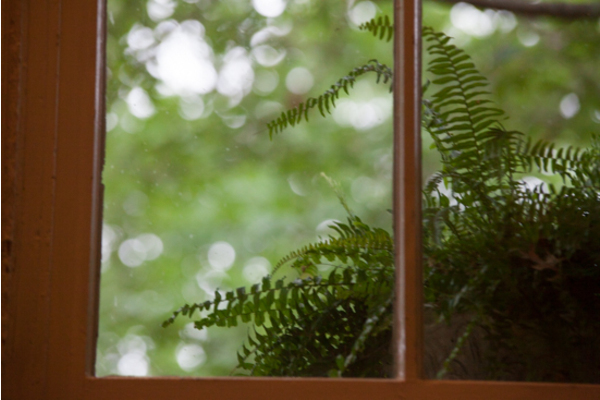 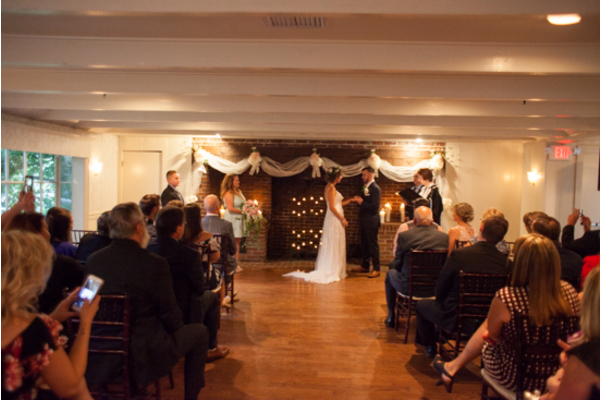 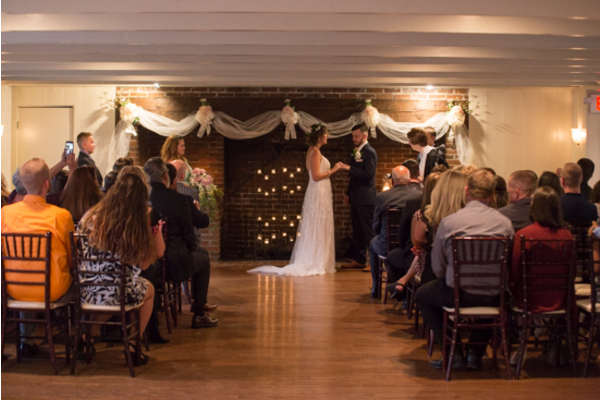 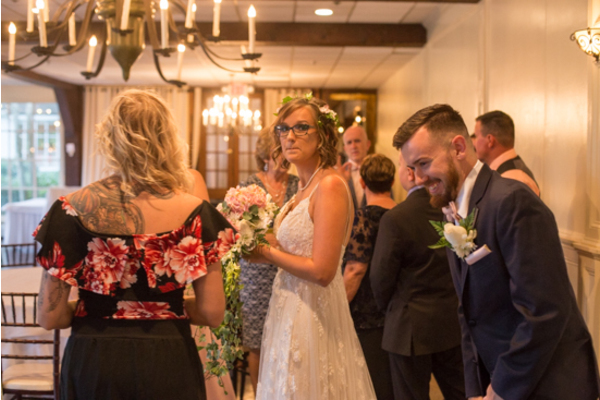 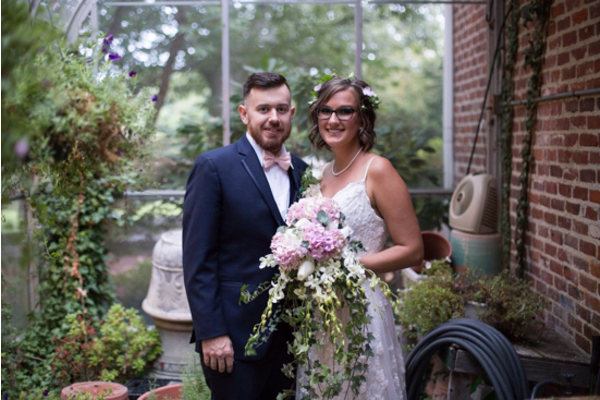 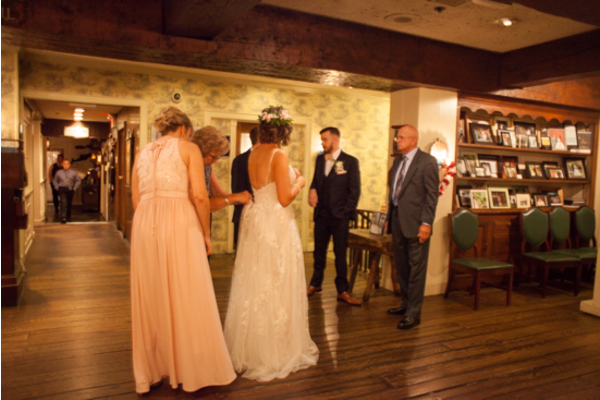 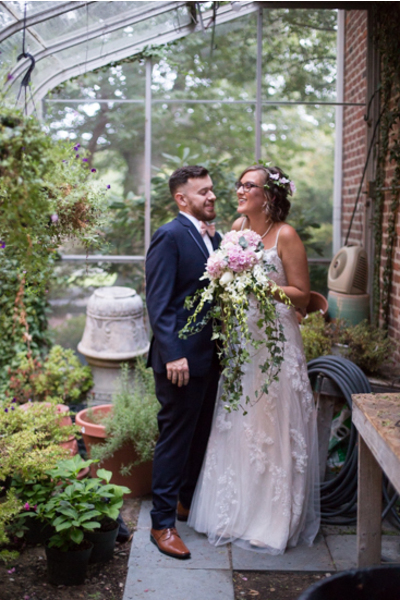 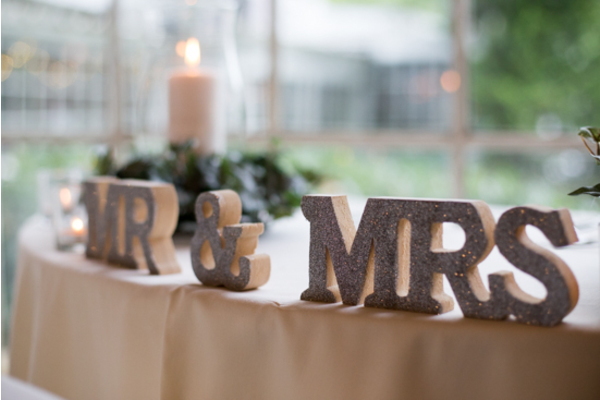 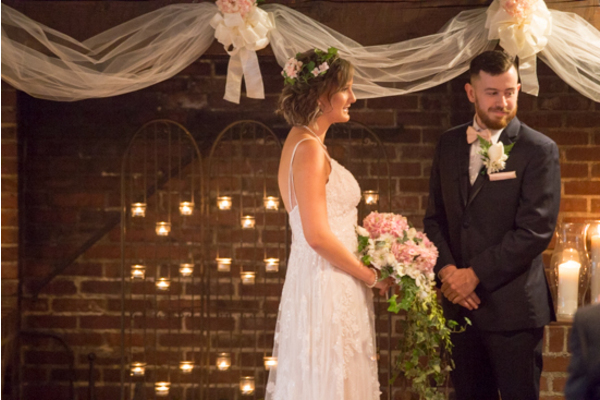 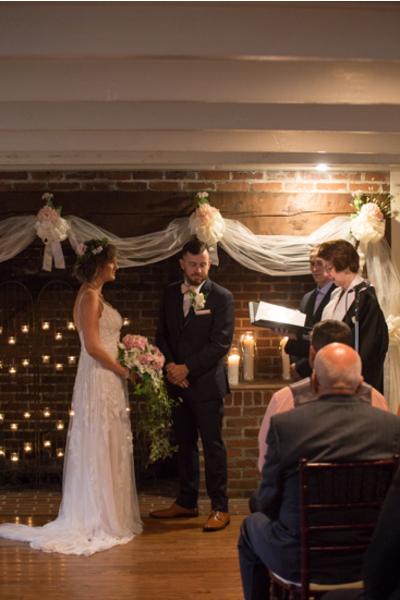 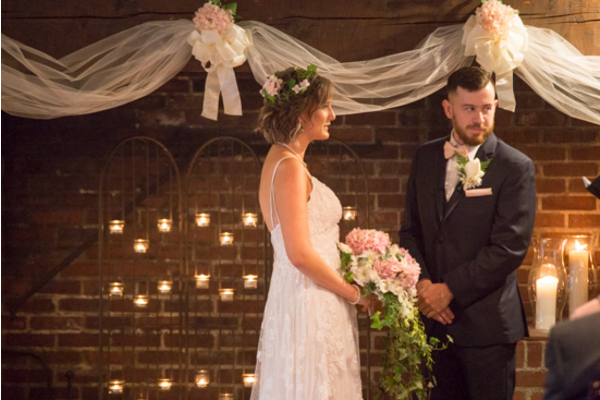 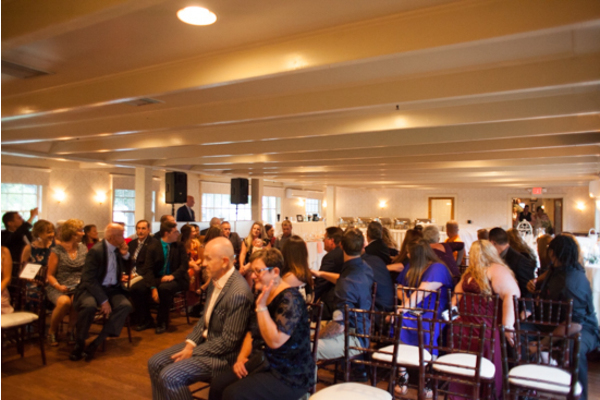 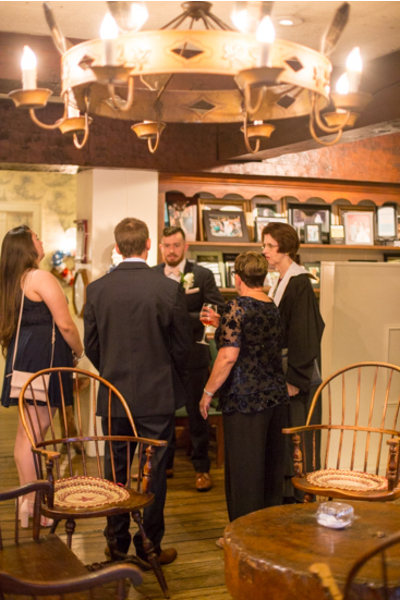 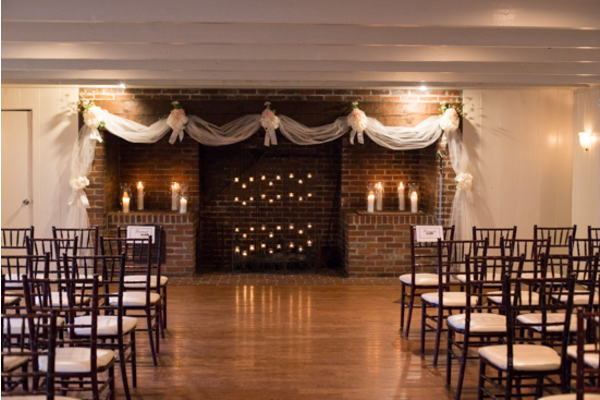 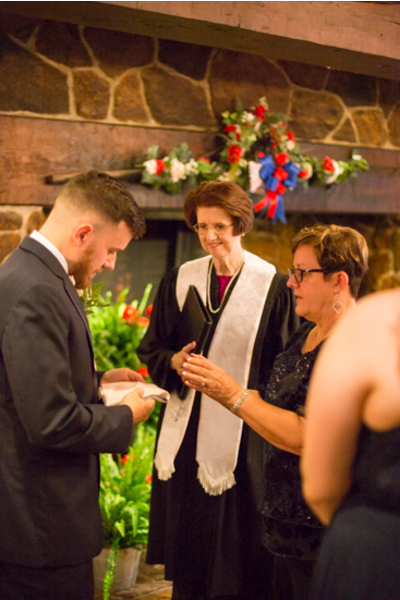 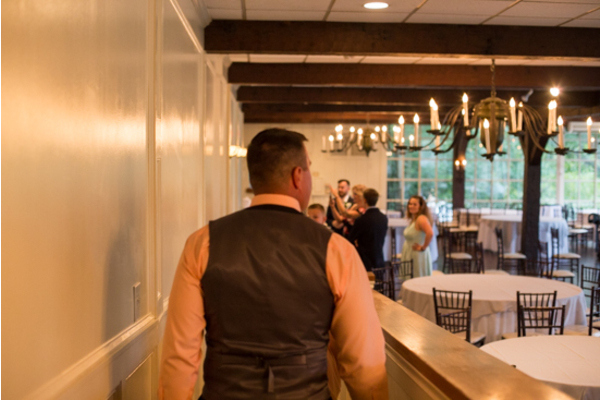 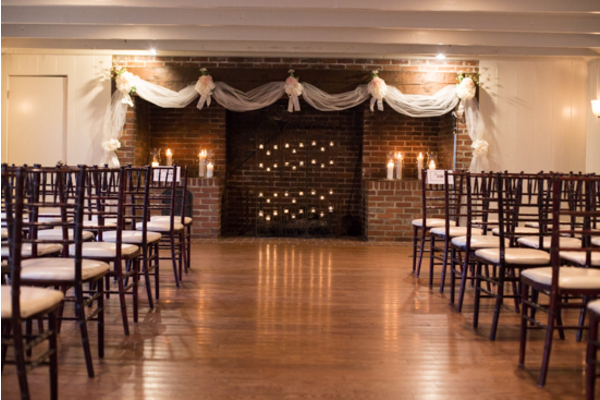 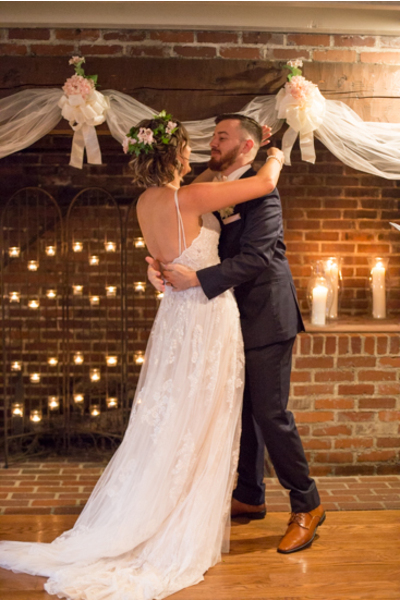 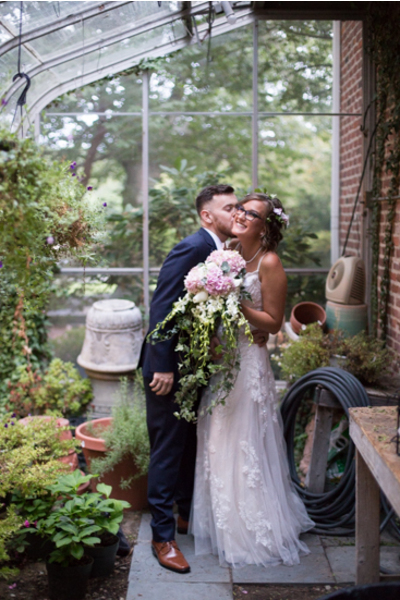 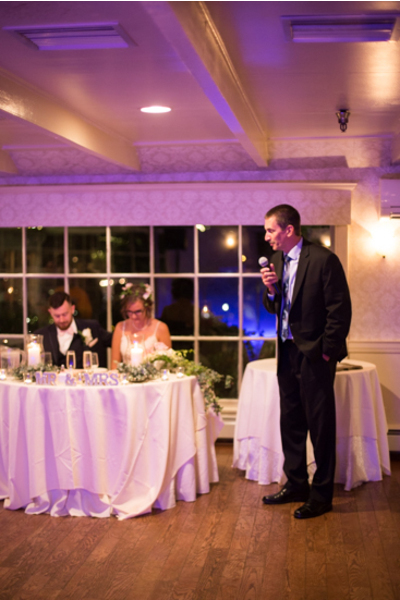 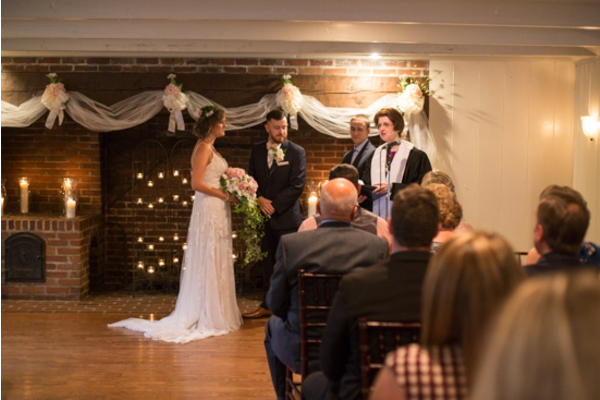 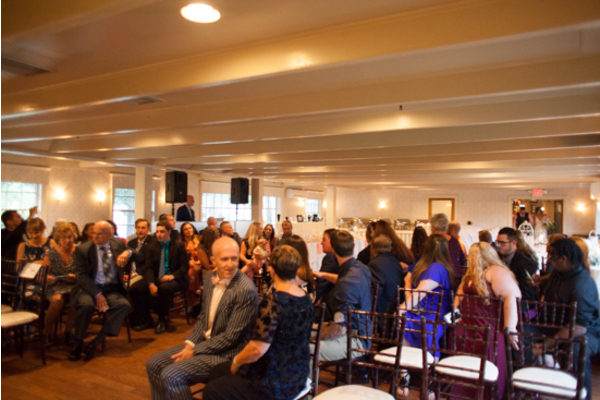 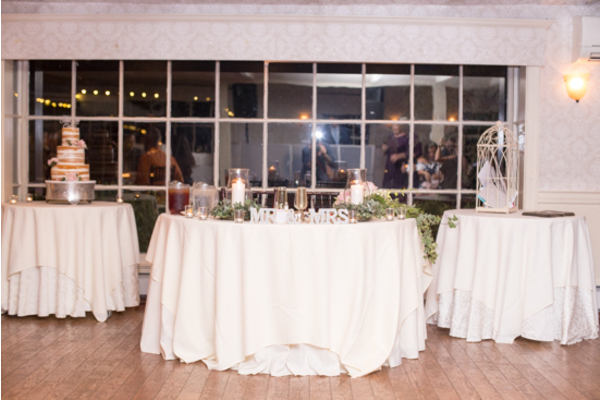 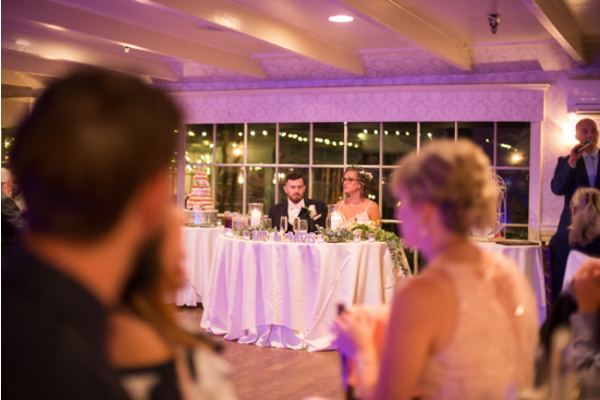 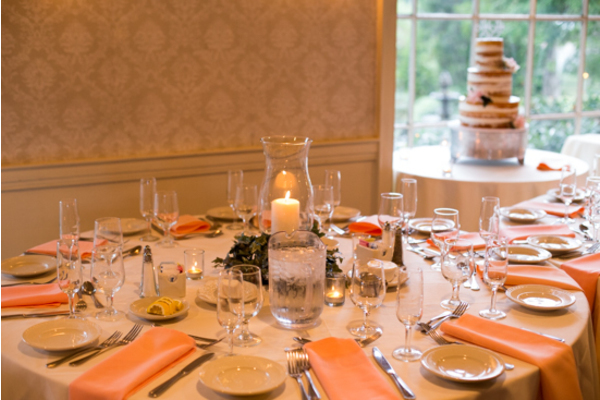 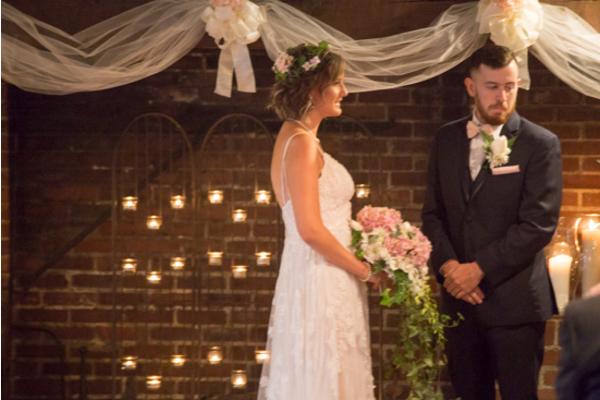 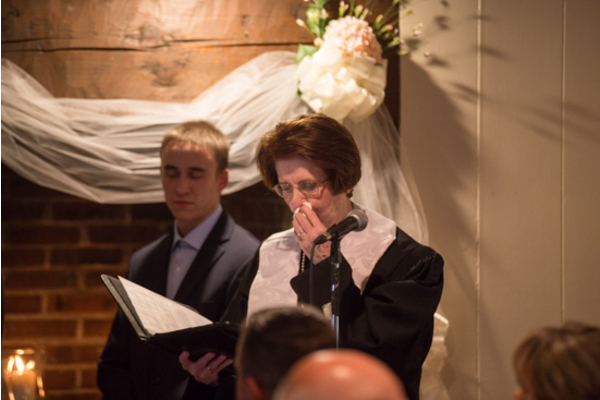 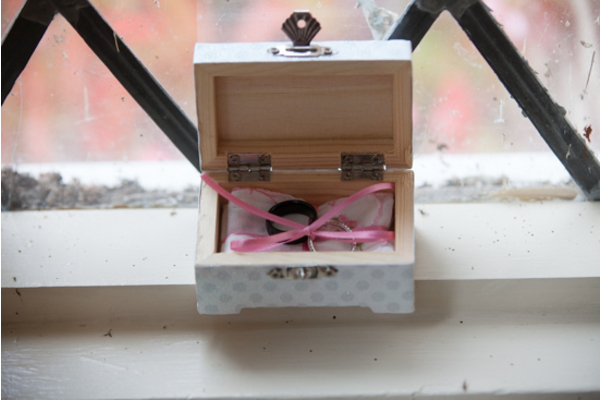 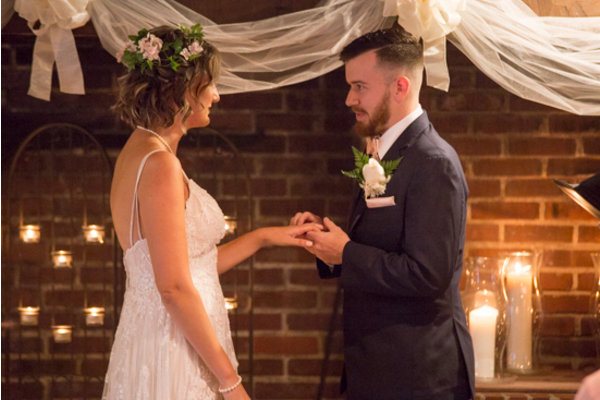 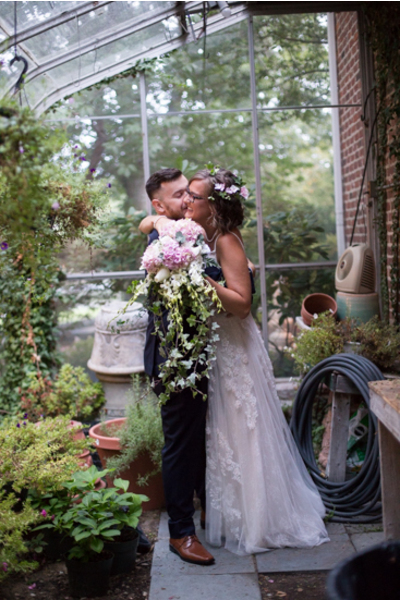 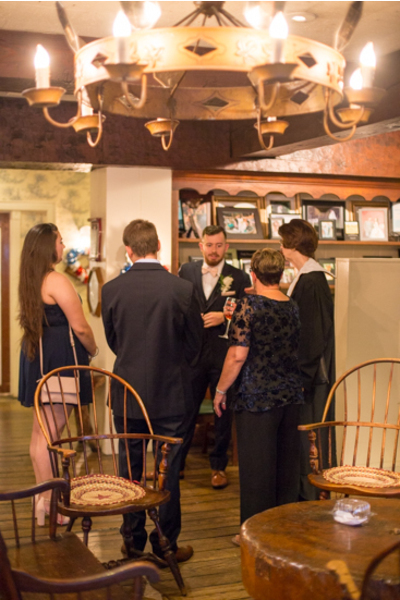 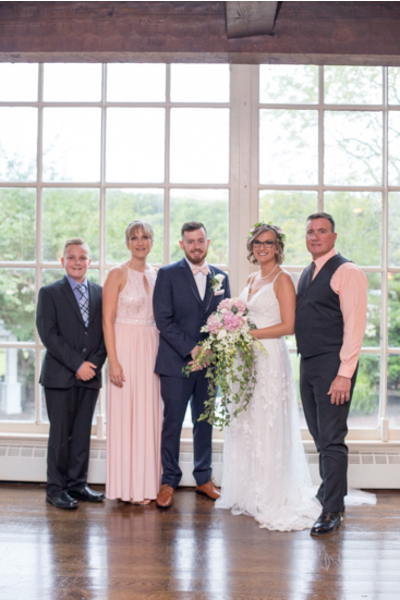 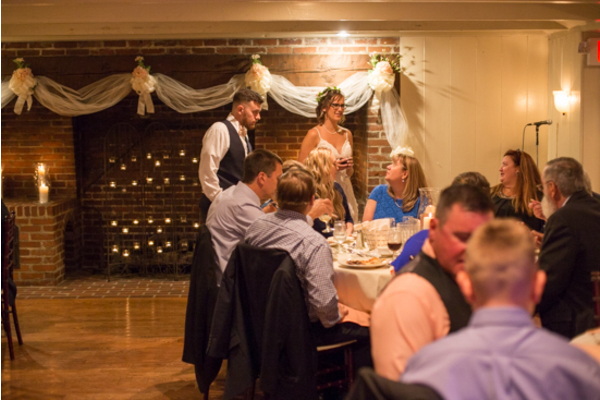 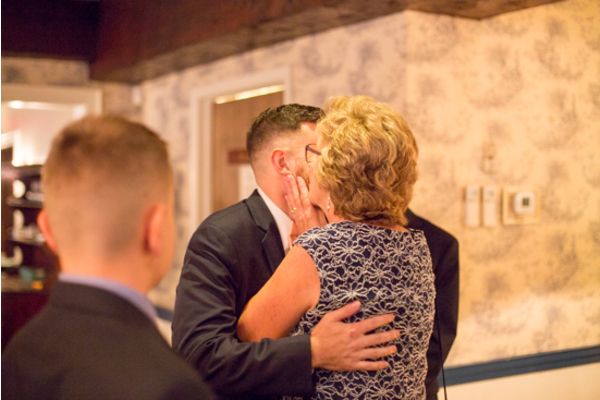 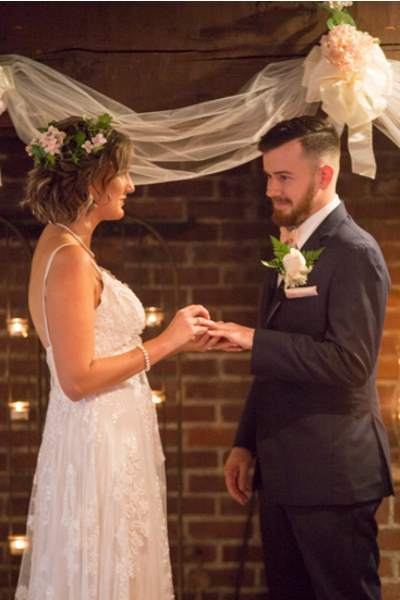 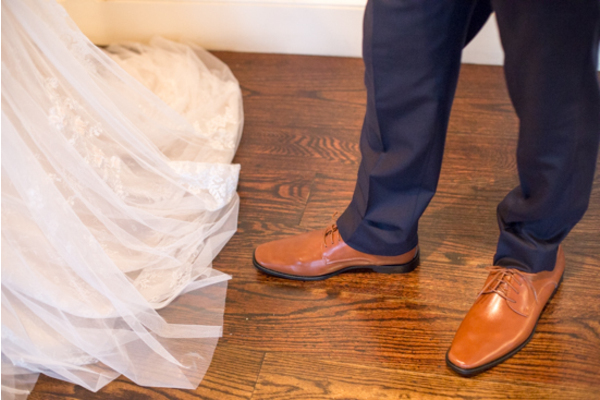 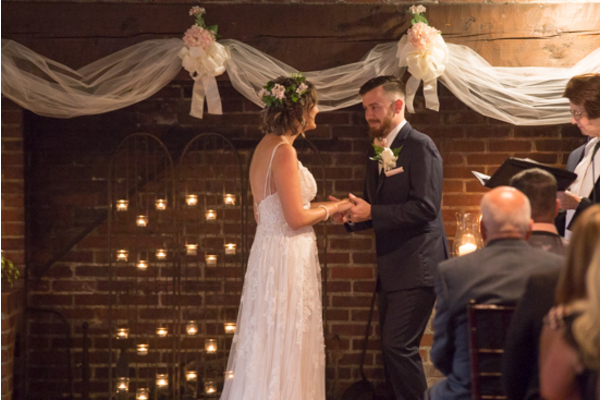 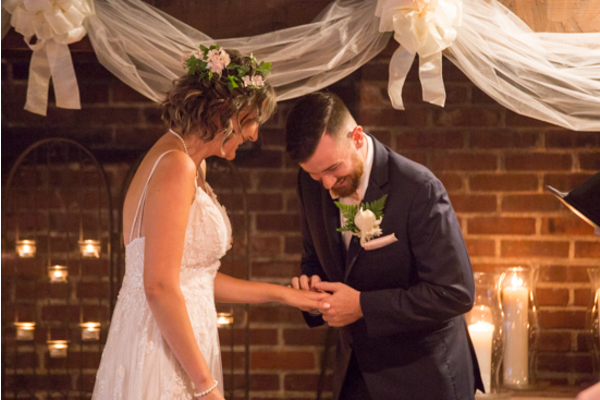 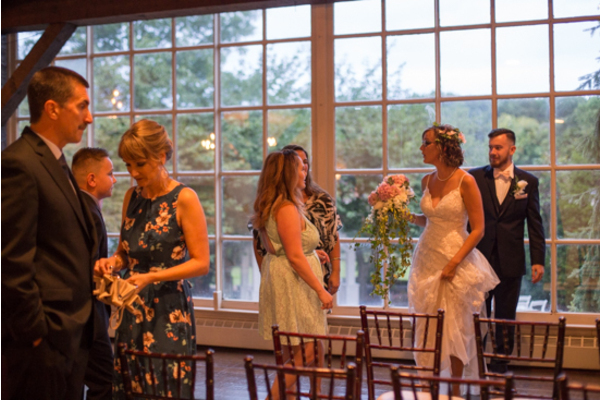 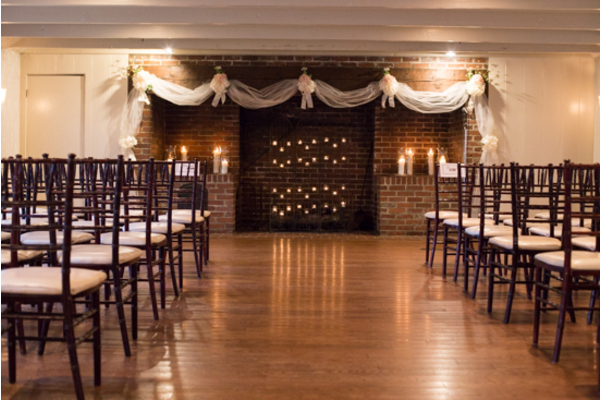 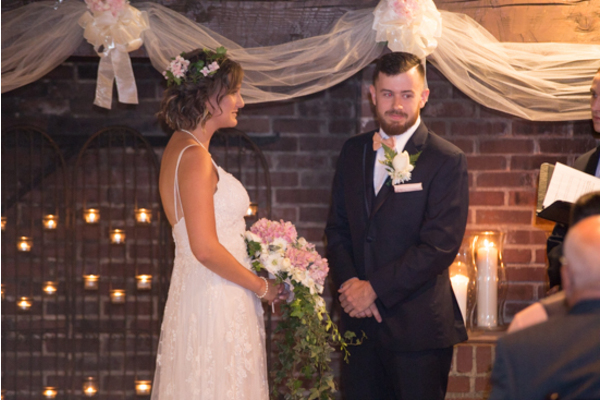 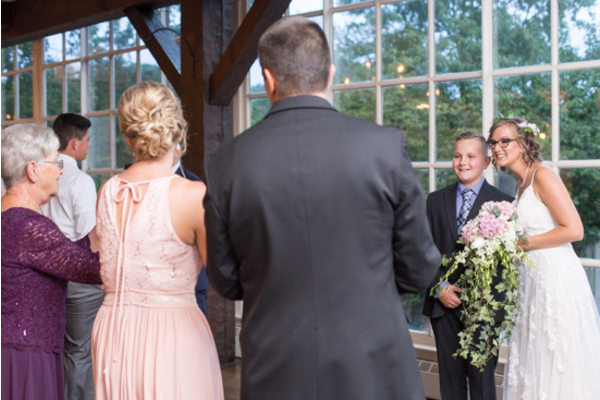 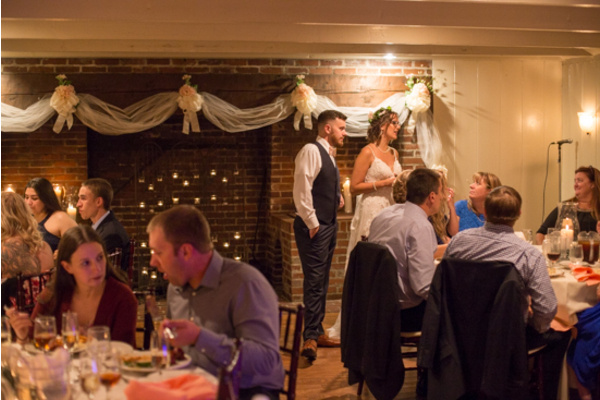 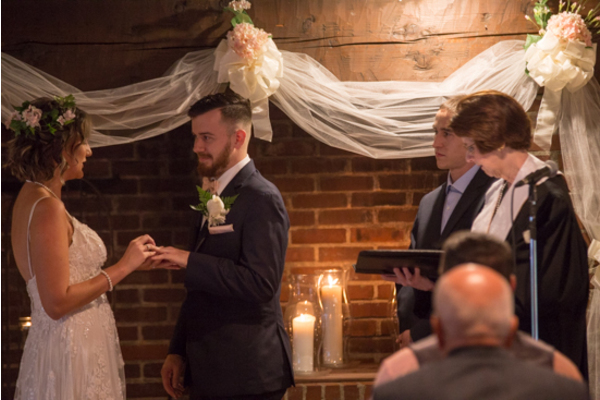 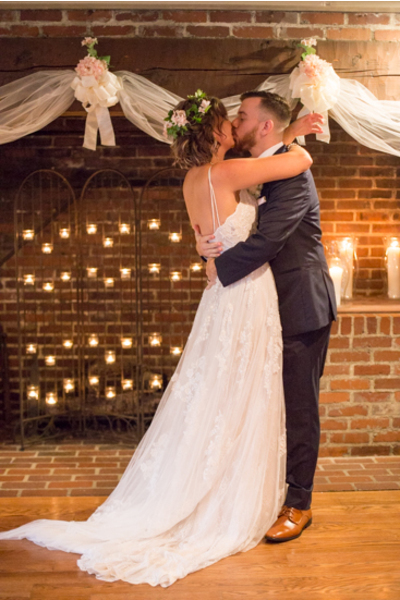 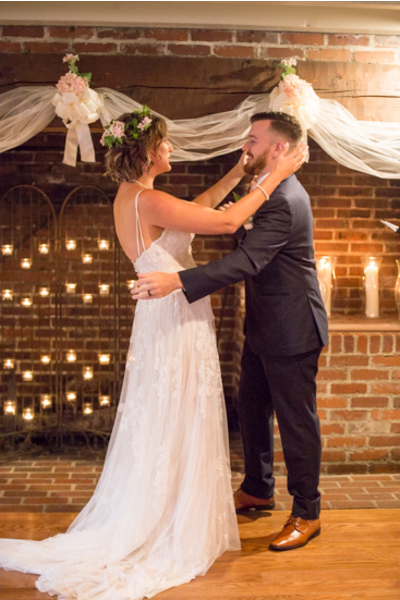 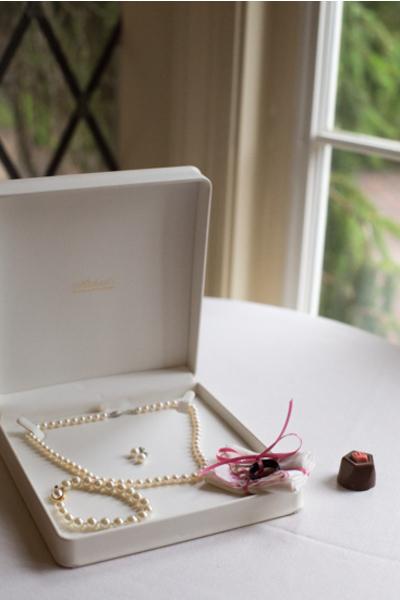 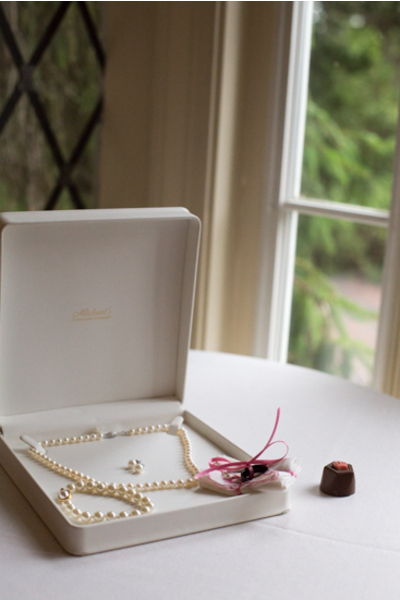 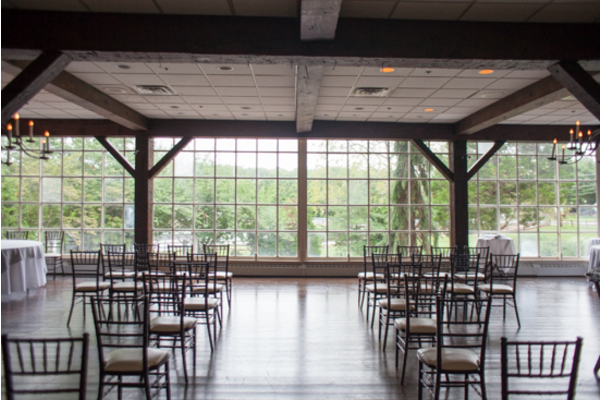 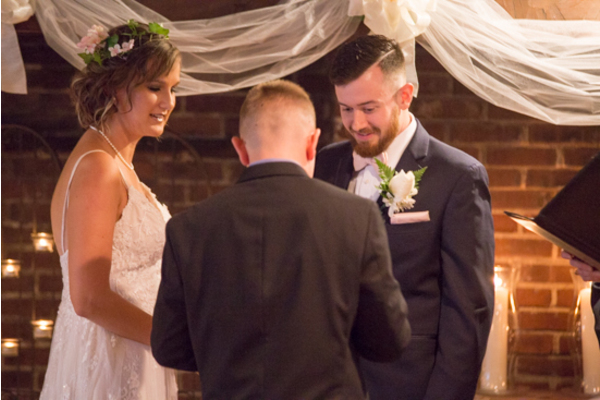 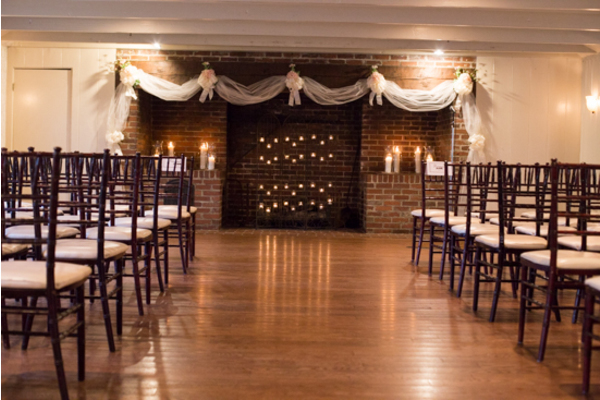 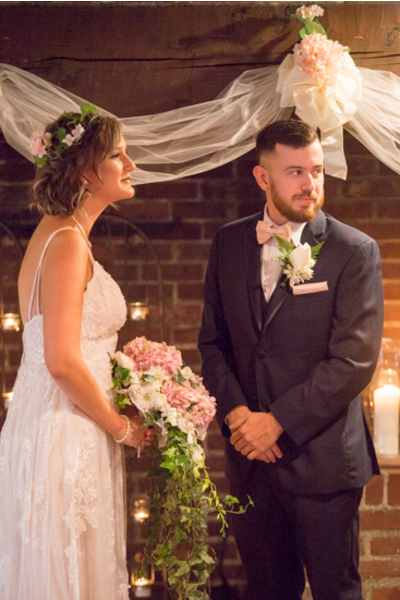 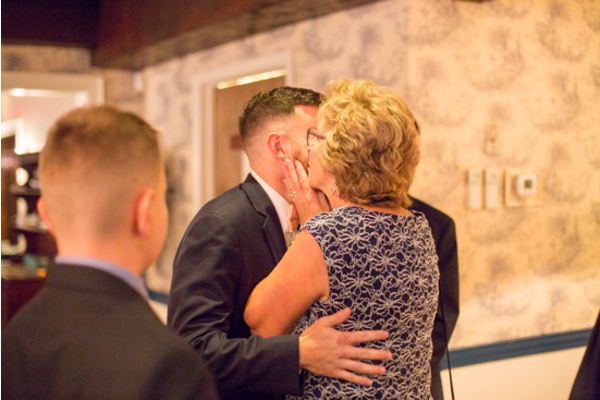 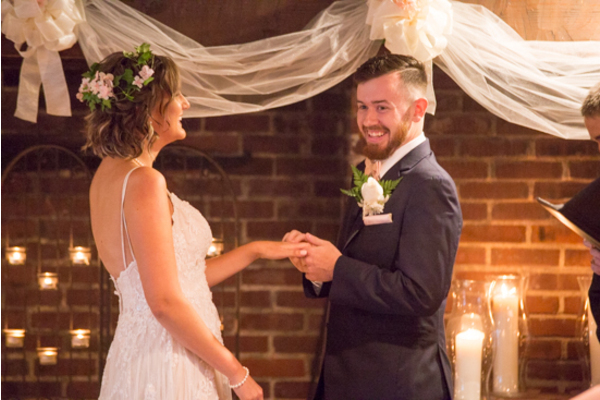 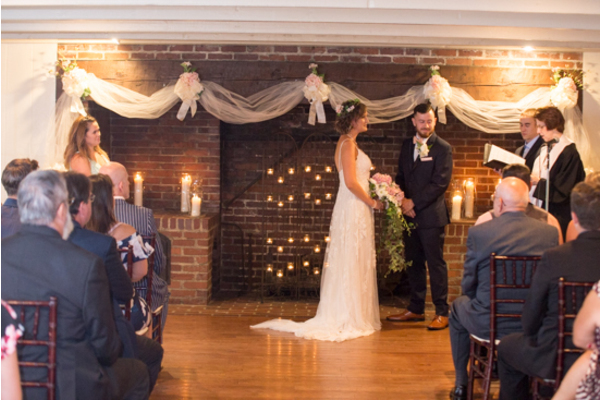 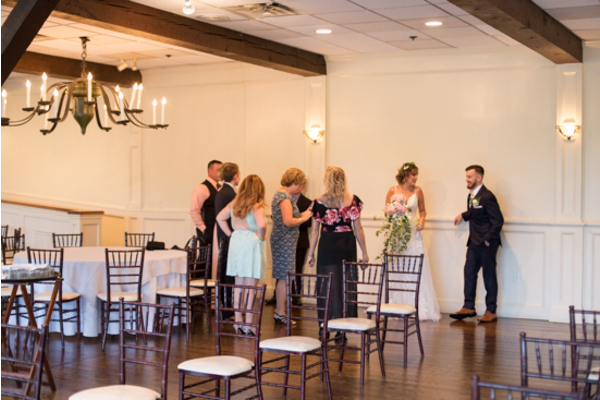 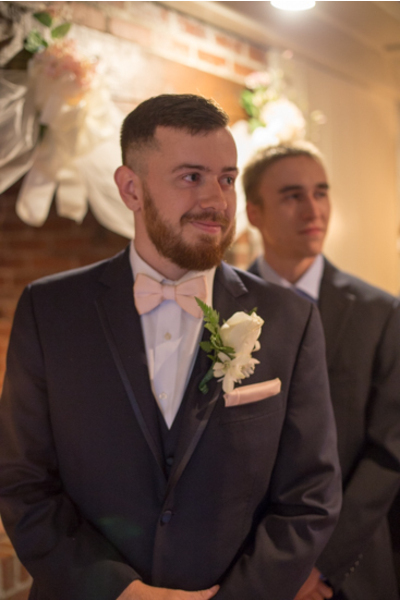 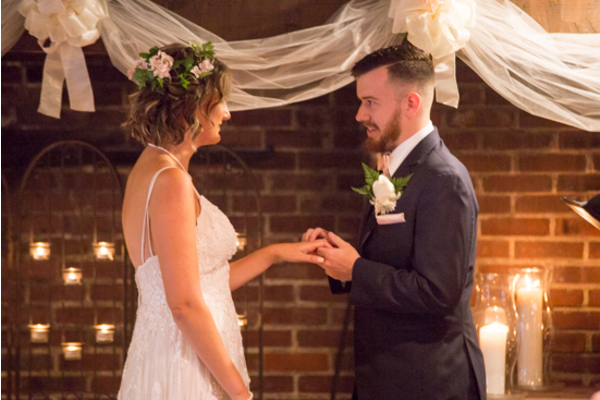 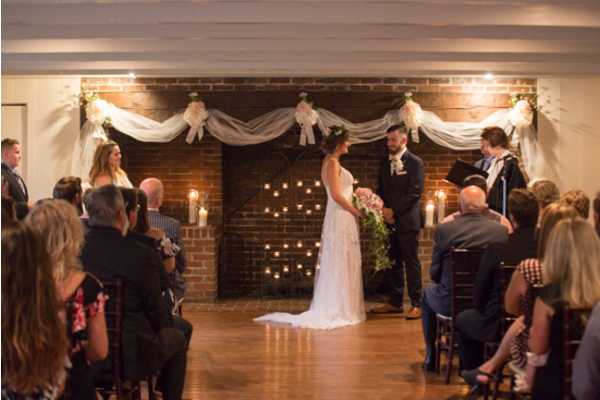 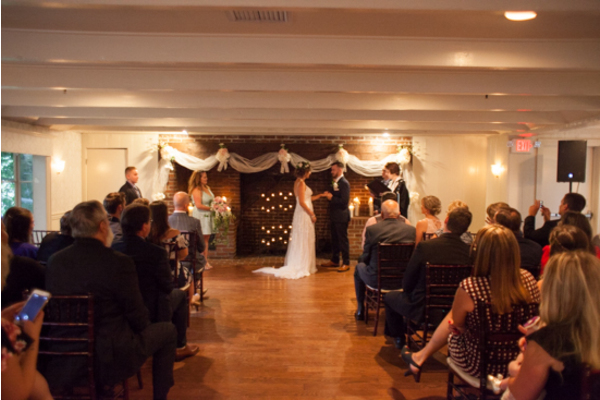 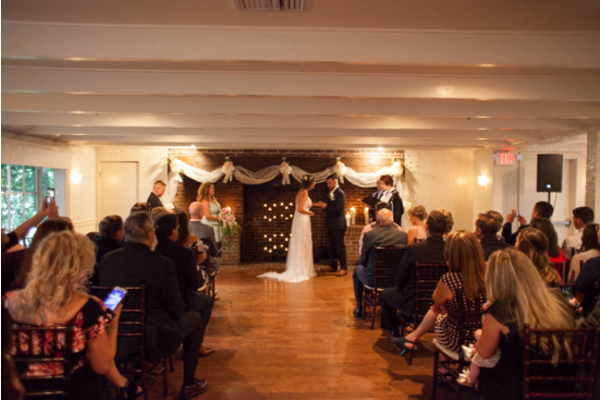 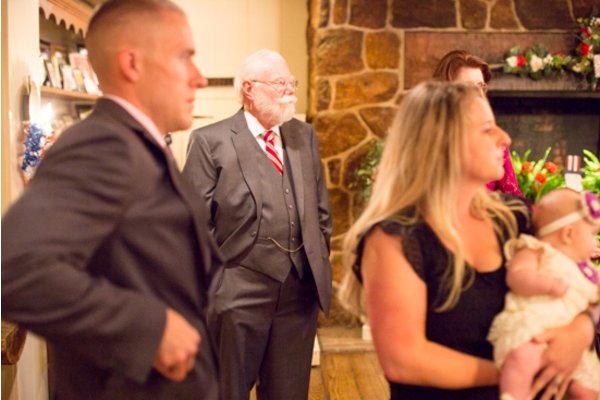 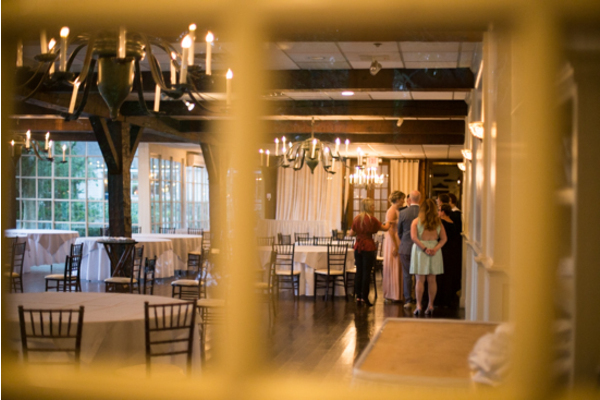 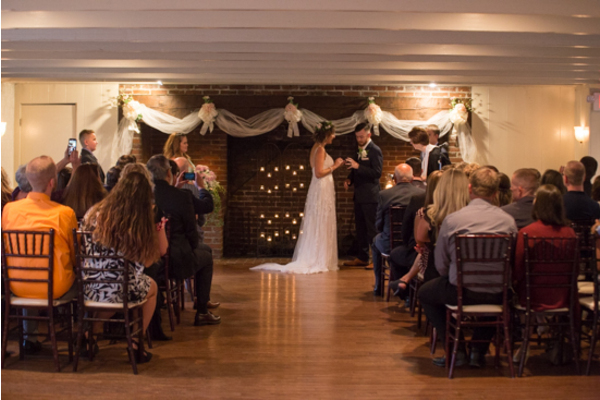 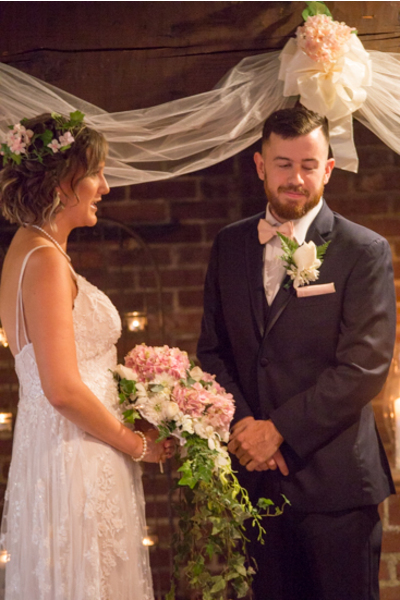 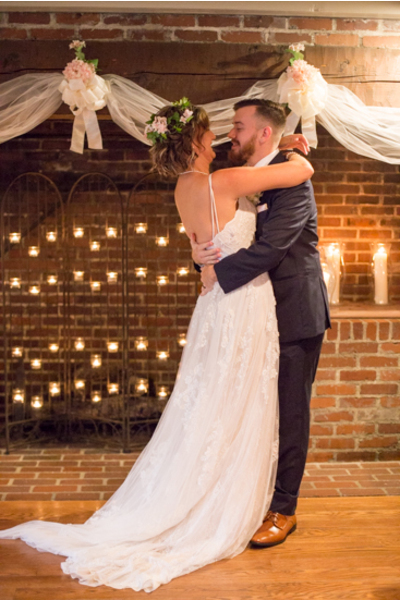 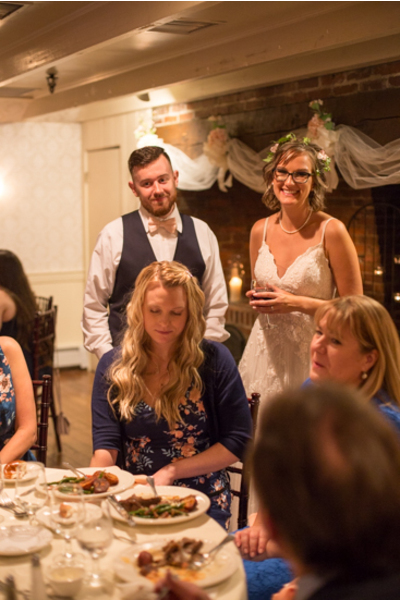 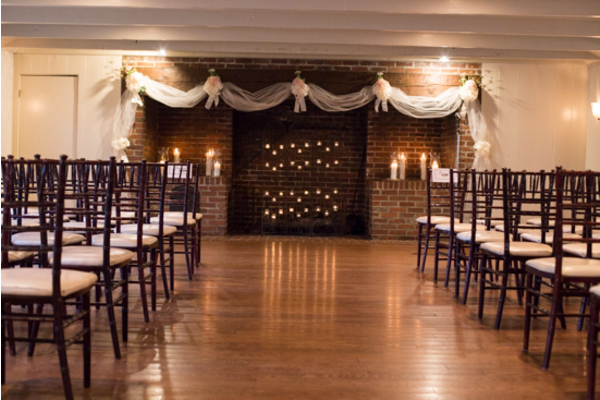 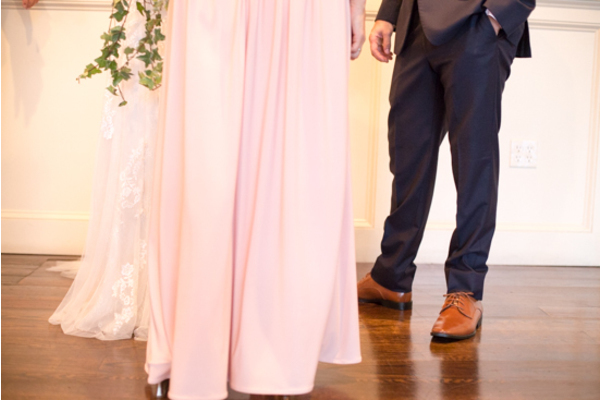 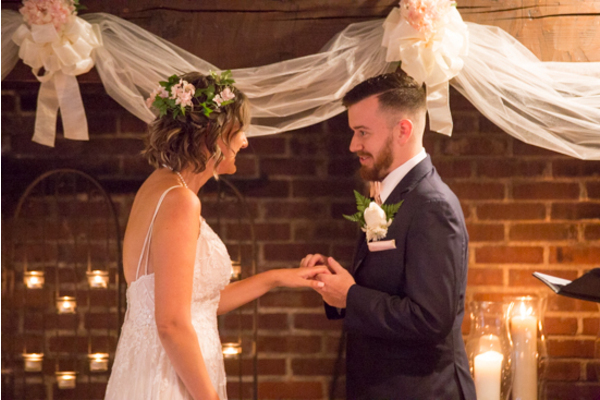 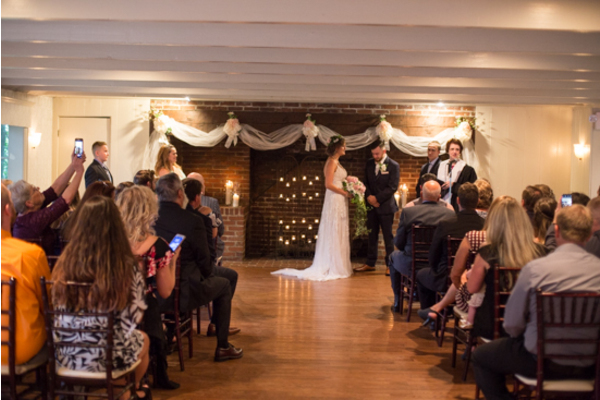 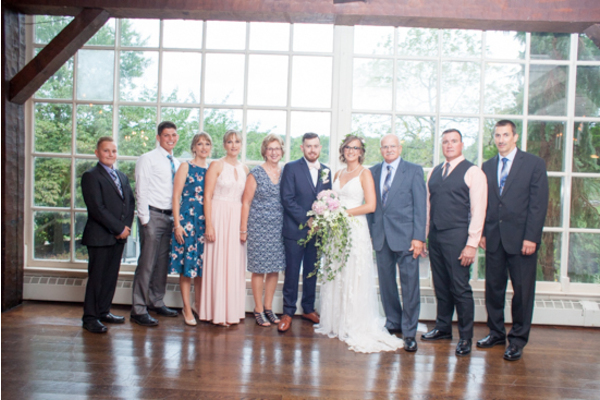 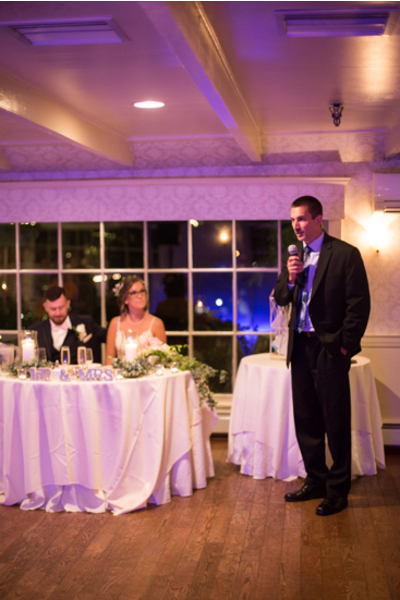 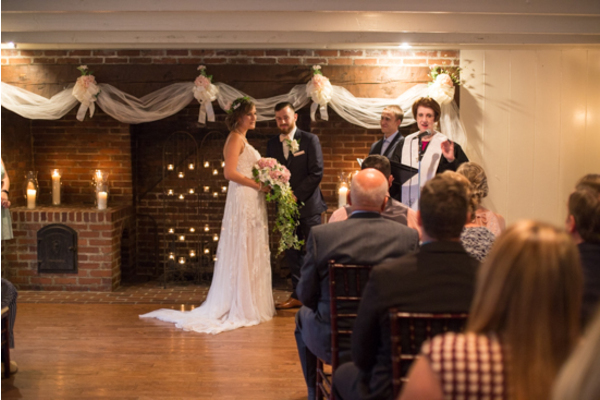 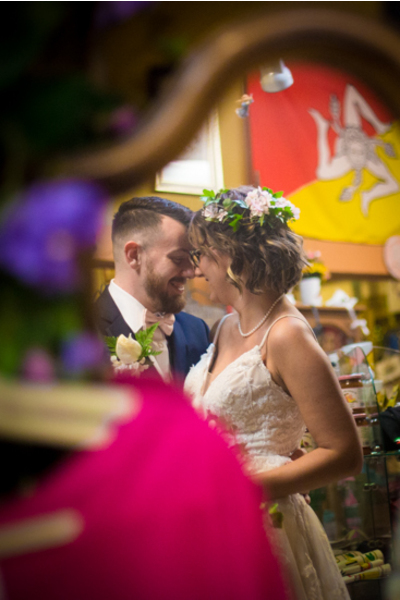 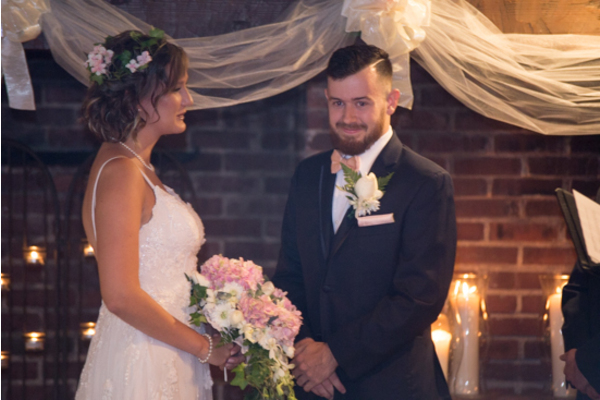 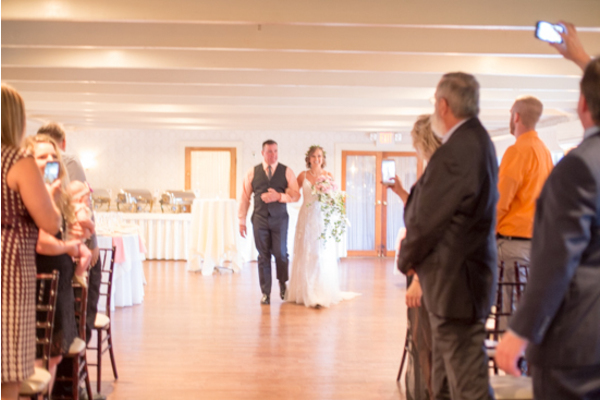 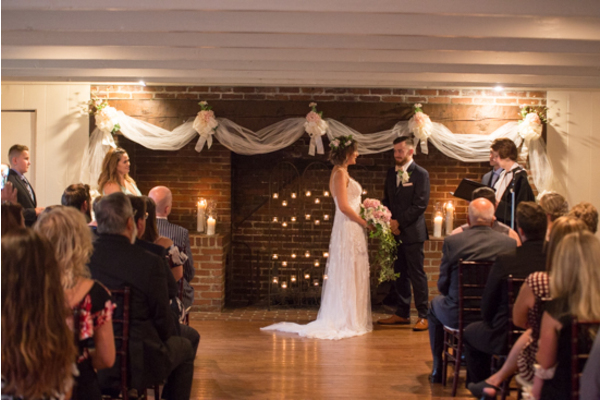 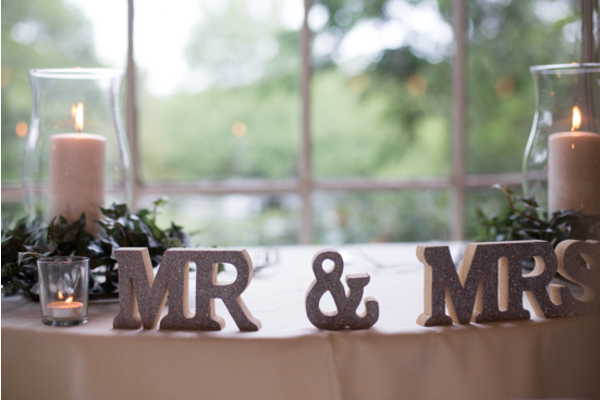 The ceremony room was cozy and the love this couple shared could be felt all around! 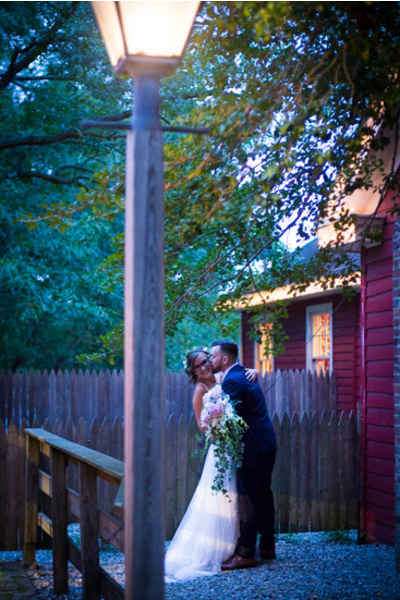 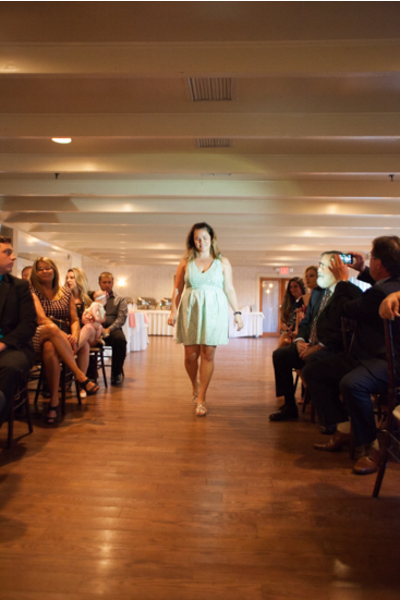 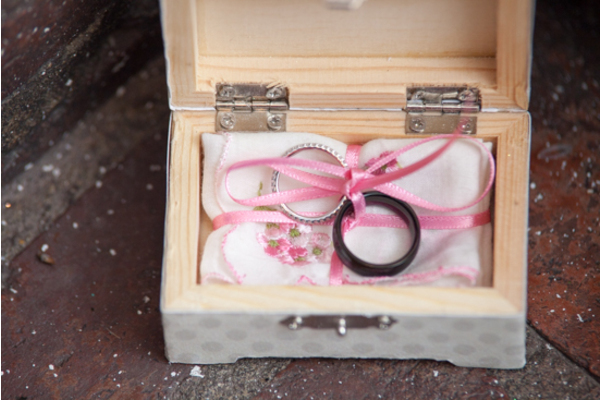 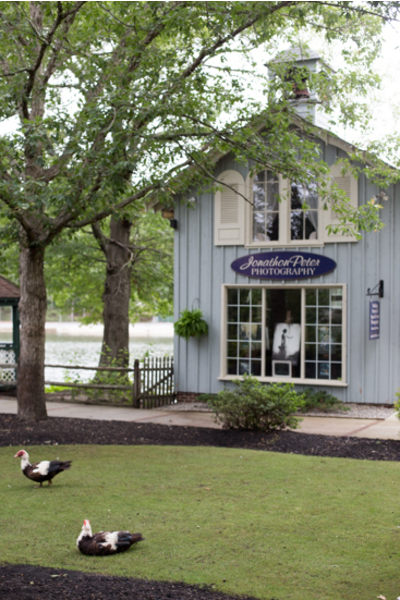 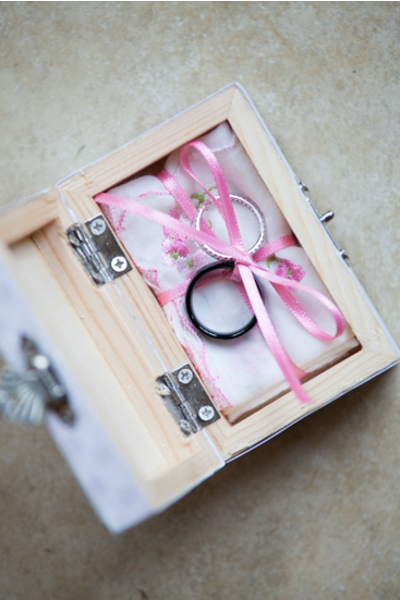 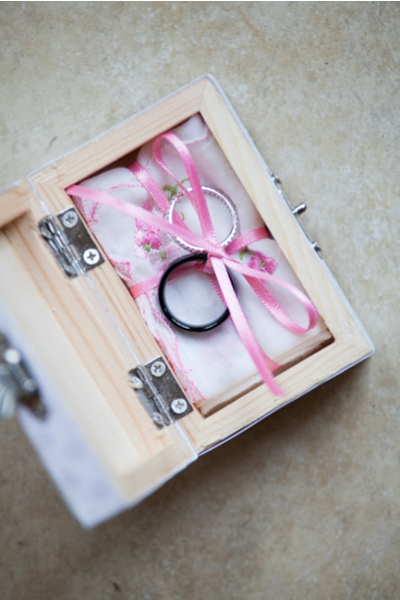 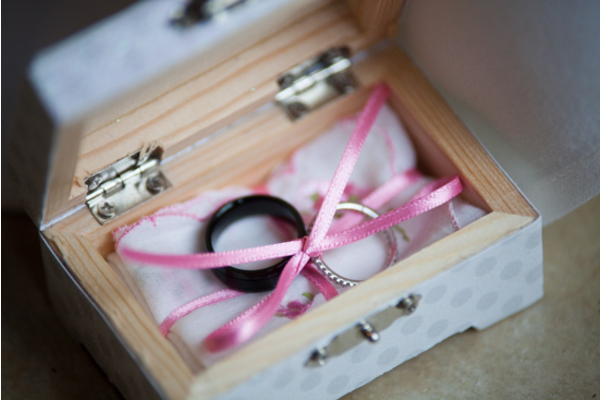 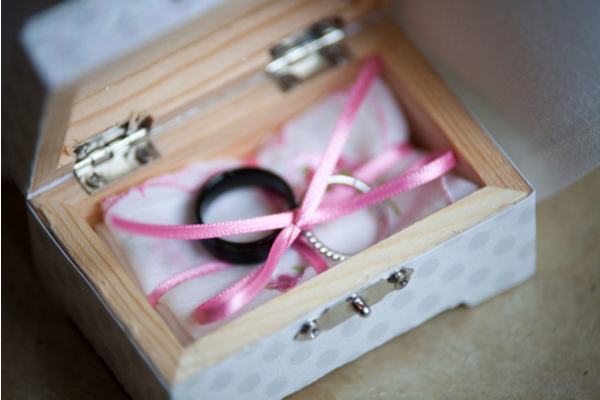 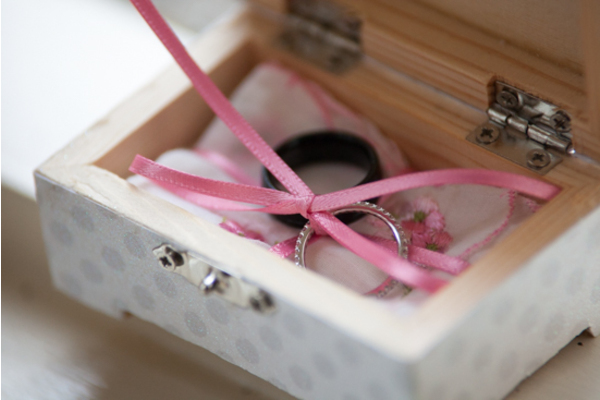 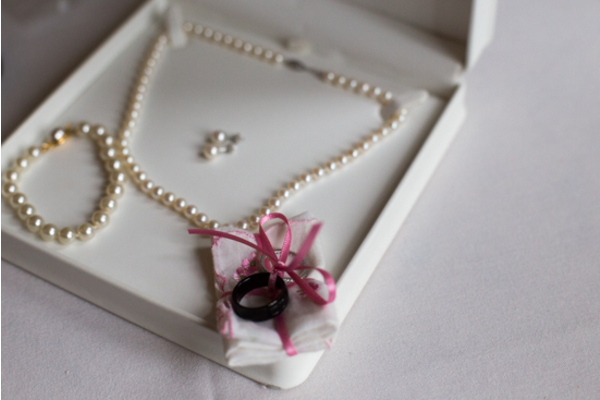 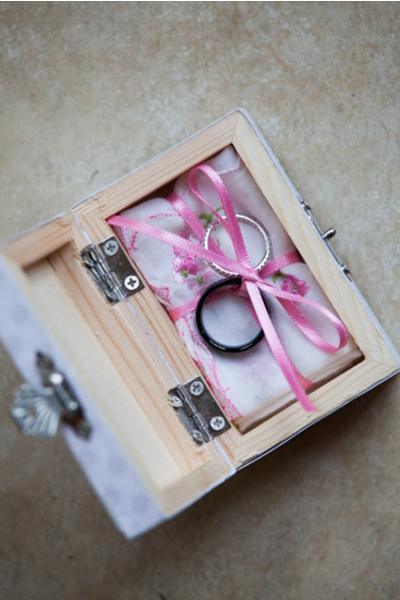 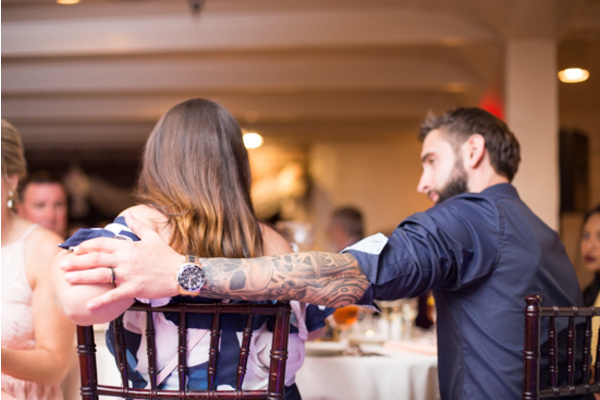 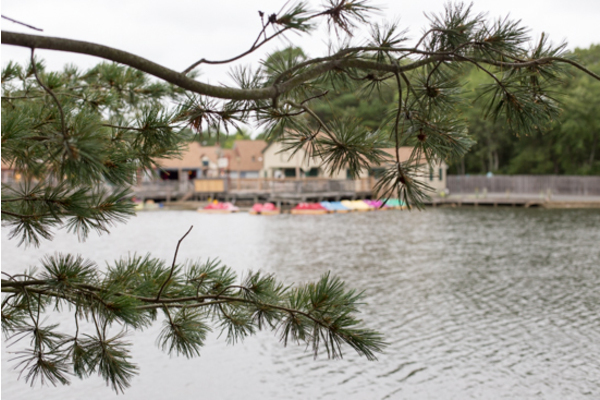 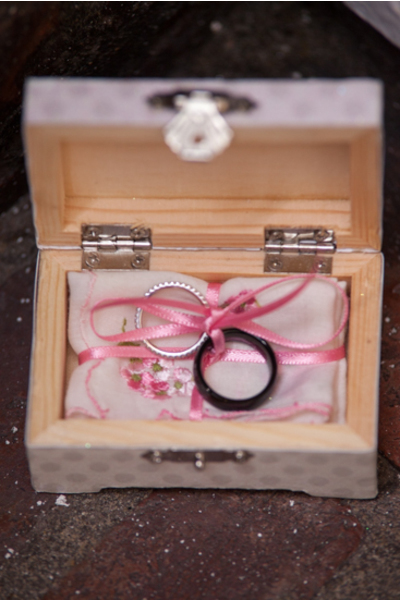 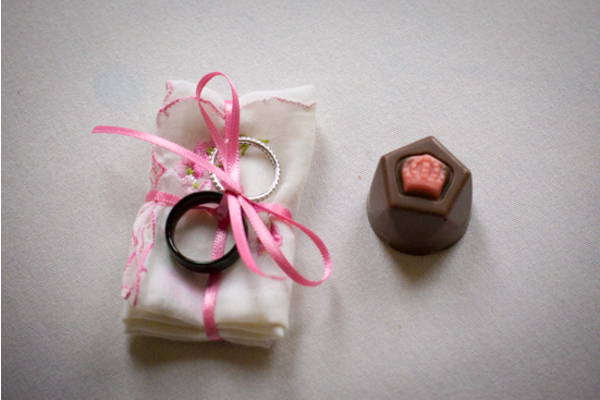 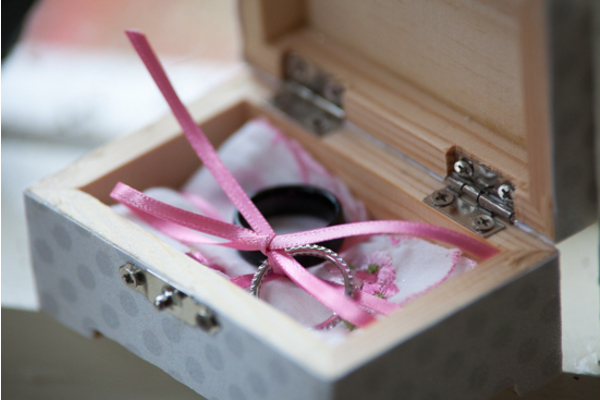 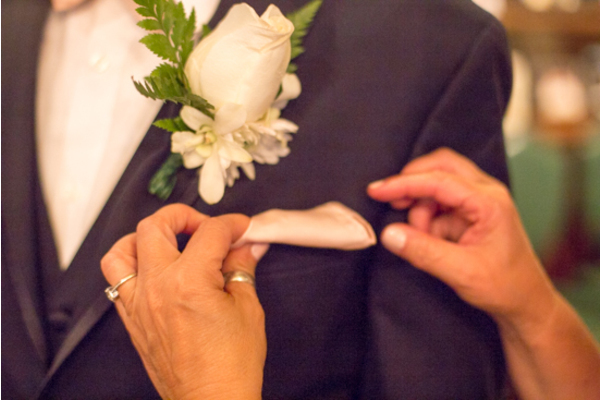 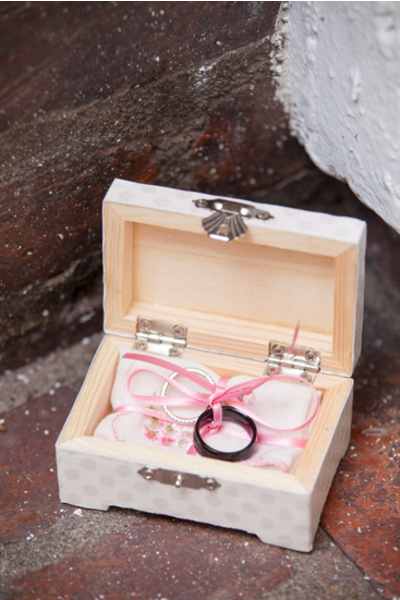 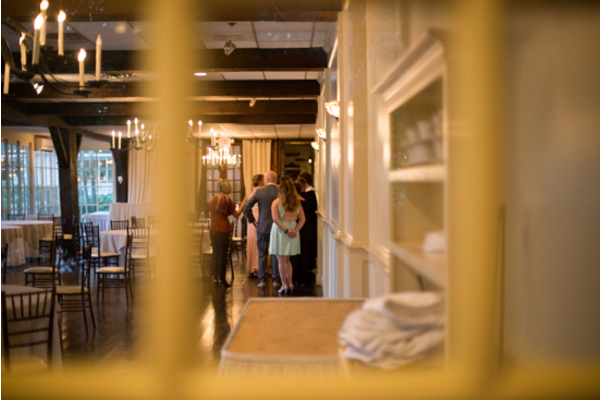 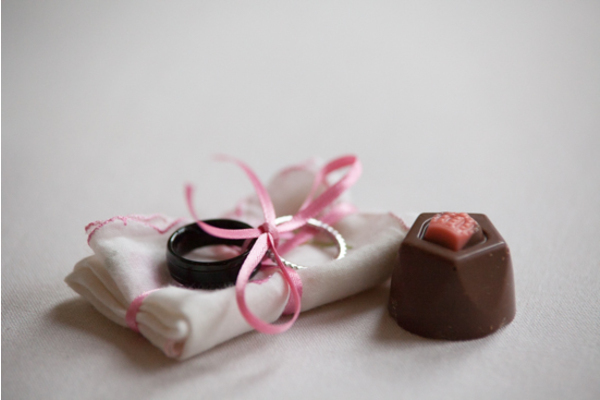 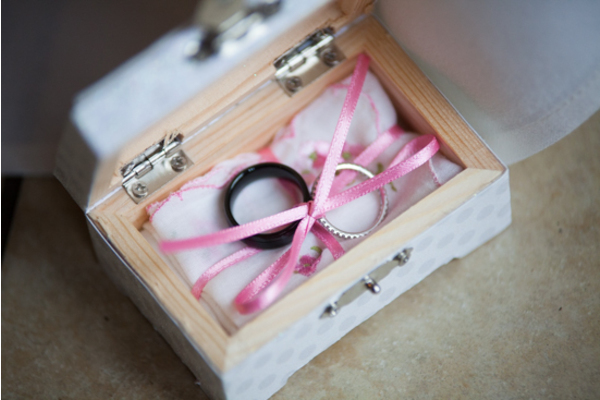 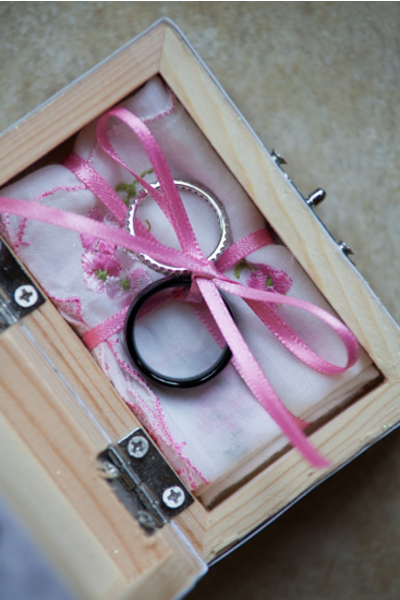 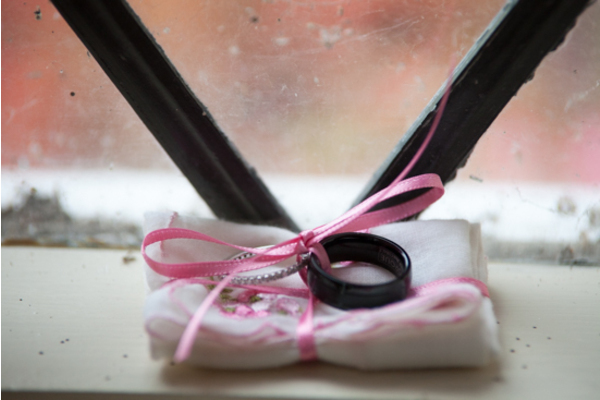 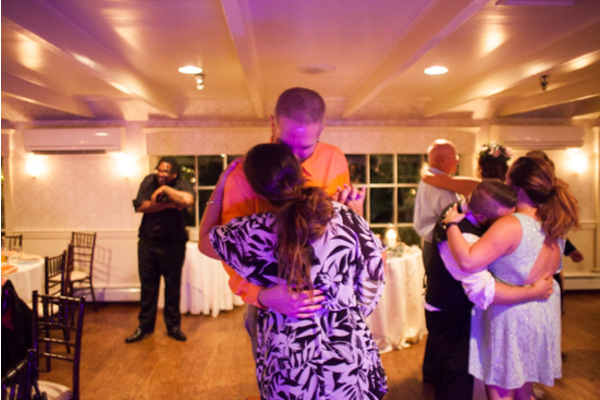 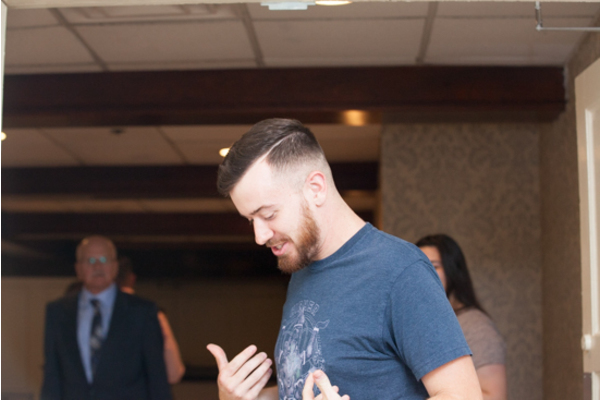 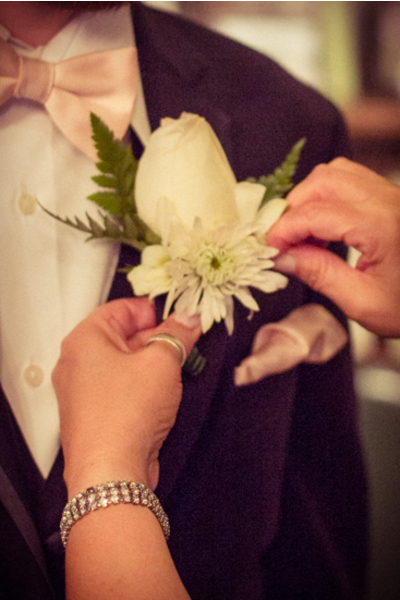 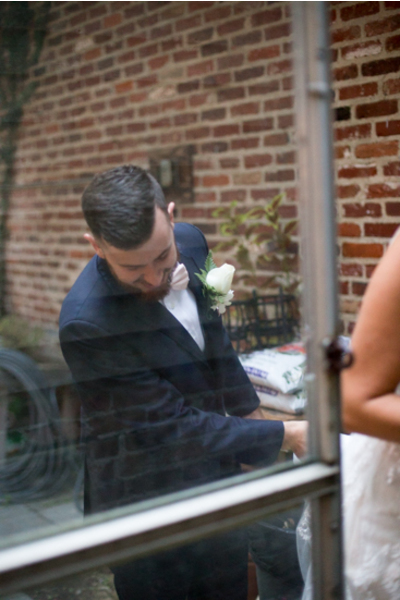 Our NJ Wedding Photographer was there as Danielle and Josh held each others hands and said their vows to one another. 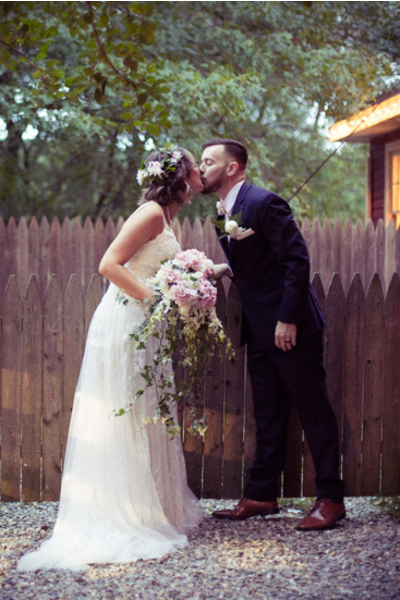 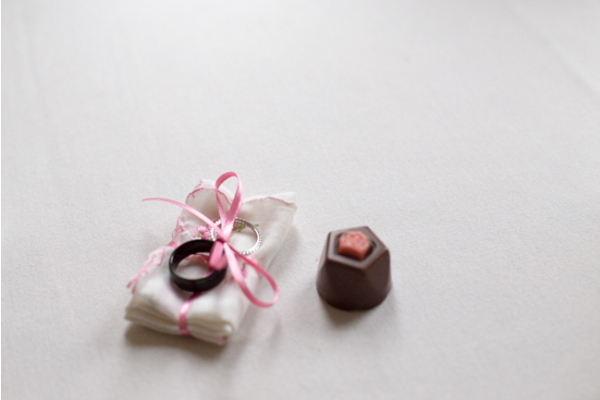 Keeping it short and sweet, they said “I Do” and sealed their love with a kiss! 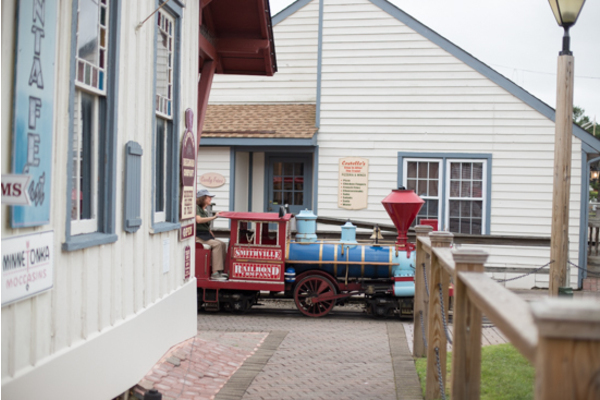 Followed by the ceremony, they made Smithville their portrait playground. 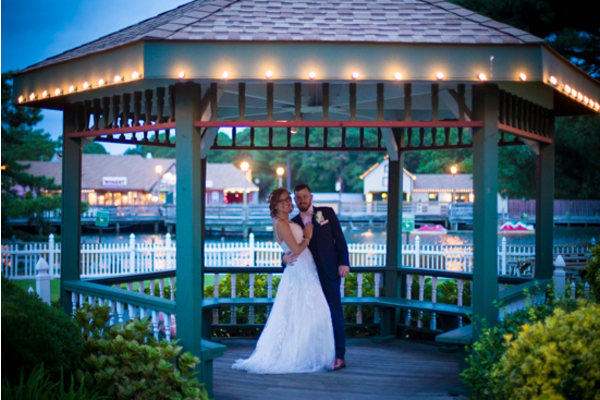 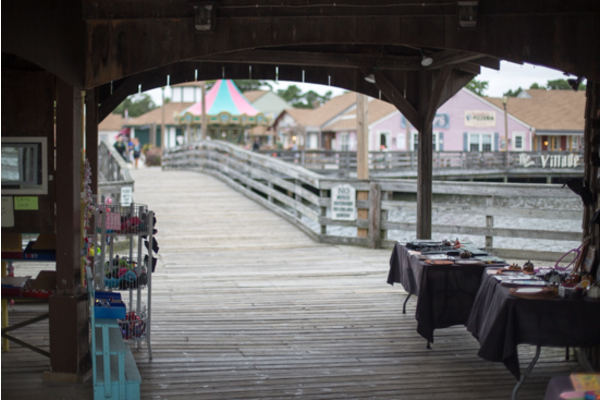 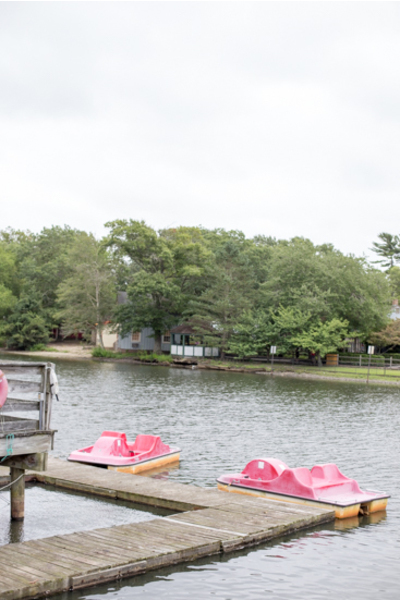 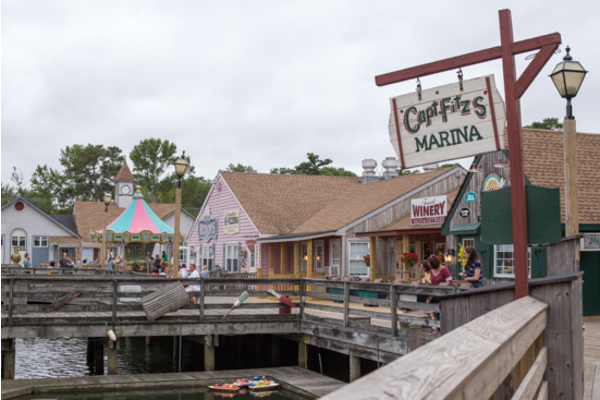 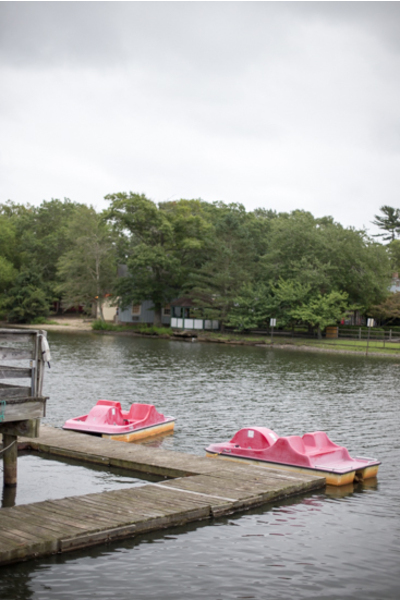 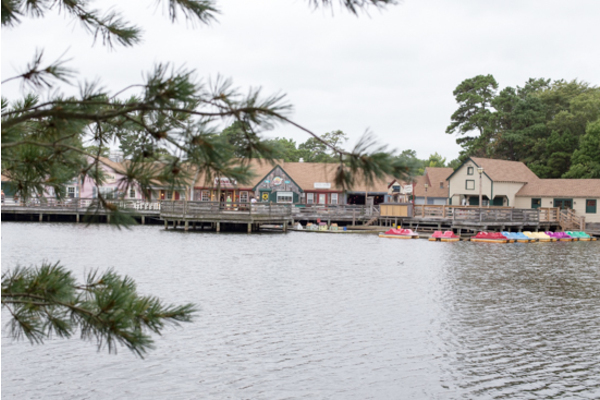 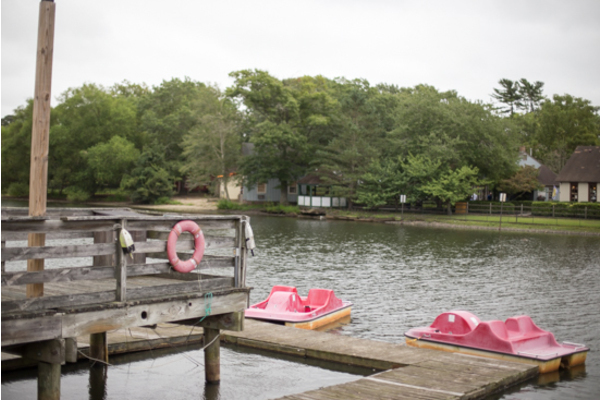 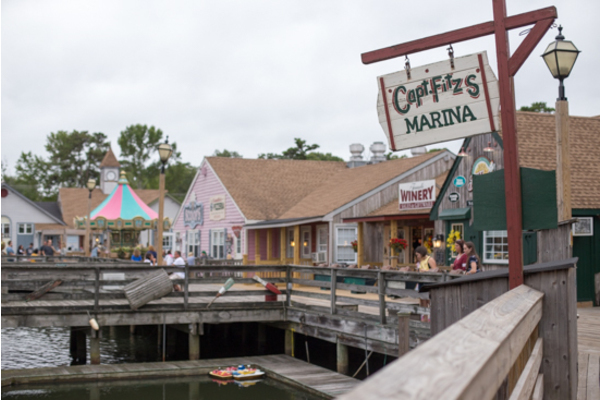 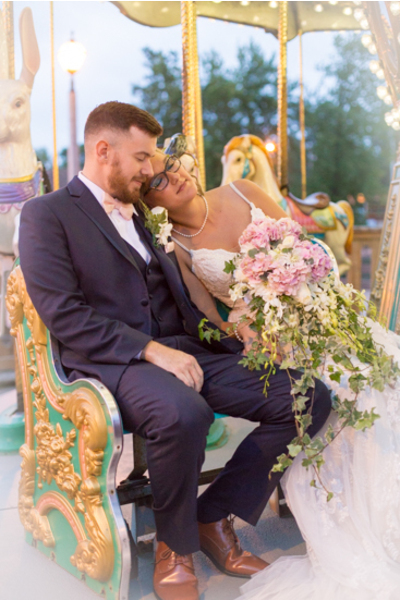 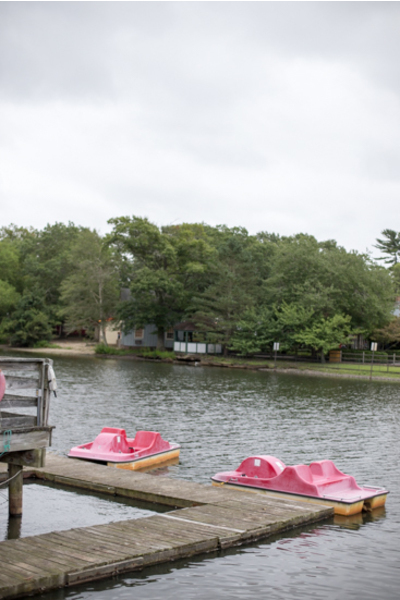 They got amazing shots on the carousel, on the bridge, and in front of the lake all lite up with twinkle lights! 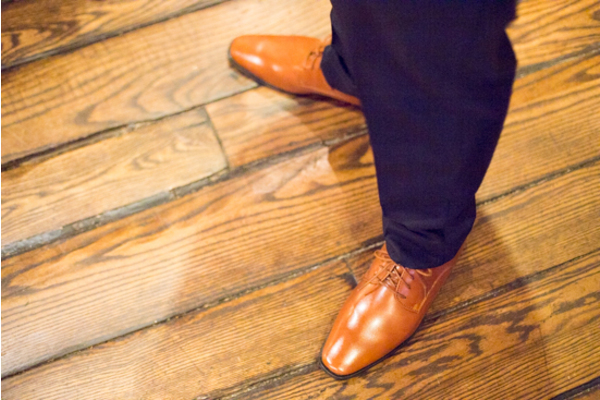 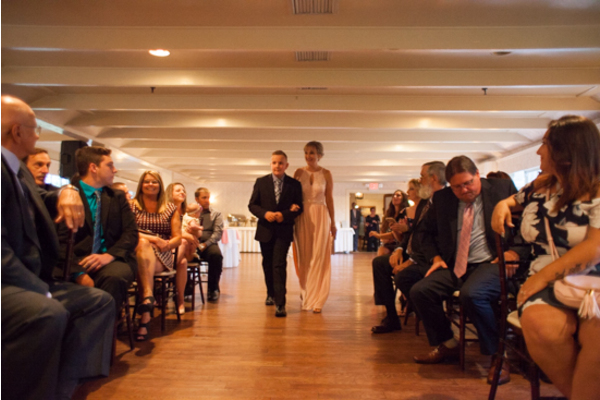 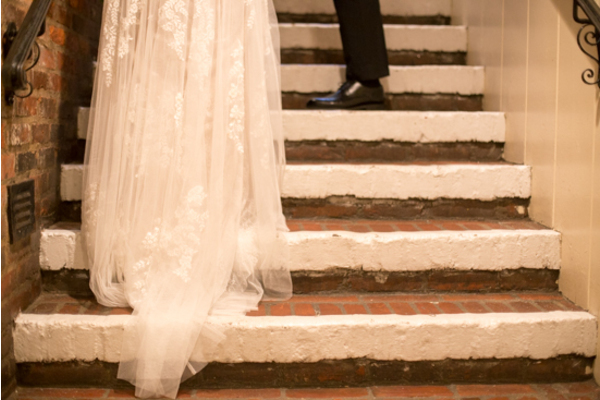 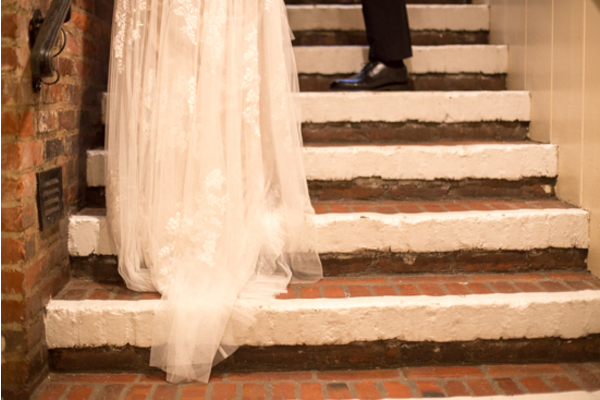 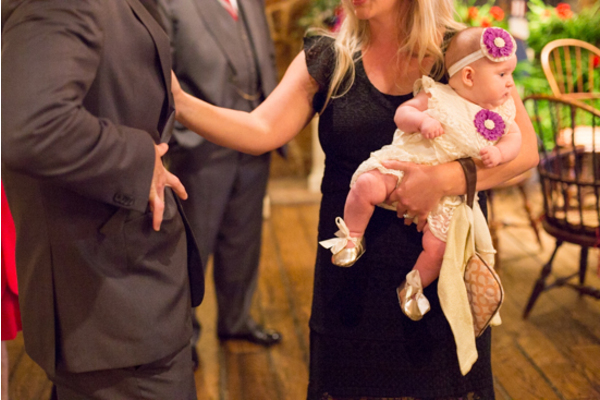 These lovebirds made their grand entrance into the reception and they got the party started! 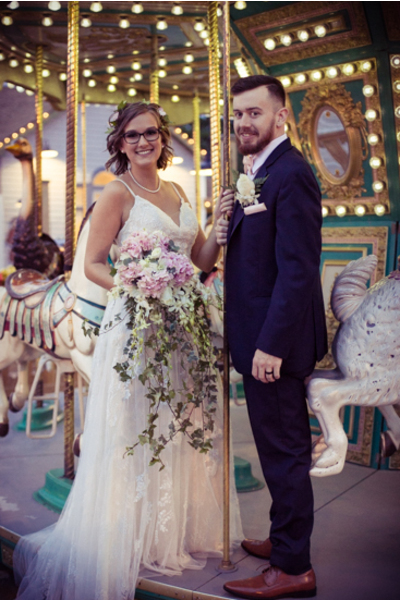 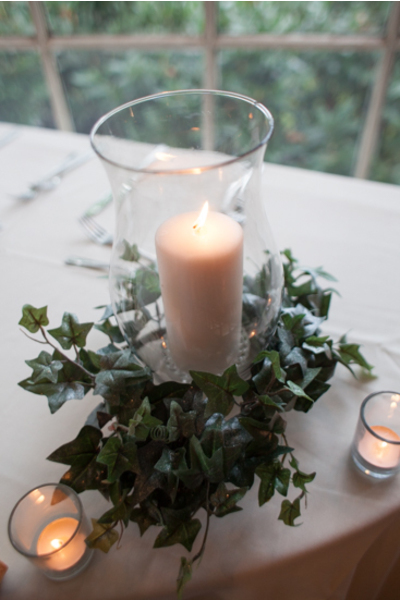 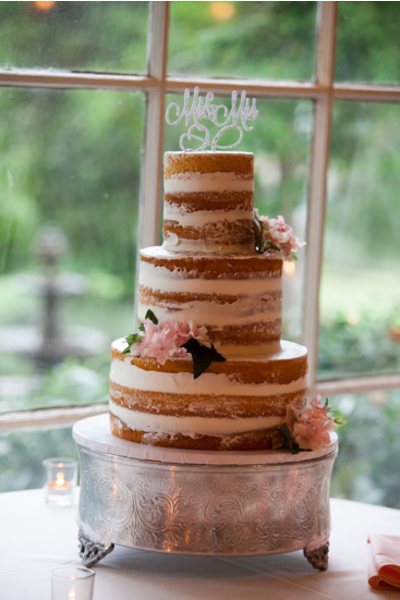 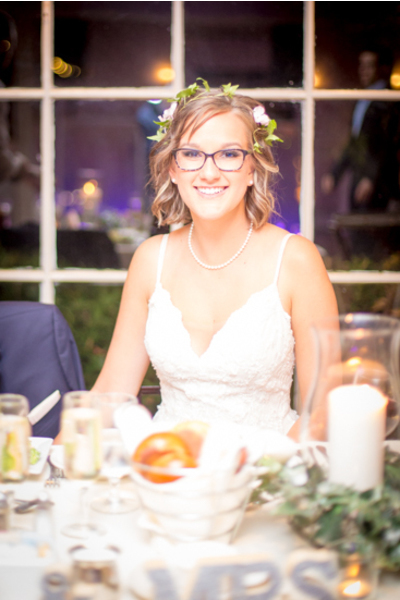 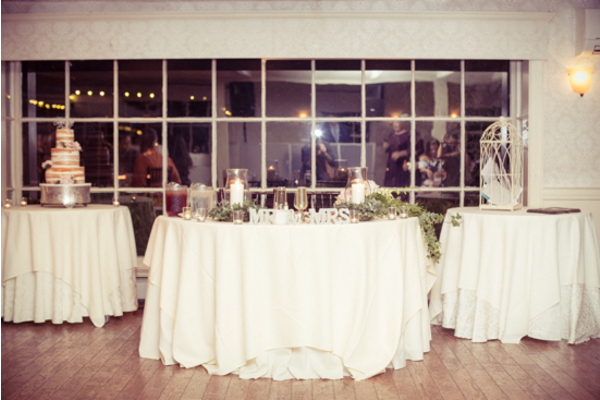 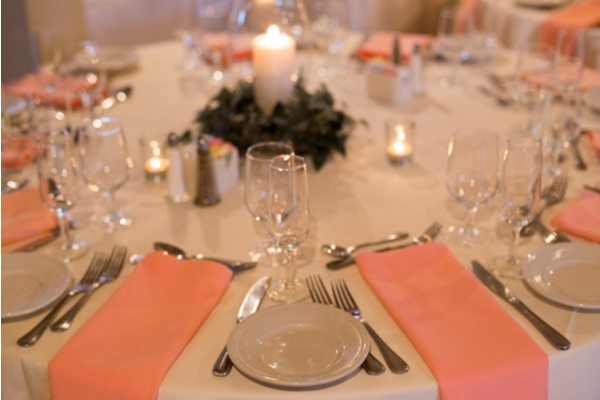 Their sweetheart table was decorated in white with a touch of greenery and pink florals. 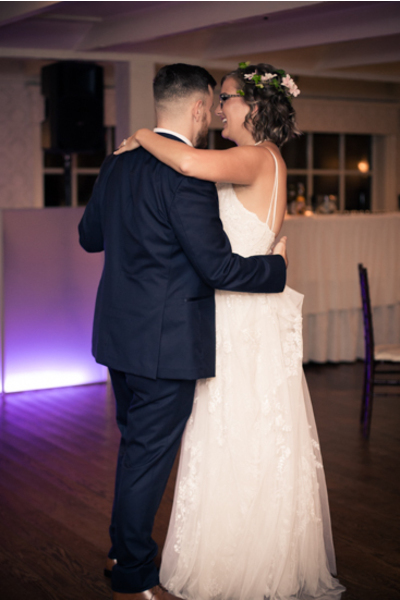 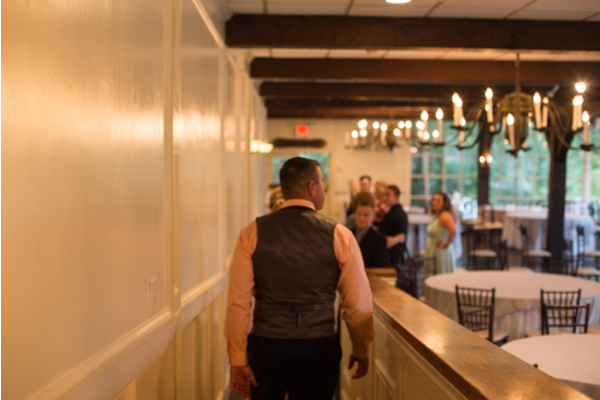 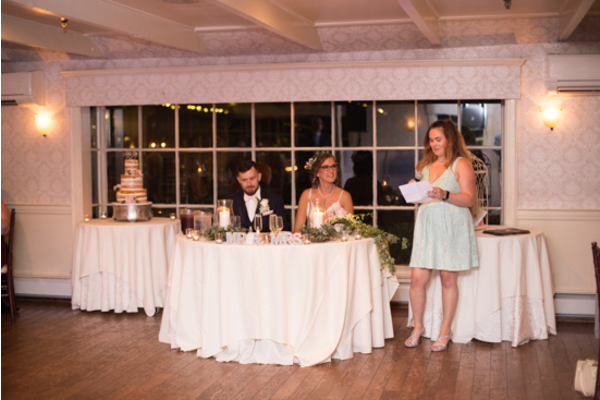 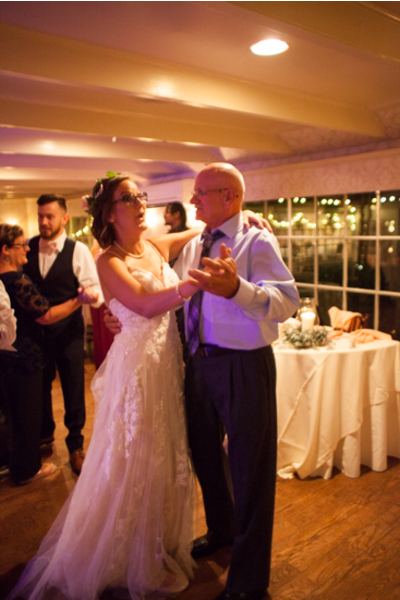 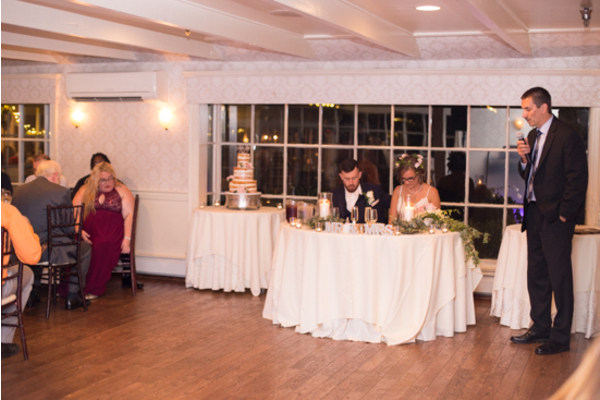 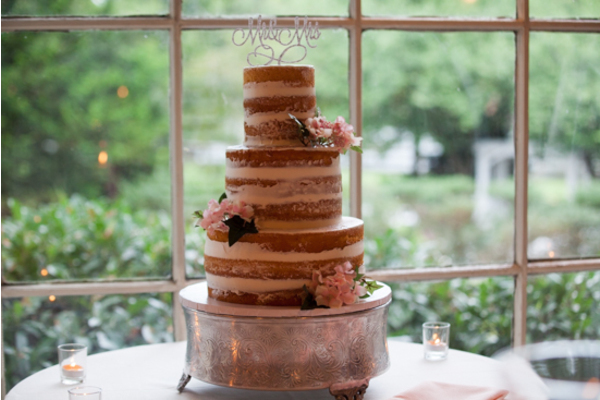 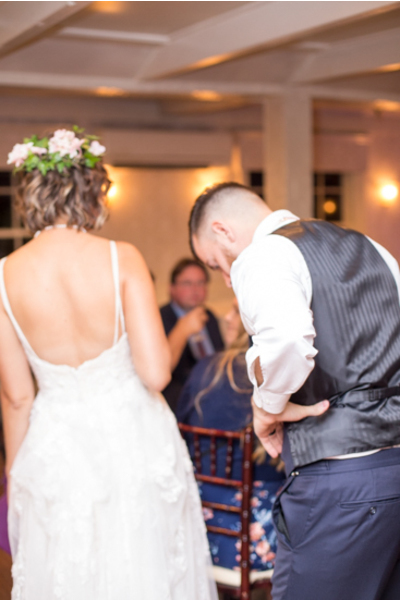 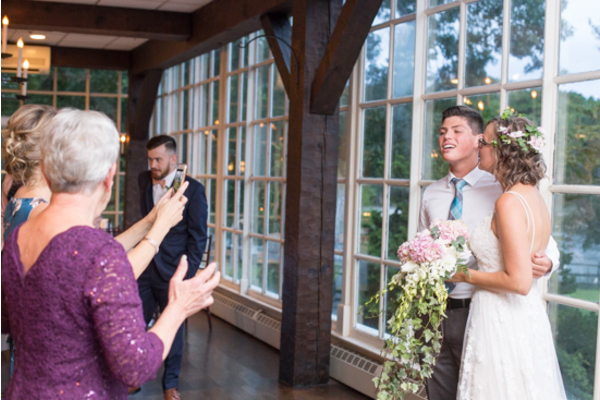 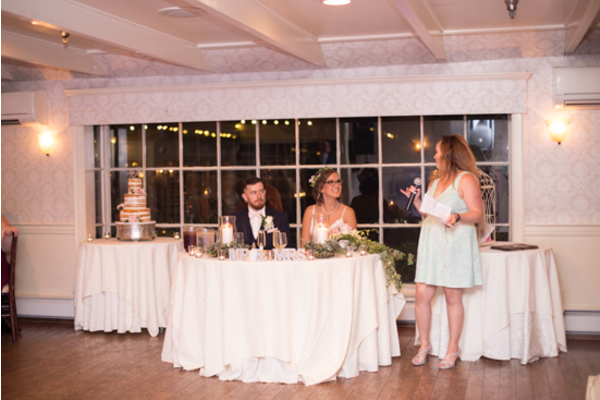 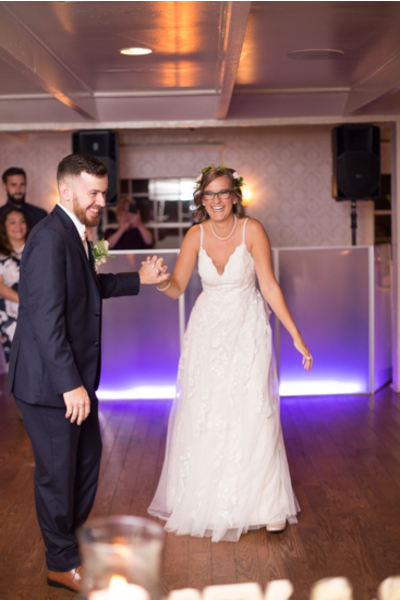 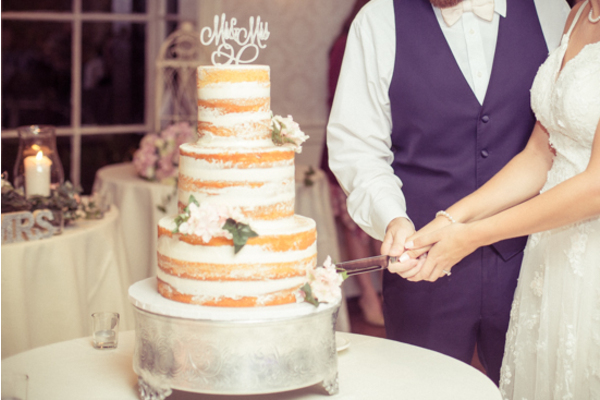 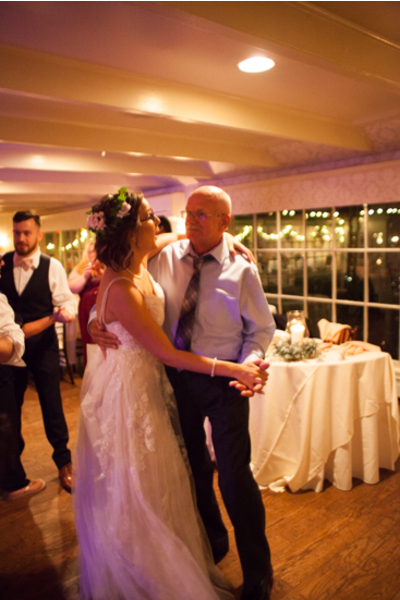 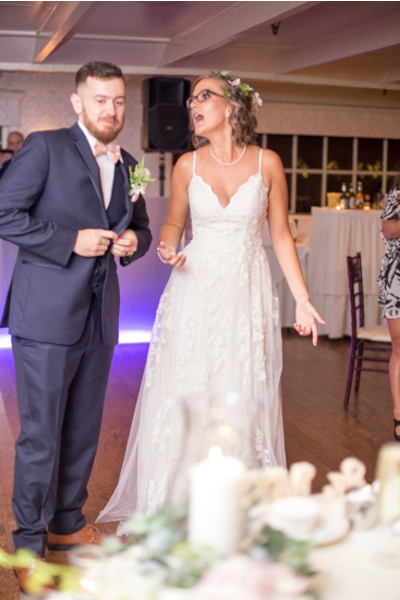 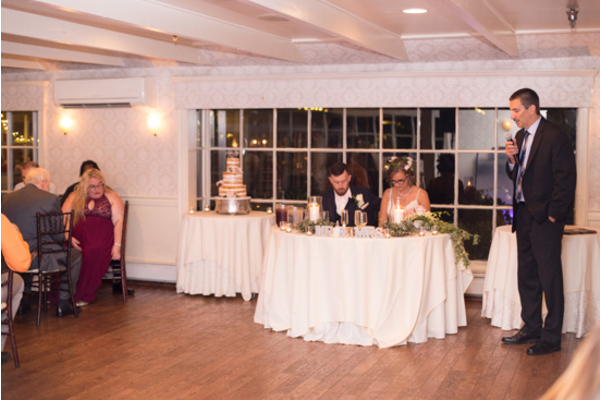 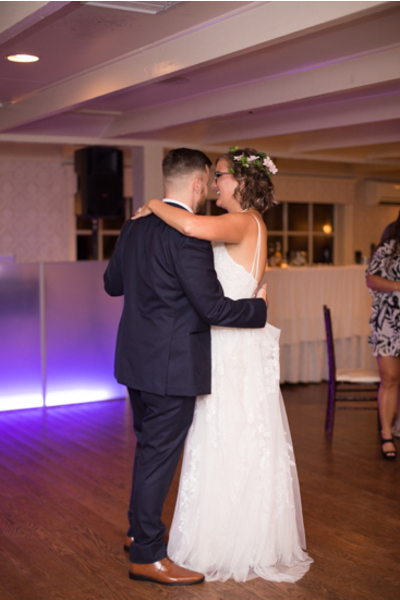 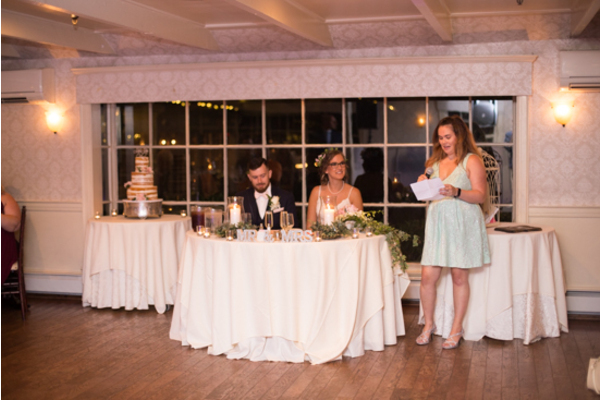 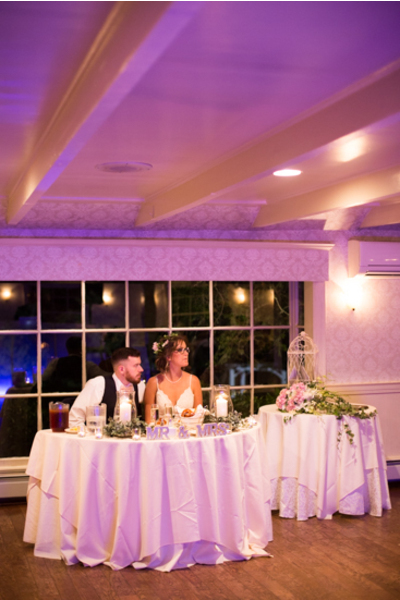 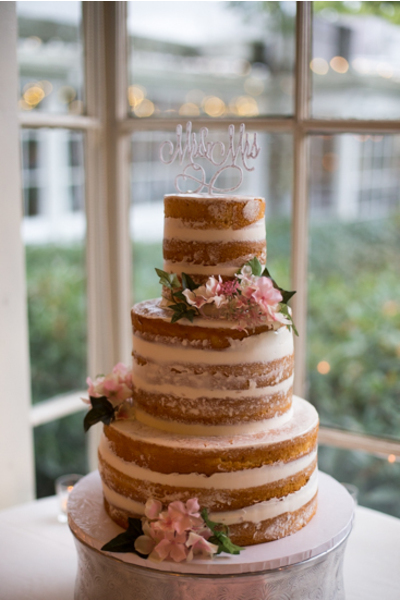 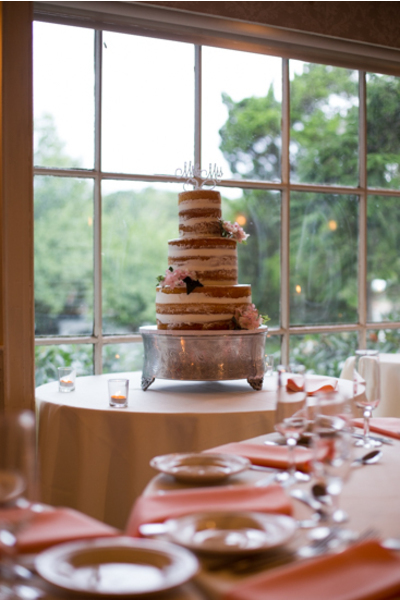 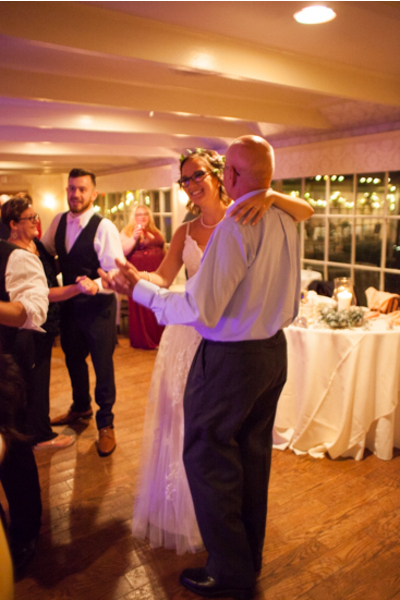 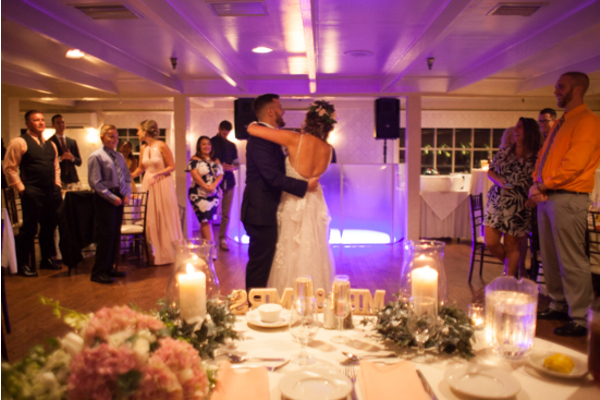 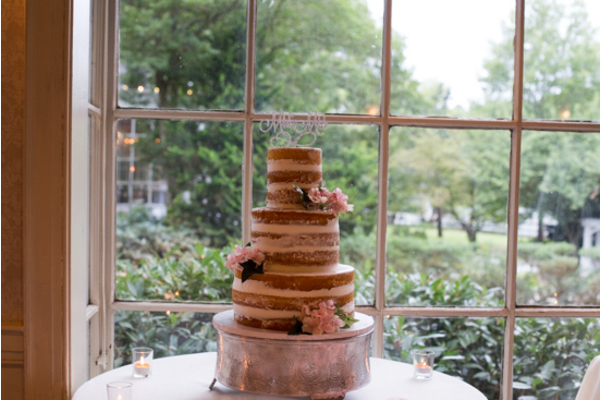 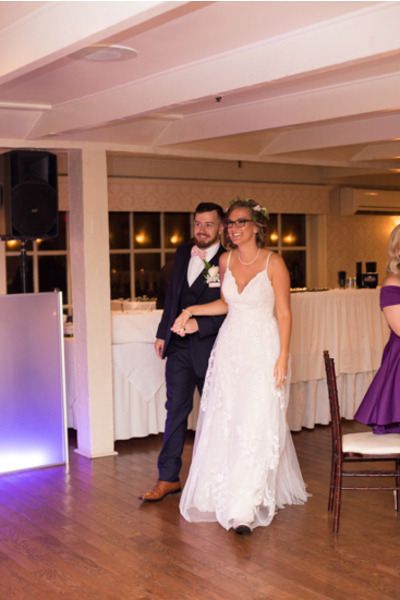 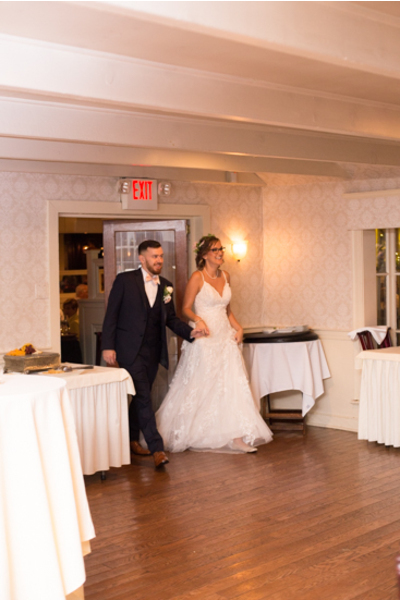 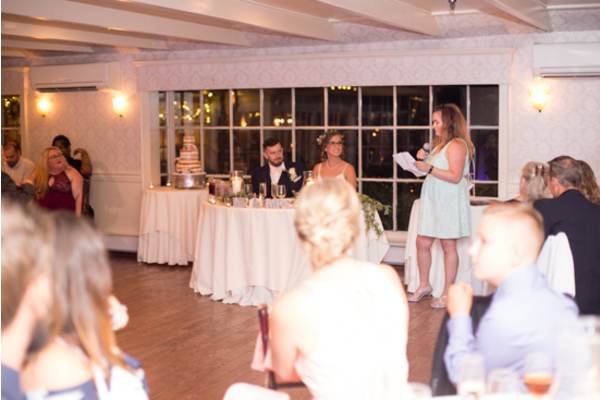 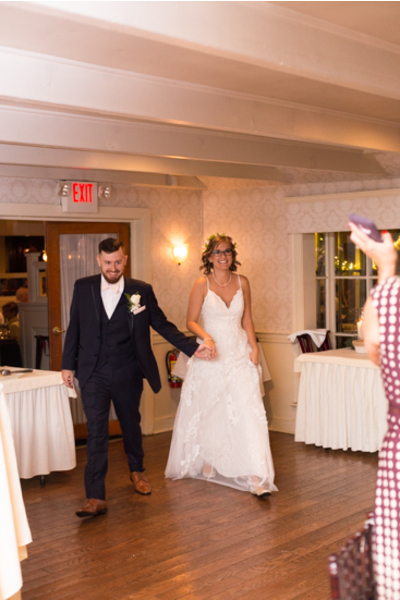 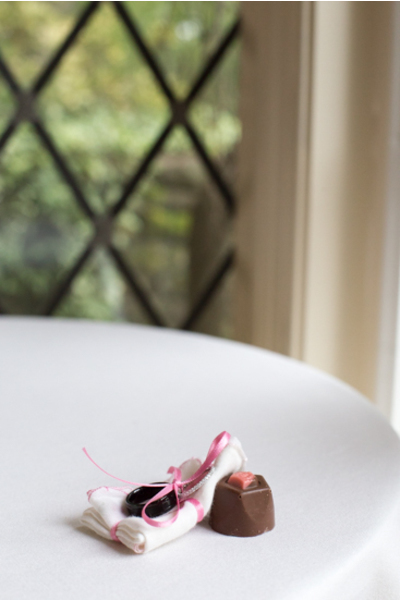 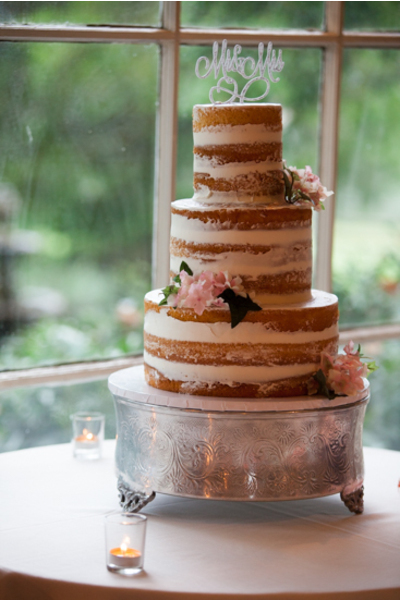 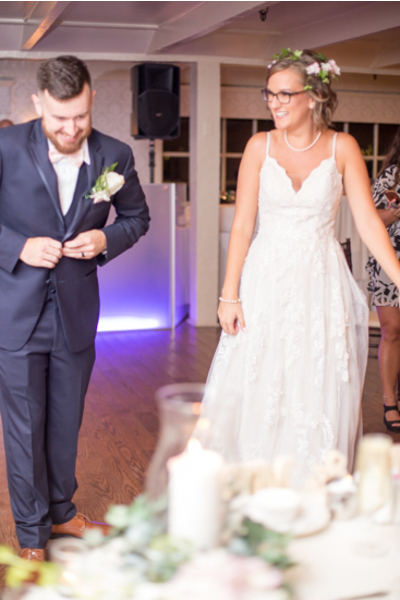 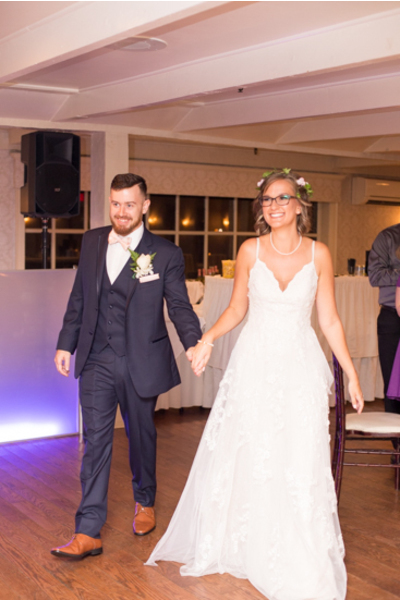 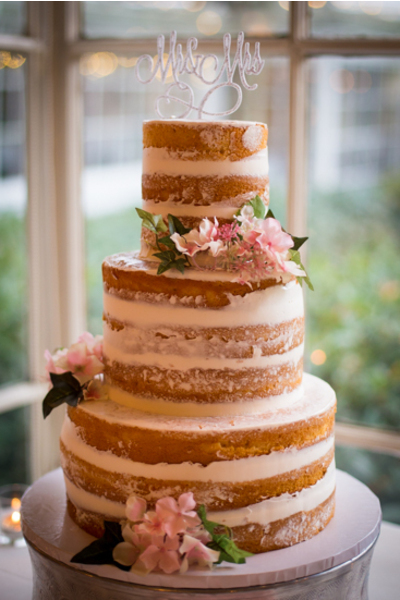 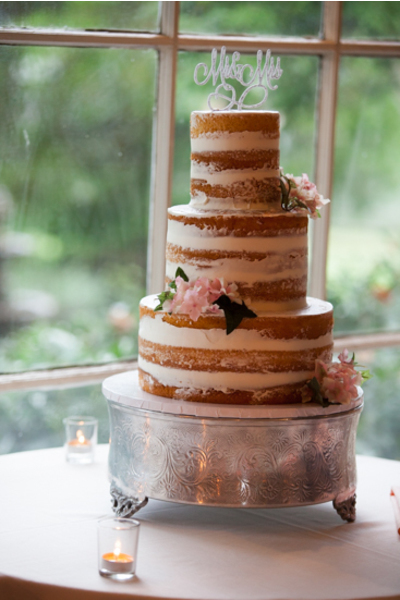 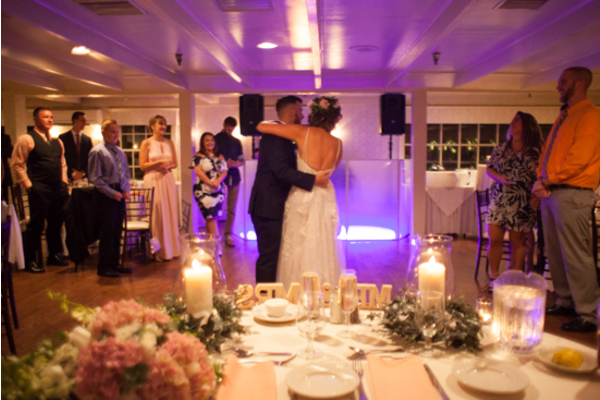 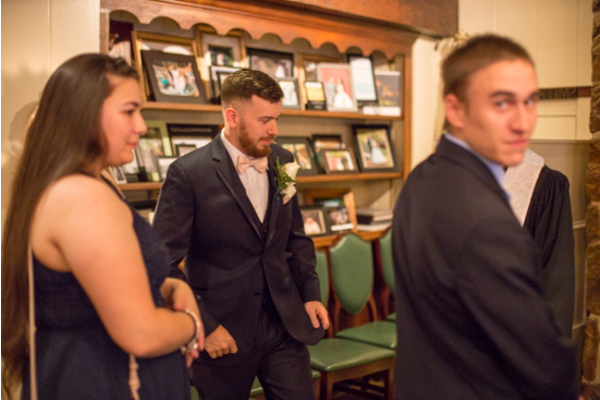 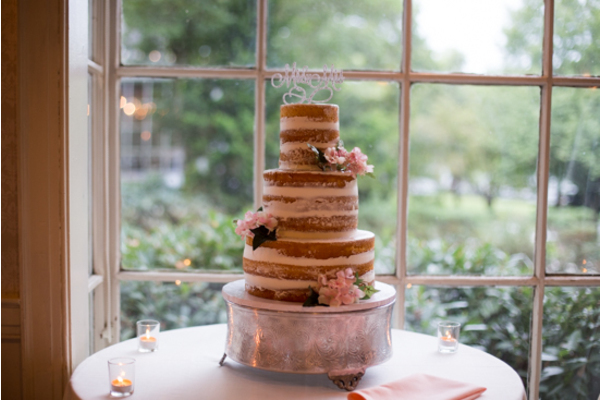 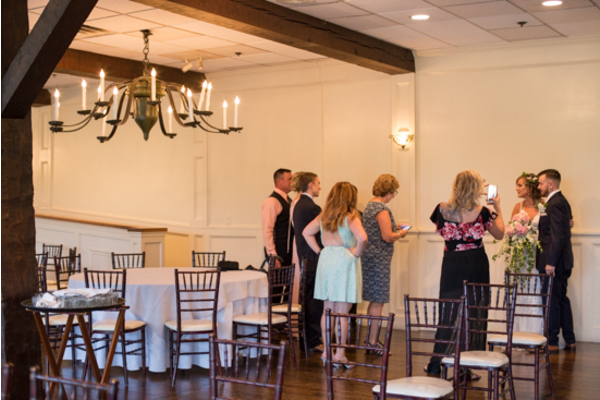 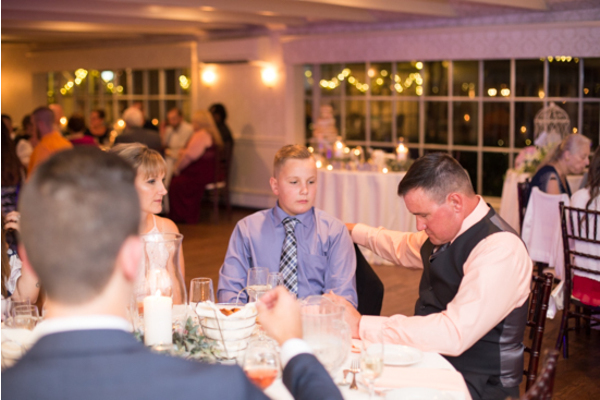 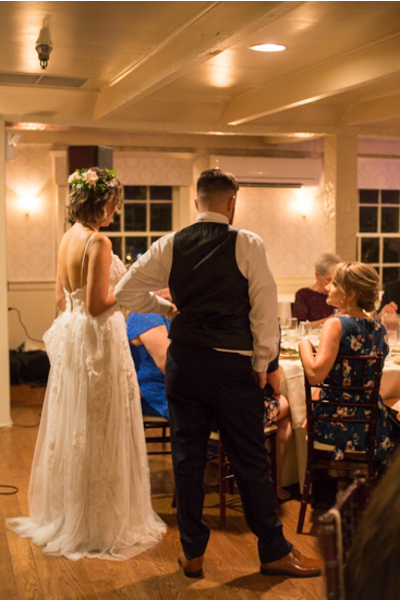 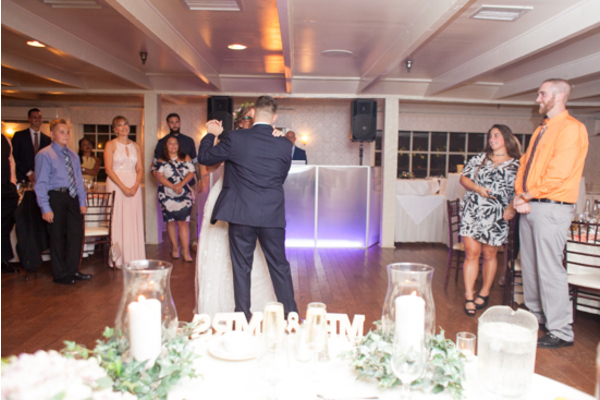 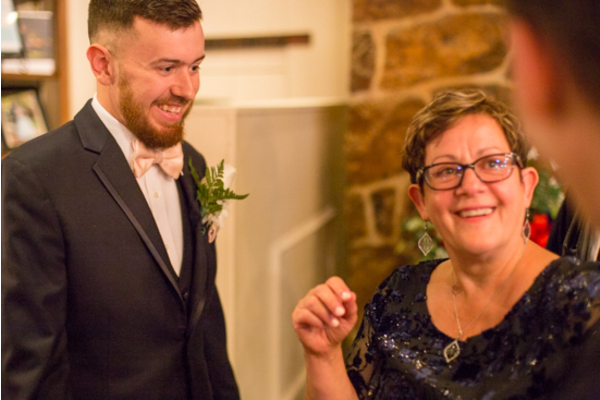 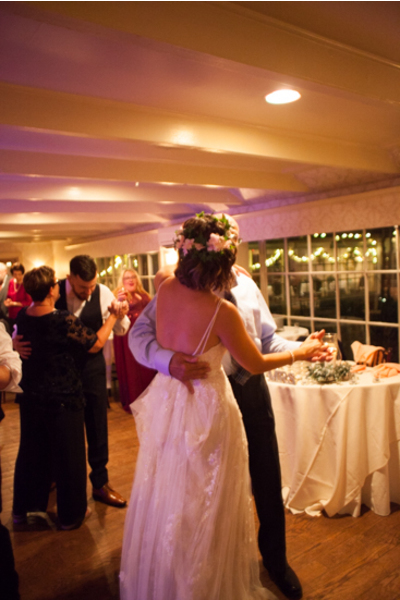 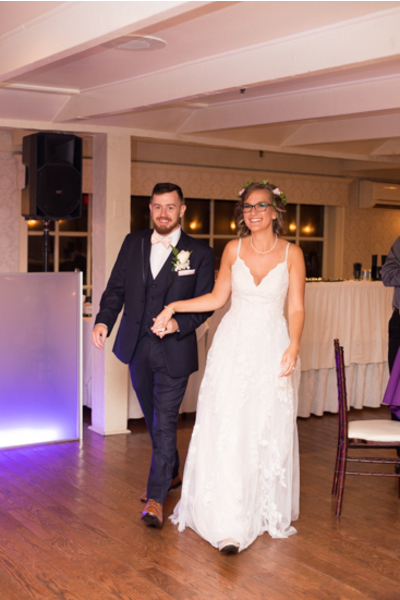 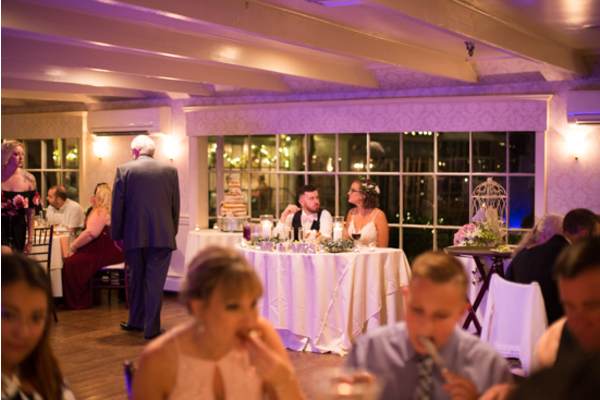 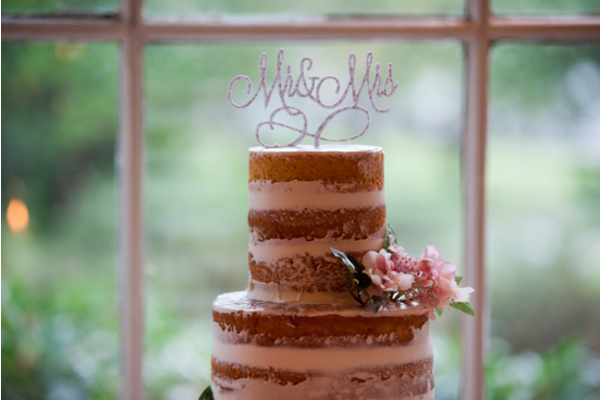 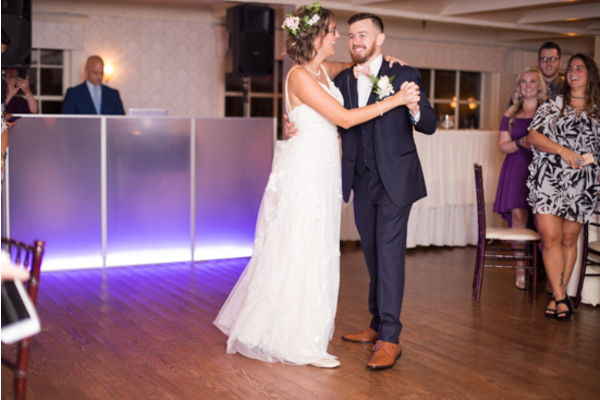 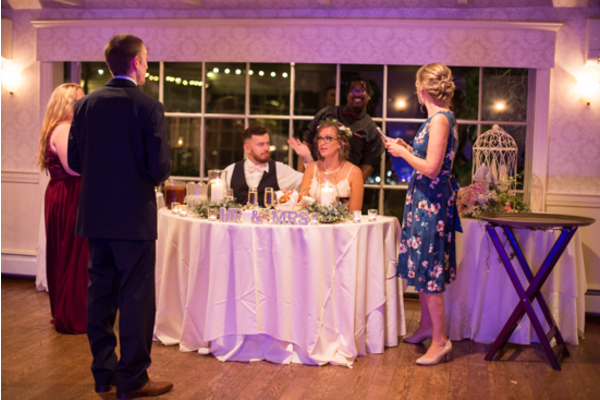 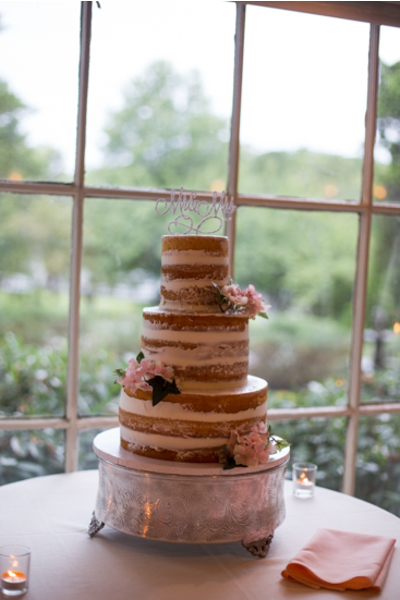 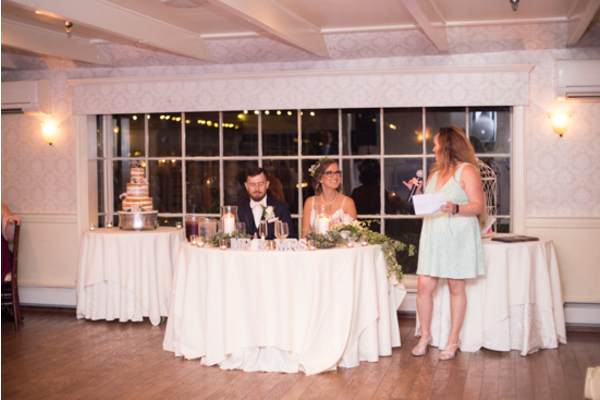 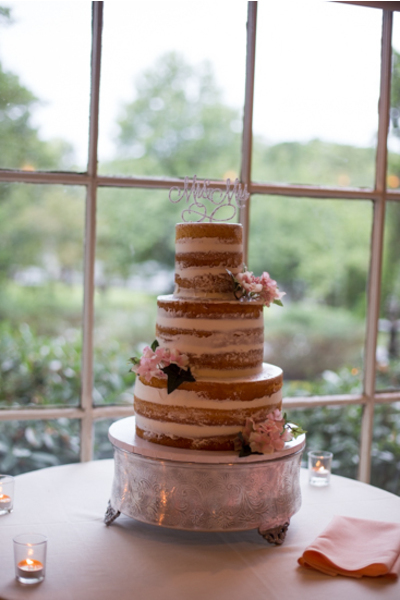 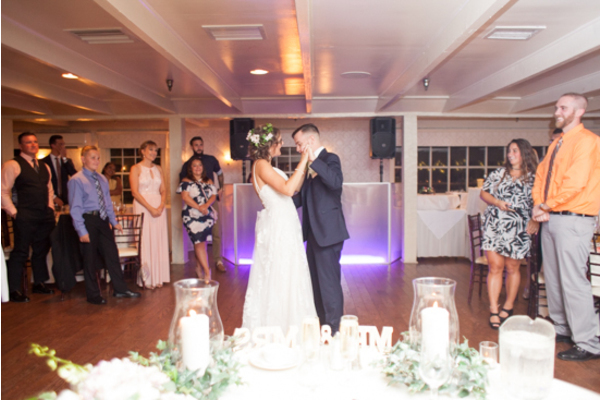 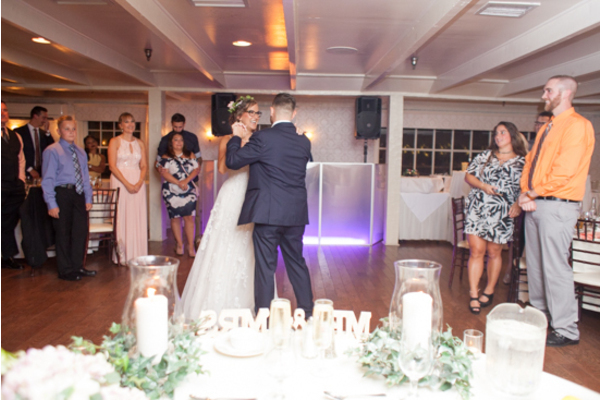 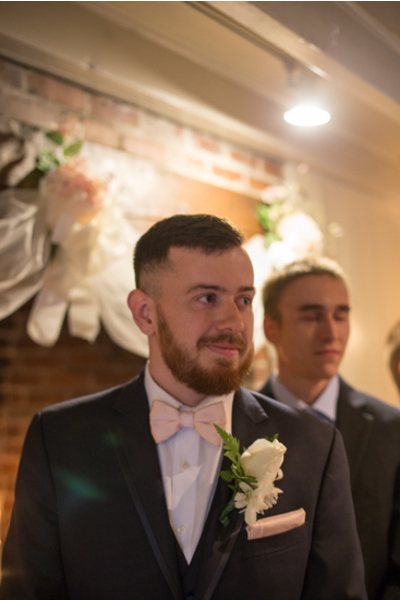 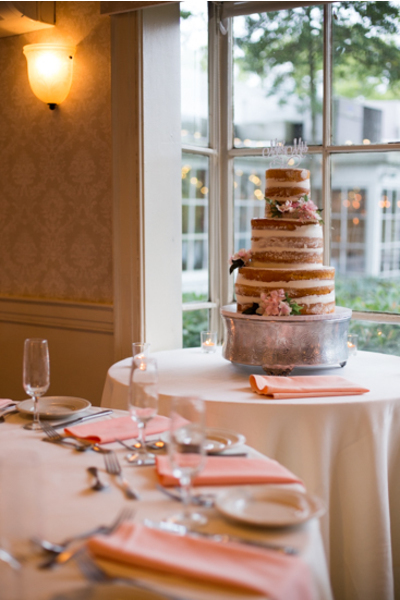 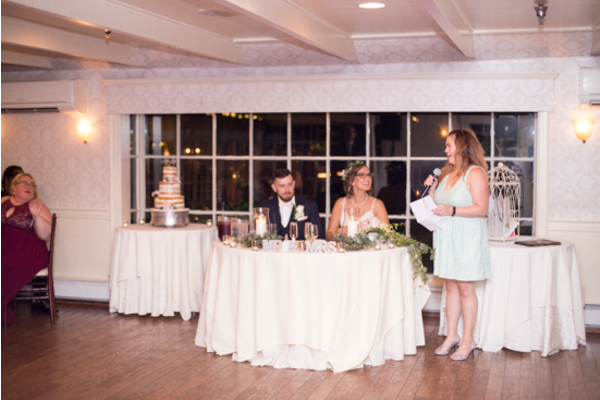 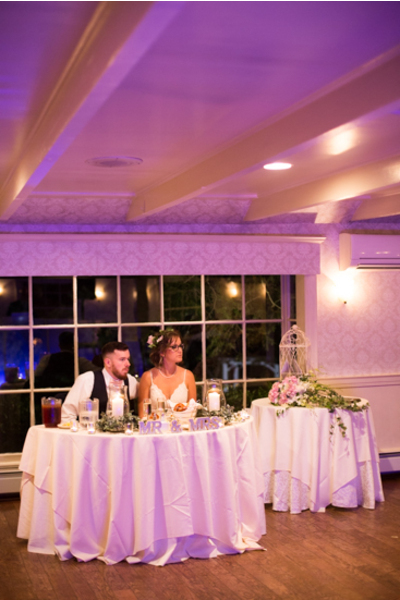 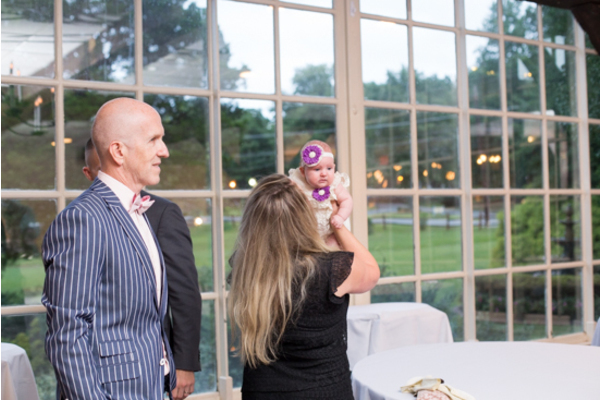 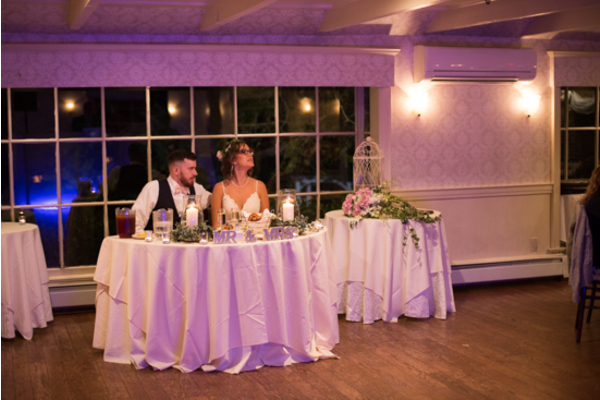 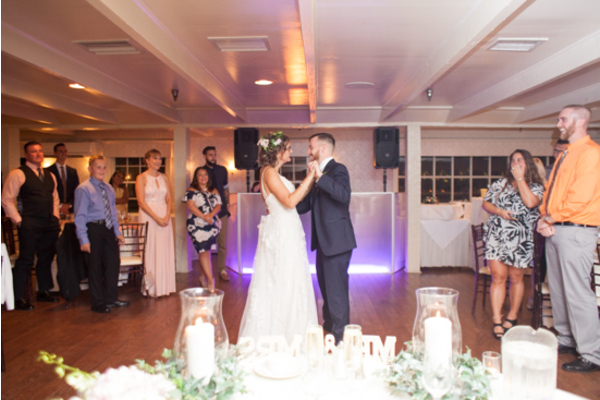 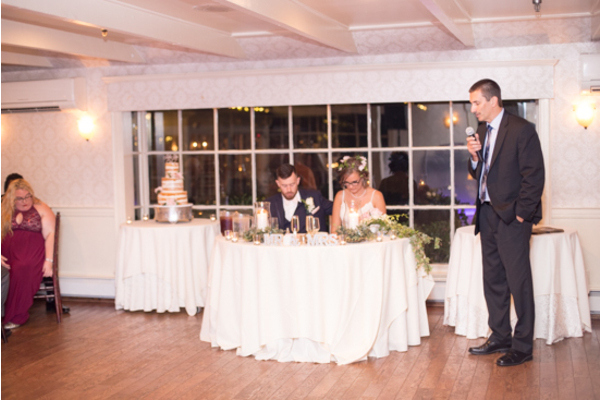 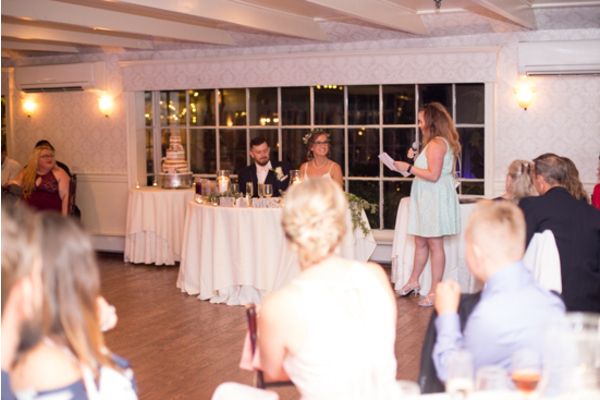 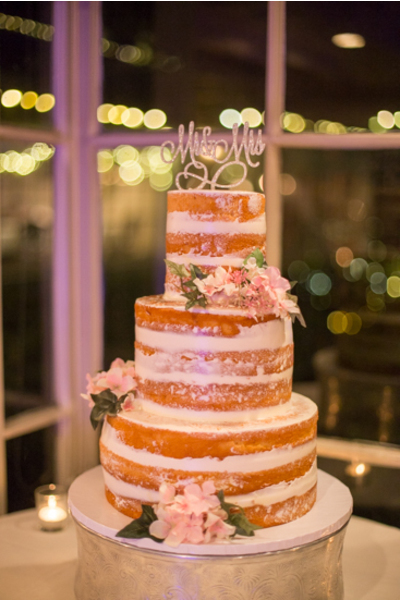 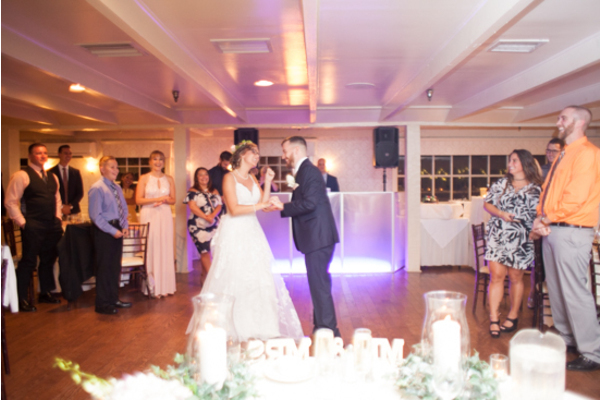 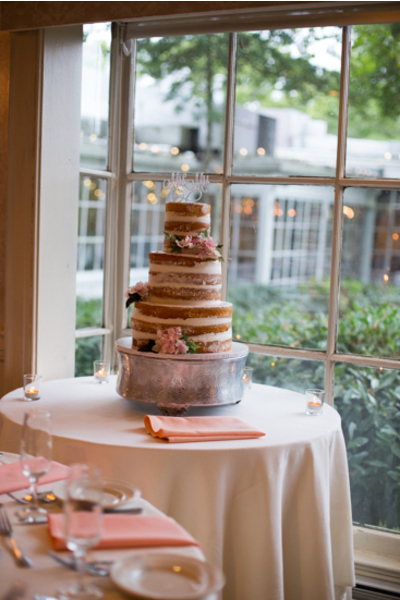 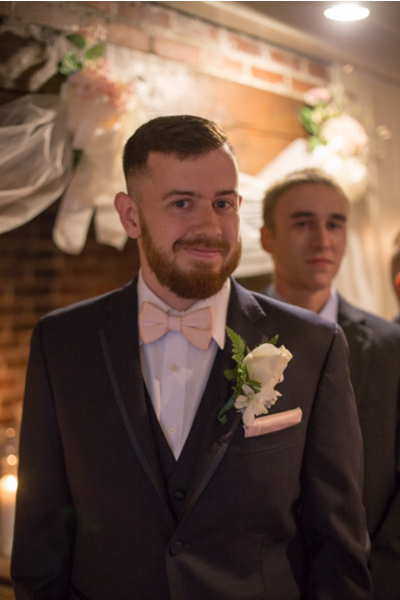 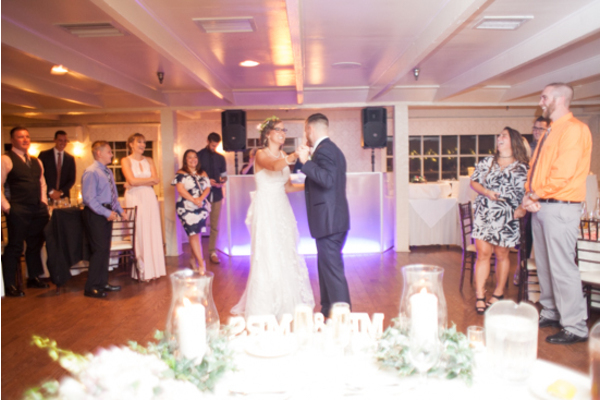 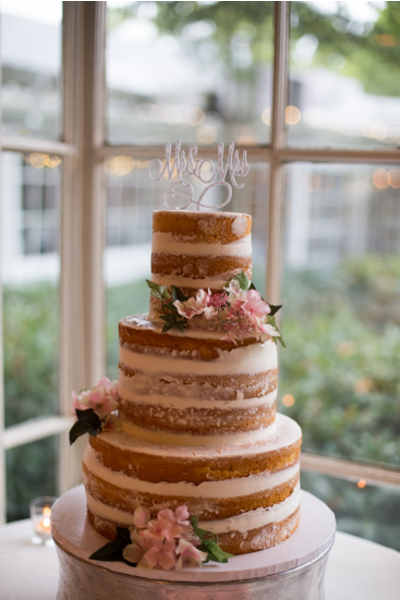 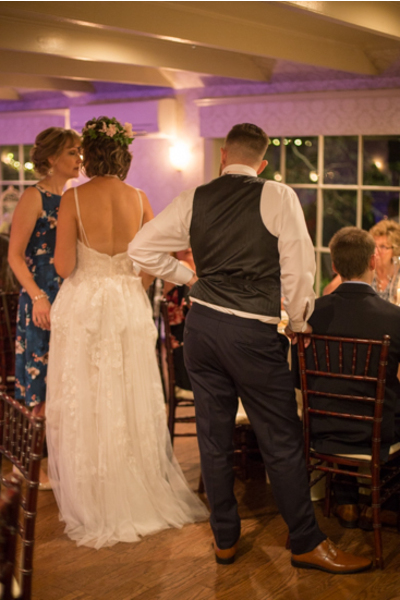 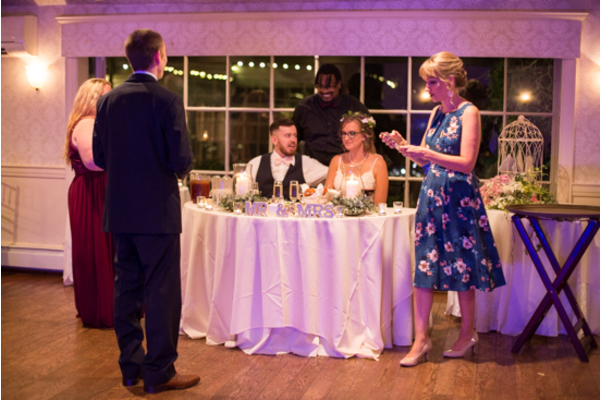 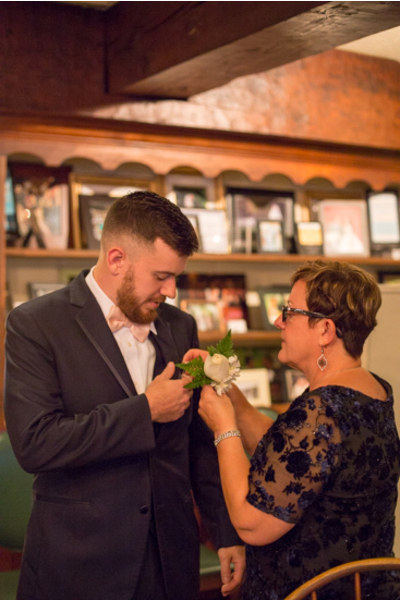 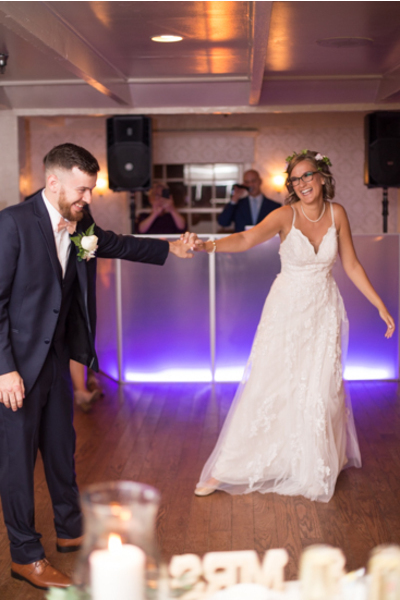 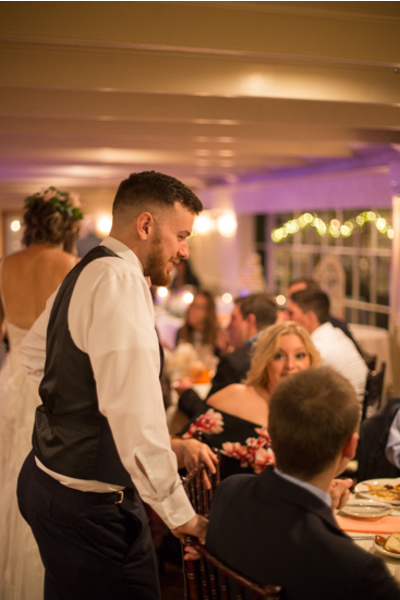 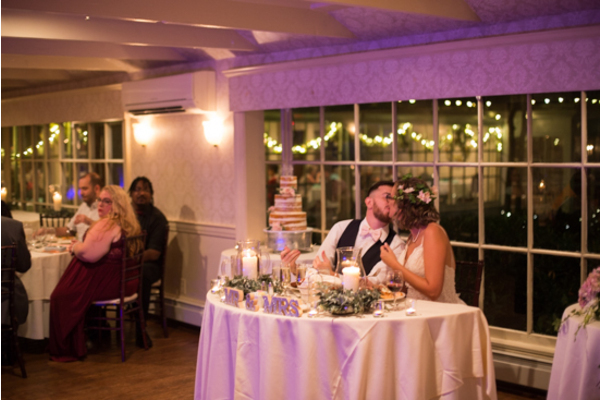 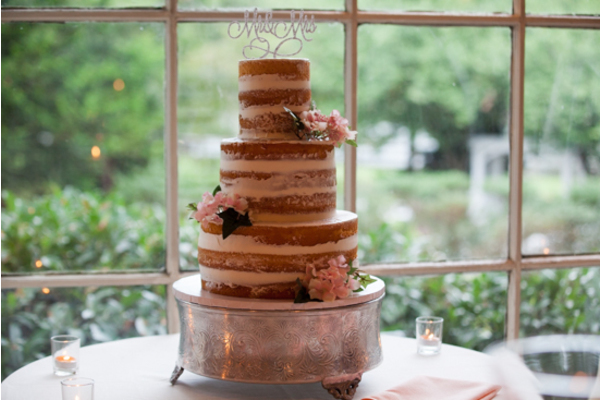 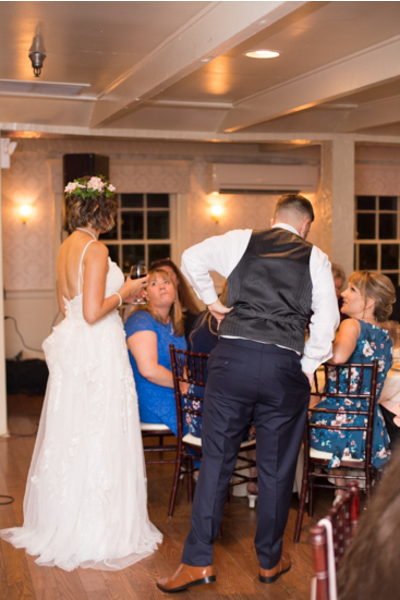 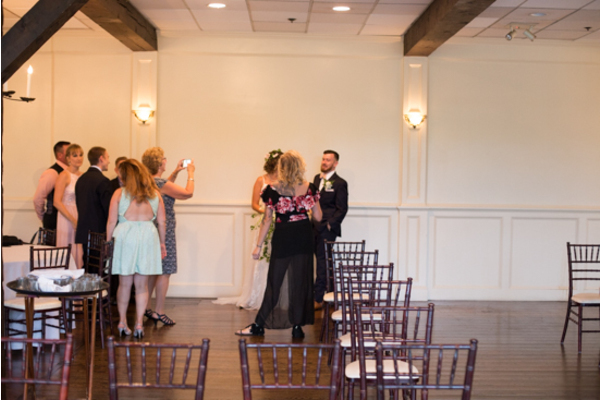 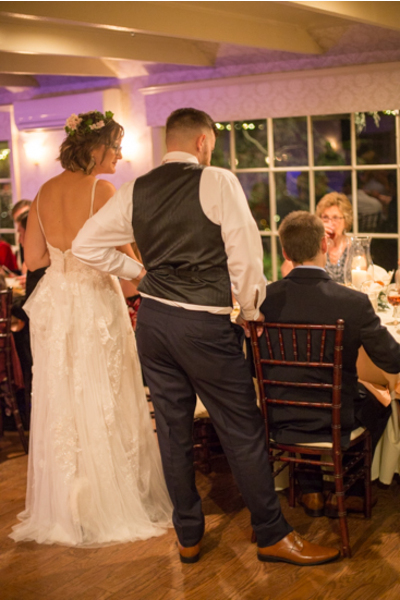 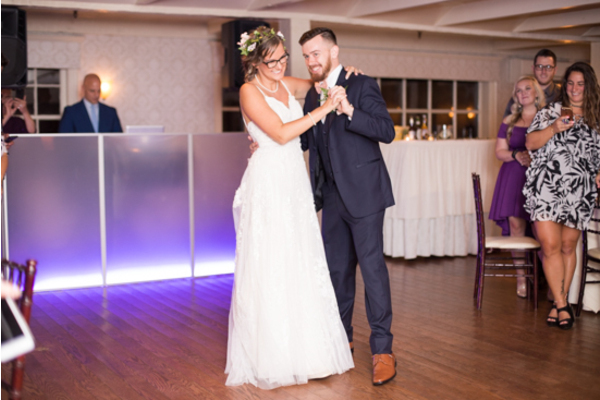 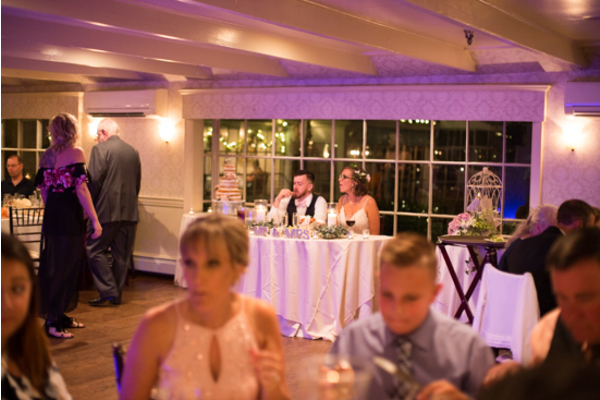 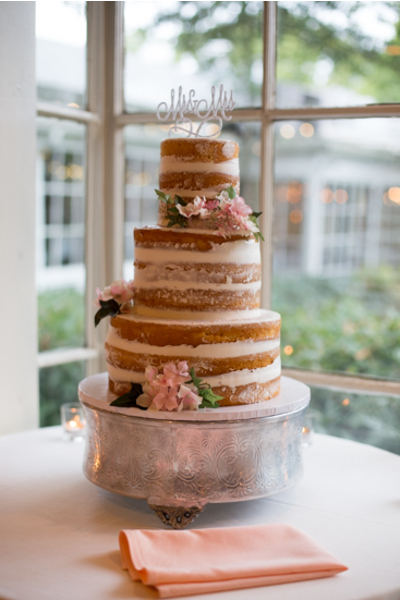 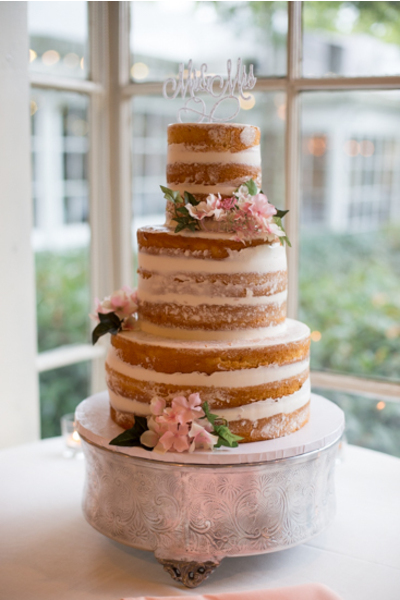 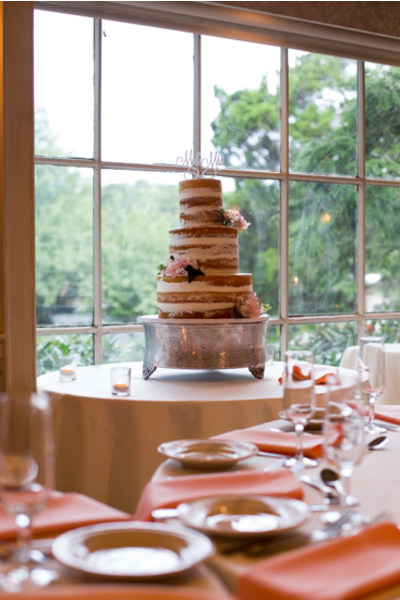 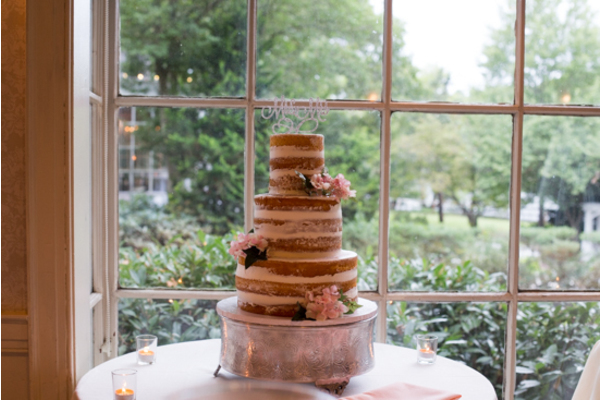 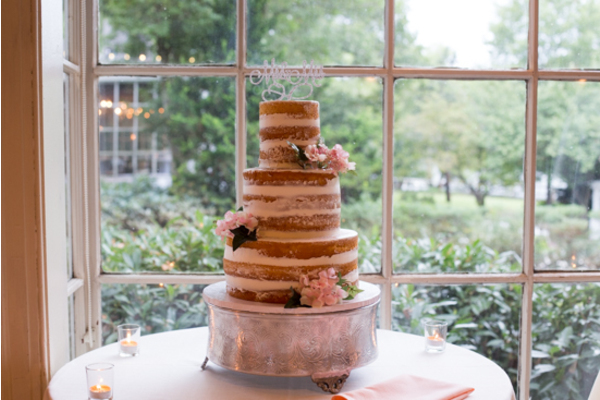 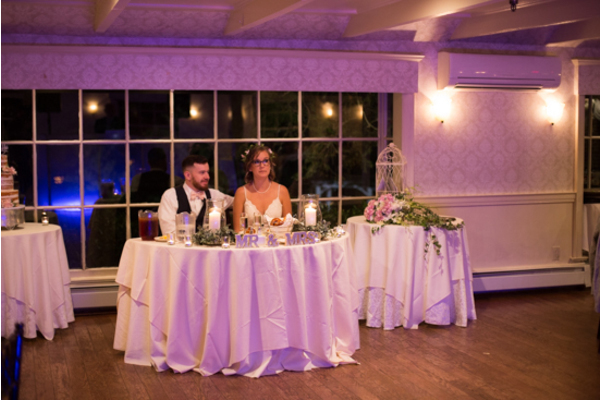 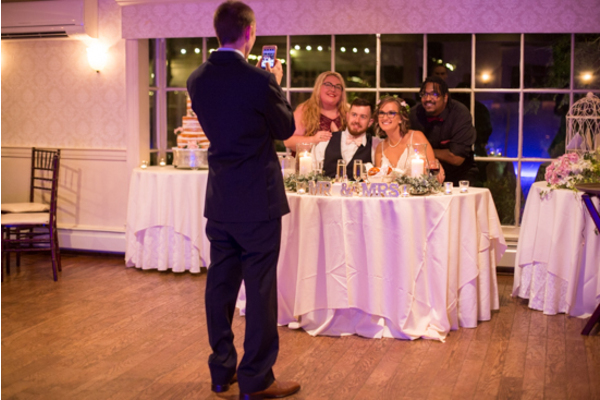 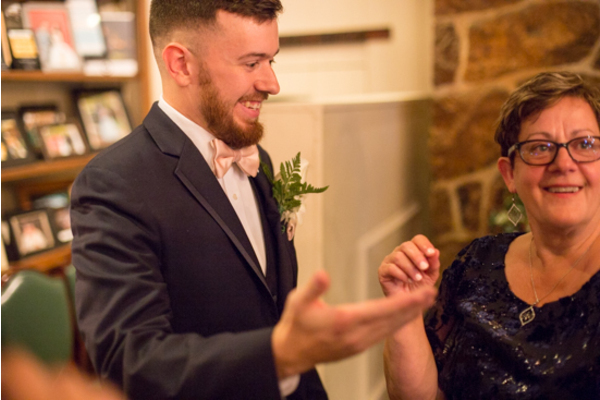 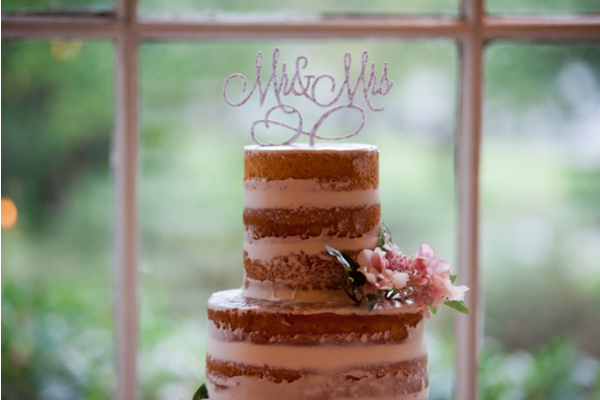 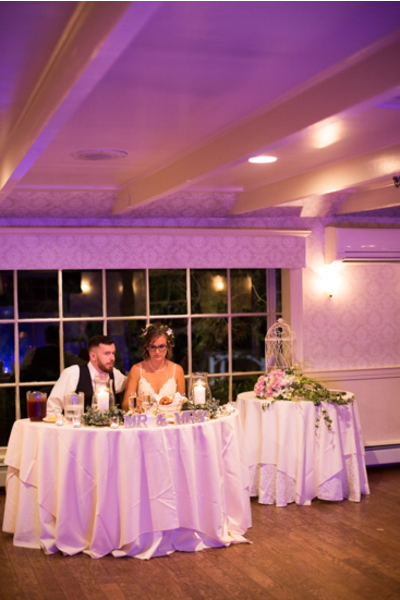 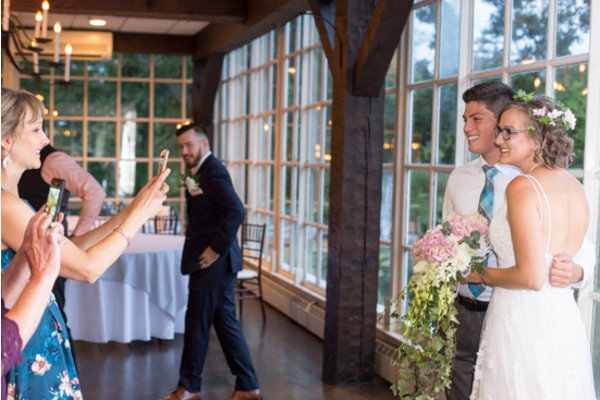 Our NJ Wedding Photographer captured every first dance and, of course, the traditional cake cutting! 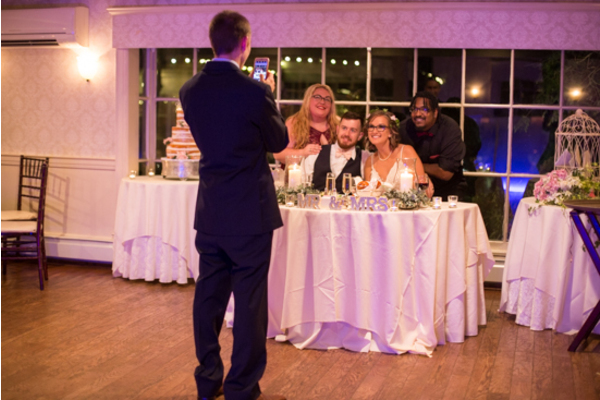 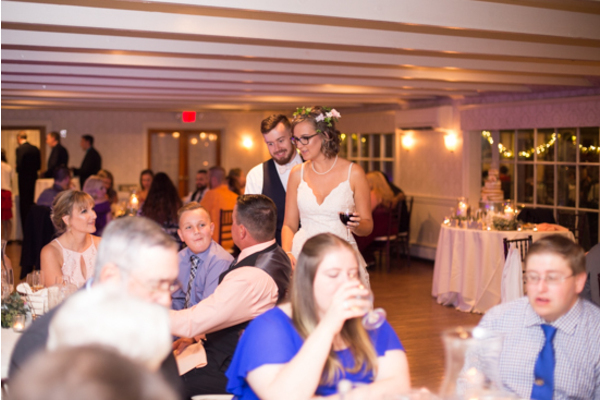 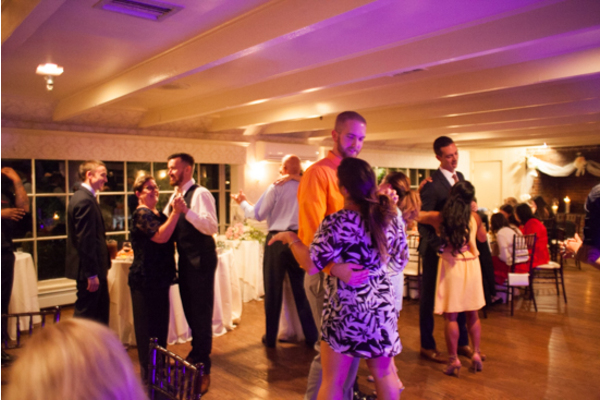 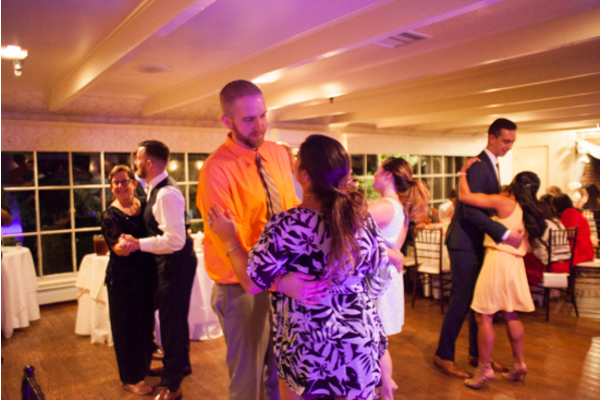 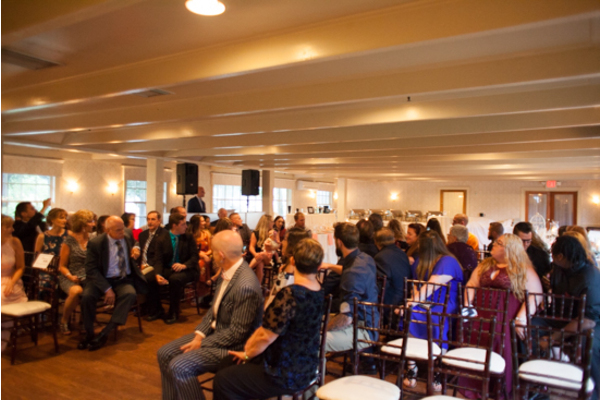 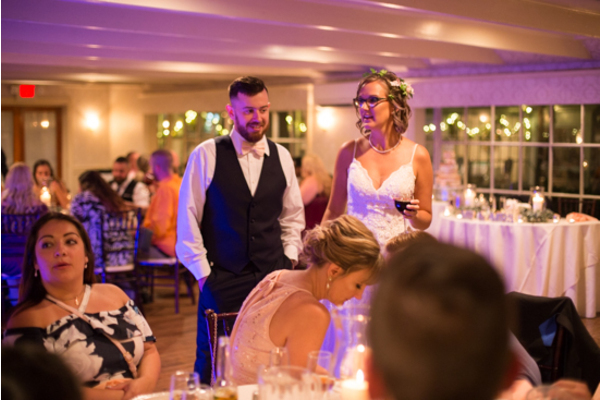 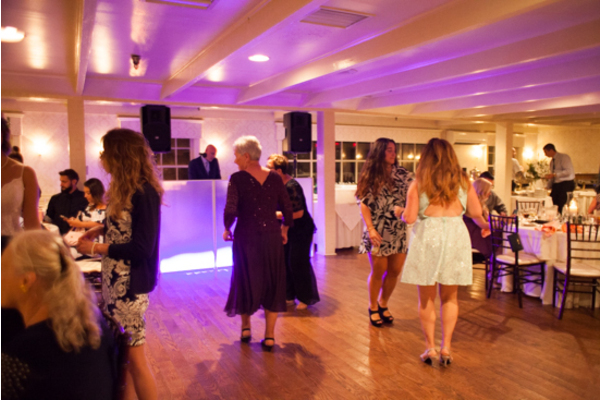 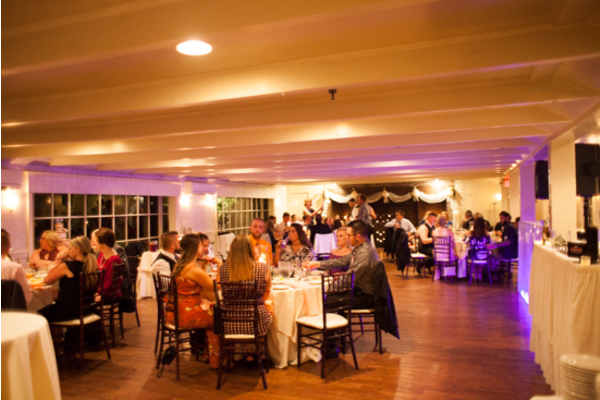 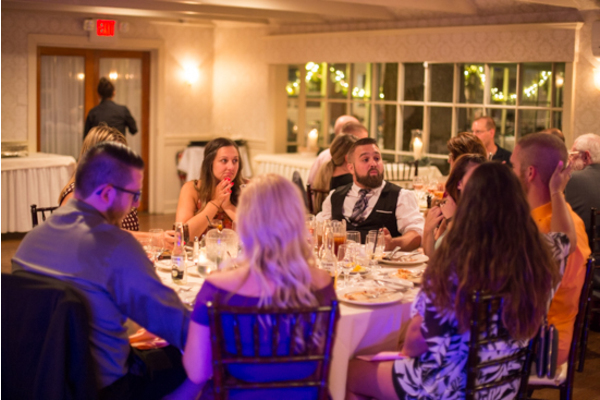 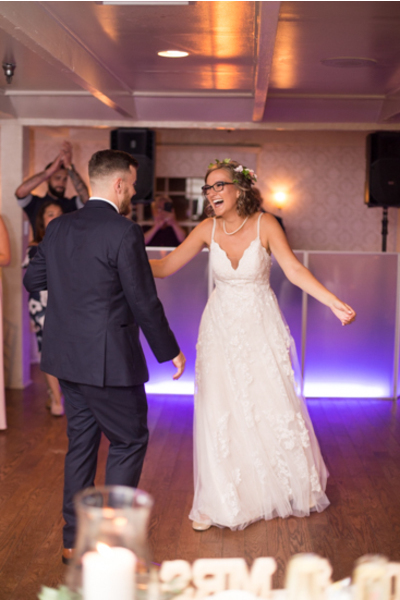 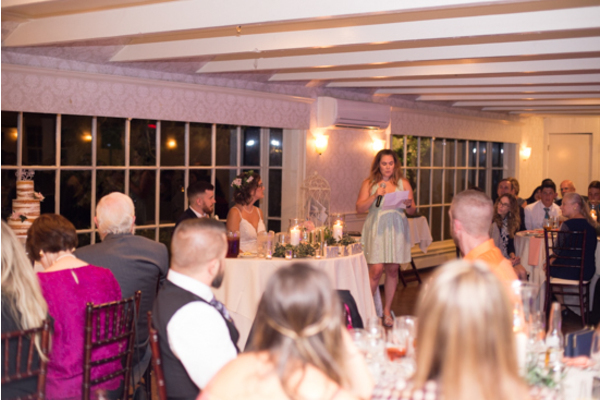 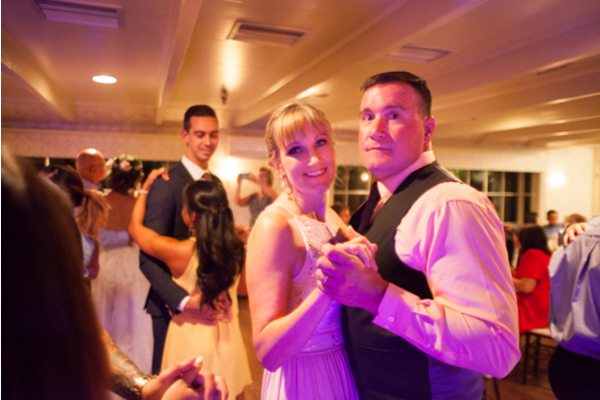 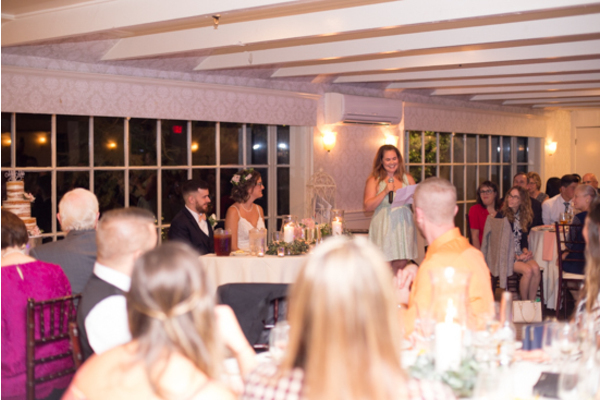 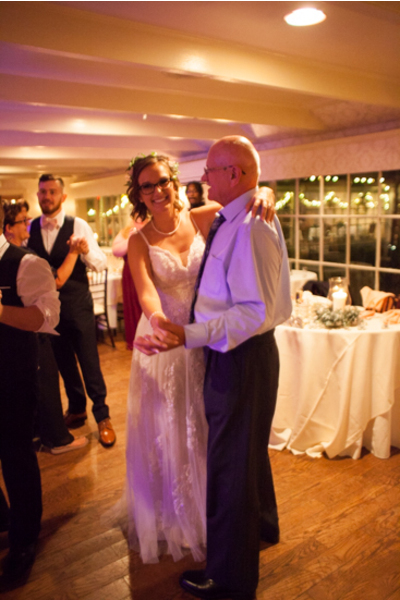 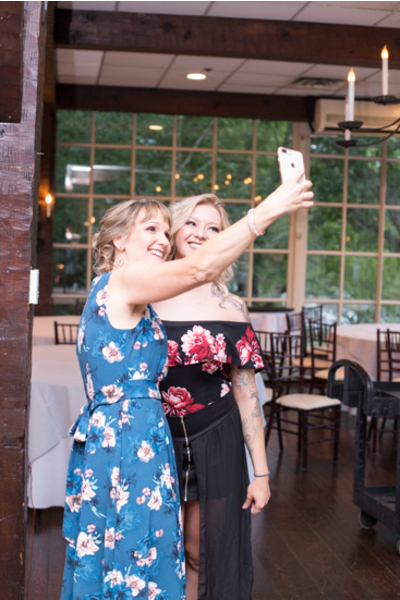 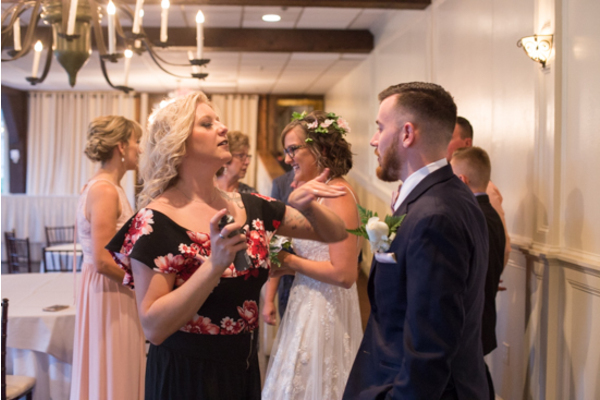 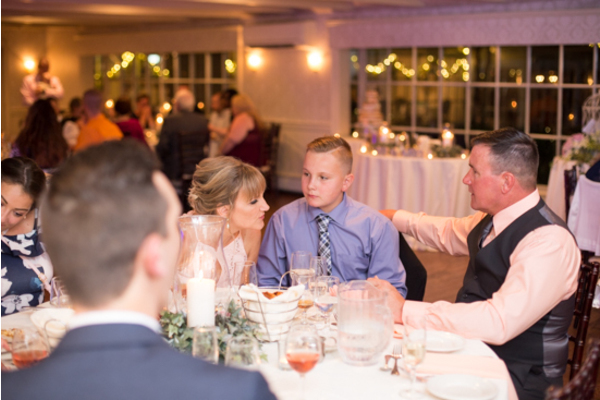 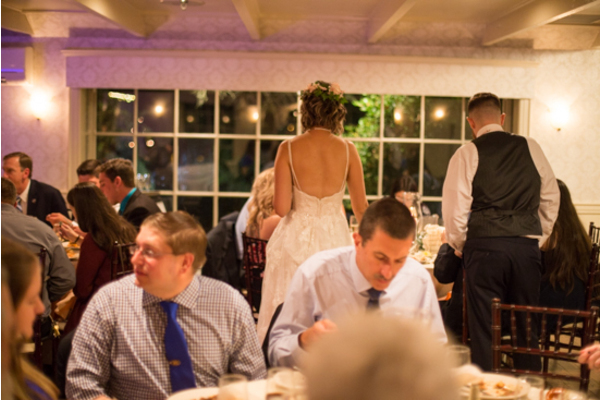 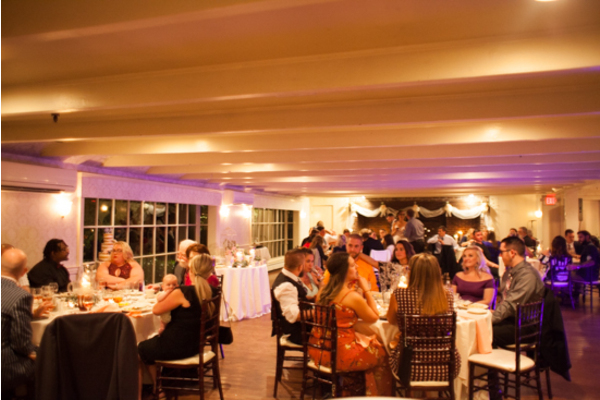 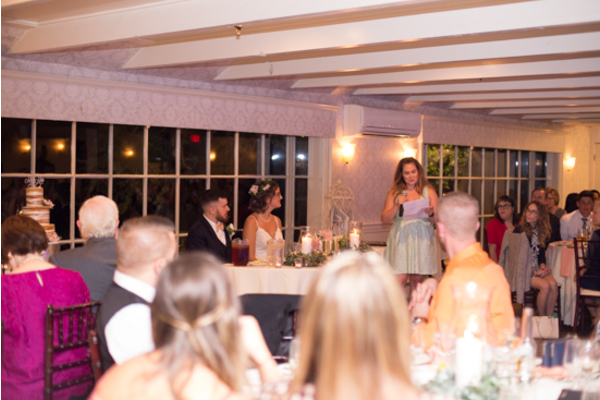 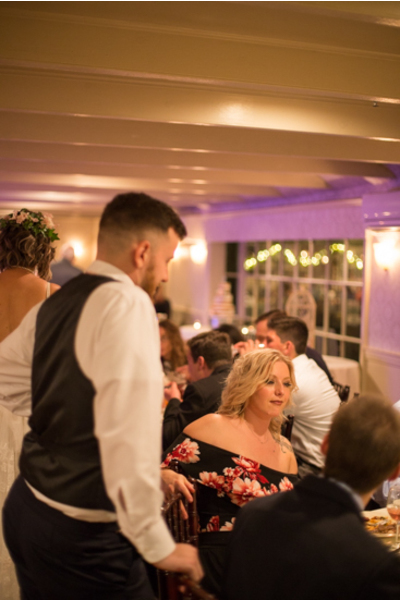 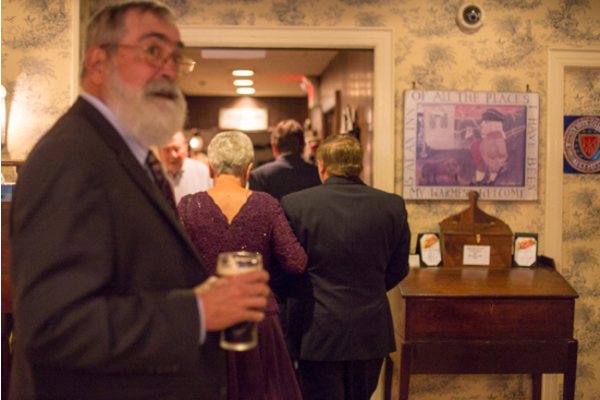 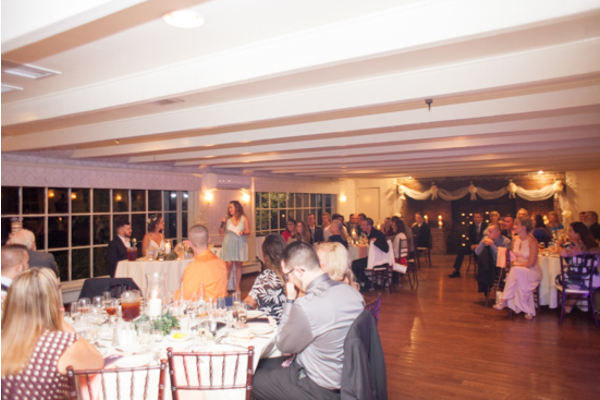 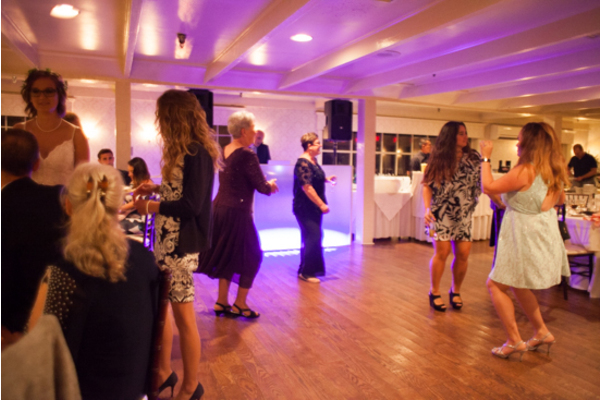 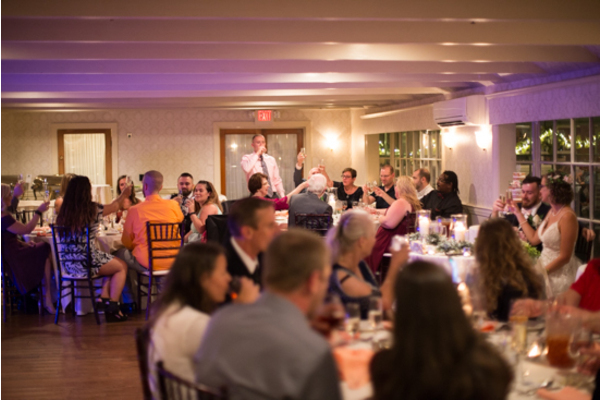 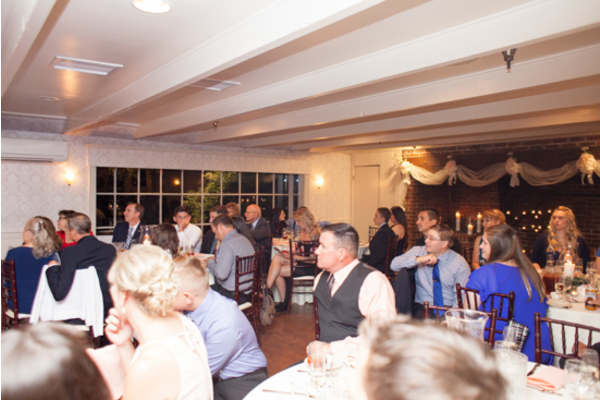 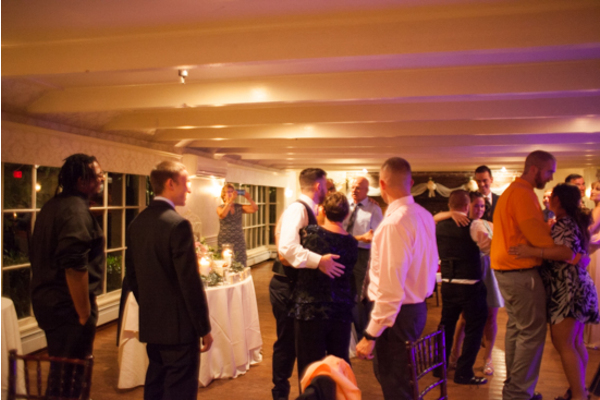 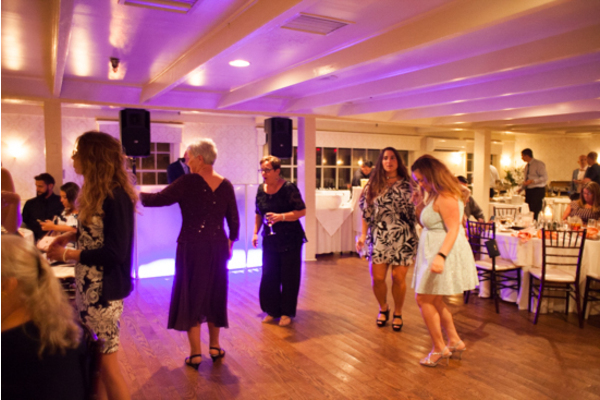 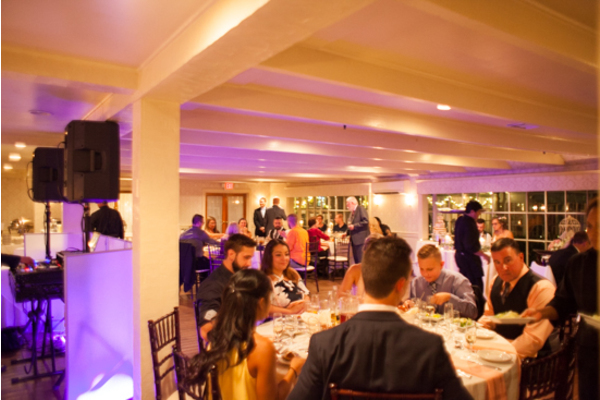 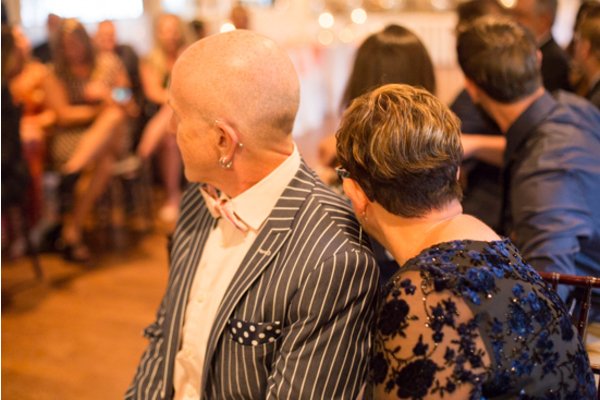 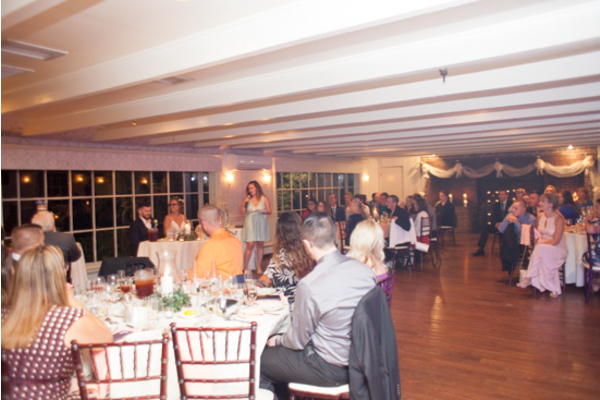 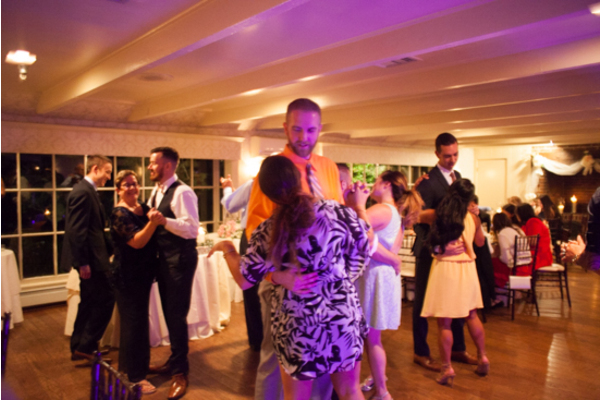 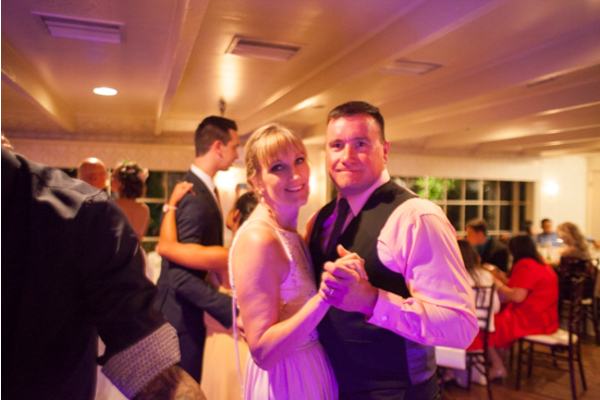 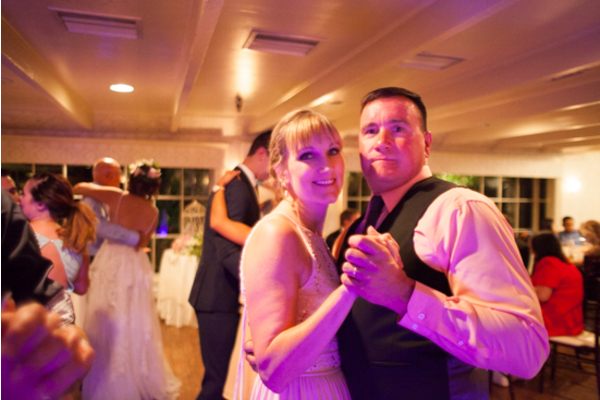 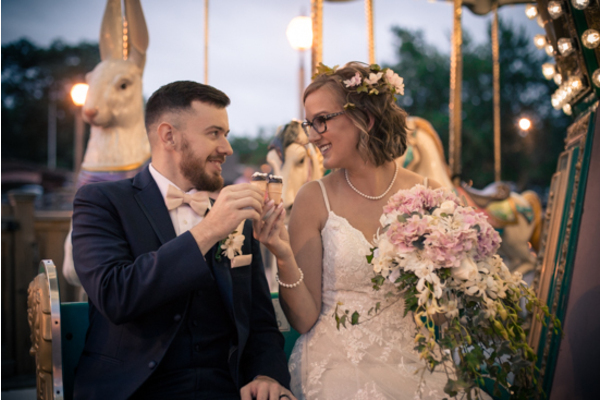 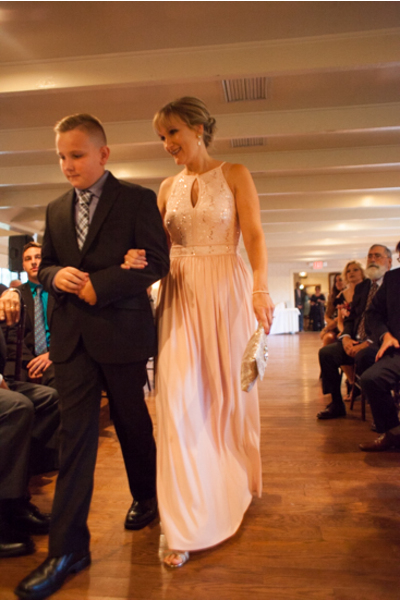 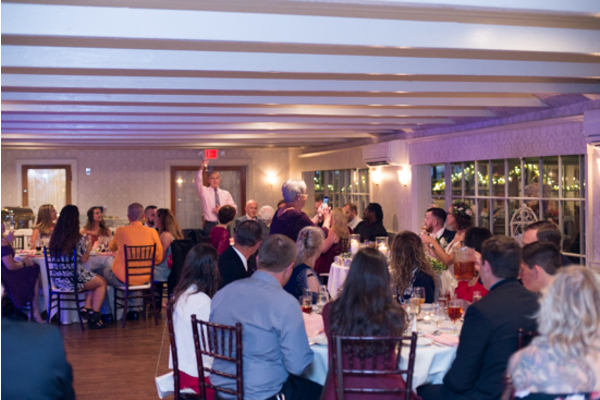 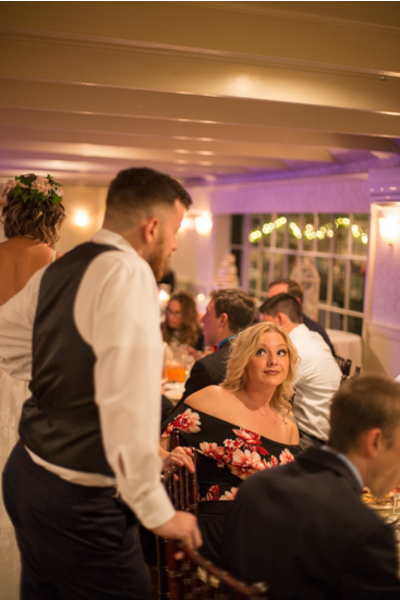 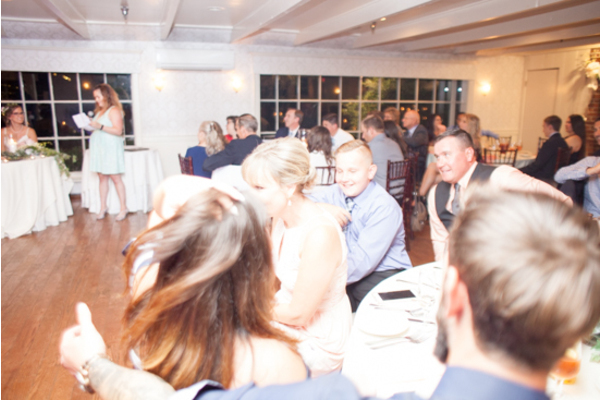 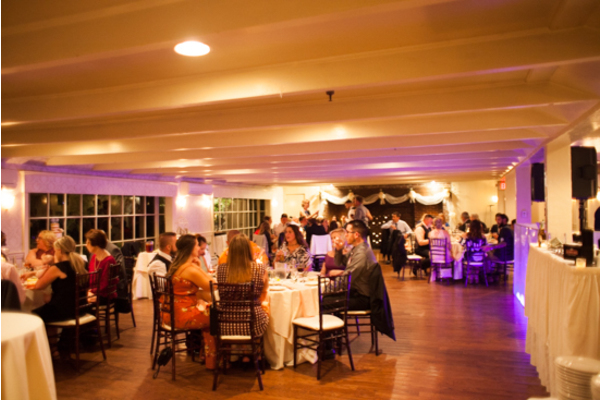 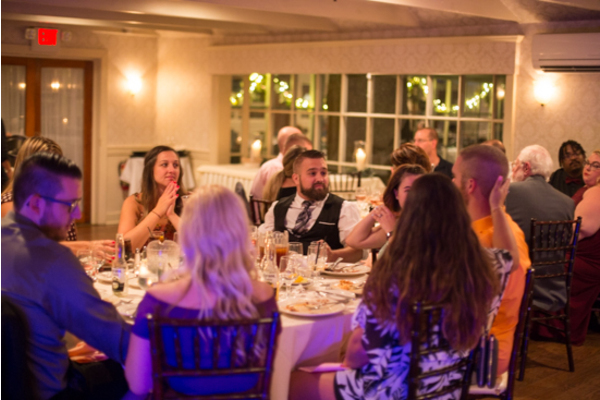 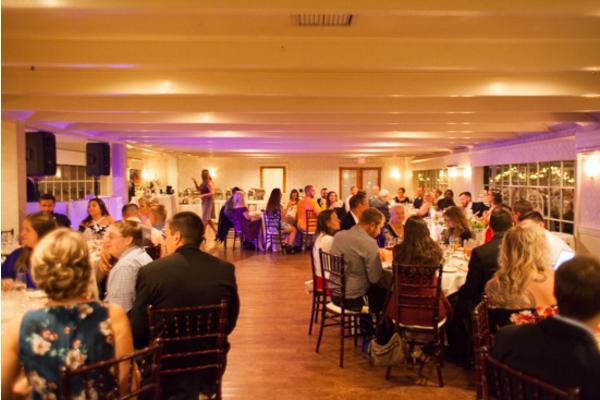 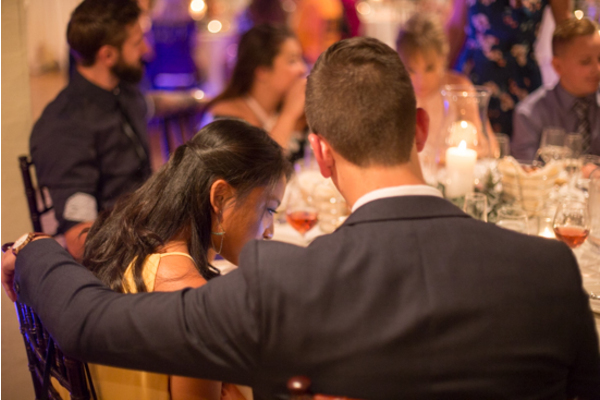 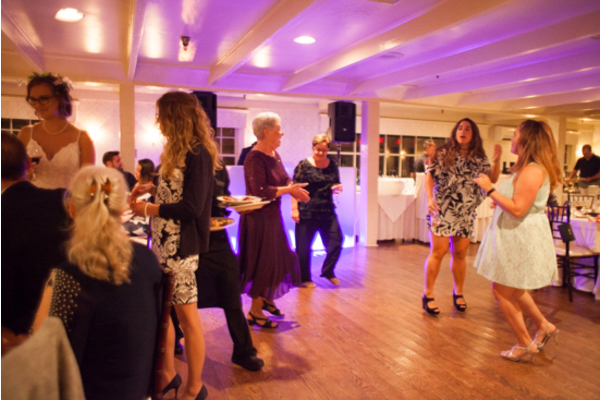 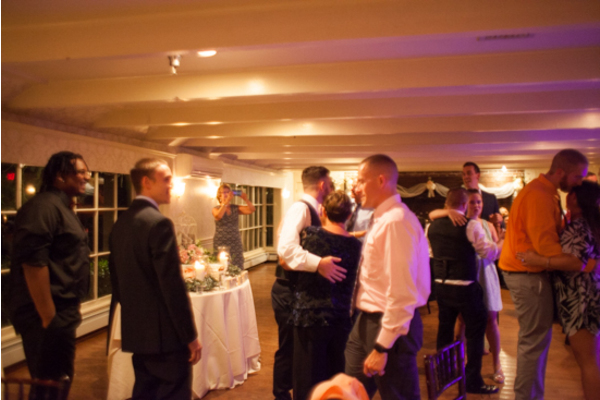 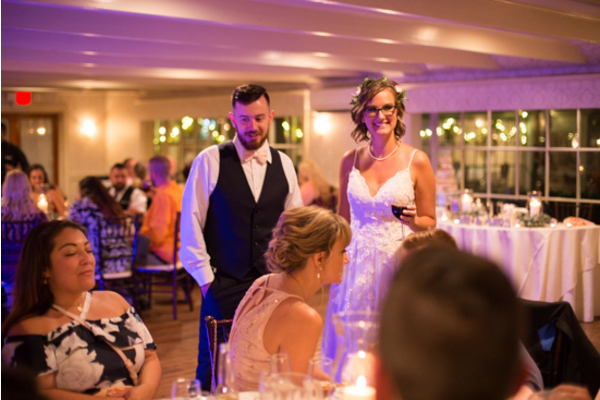 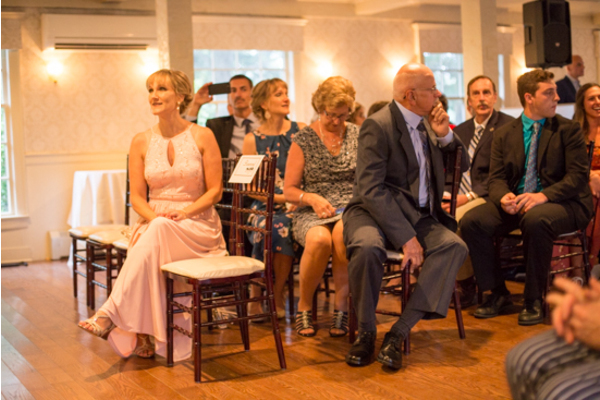 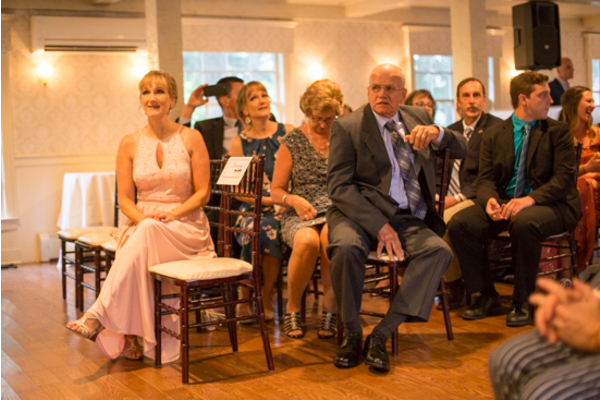 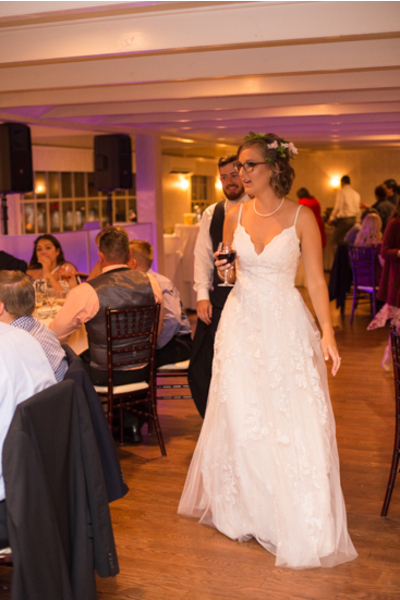 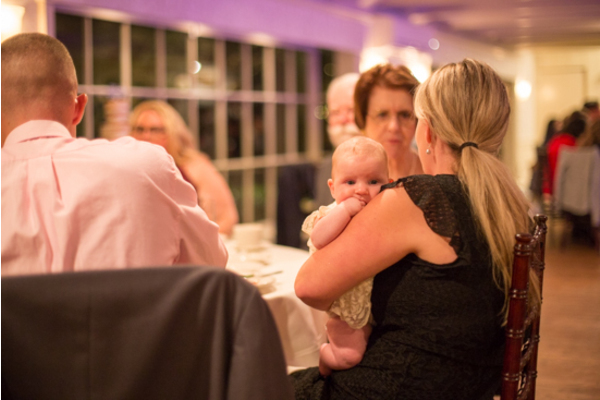 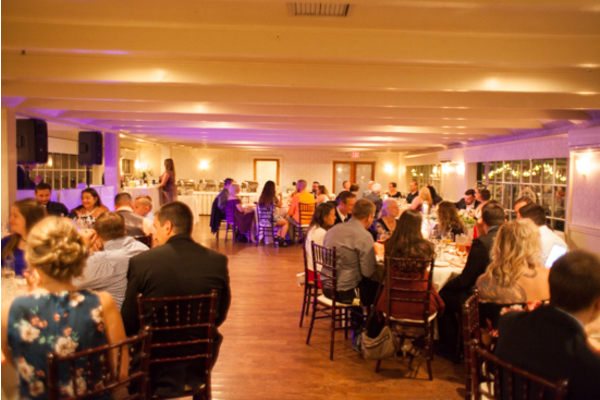 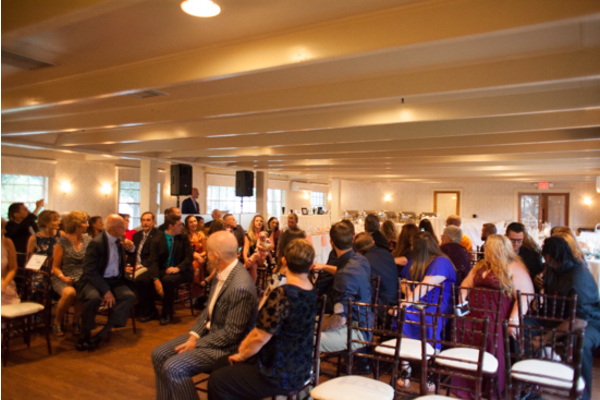 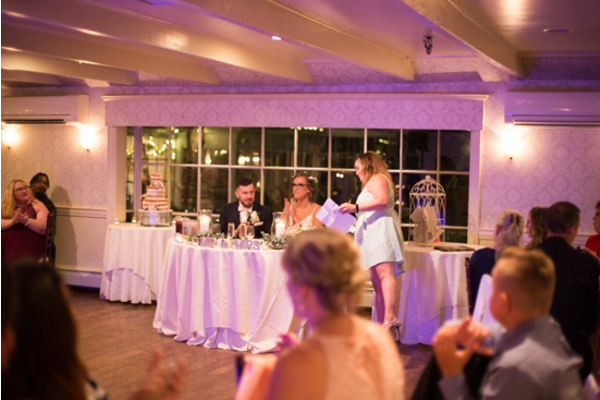 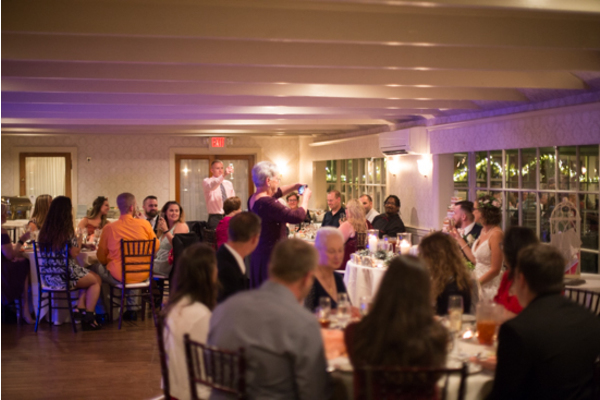 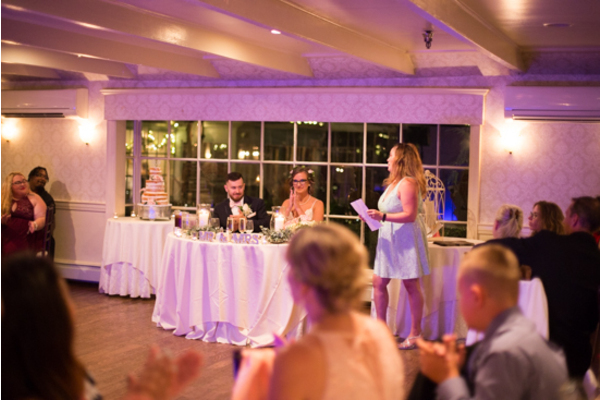 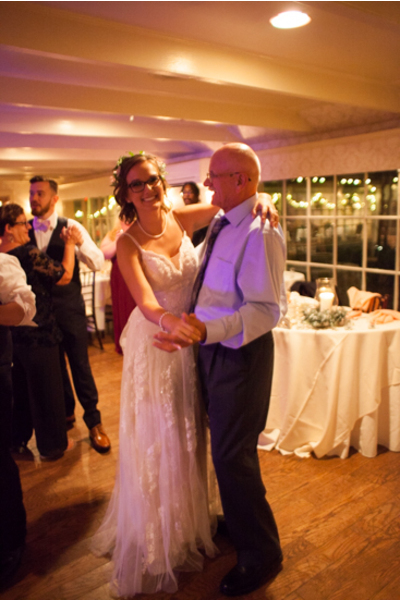 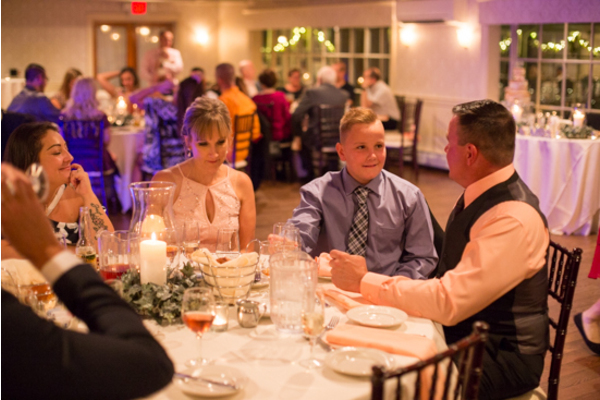 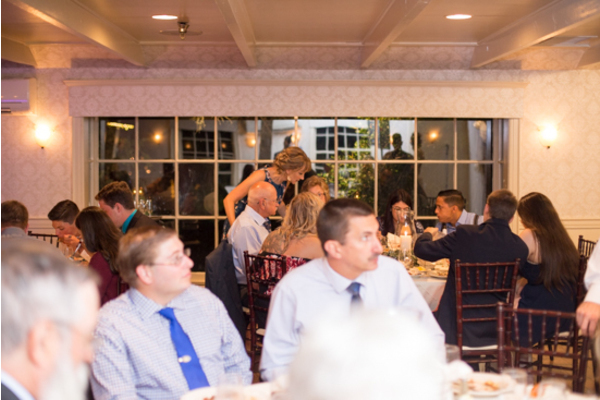 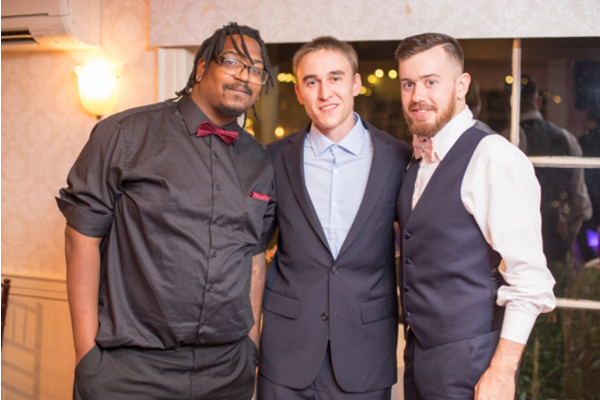 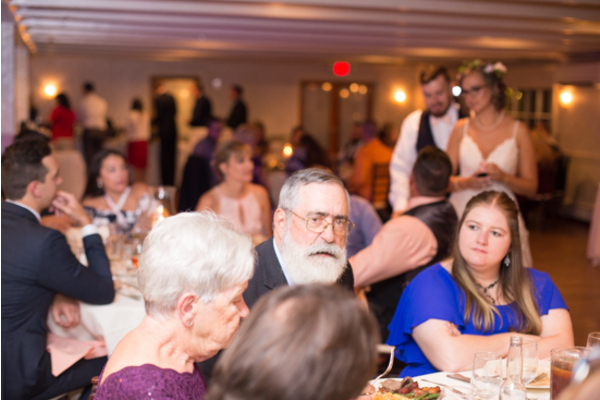 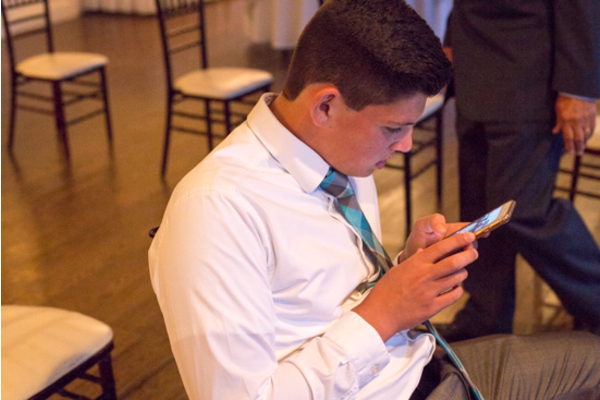 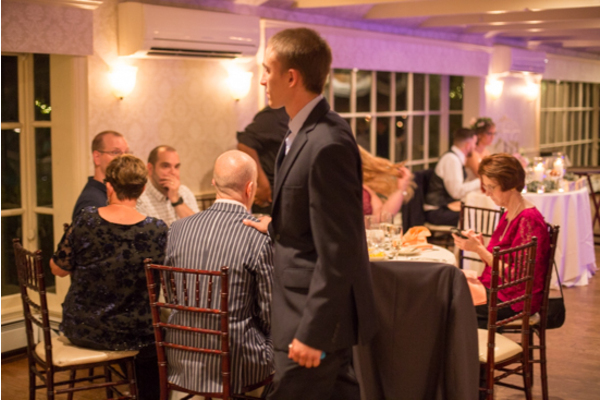 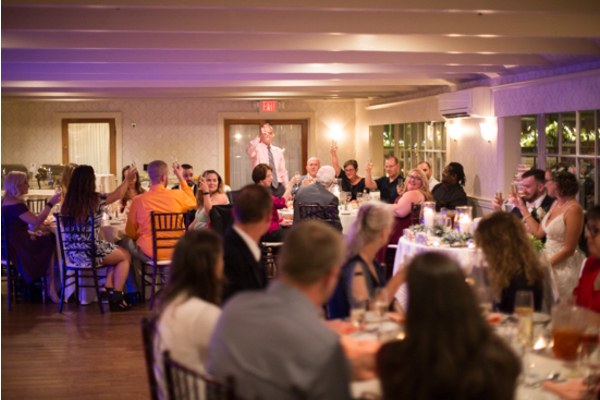 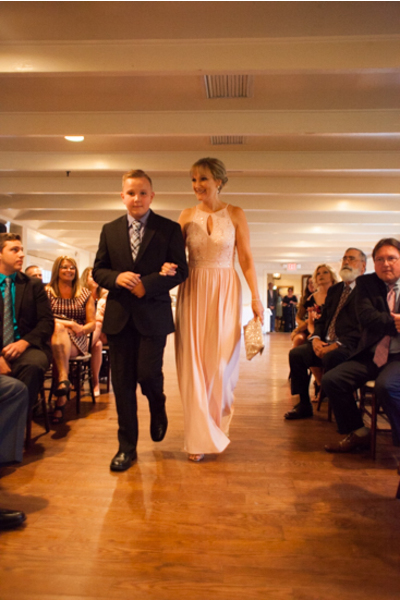 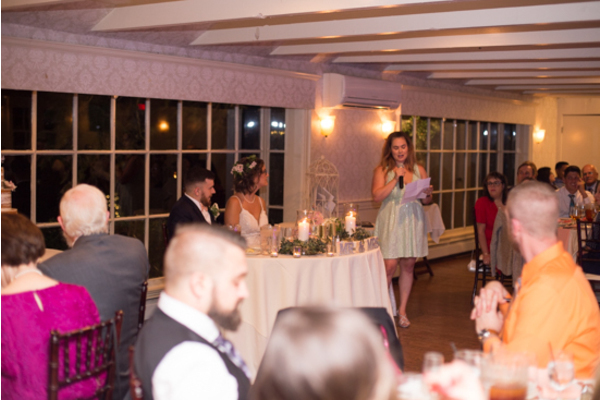 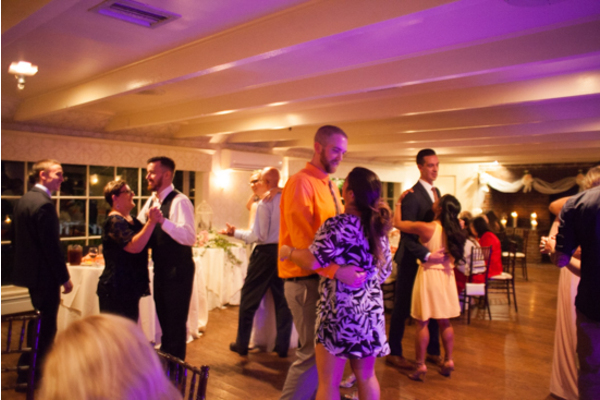 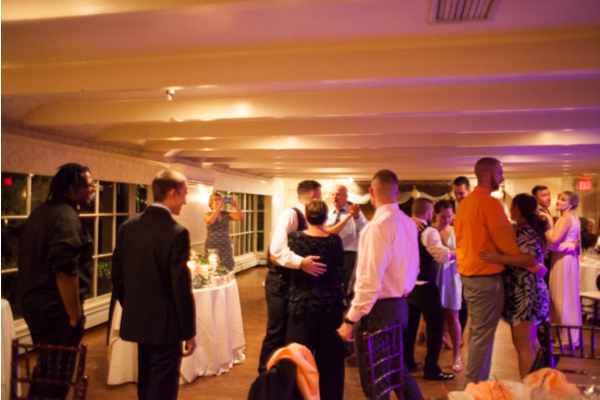 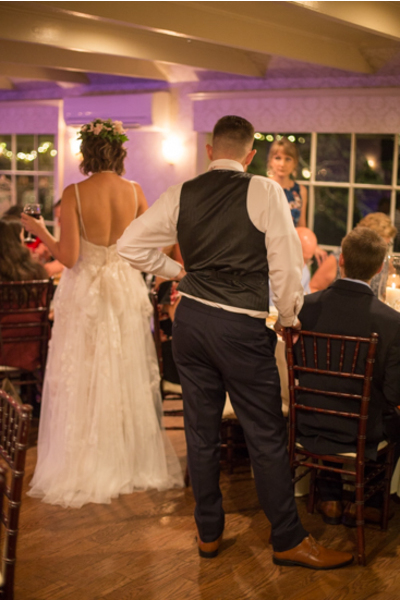 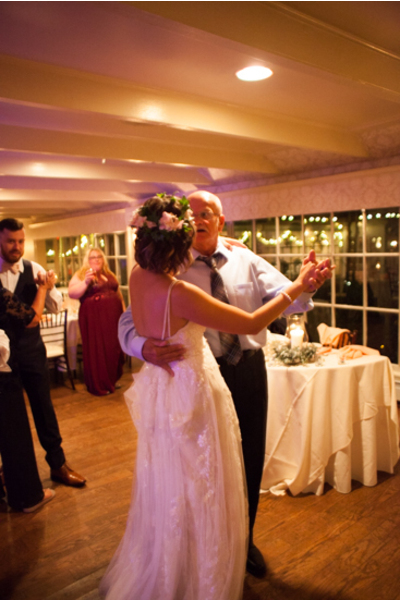 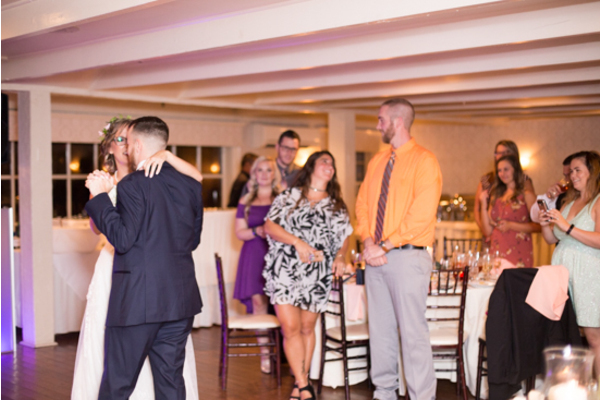 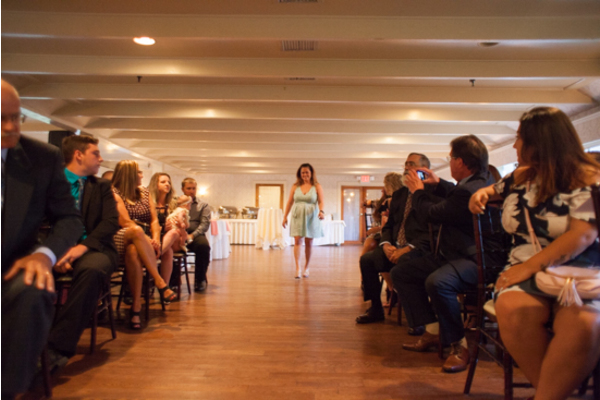 Guests had the time of their lives celebrating Danielle and Josh and it will be a night to never forget! 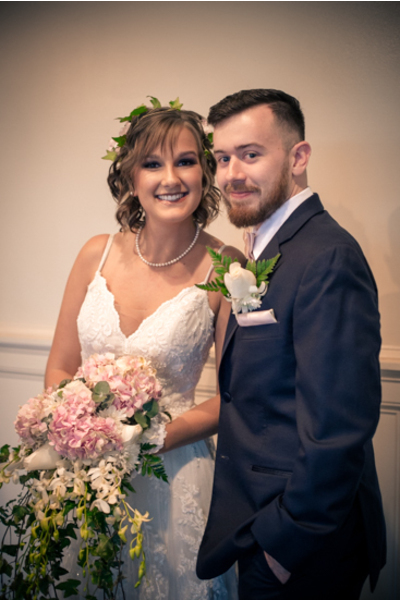 Congratulations, again, to Danielle and Josh. 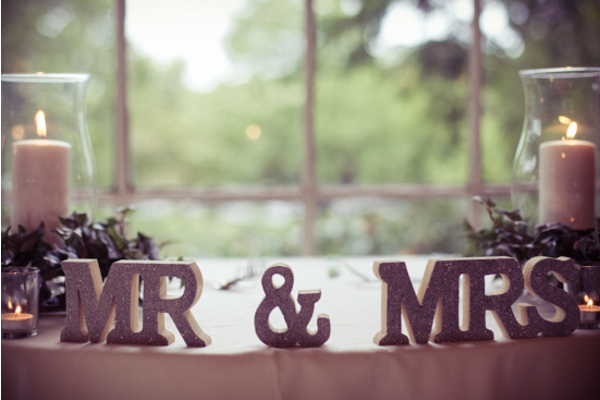 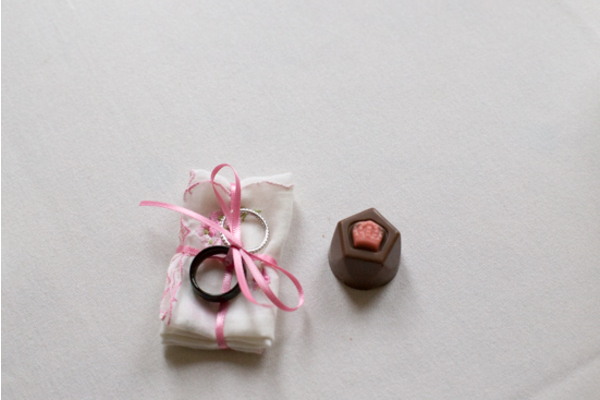 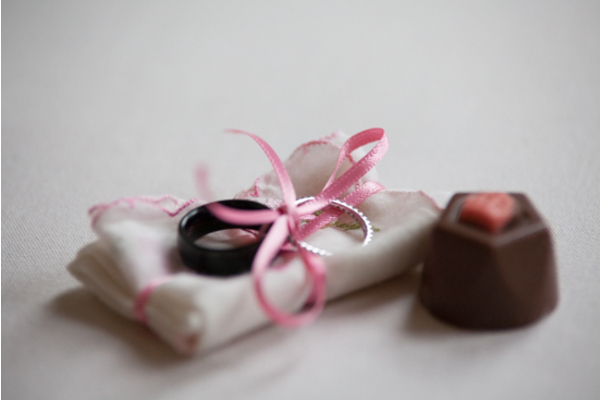 We wish you the best as you live happily ever after!